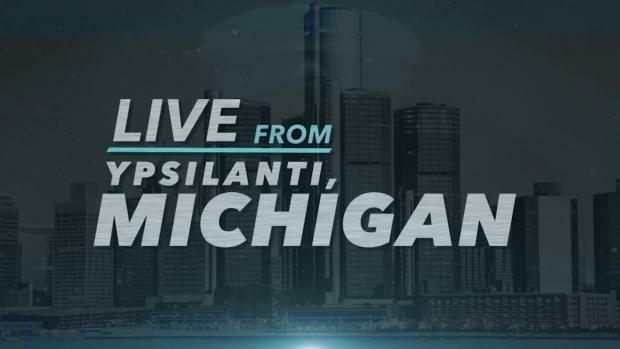 As we count down the days before the AAU Junior Olympics in Ypsilanti, Michigan, take a look at these five big-name athletes who have performed in Michigan over its history. 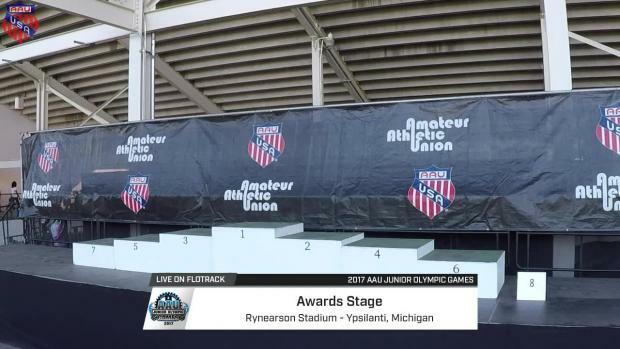 Entries for the AAU Junior Olympic Games. 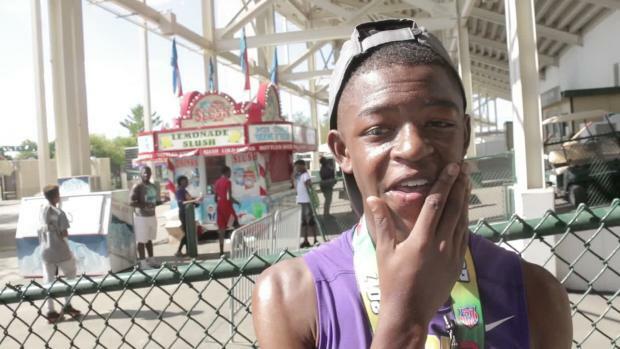 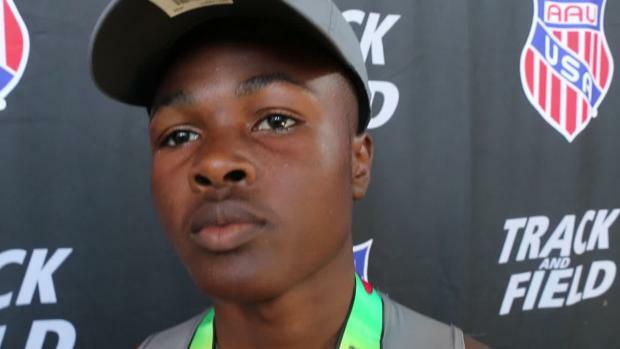 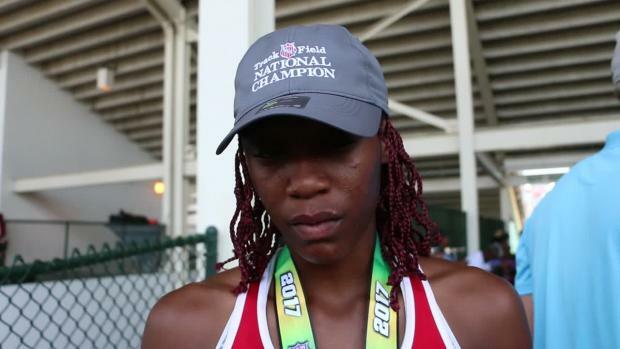 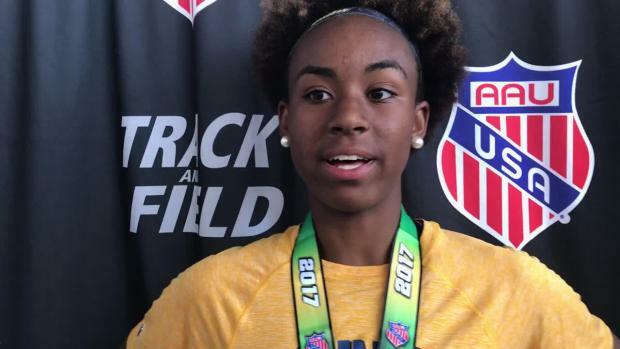 A year ago, Clermont native Tamari Davis, 14, made some waves at the AAU Junior Olympics, winning one of two national titles in the 100m and 200m. 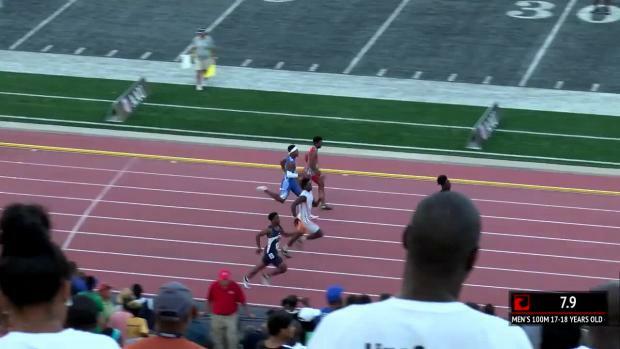 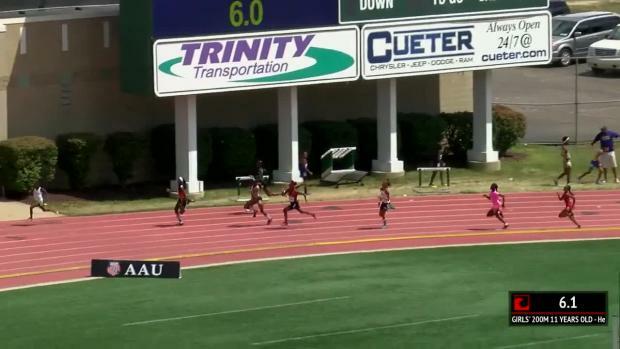 In the 100m (above), Davis punched it into overdrive for a winning time of 11.97. 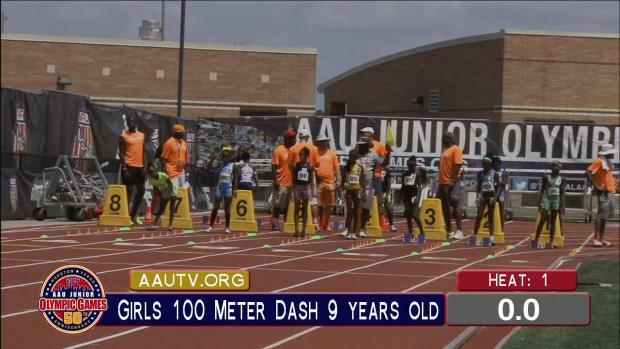 But earlier, Davis set an age group meet record with a time of 11.93 seconds. 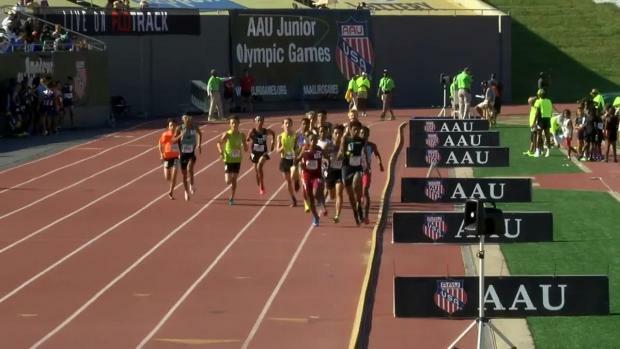 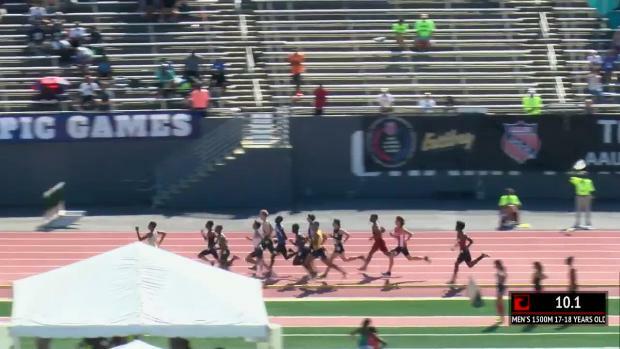 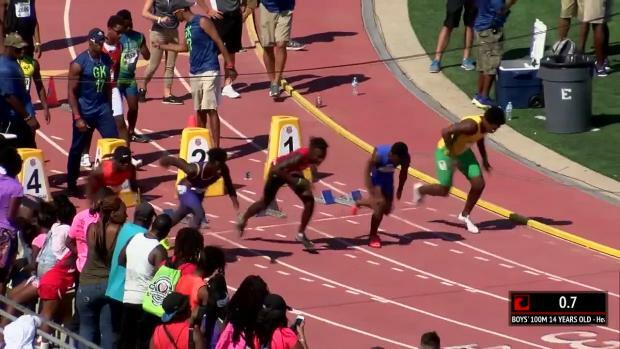 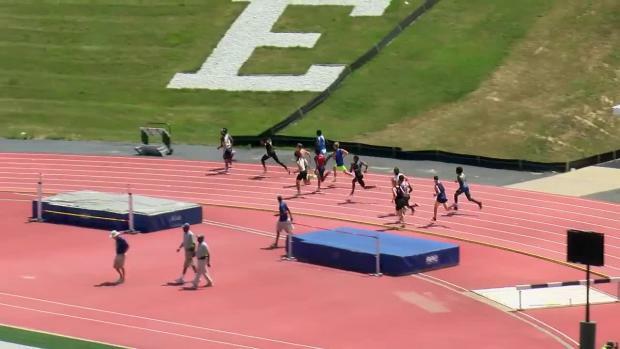 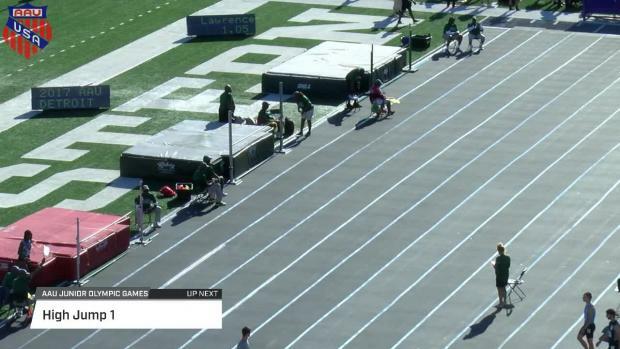 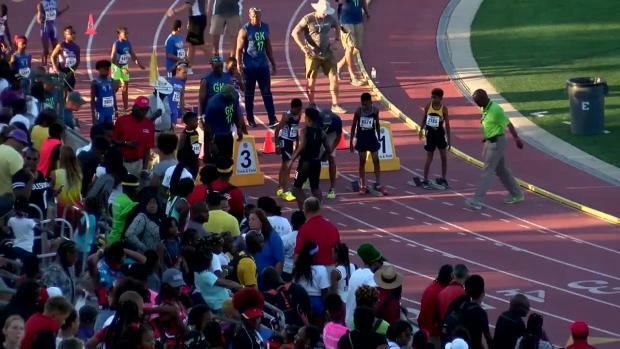 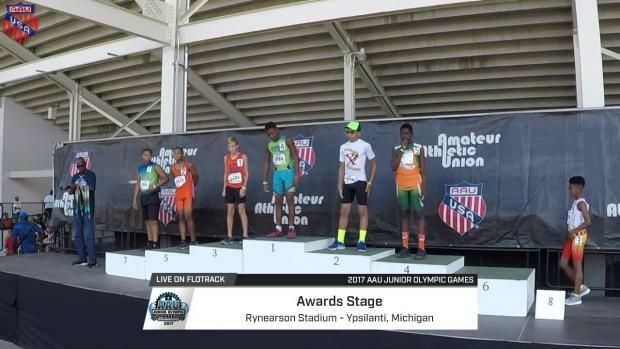 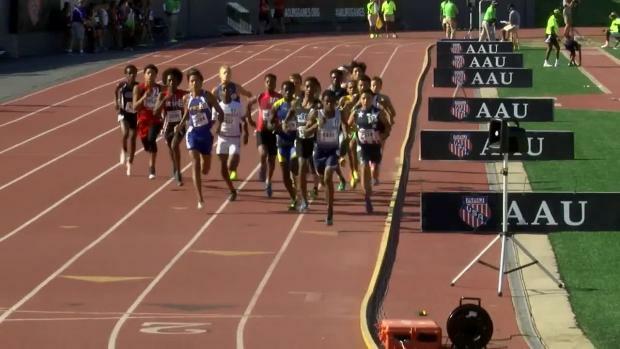 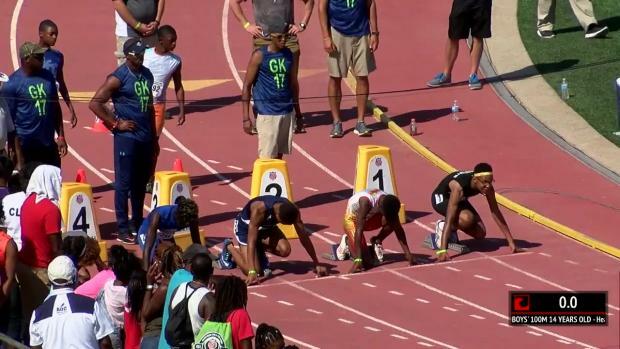 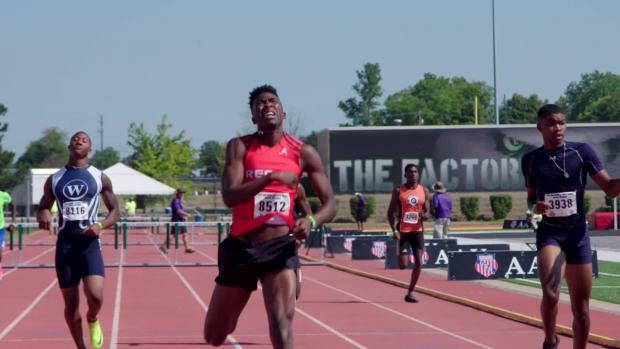 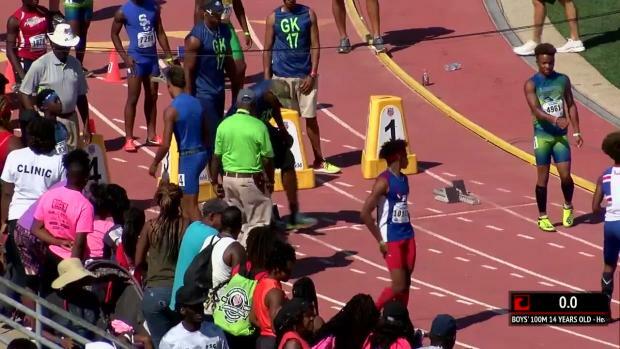 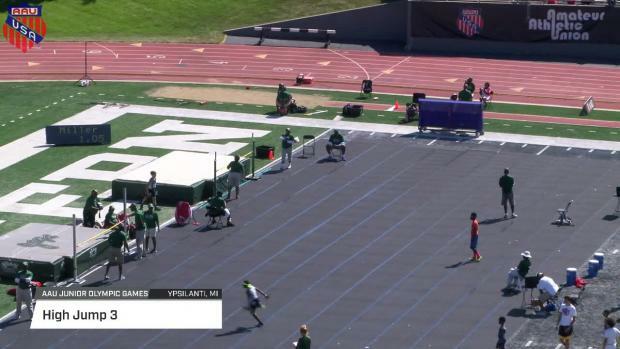 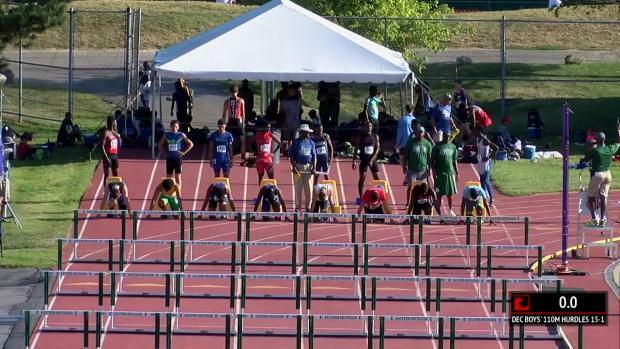 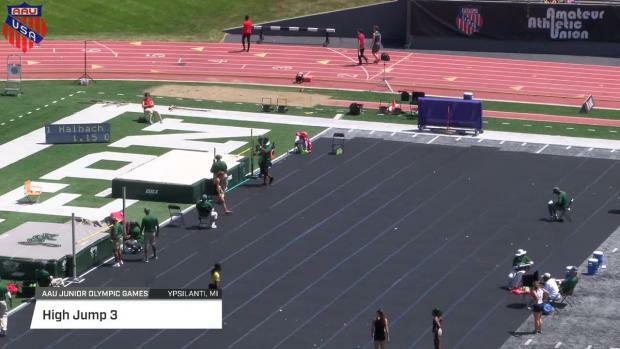 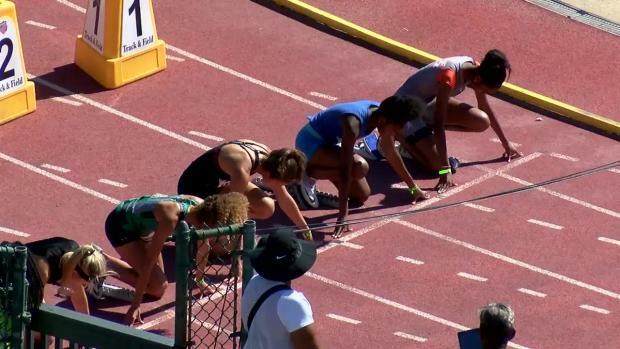 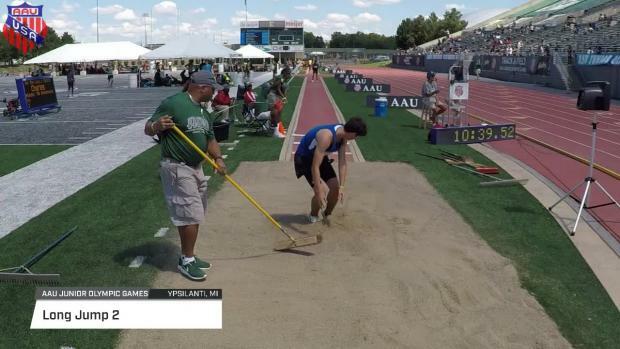 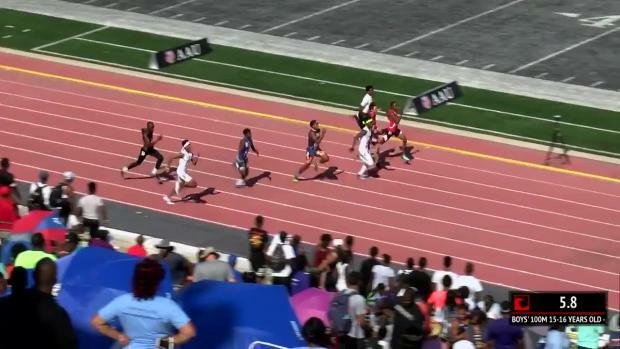 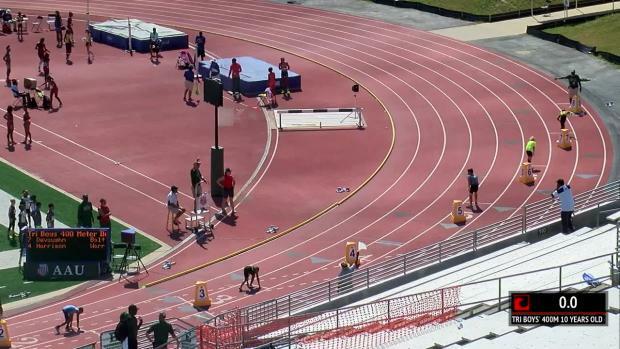 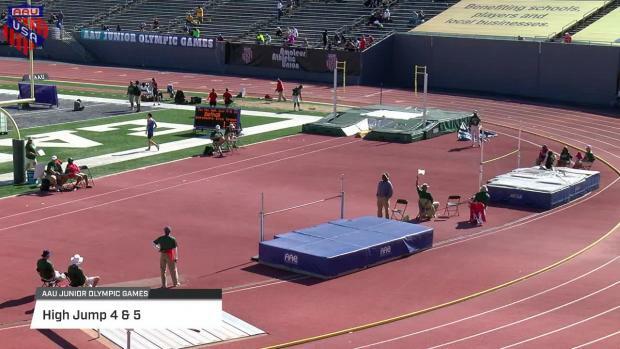 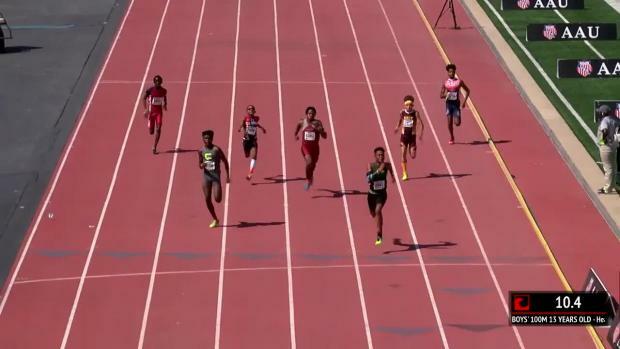 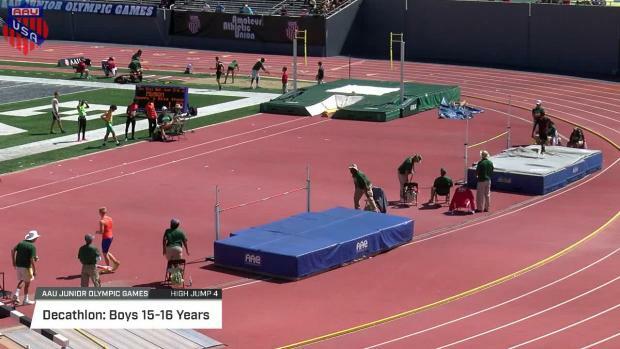 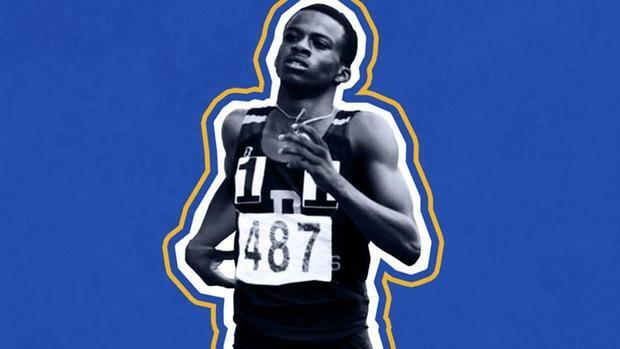 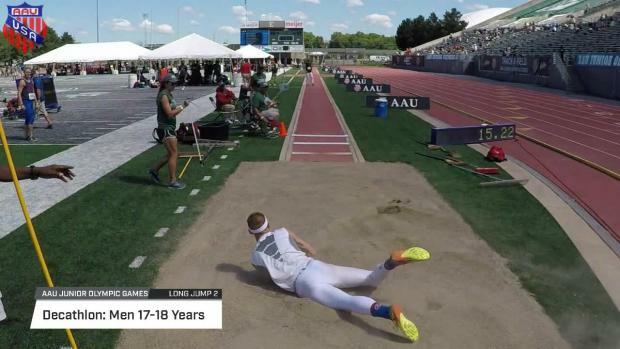 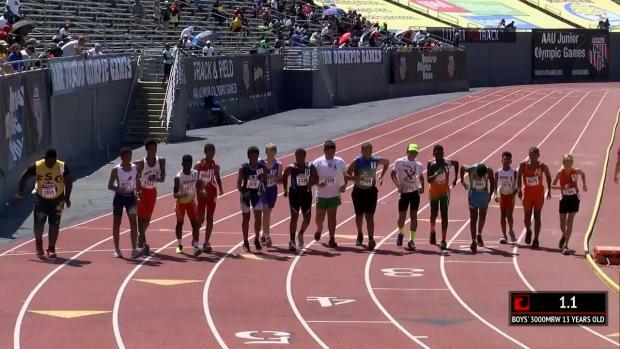 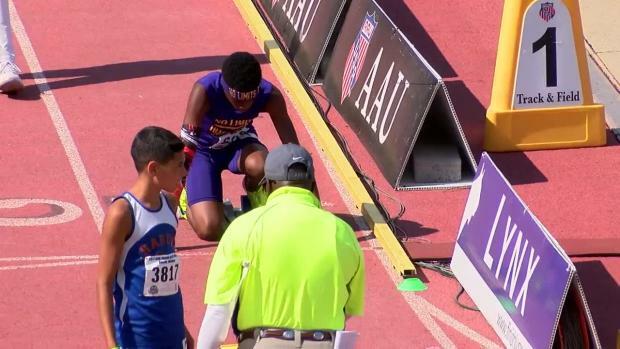 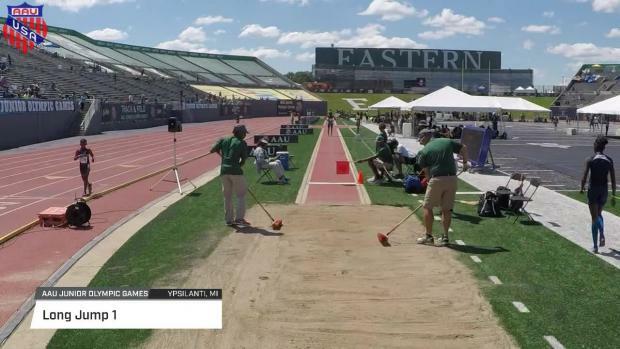 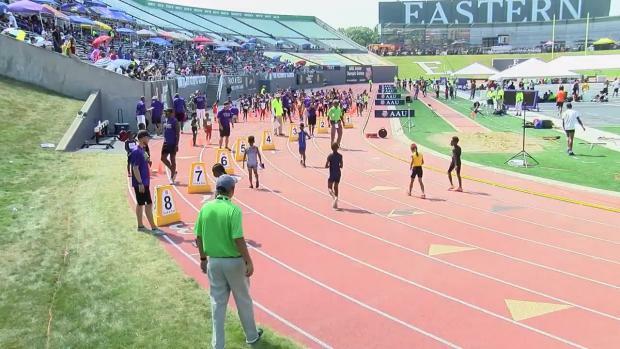 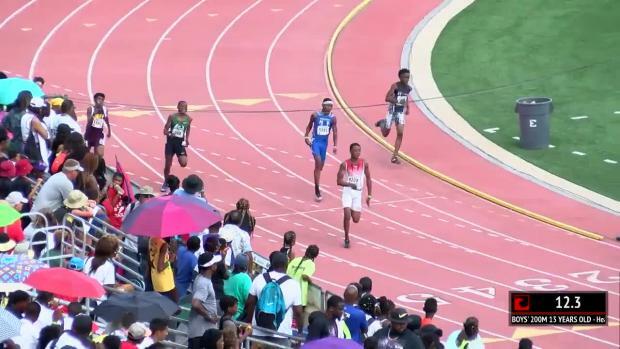 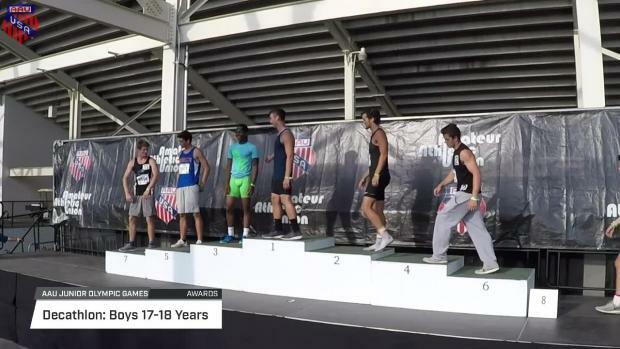 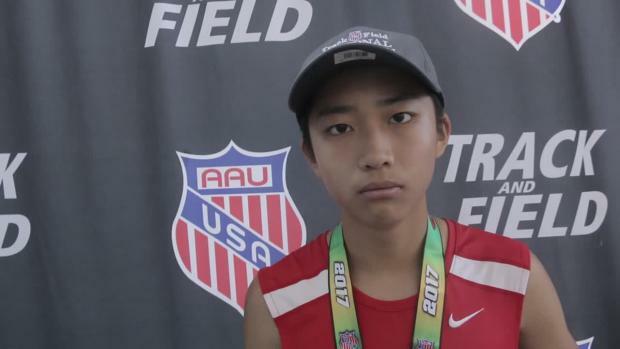 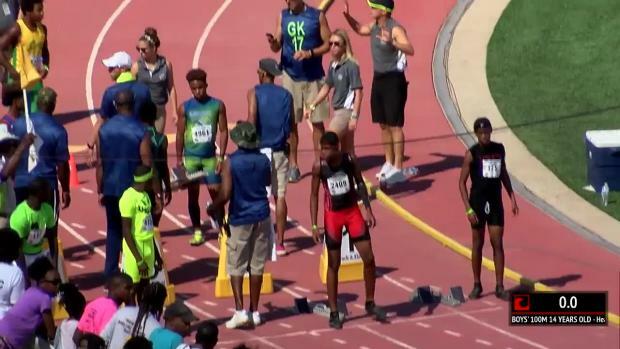 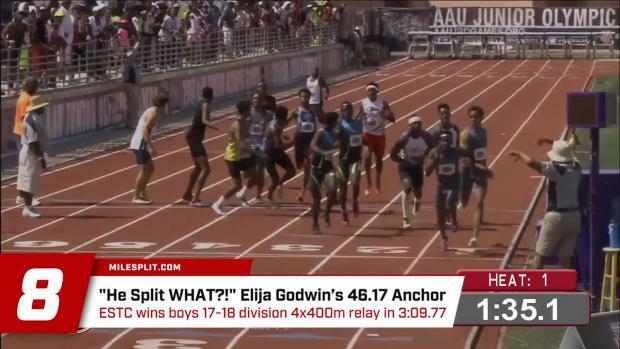 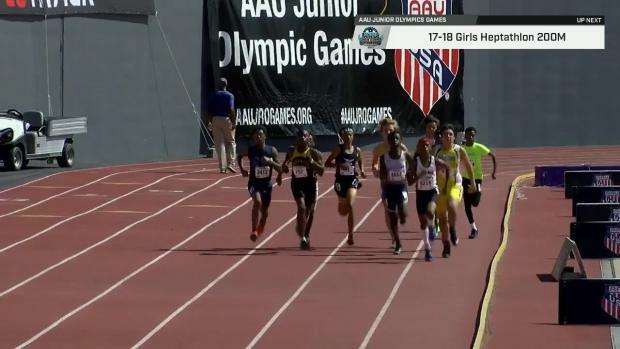 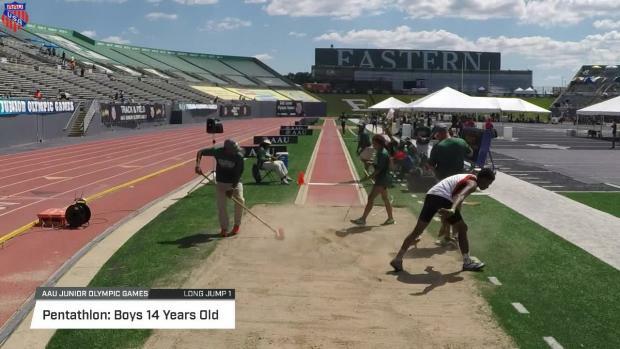 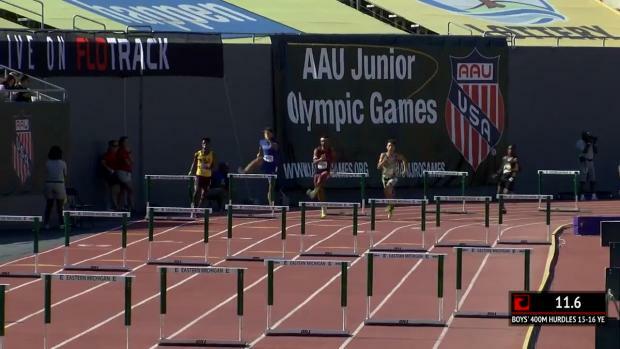 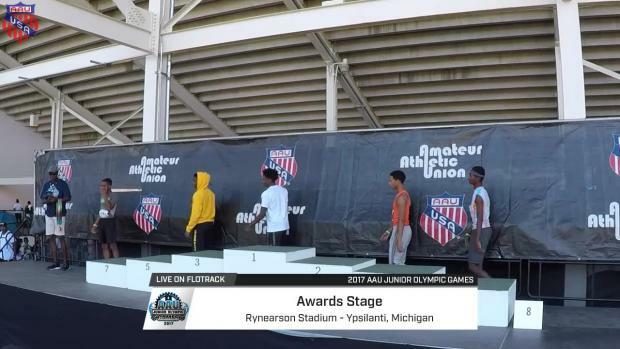 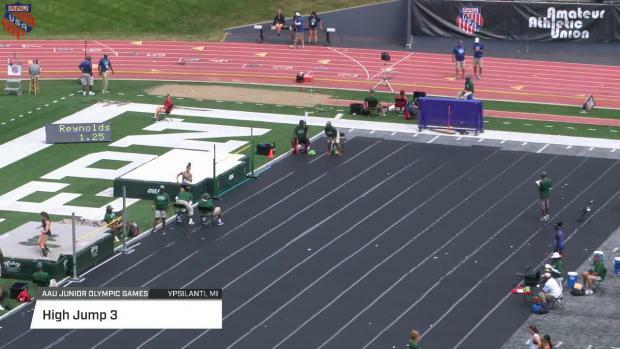 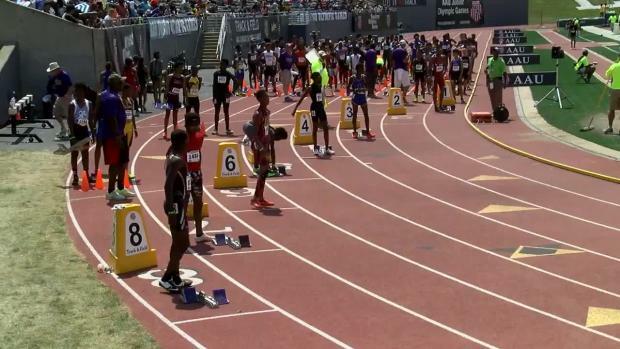 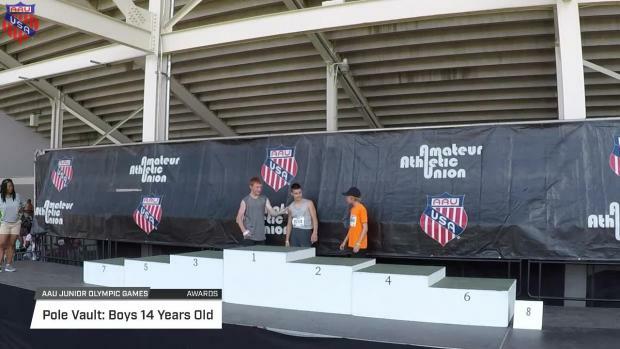 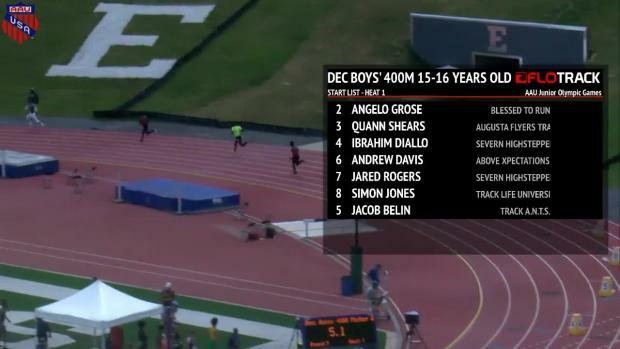 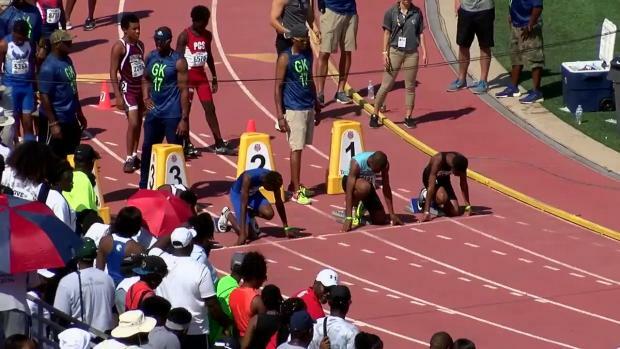 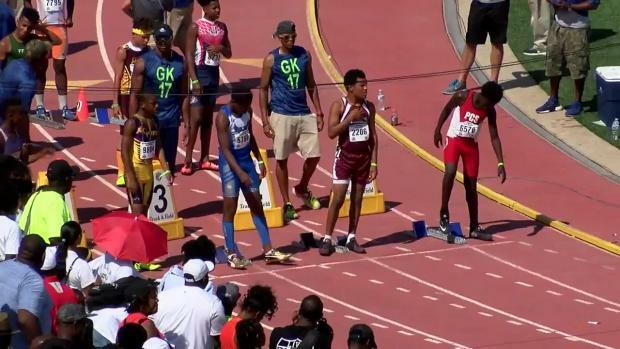 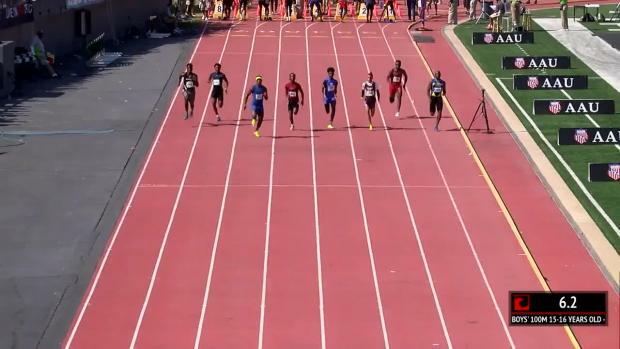 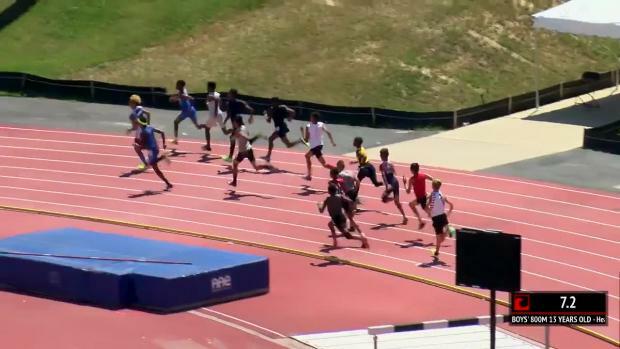 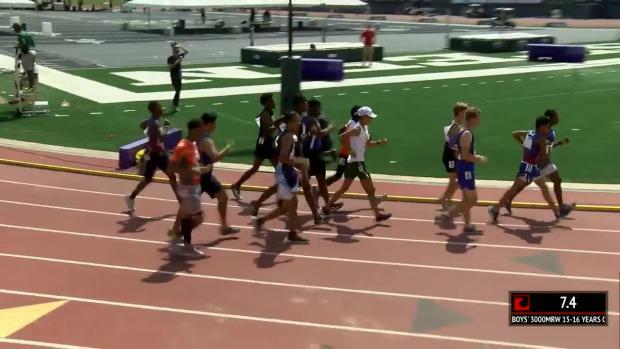 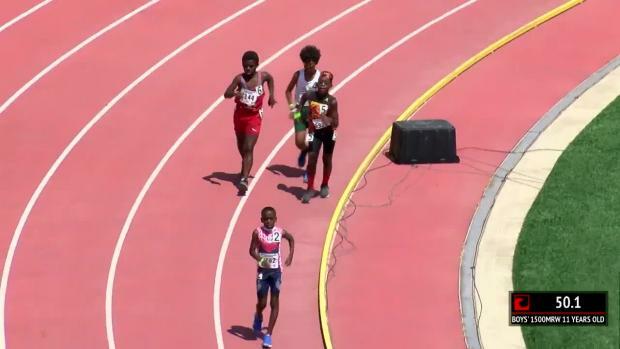 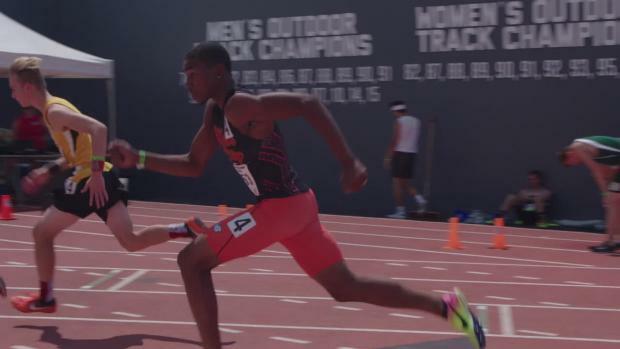 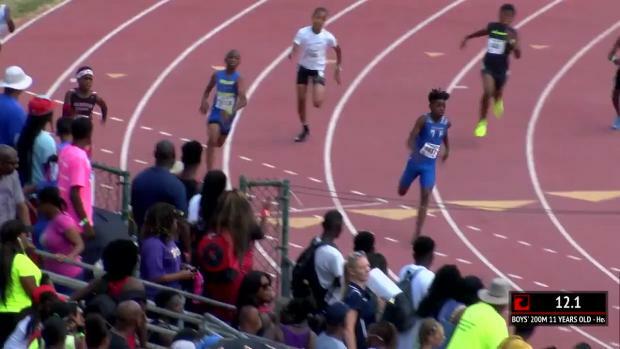 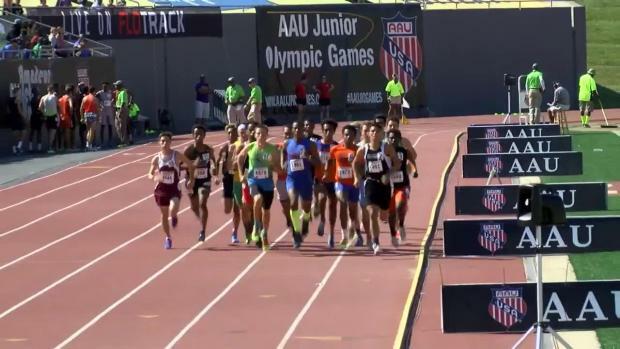 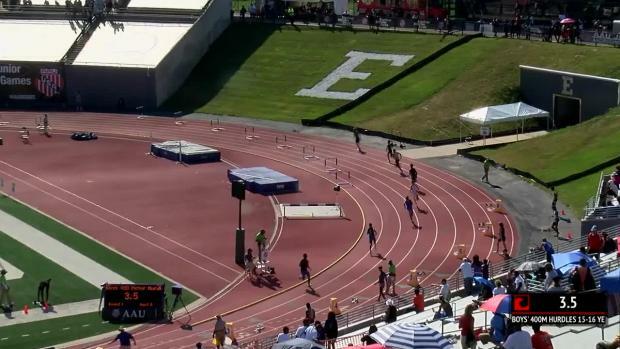 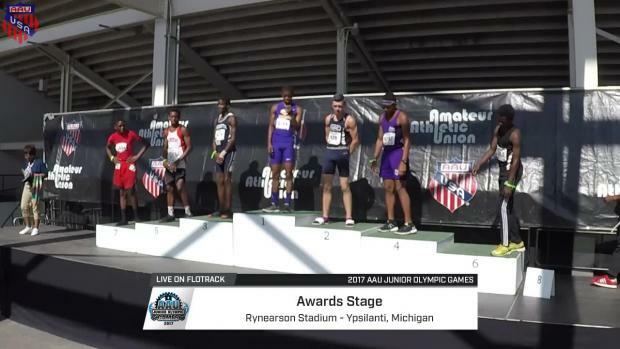 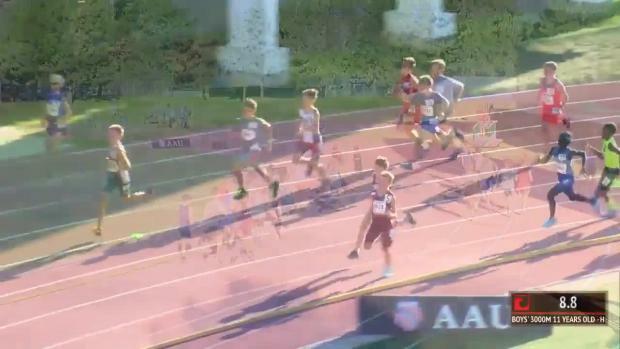 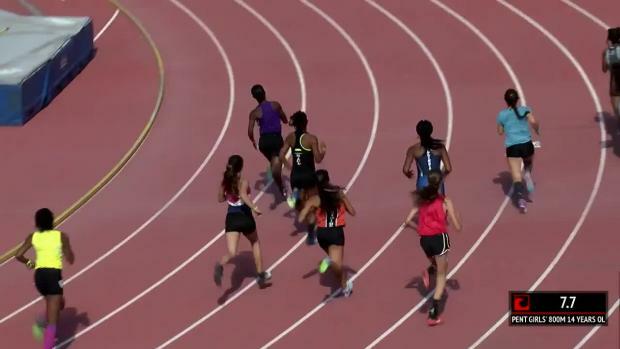 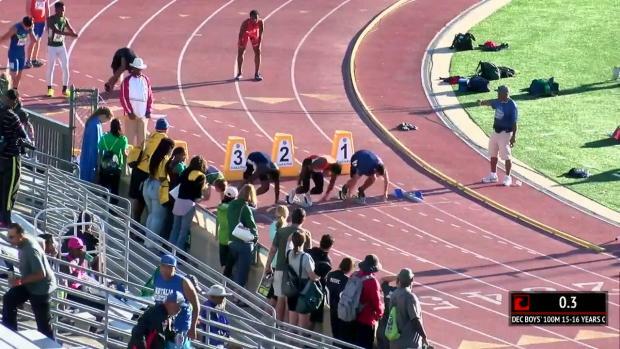 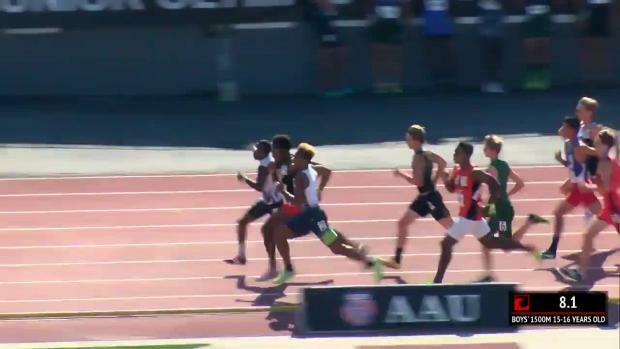 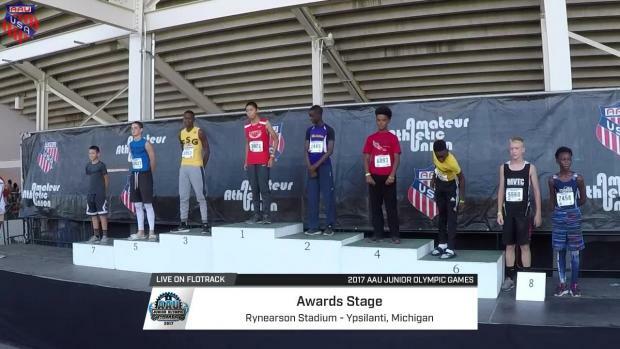 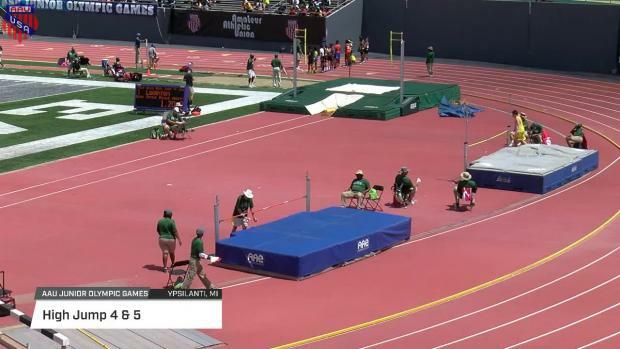 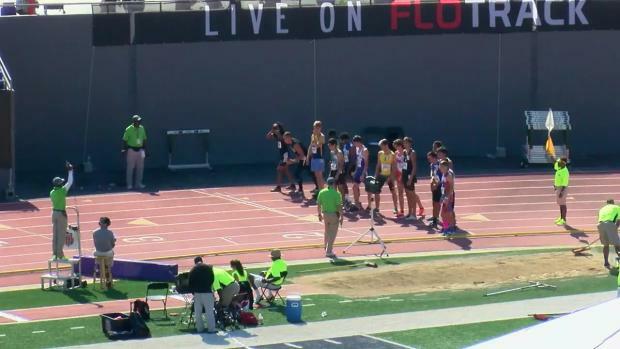 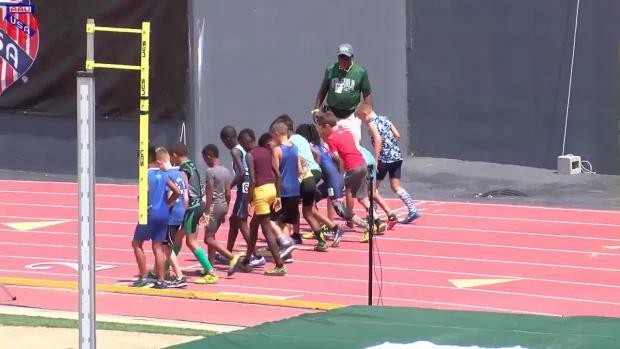 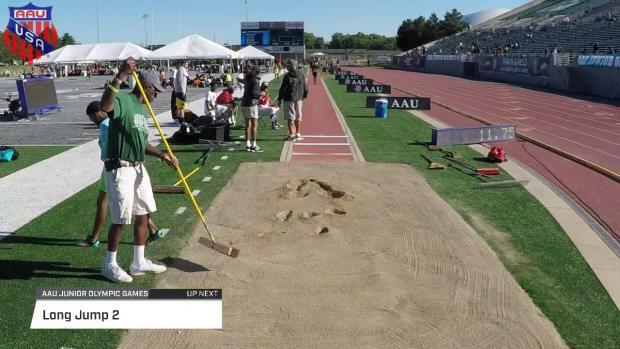 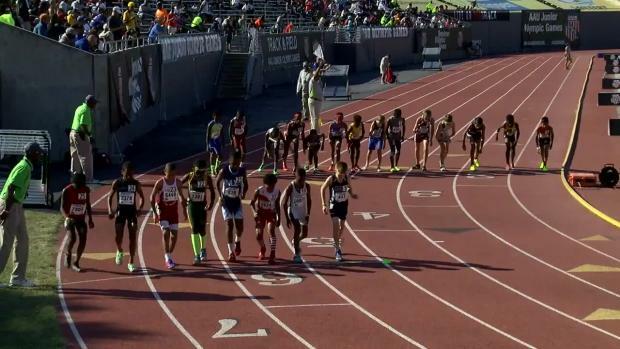 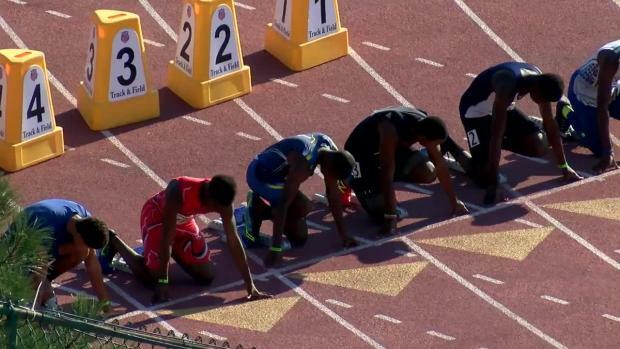 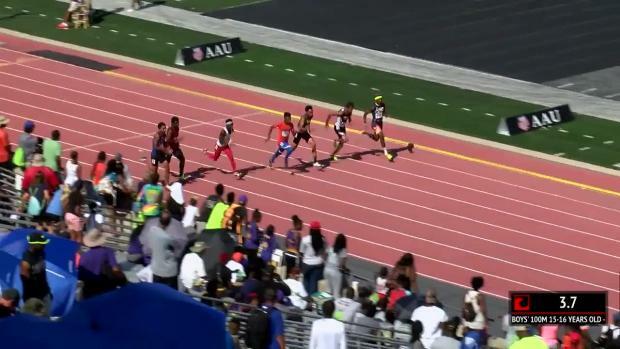 Make sure to tune in to the AAU Junior Olympics, which are streaming live on FloTrack this year, to find out what Davis does this time around. 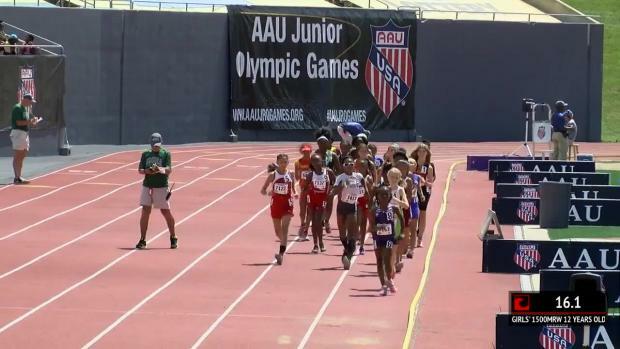 The AAU Junior Olympic Games are right around the corner. 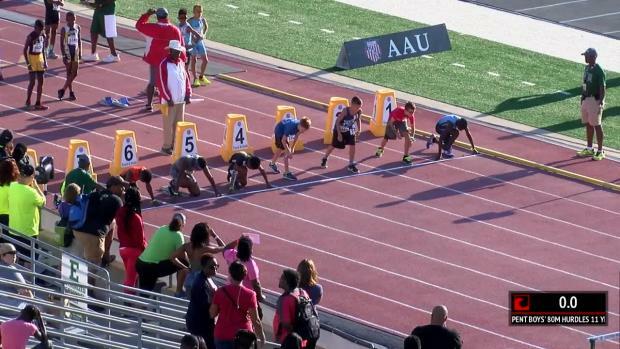 These games are where young athletes come to make a name for themselves. 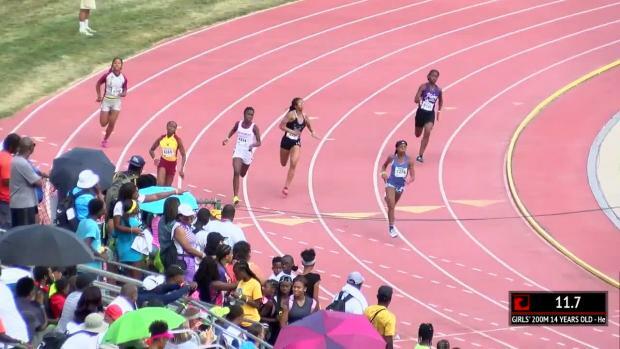 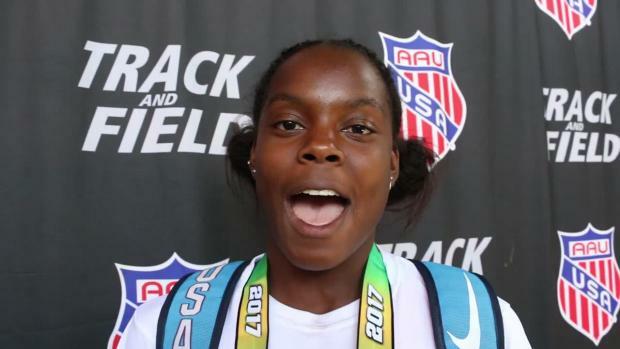 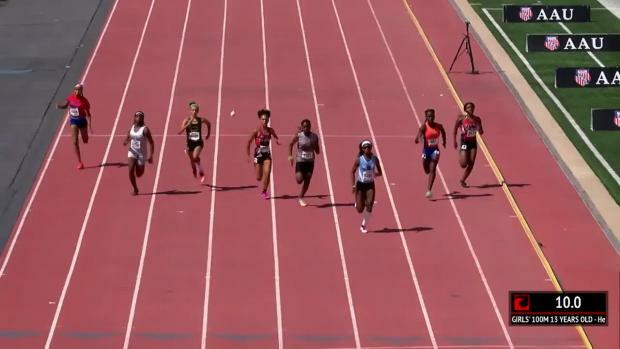 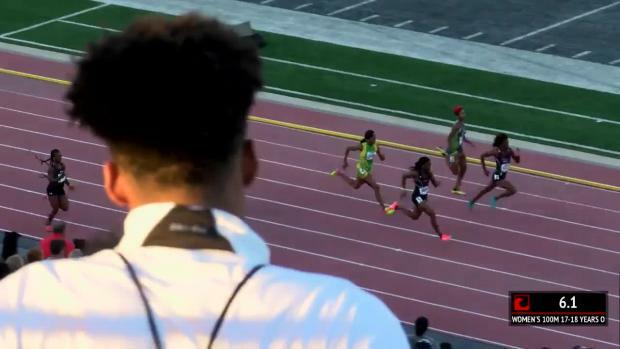 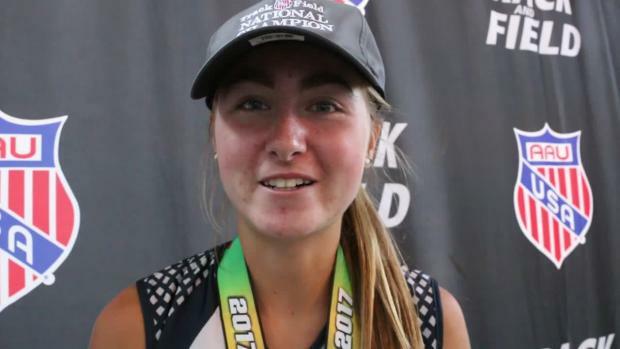 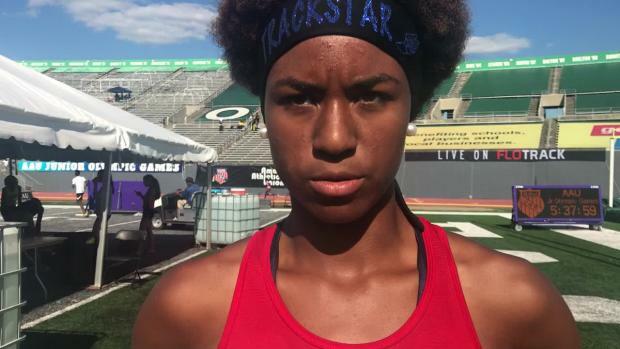 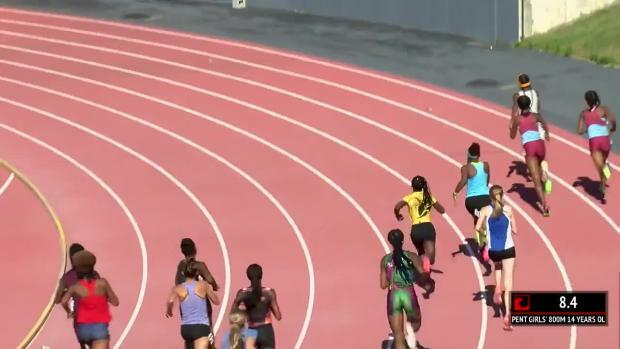 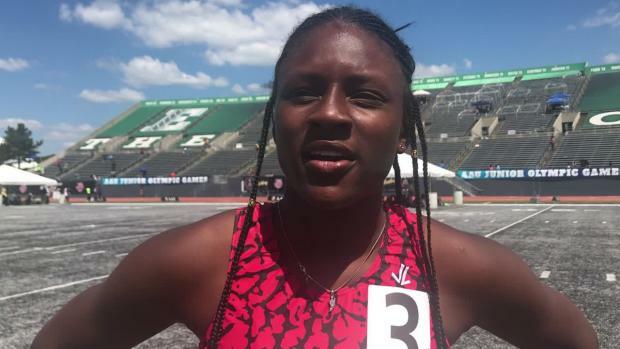 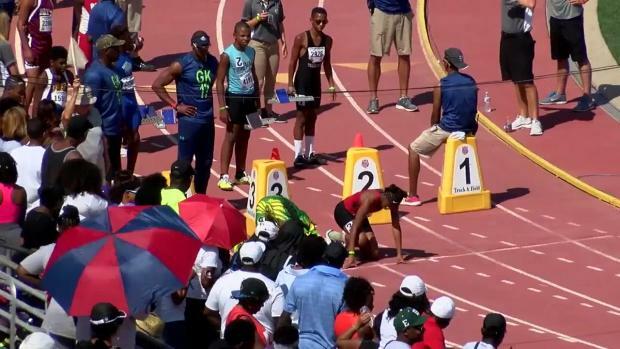 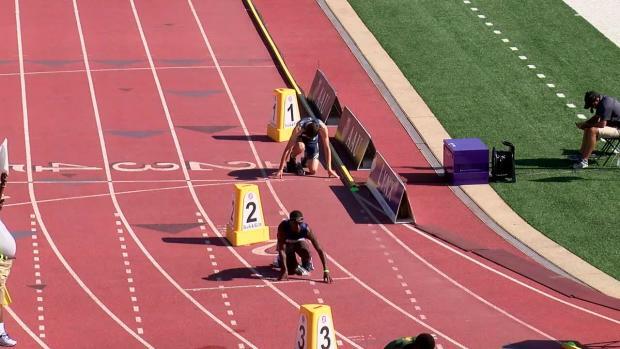 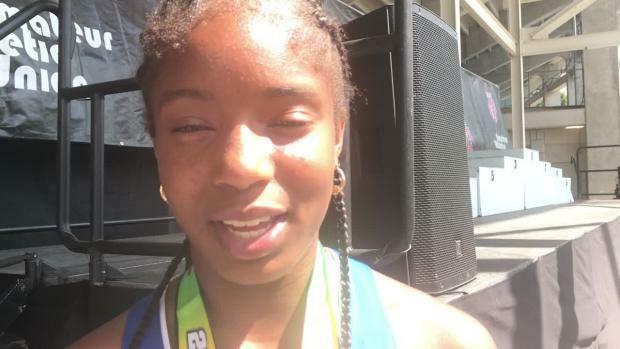 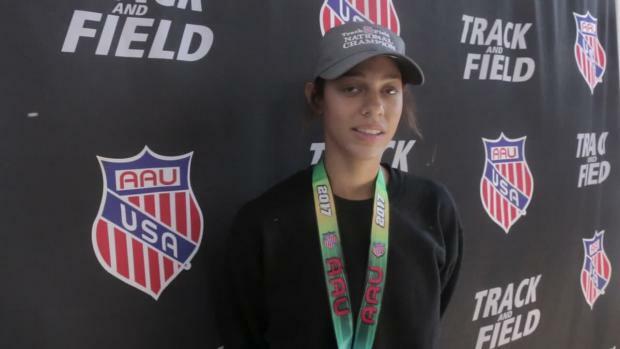 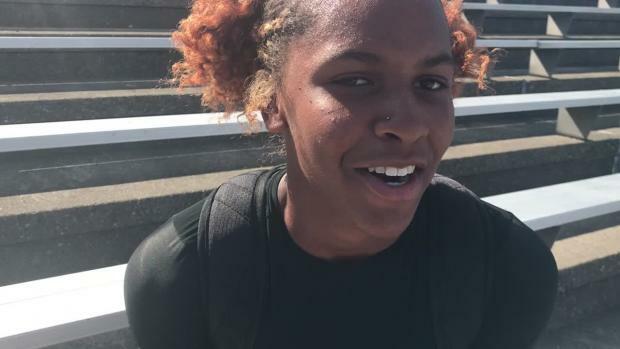 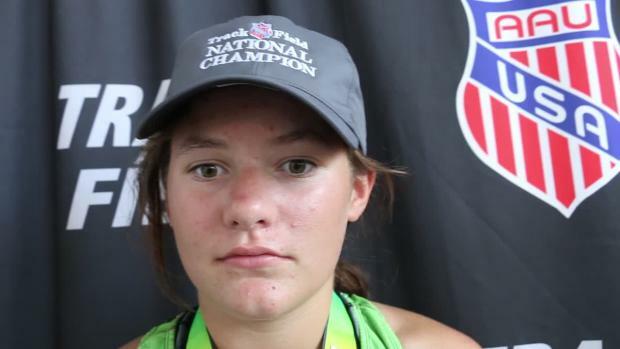 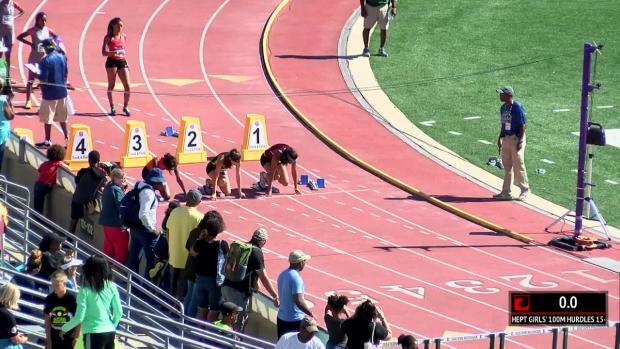 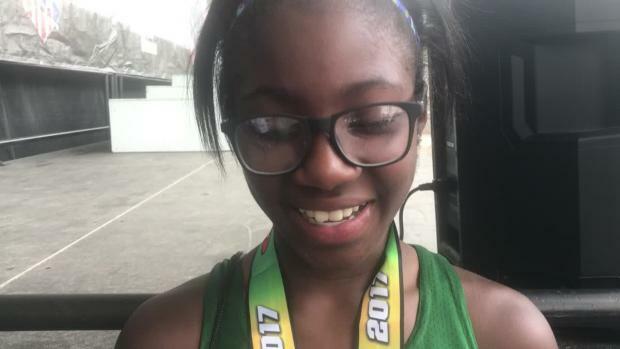 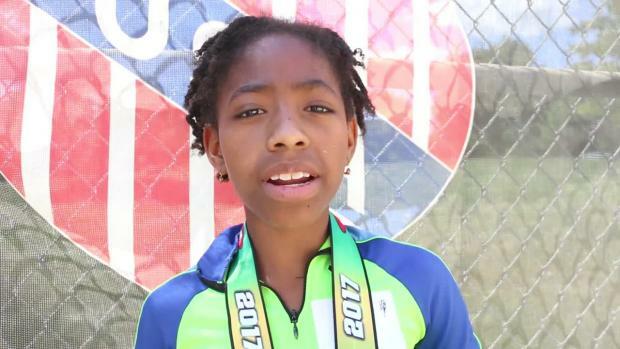 Last year, Alicia Burnett, who runs for Ultimate Speed Academy in St. Louis, Missouri, put herself on the map as she won both the 100 and the 200 at the AAU Junior Olympic Games. 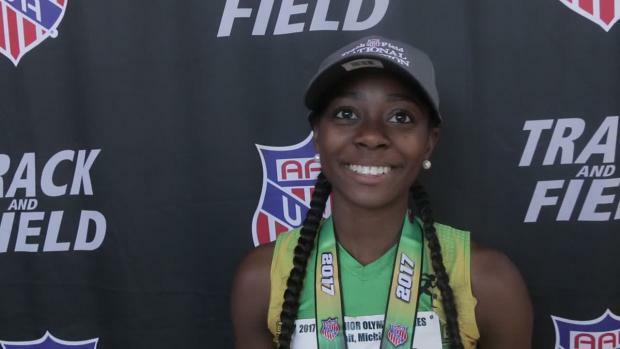 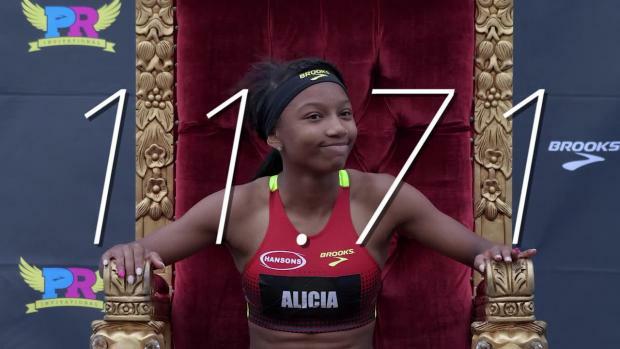 Her winning time of 11.66 is the 100m AAU Junior Olympic National Record for 14-year-olds .In 2017, she went on to dominate the national scene as she won Brooks PR Invite in the 100m dash as just a freshman. 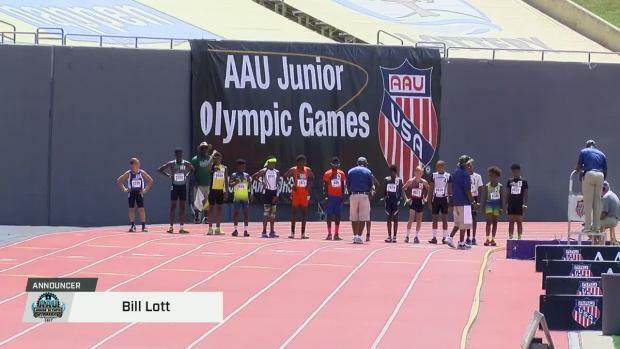 Look for Burnett to dominate again this year at the AAU Junior Olympic Games LIVE on Flotrack July 29th-August 5th. 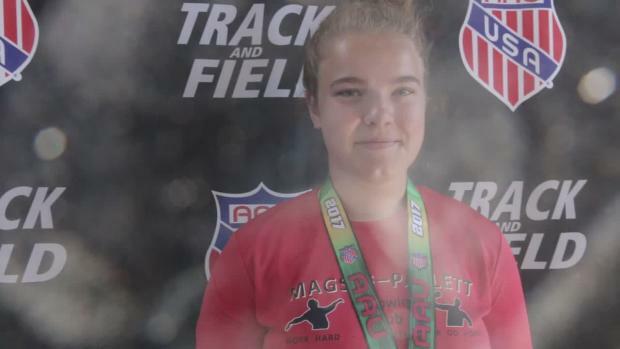 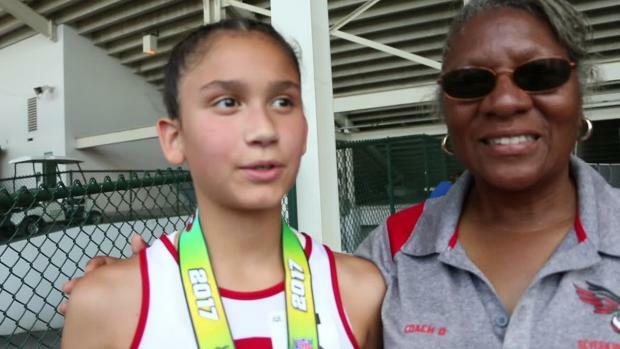 The daughter of one of the NFL's biggest showmen of all time is headed back to the AAU Junior Olympics to vie for her third straight championship in August. 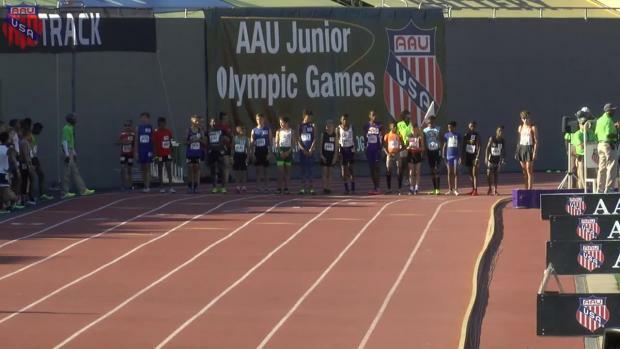 Check out the AAU qualifying hub and see who's moving on to the Junior Olympics. 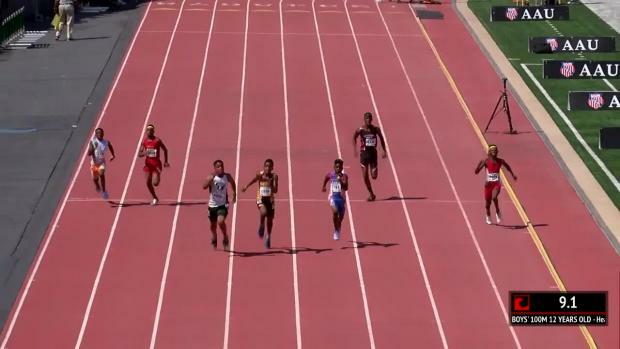 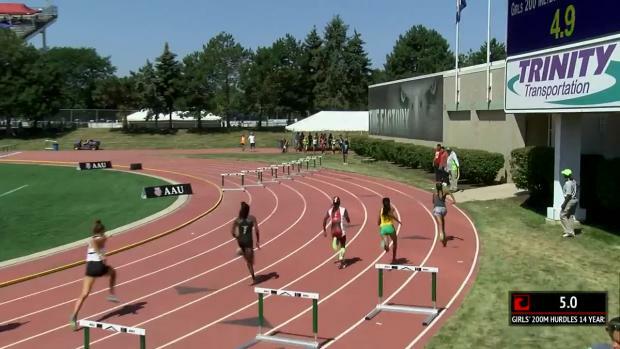 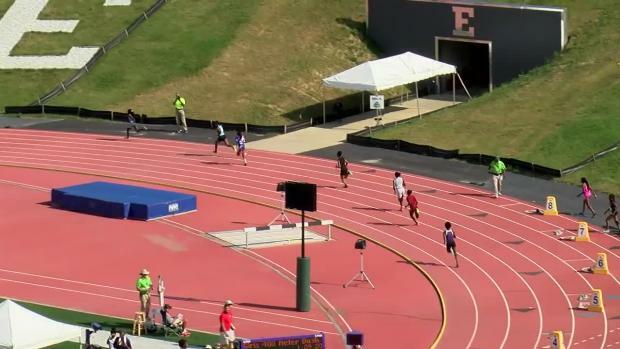 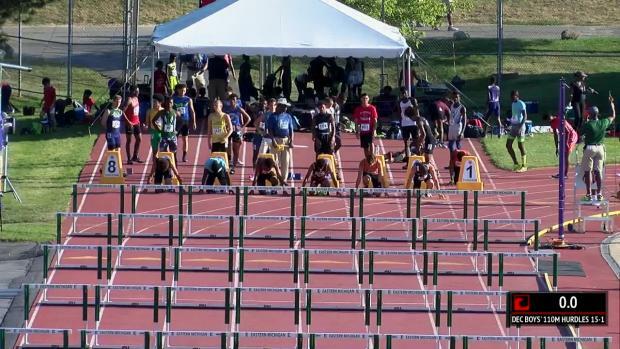 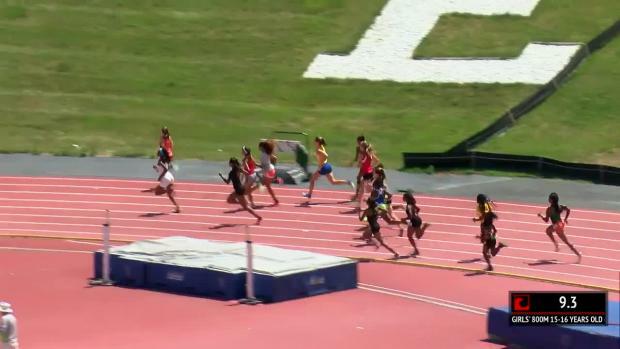 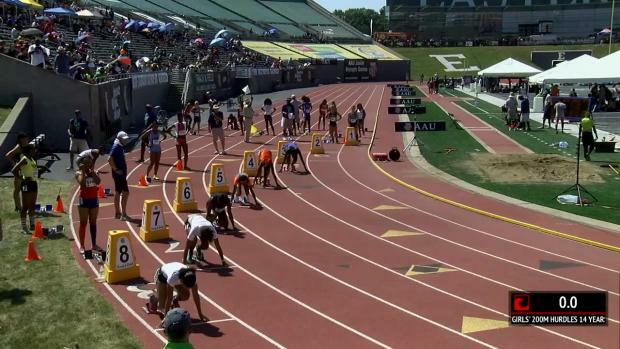 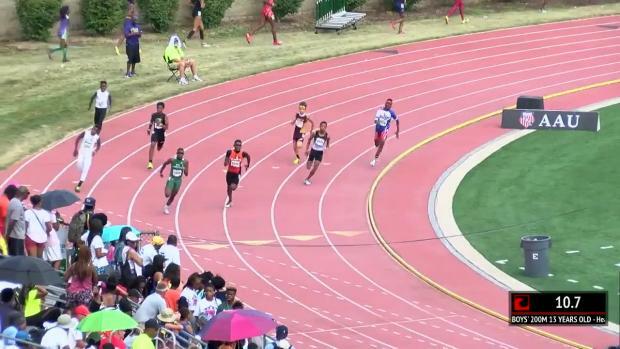 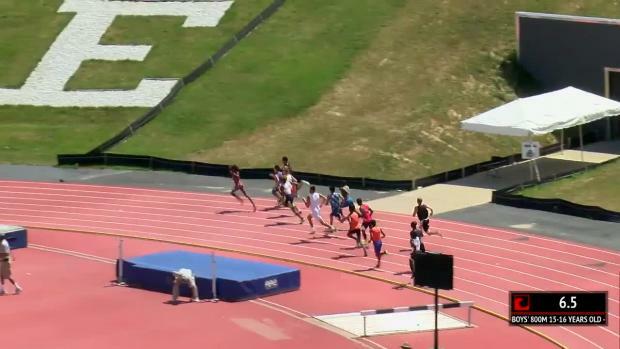 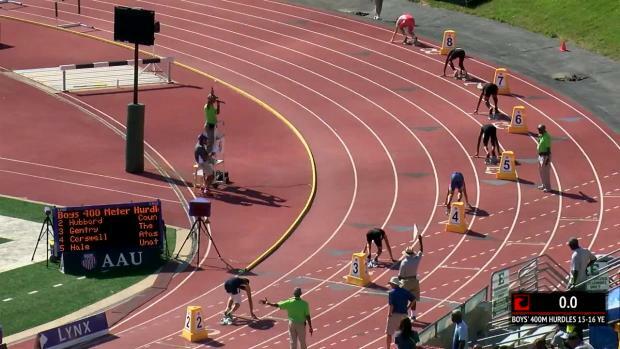 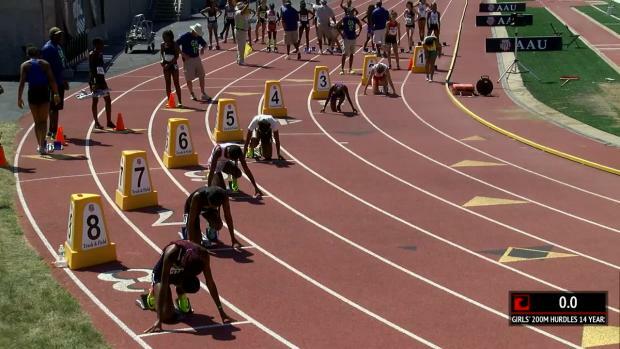 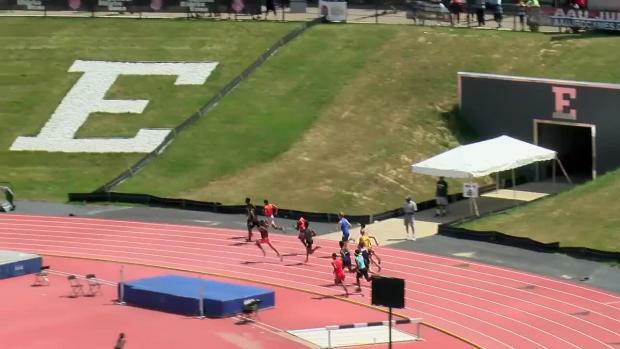 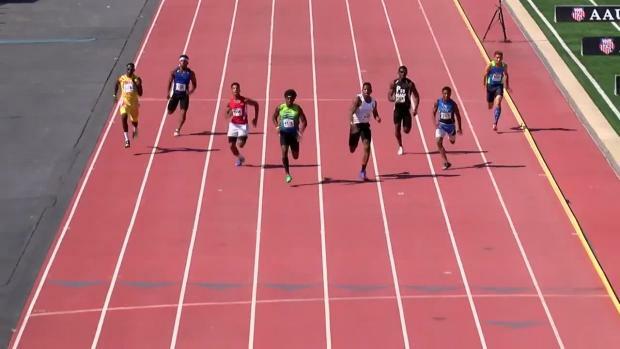 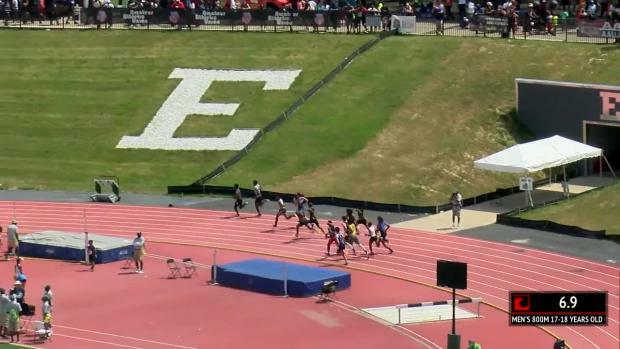 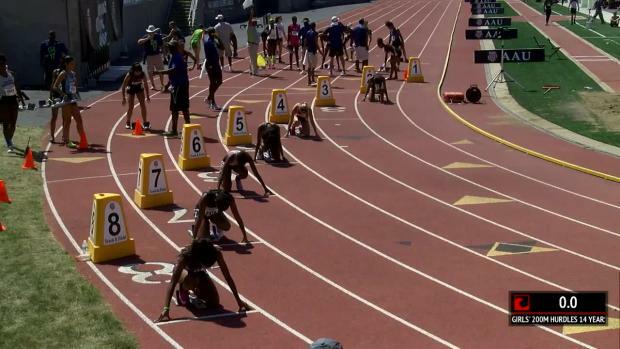 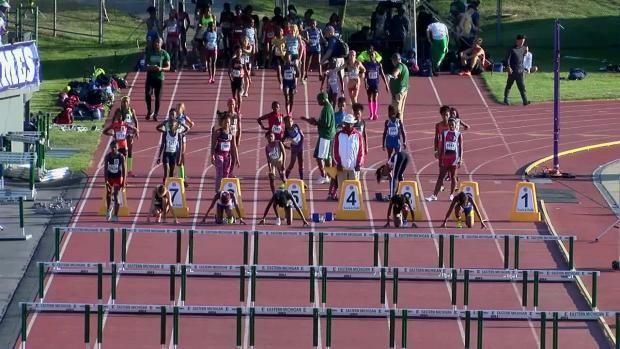 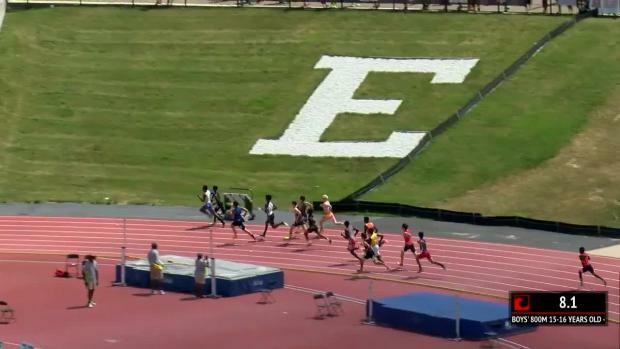 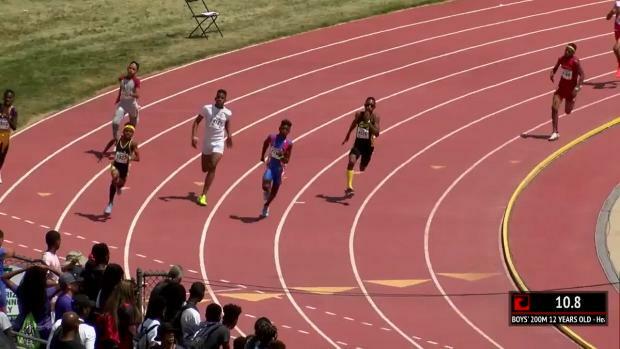 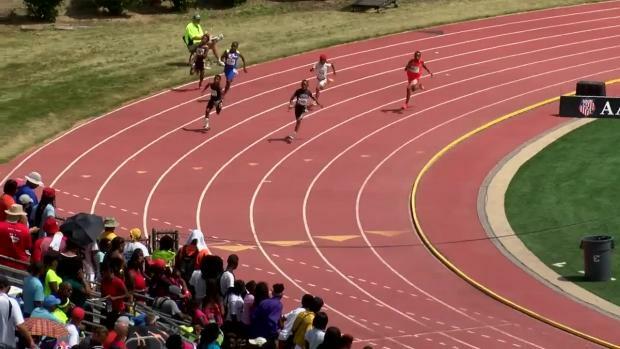 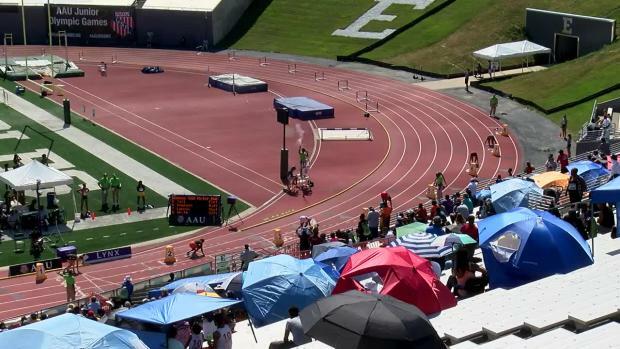 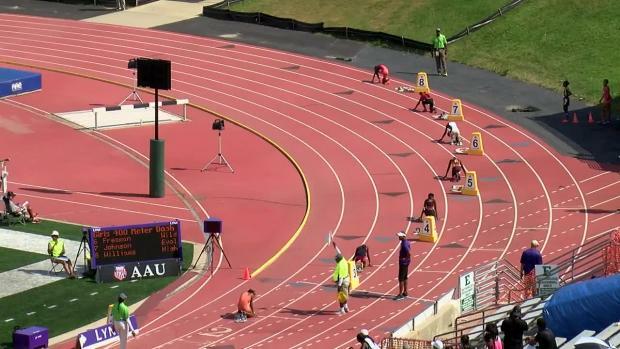 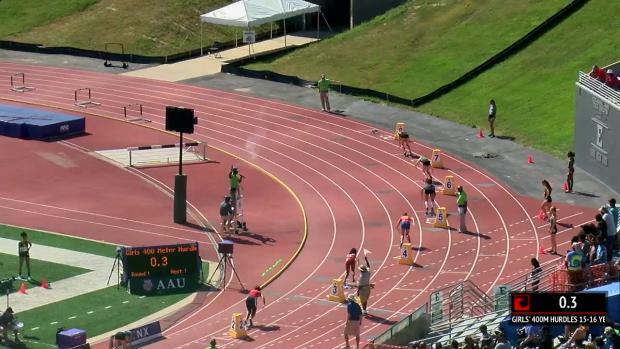 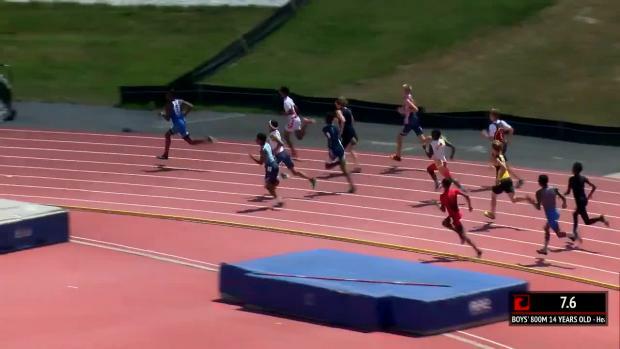 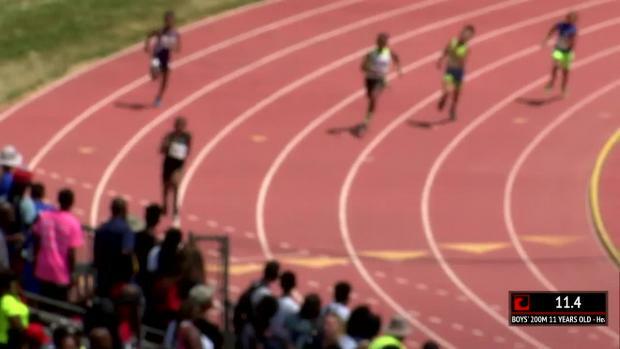 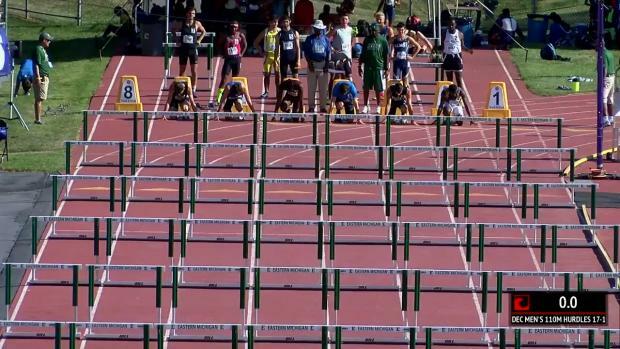 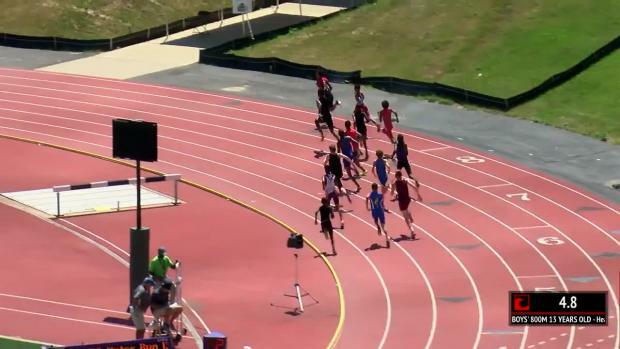 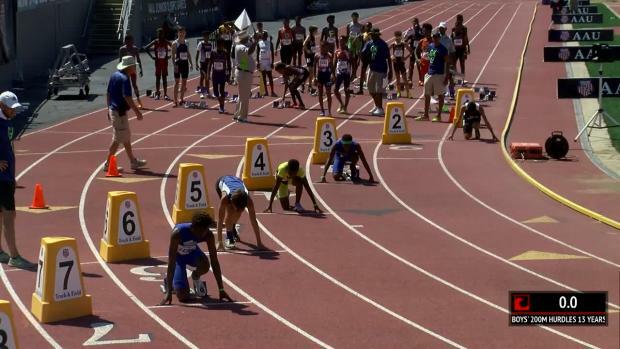 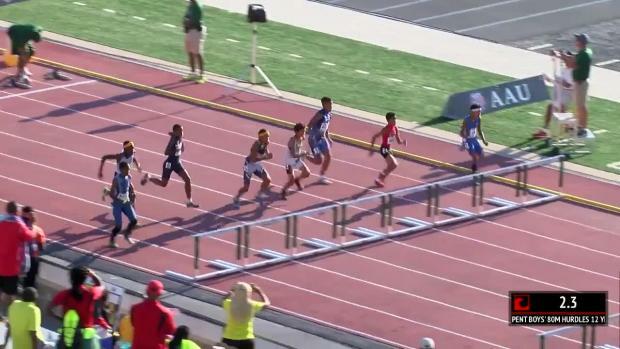 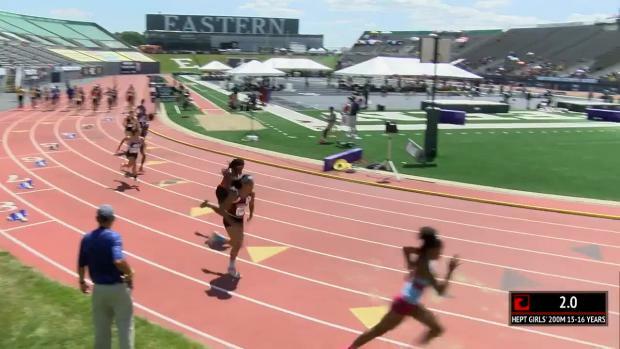 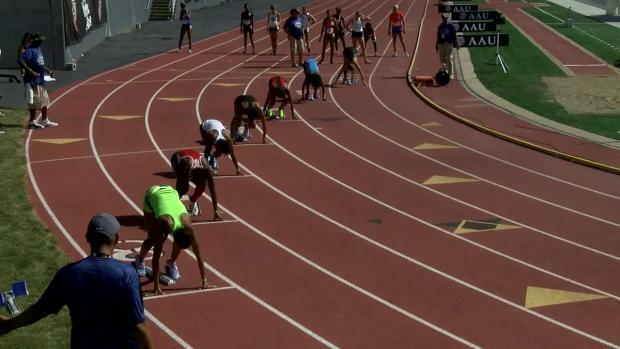 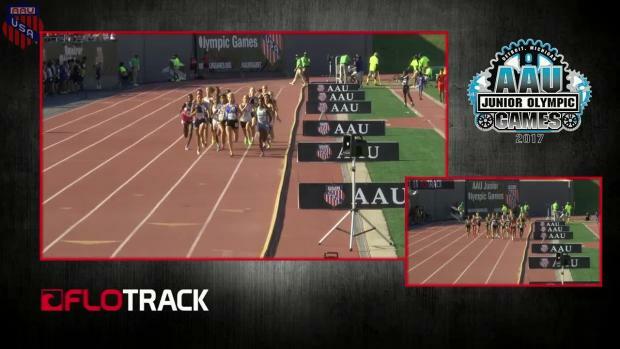 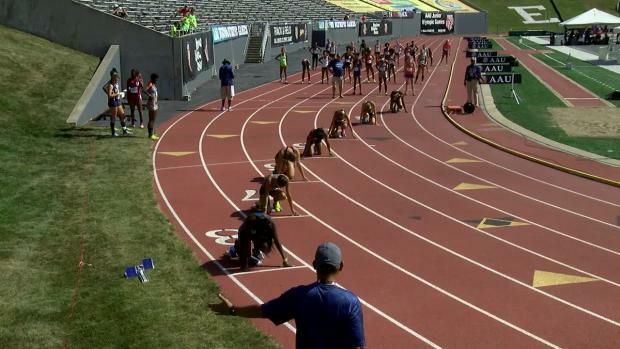 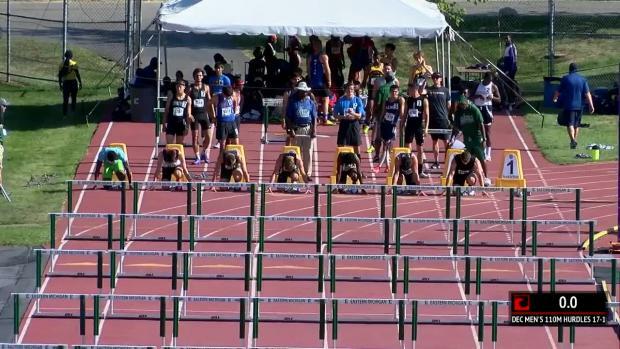 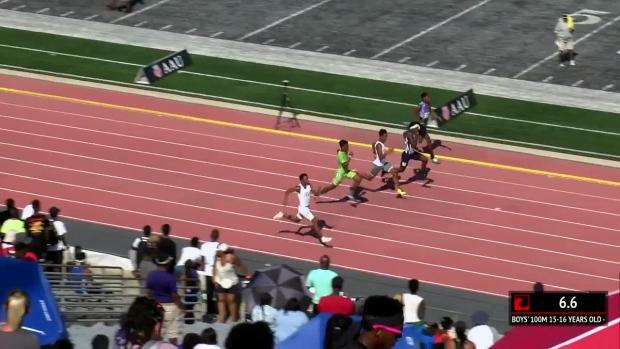 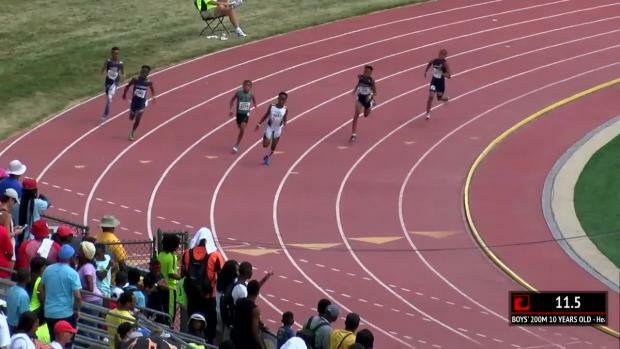 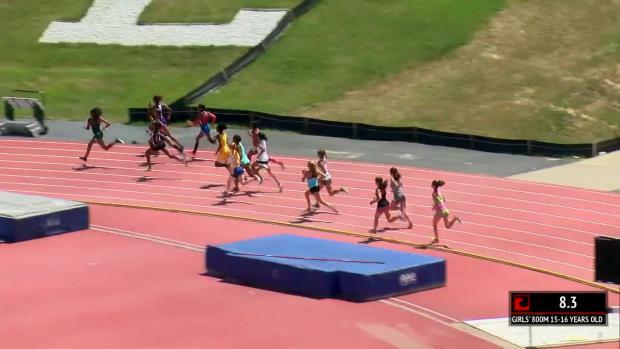 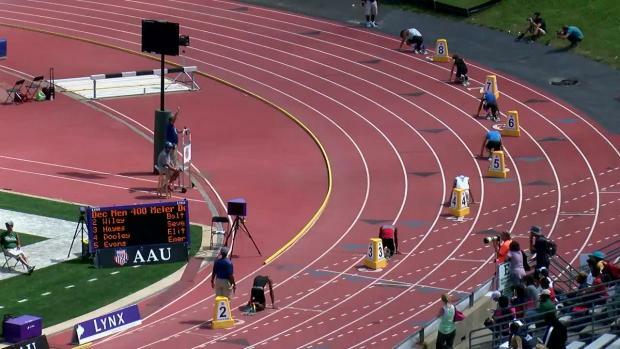 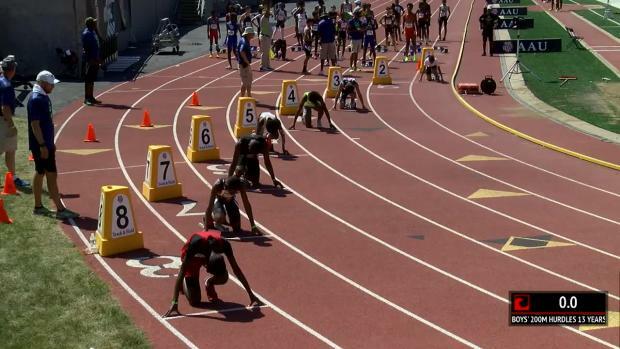 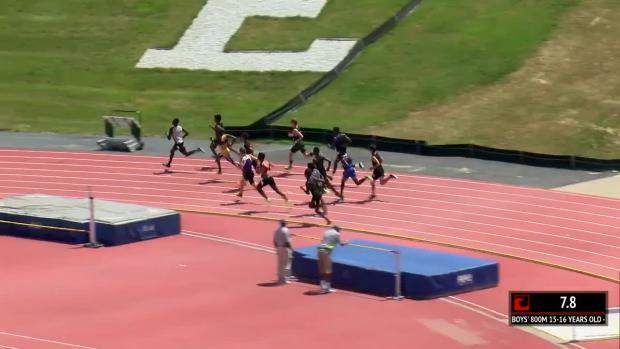 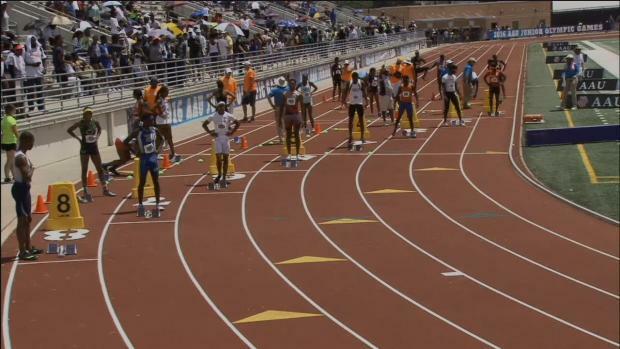 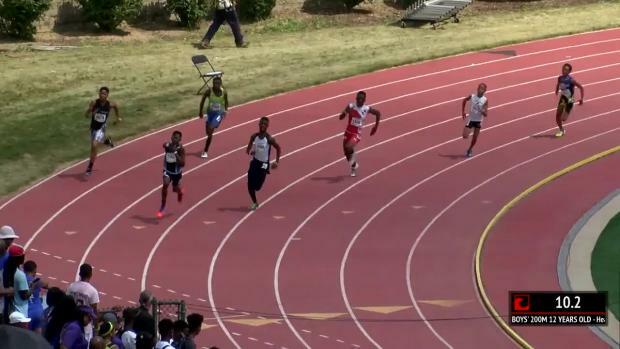 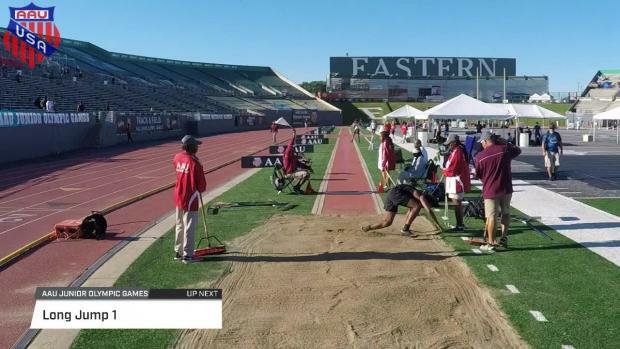 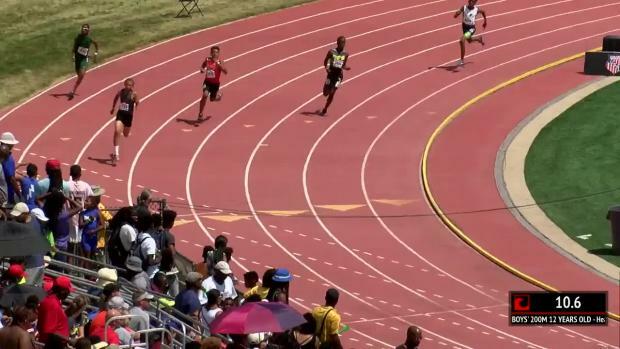 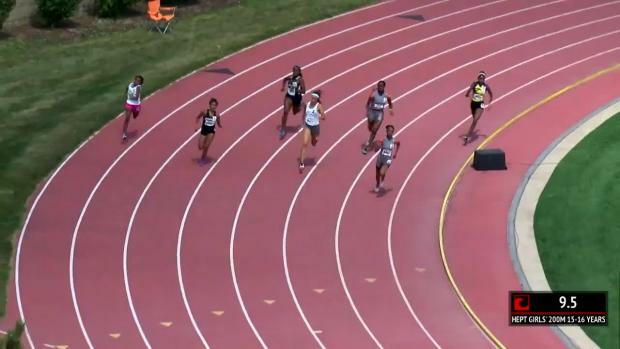 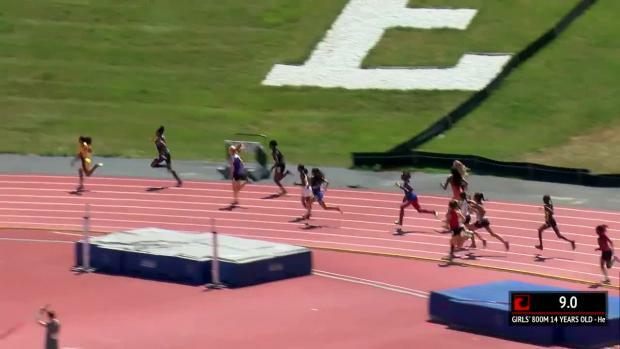 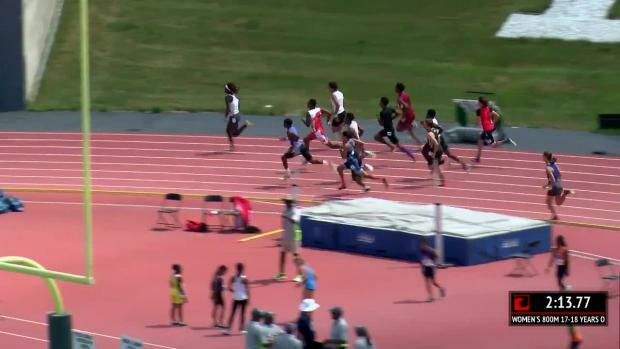 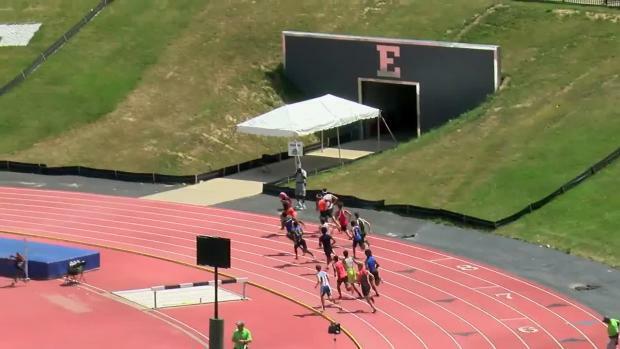 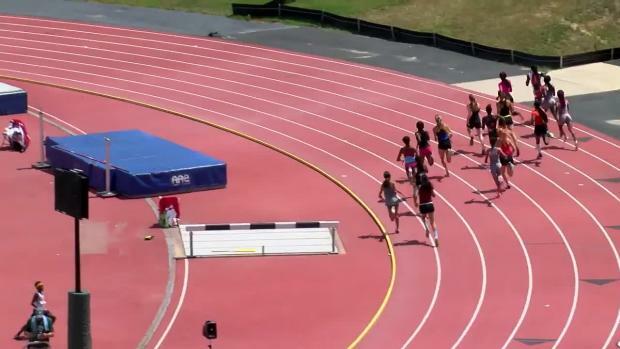 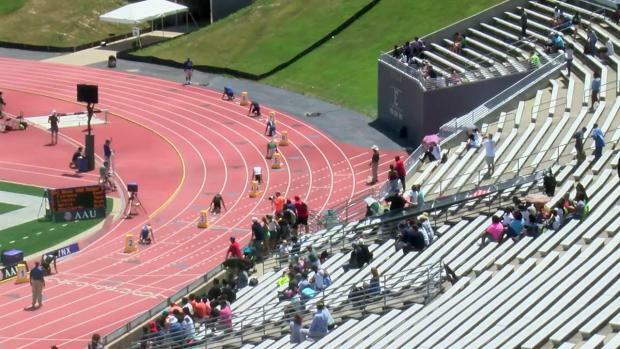 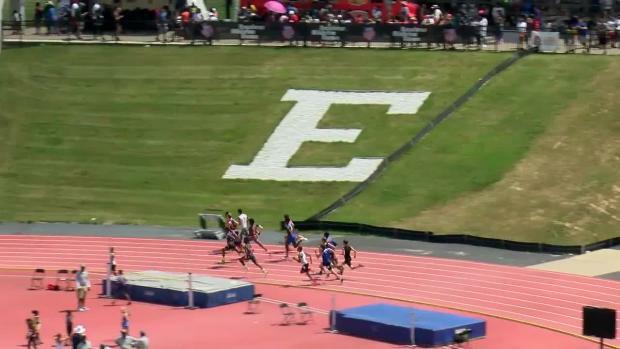 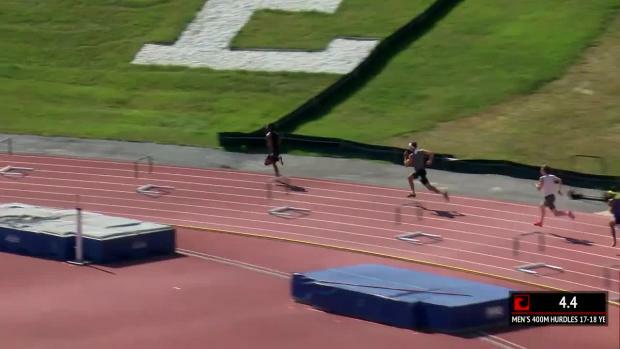 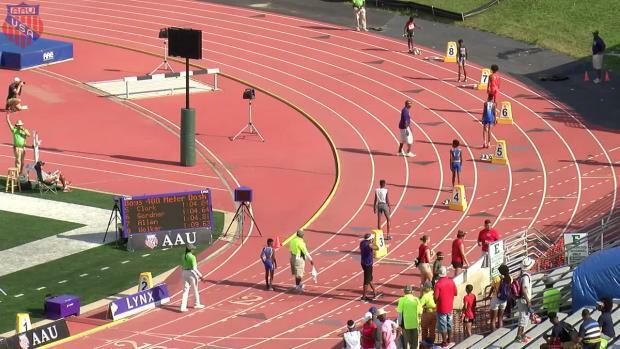 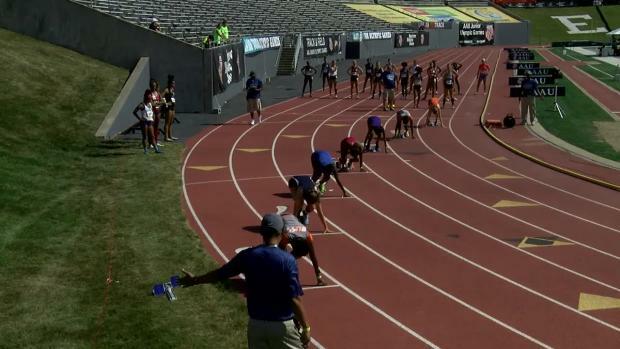 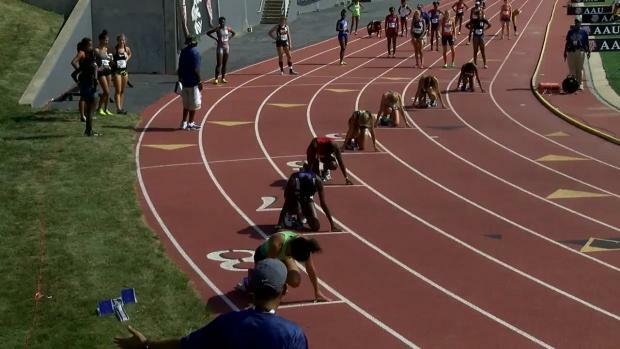 Watch the AAU Junior Olympics LIVE on FloTrack from July 29-August 5th. 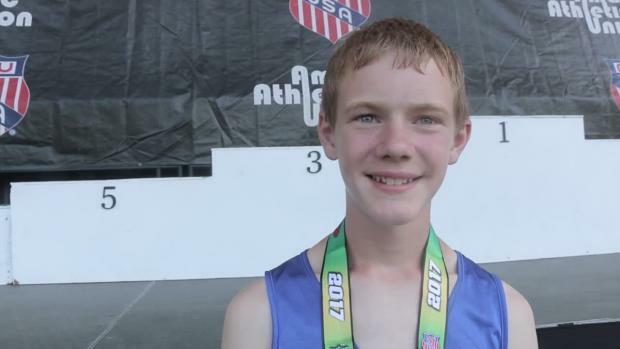 Relive all the action from the 2017 AAU Junior Olympic Games. The Miami Gardens Xpress boys broke the 12-year-olds national record in the 4x800 relay at the AAU Junior Olympics in 2016, going 9:19.92. 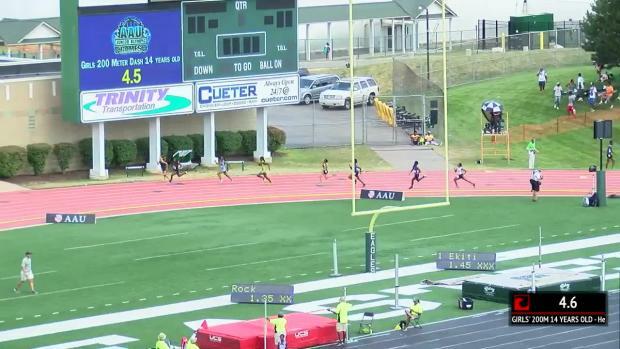 MGX, which anchored a 2:15.65 in the race, broke the old record of 9:22.42. 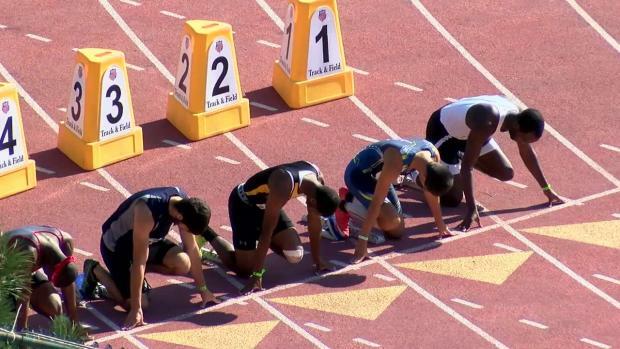 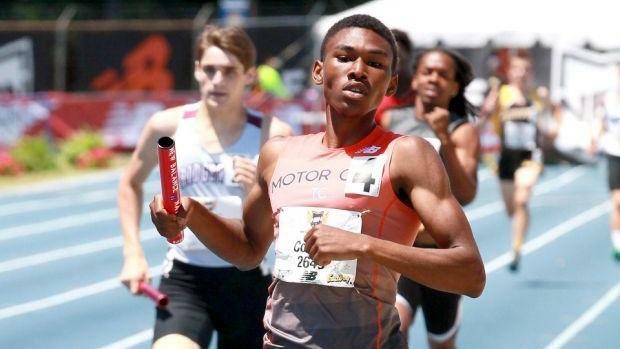 Keep track of the best rising stars of track and field with MileSplit's NEW Club Rankings! 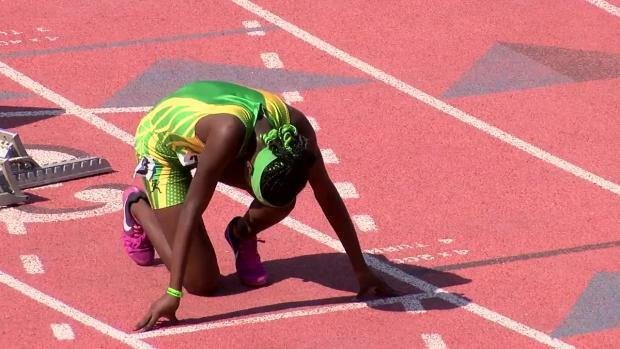 Athing Mu made a decision this year that ultimately kept her out of the limelight. 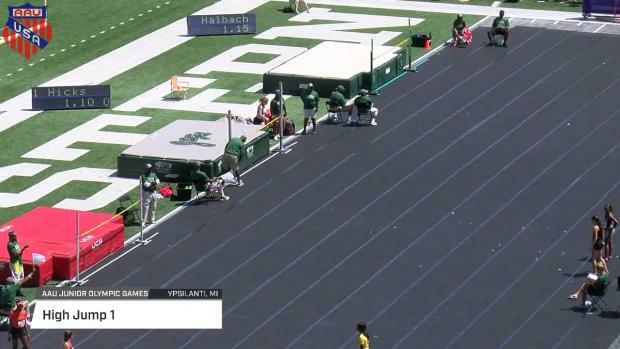 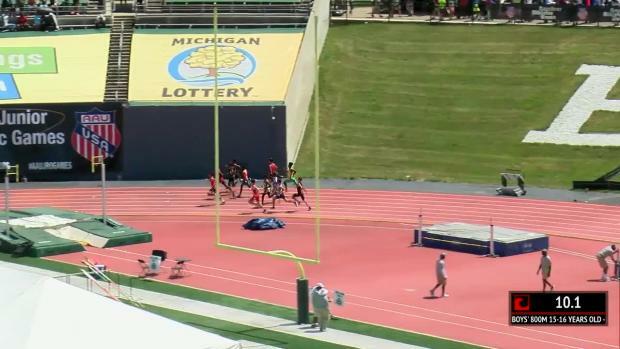 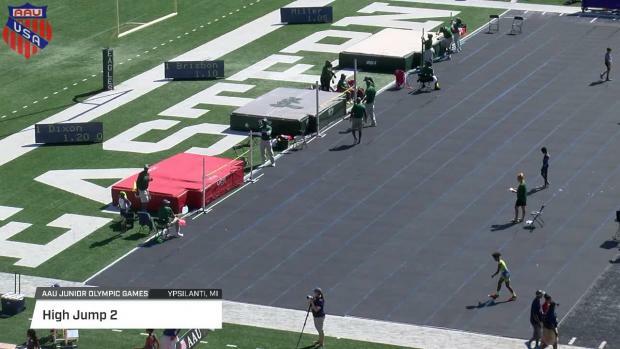 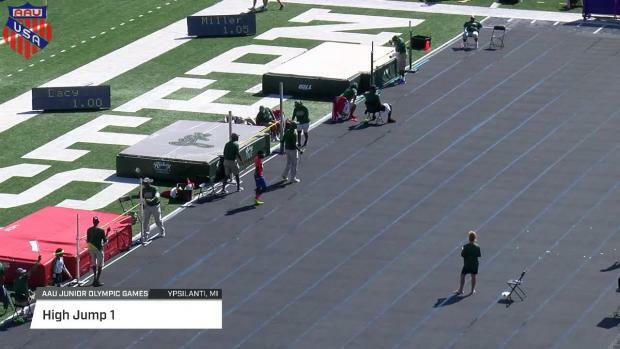 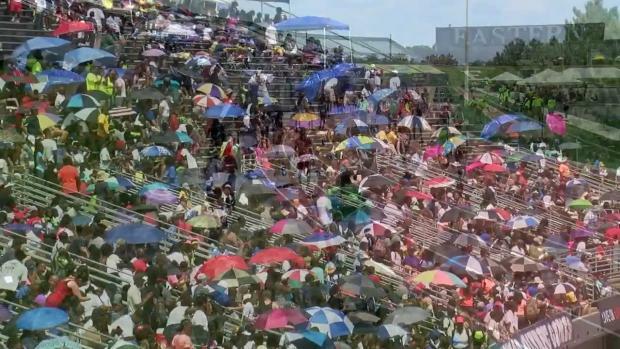 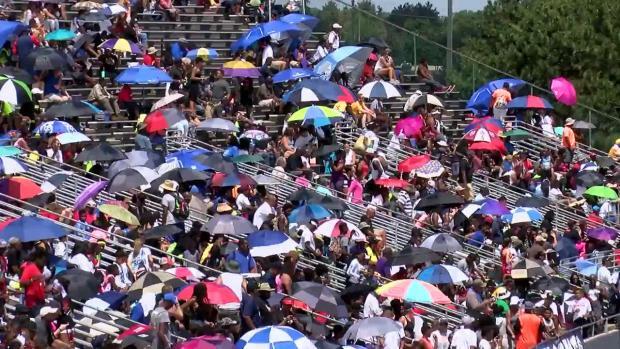 A gigantic hush rippled through the crowd Monday during the first 100 meters of the boys age 15-16 800m semifinal at Rynearson Stadium at Eastern Michigan University in Ypsilanti, Michigan.One of the nation's top athletes in the 800m -- Missouri's Brandon Miller -- was clipped just seconds into the race and fell to the track as the rest of the field barreled ahead. 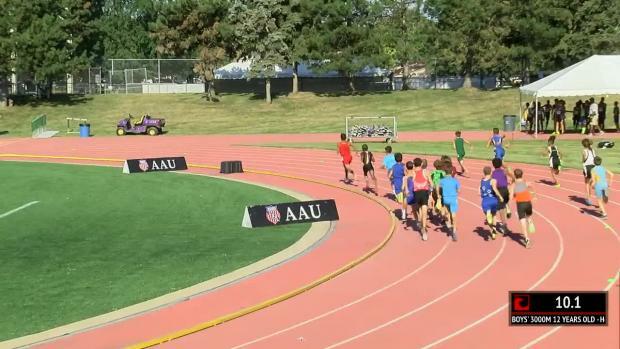 Not curtailed, however, the Ultimate Speed Academy half-miler urged his way back from the deficit and took over the race with 50 meters to go in the first lap. 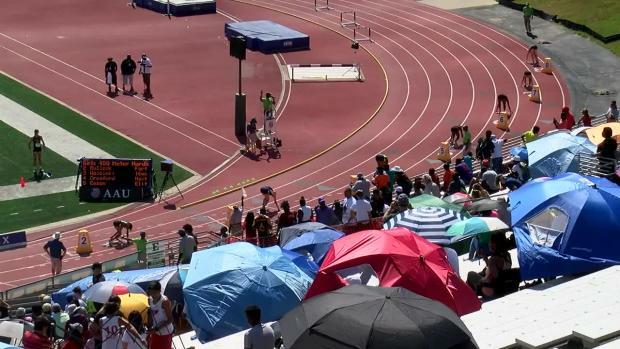 Once silenced, the crowd began to boom with applause as Miller raged through the last 400 meters. 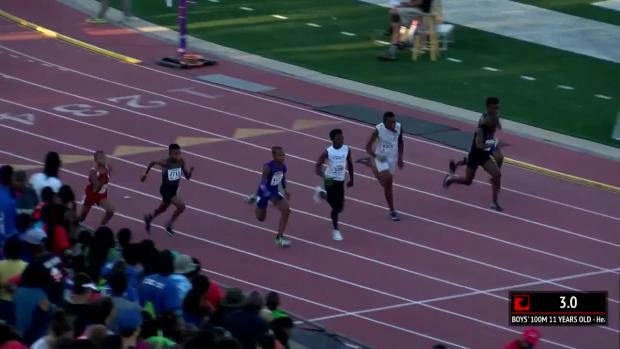 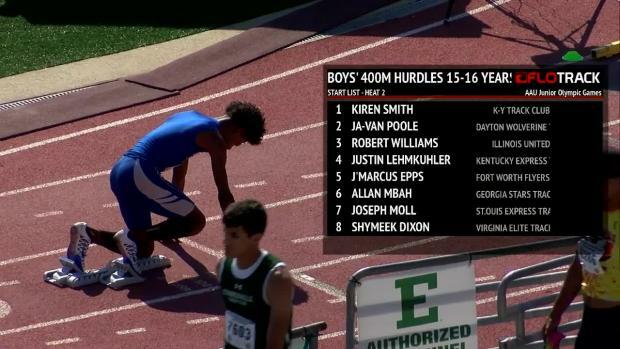 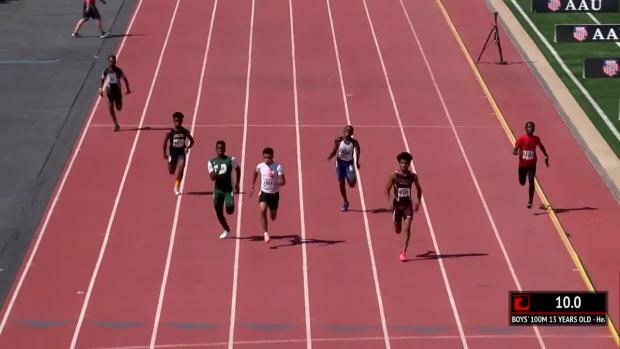 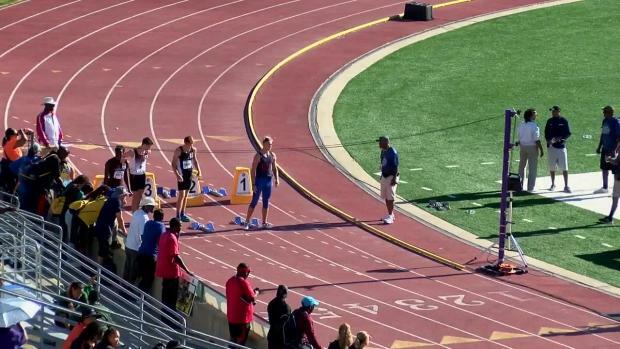 Miller finished the field with the fastest overall time of 1:55.74, though it wasn't near what the rising sophomore from John Burroughs High was hoping for in his first heat. 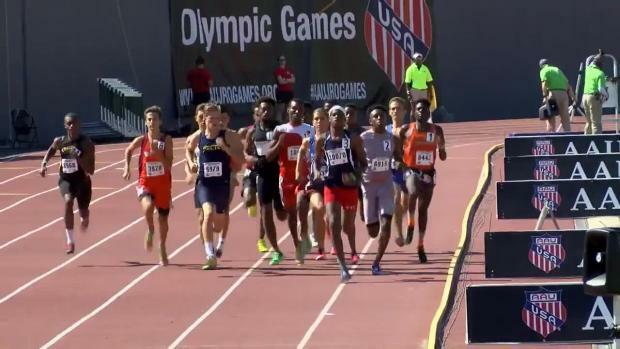 Afterward, Miller restated his goal for Wednesday's final: Sub-1:50. 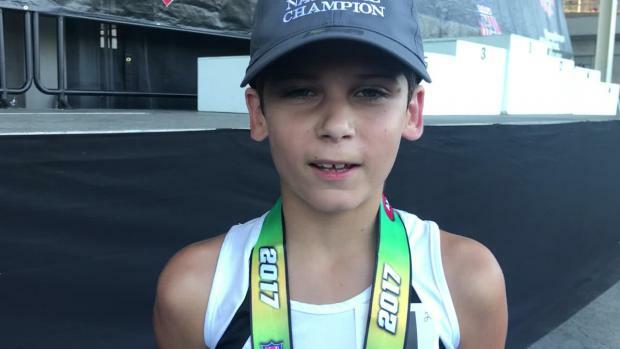 Miller will have to run faster than 1:49.42 to break his third-straight world age group record in the 15-year-old division. 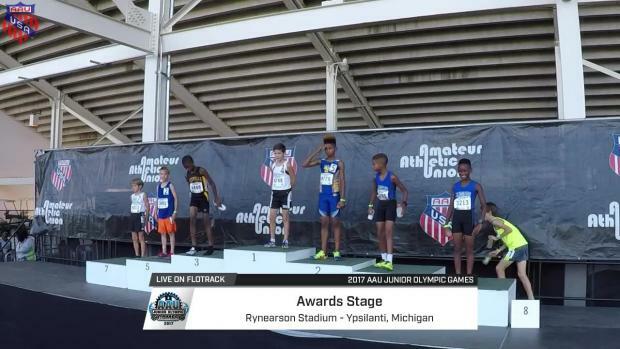 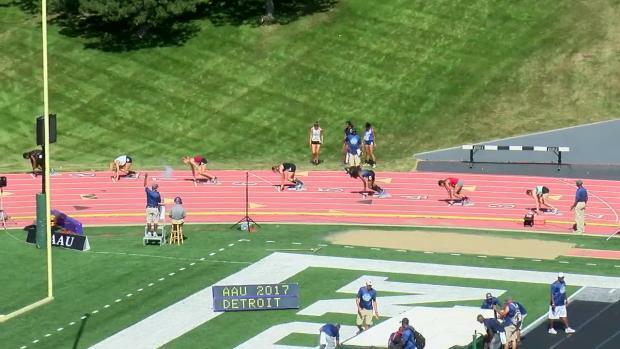 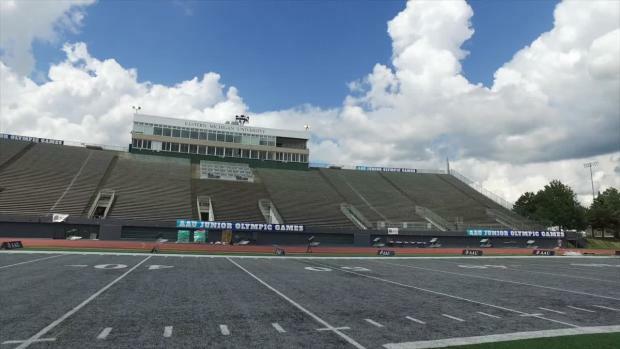 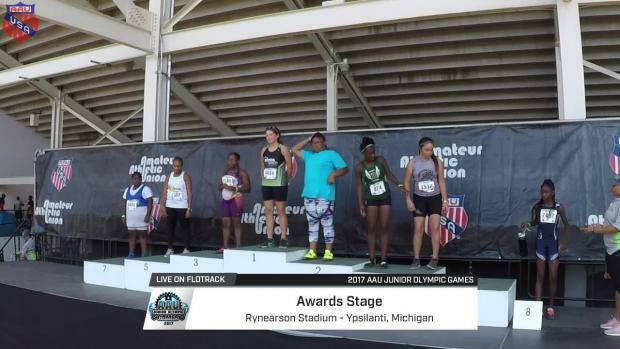 Athletes from the state of Ohio performed admirably at the recent AAU Junior Olympic Games in Michigan. 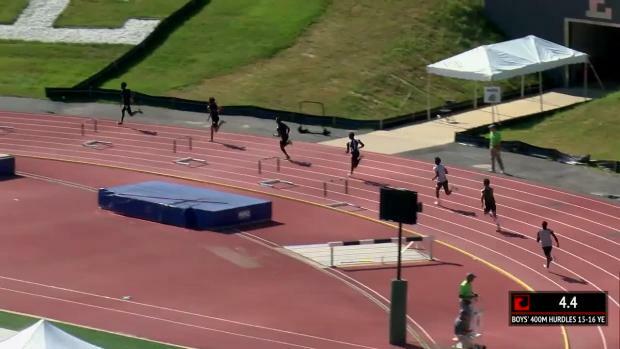 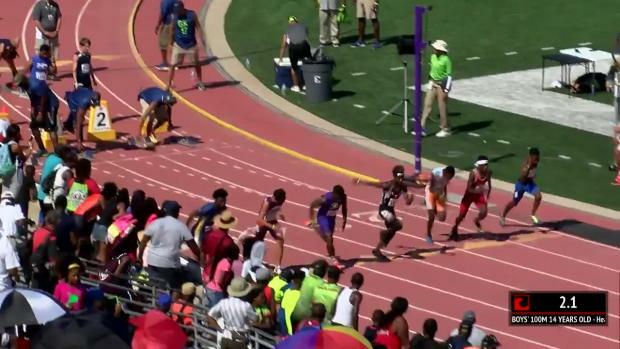 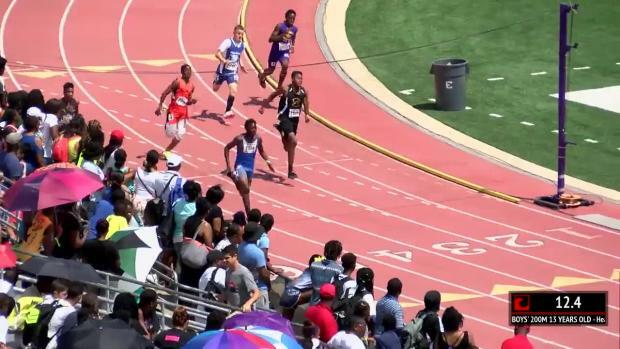 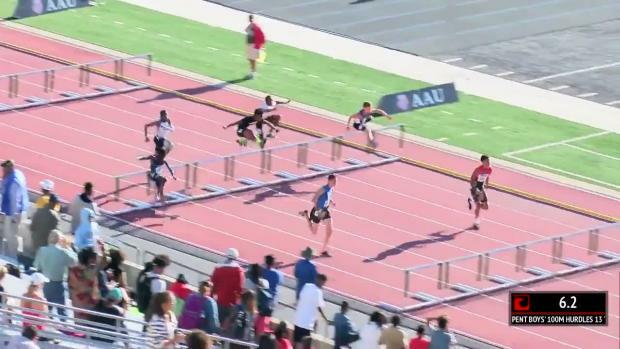 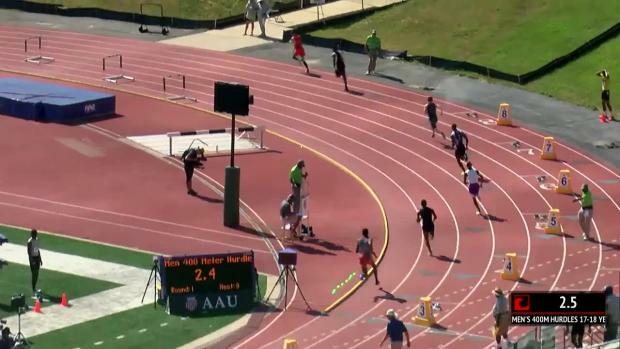 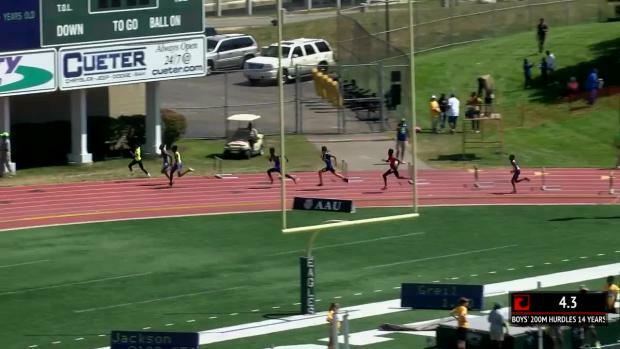 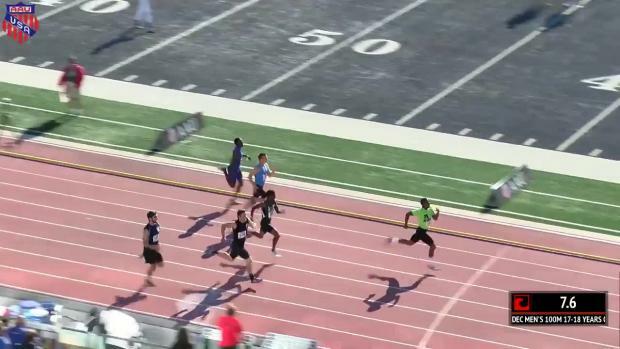 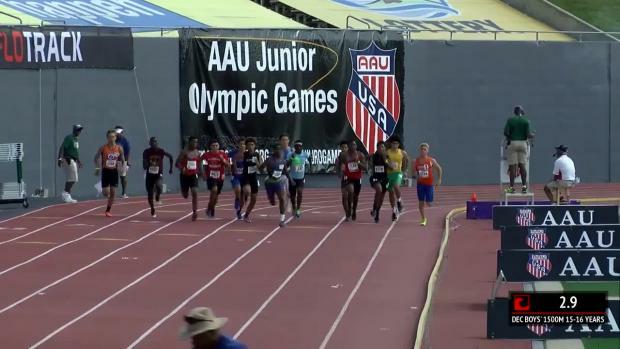 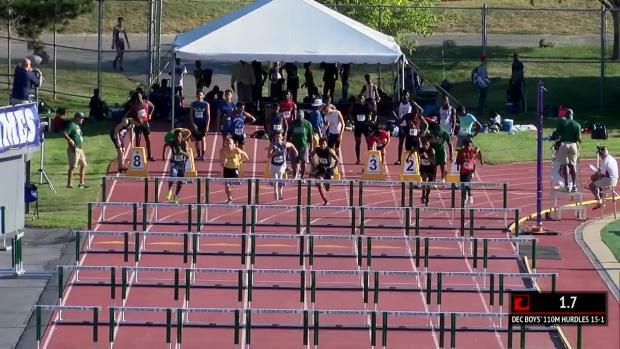 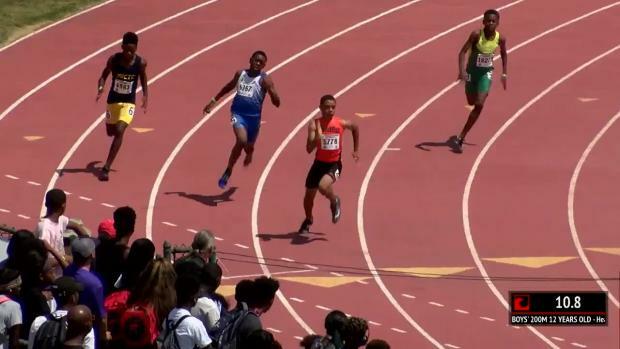 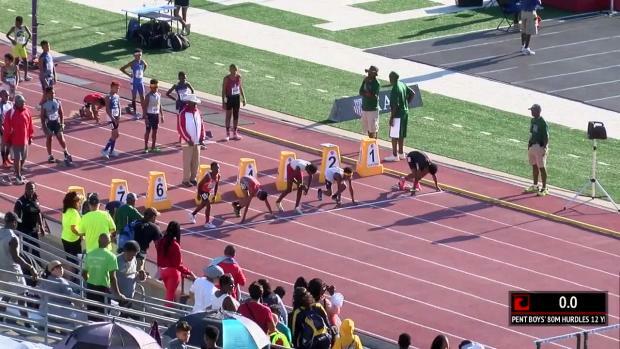 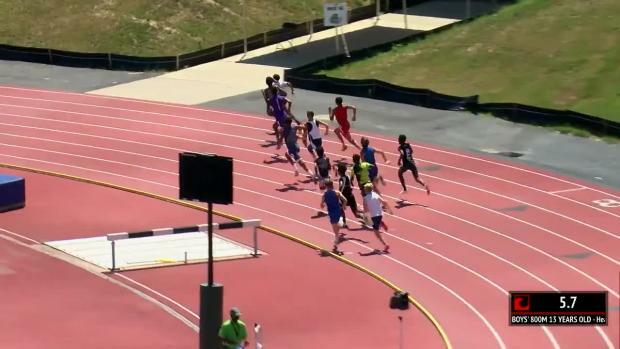 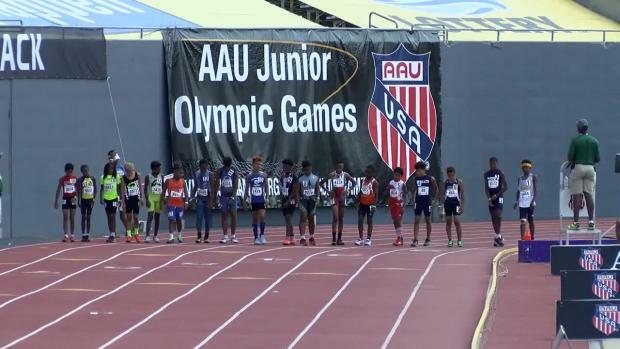 Highlights from Day 7 of the AAU Junior Olympic Games! 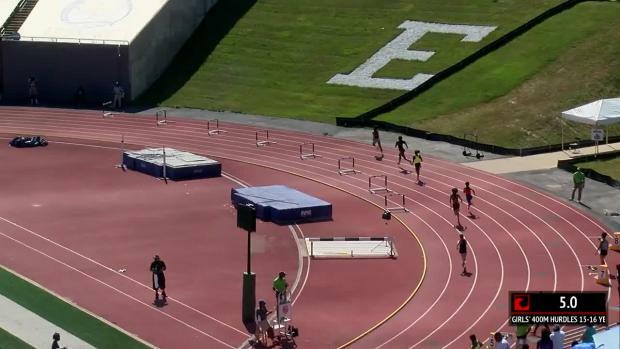 The meet will also be LIVE on FloTrack! 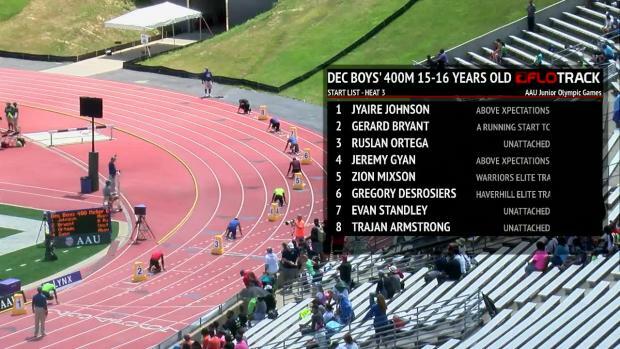 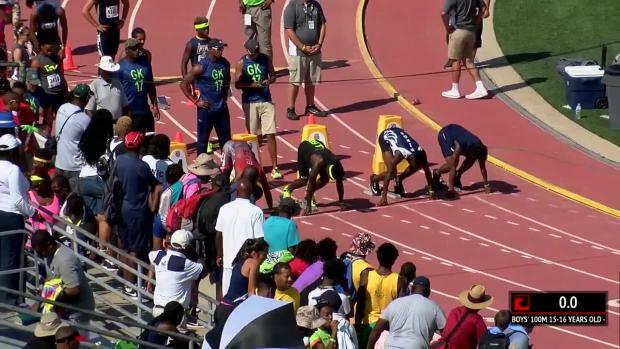 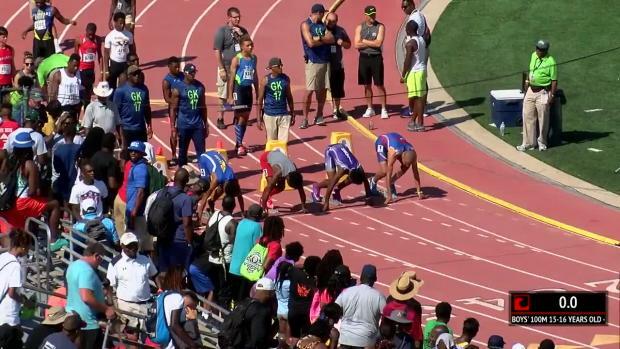 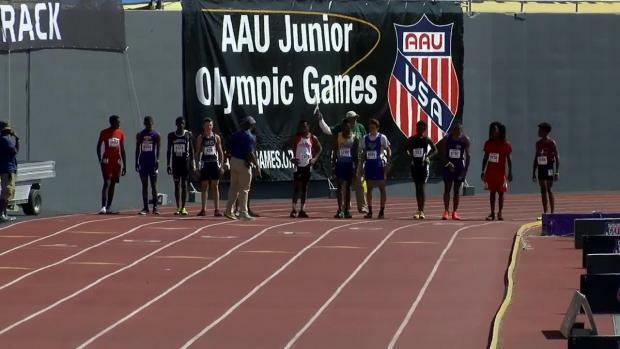 Find out what happened on Day 4 at the AAU Junior Olympic Games! 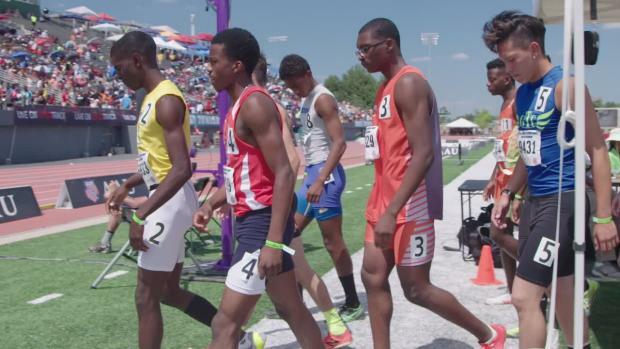 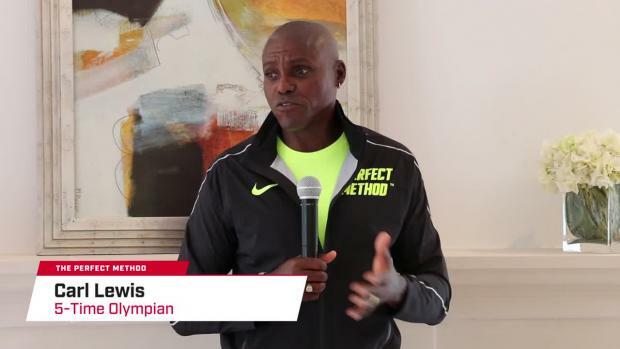 There are certain time barriers in track and field that distinguish the truly remarkable athletes, and serve as time-honored measuring sticks for progress. 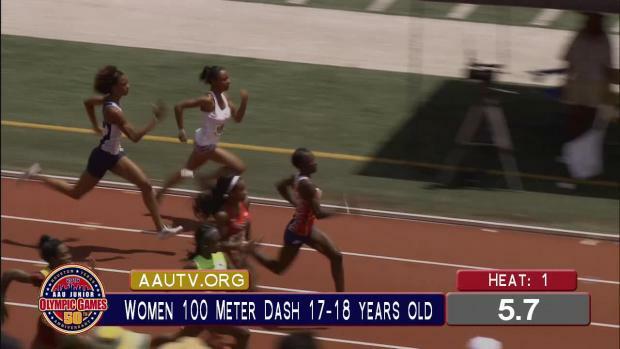 One of those is the 13-second barrier for a female 100m runner. 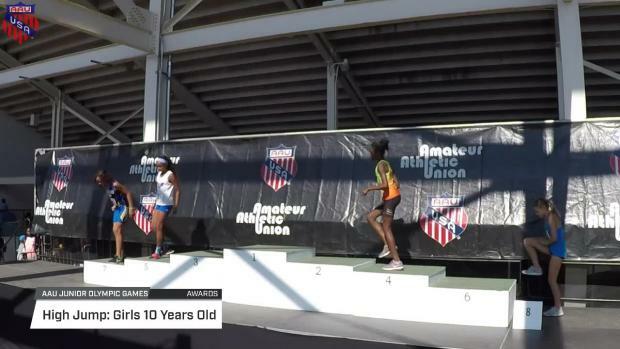 Sixteen years ago, Bijon Robinson of California set the AAU national championships 10-year-old girls record for 100m at 12.93, an especially outstanding time given her age. 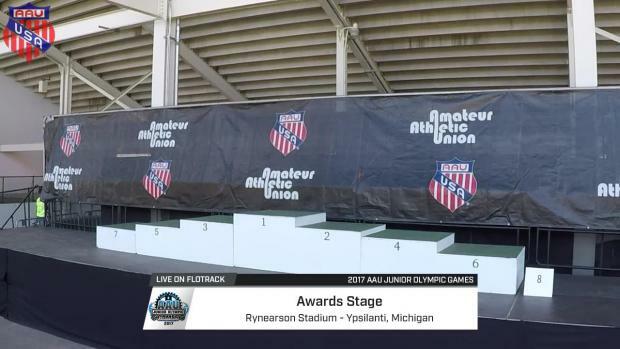 Not until today in Ypsilanti, Michigan, at the 2017 AAU Junior Olympic Games could someone crack the time. 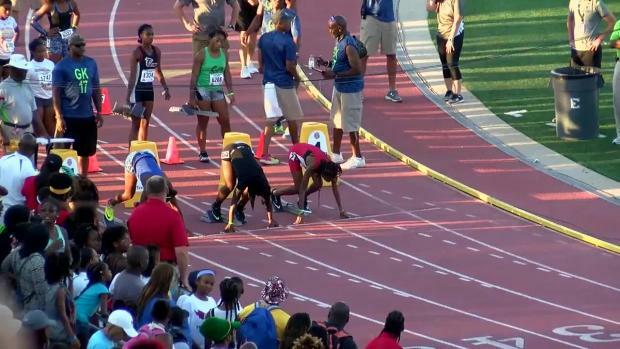 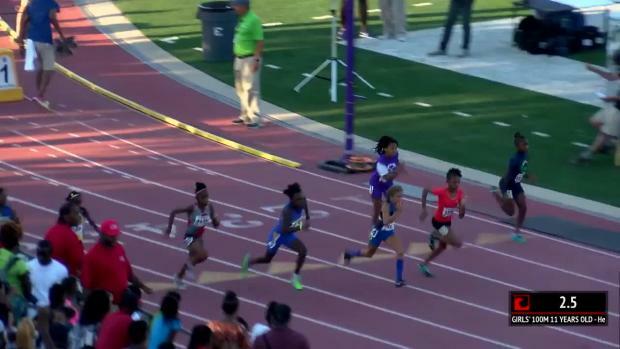 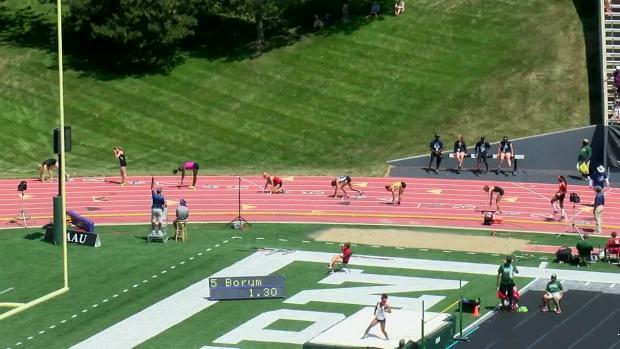 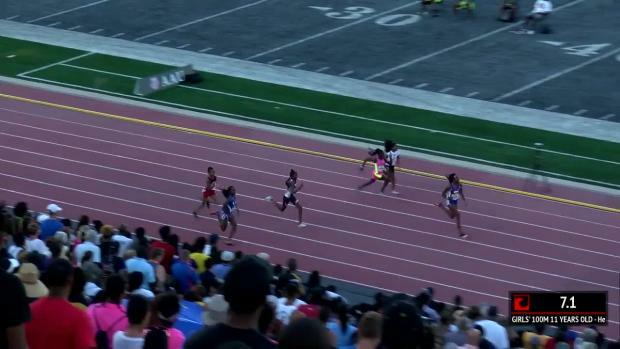 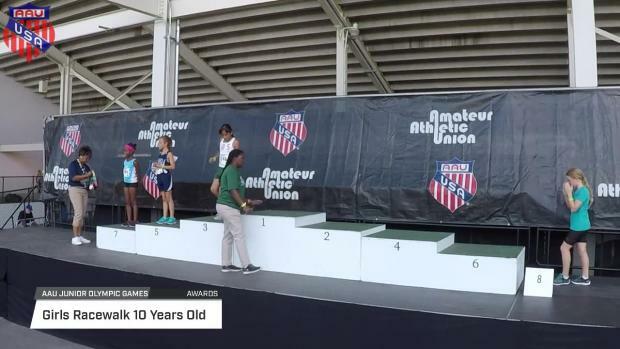 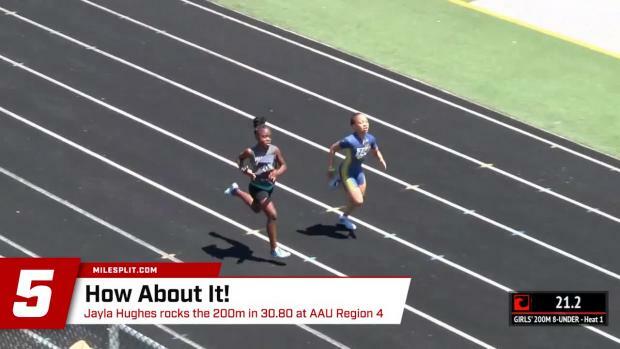 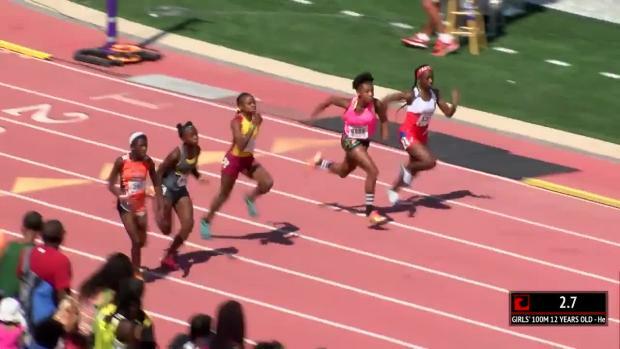 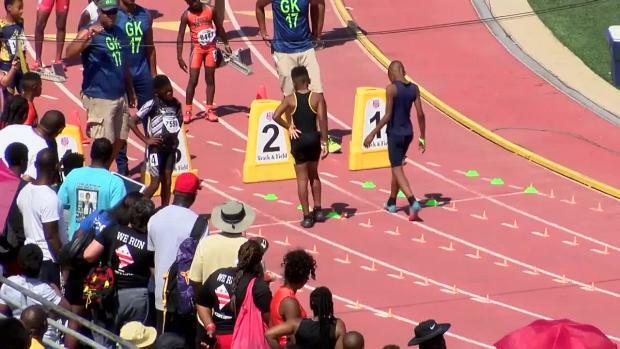 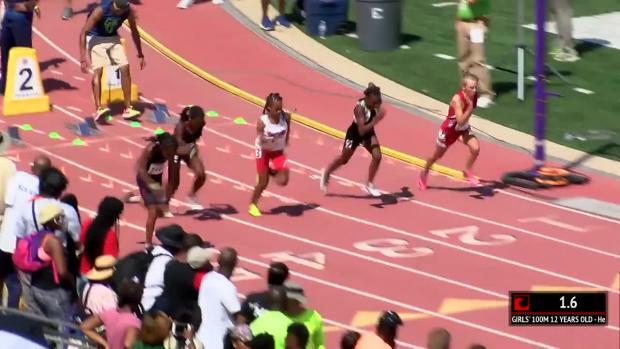 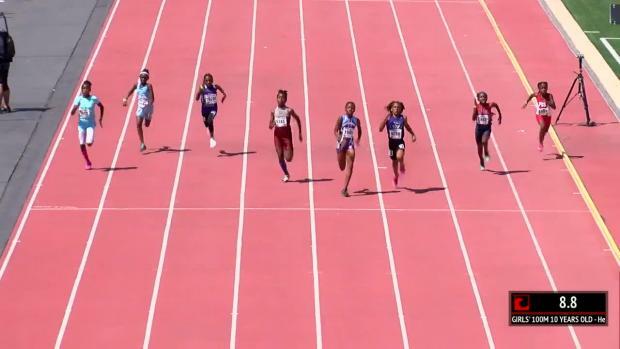 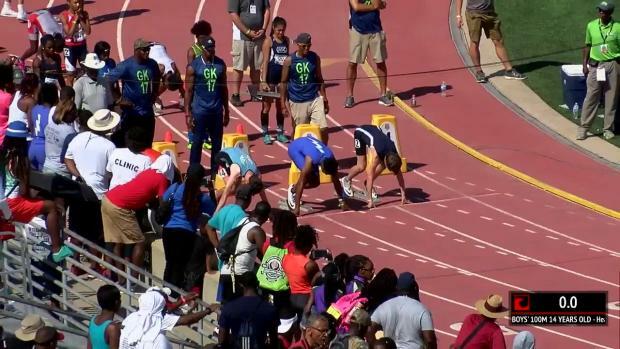 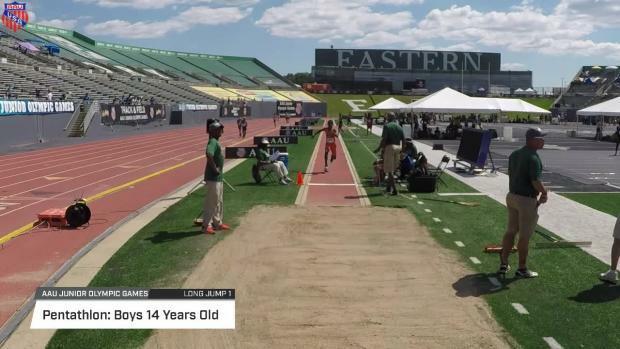 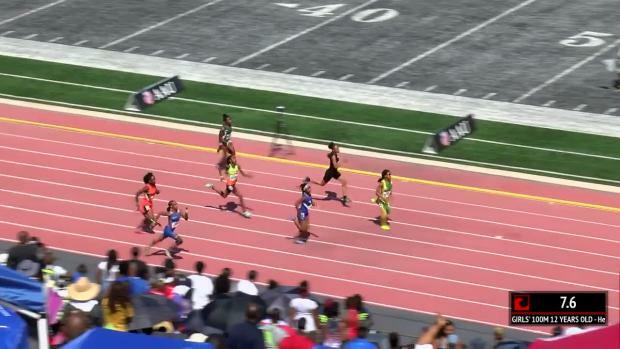 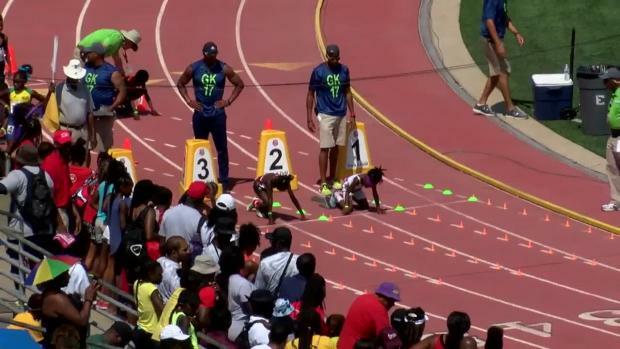 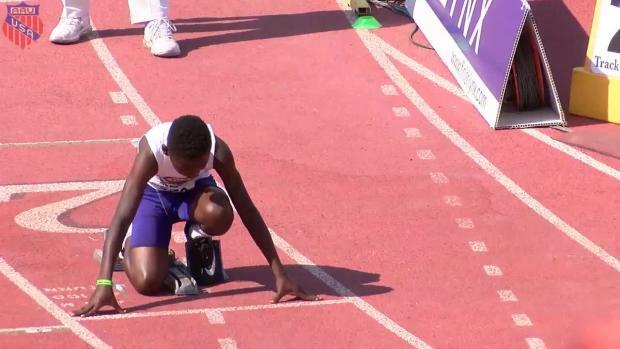 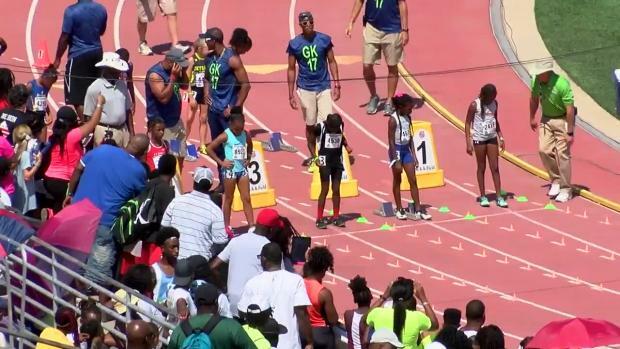 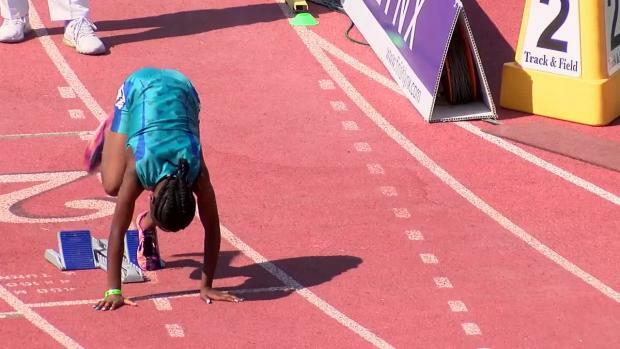 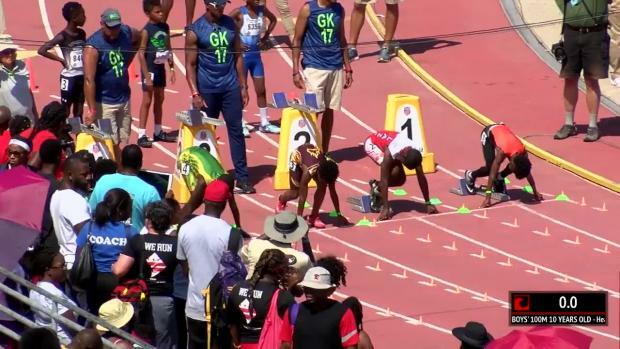 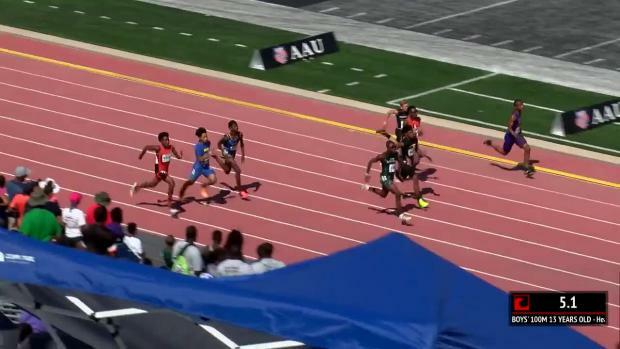 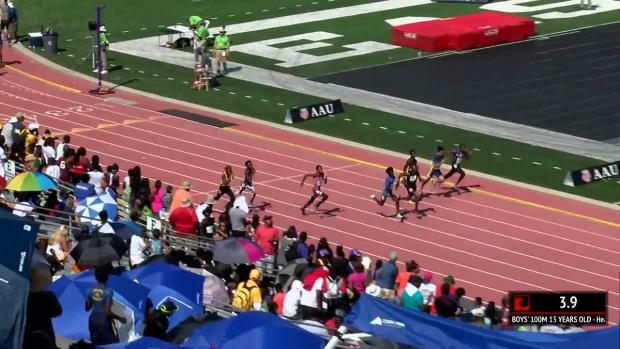 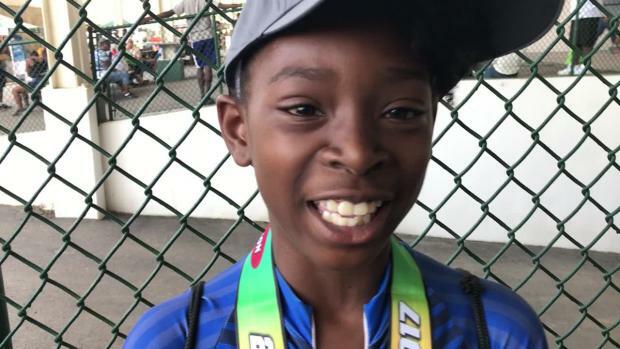 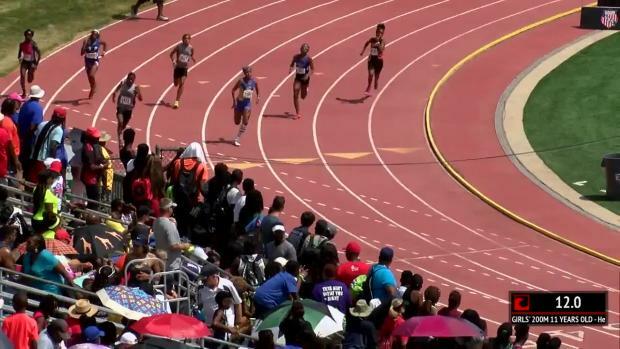 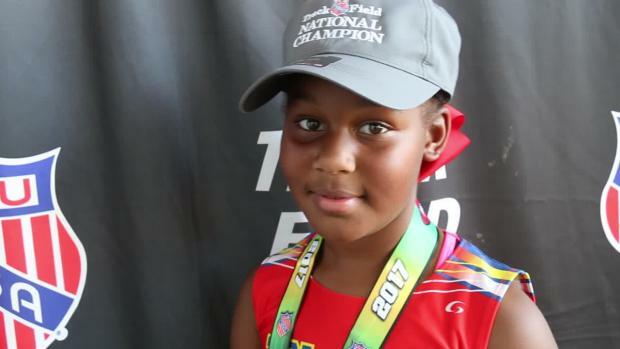 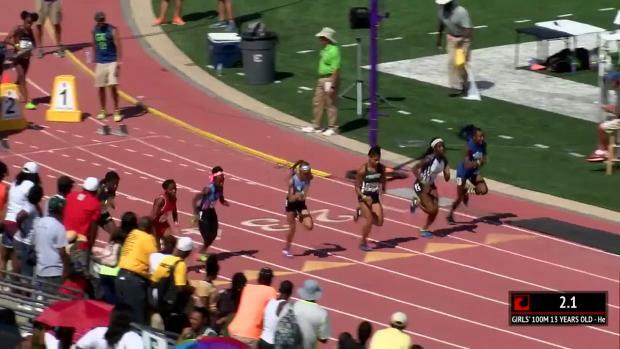 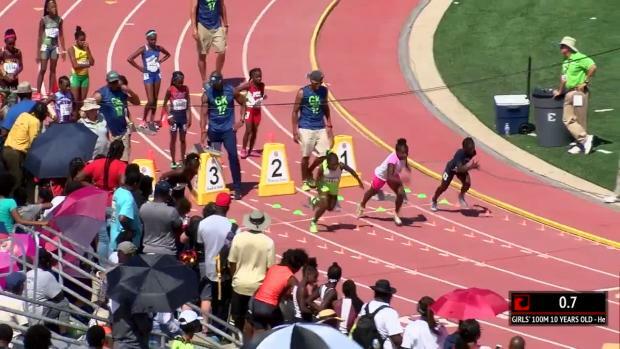 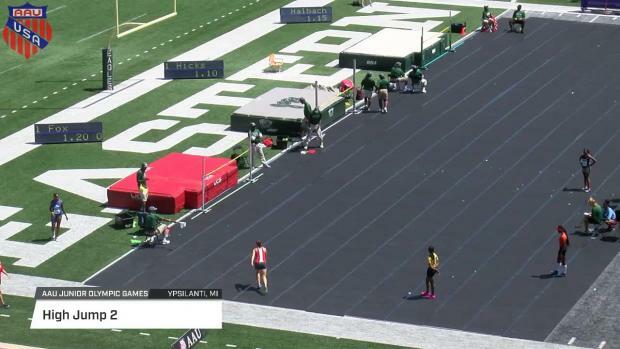 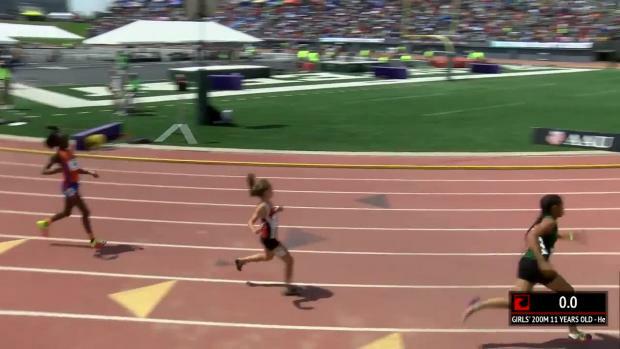 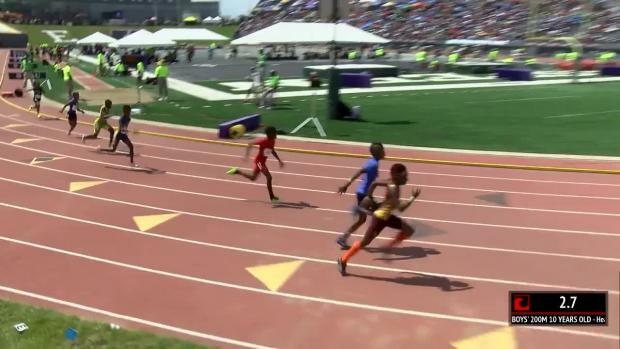 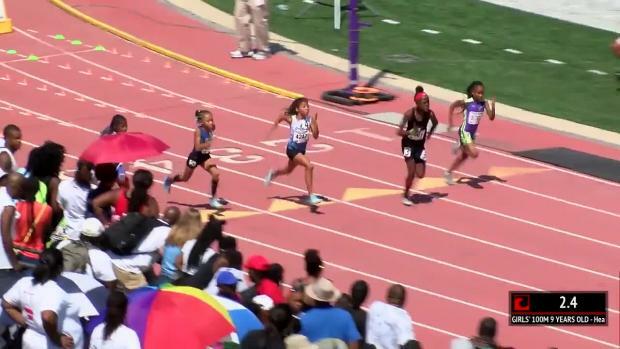 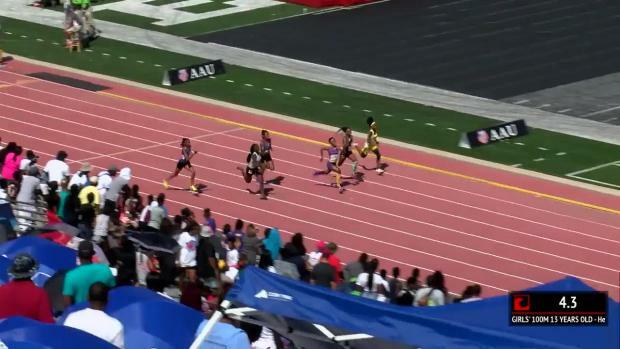 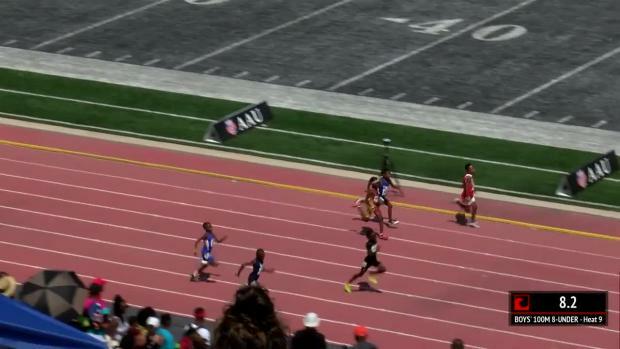 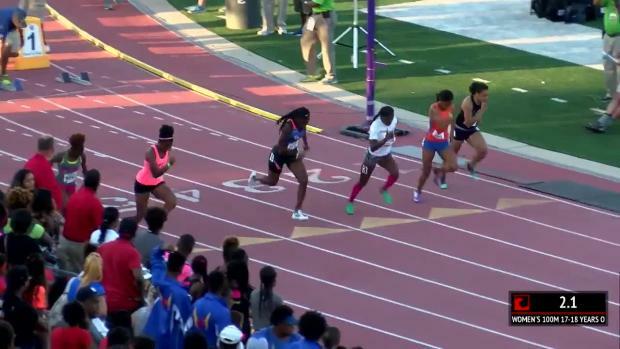 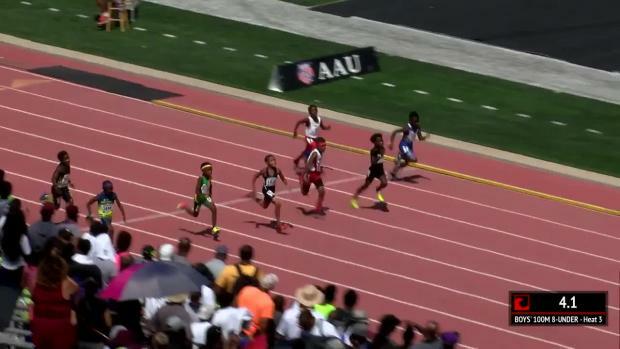 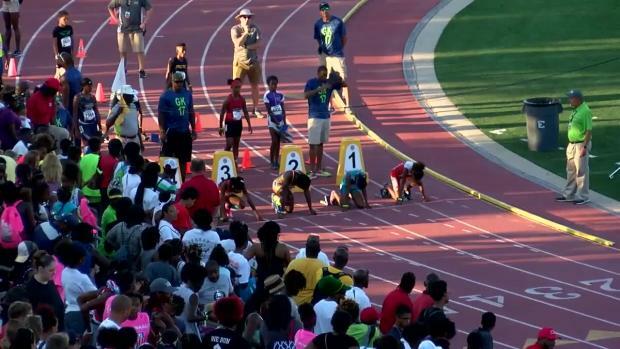 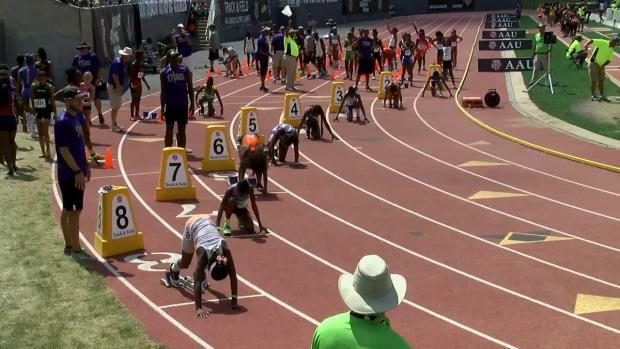 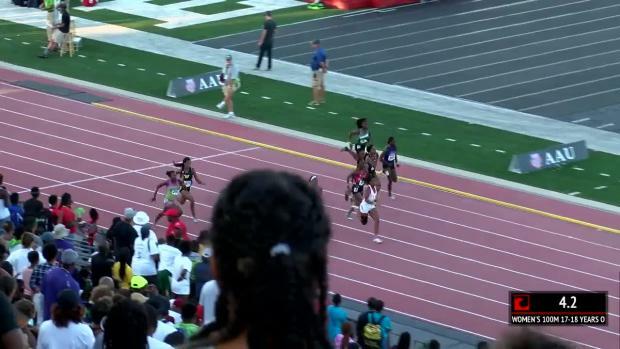 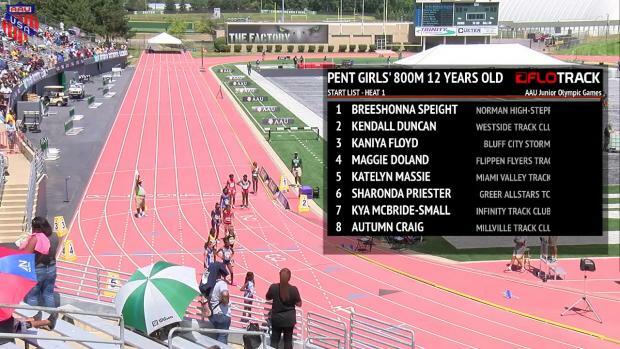 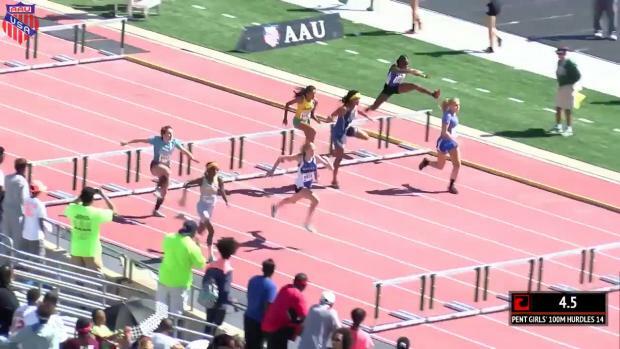 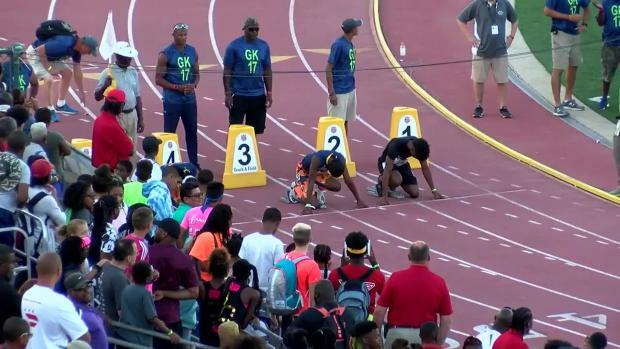 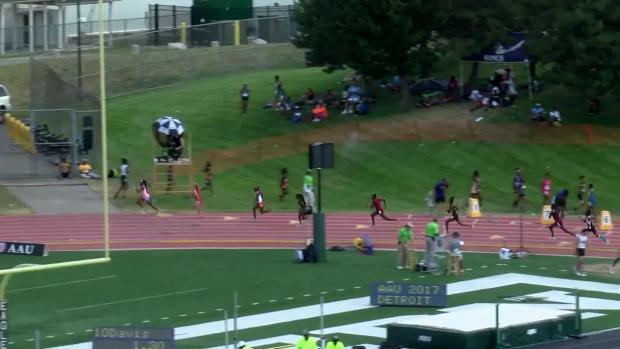 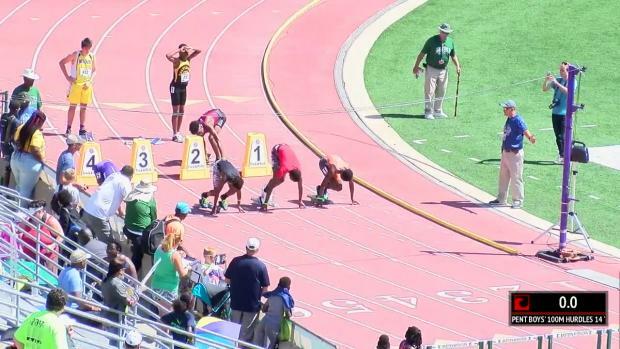 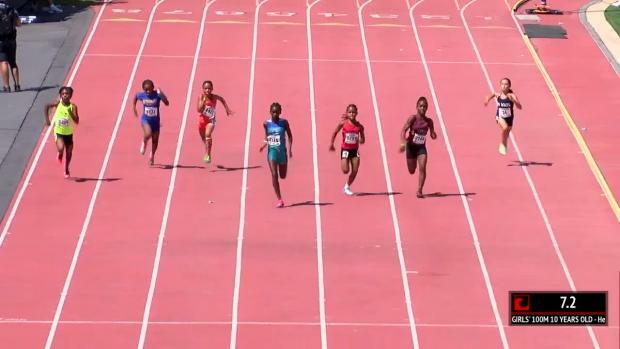 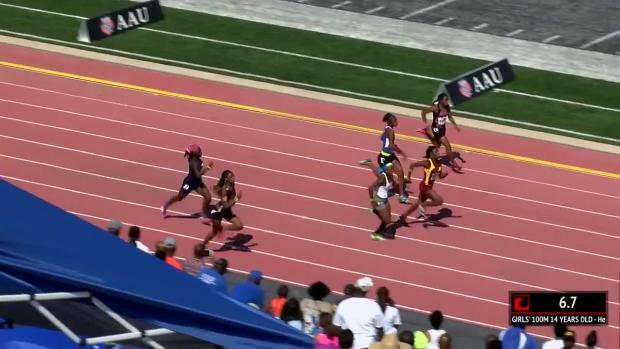 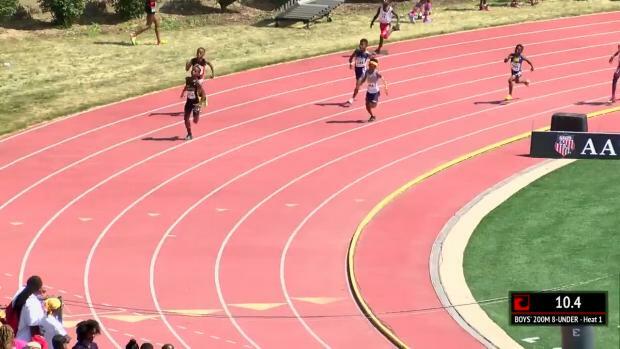 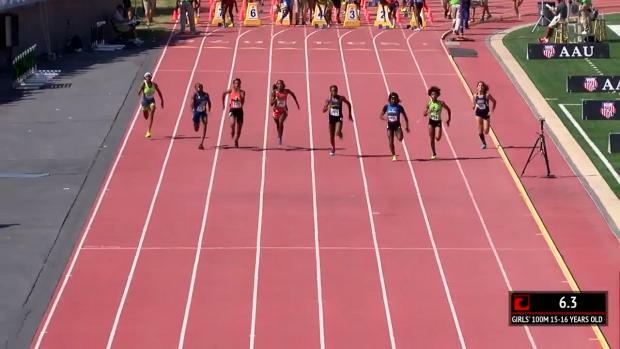 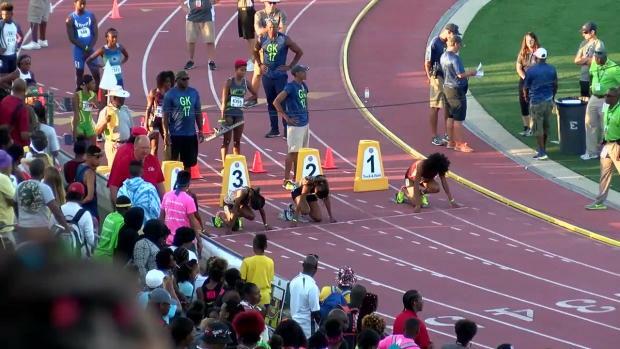 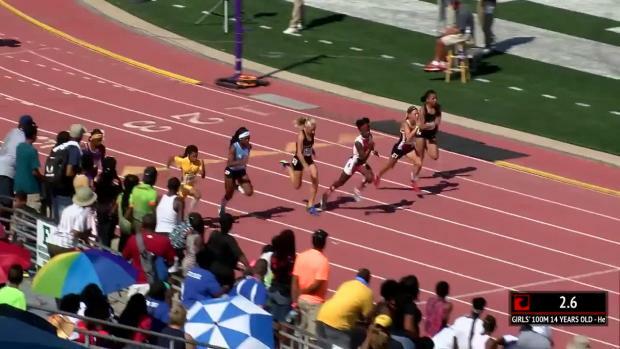 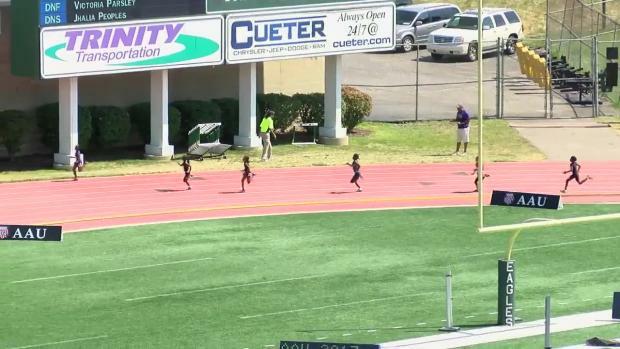 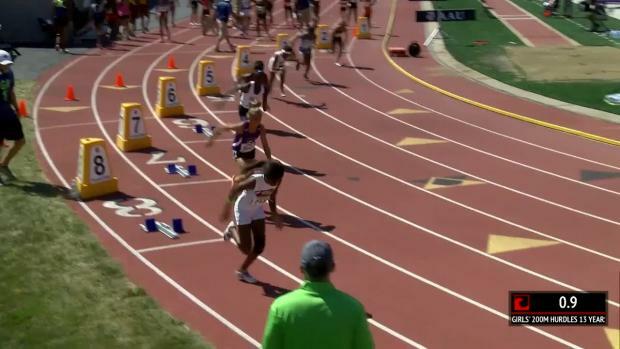 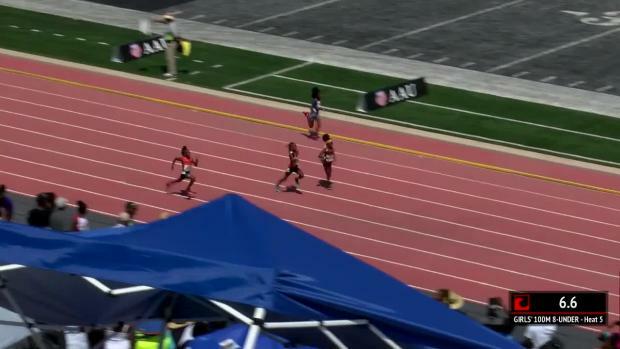 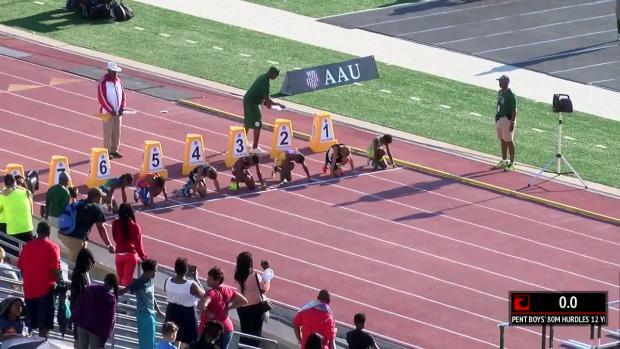 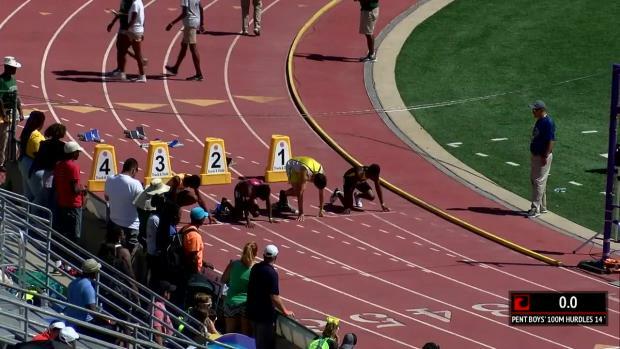 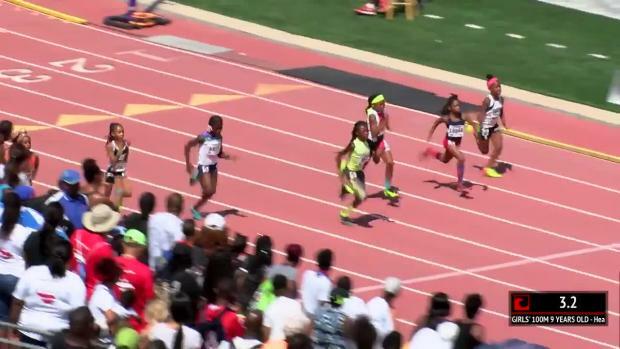 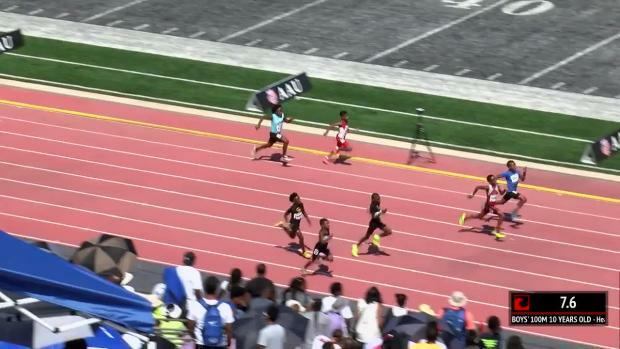 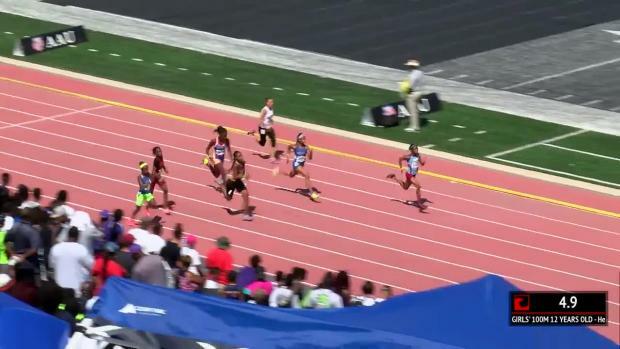 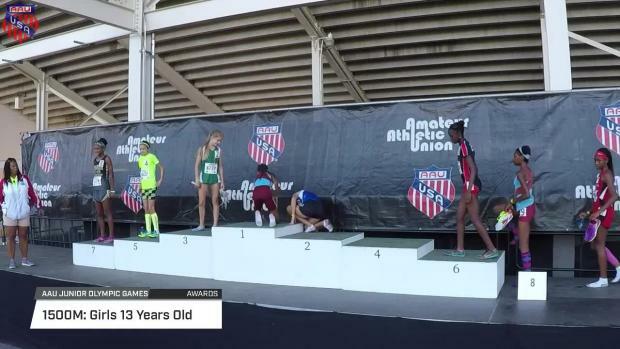 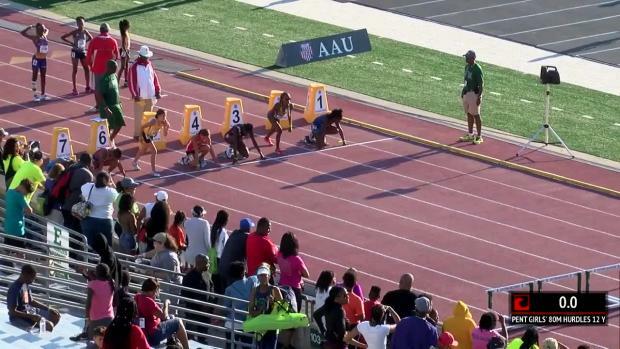 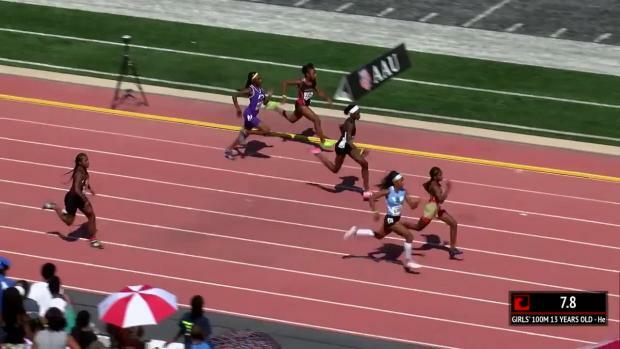 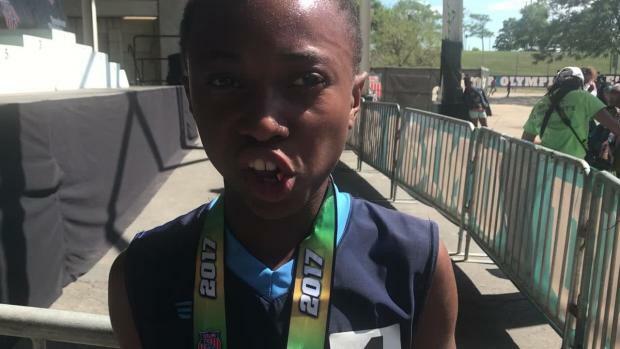 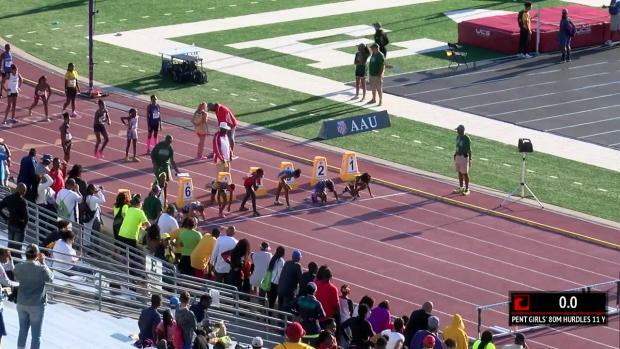 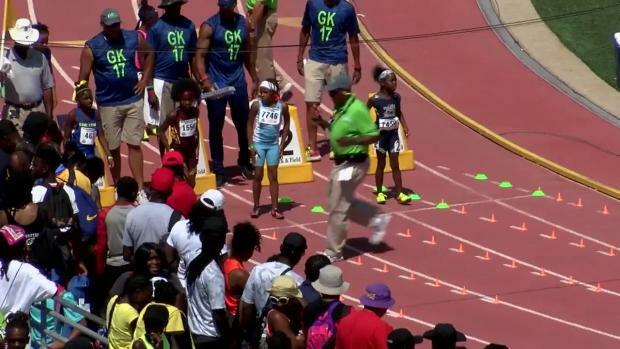 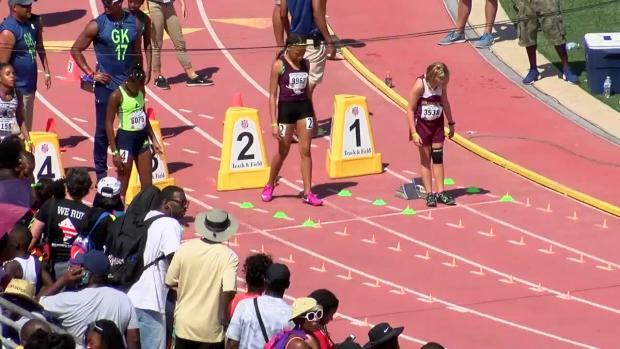 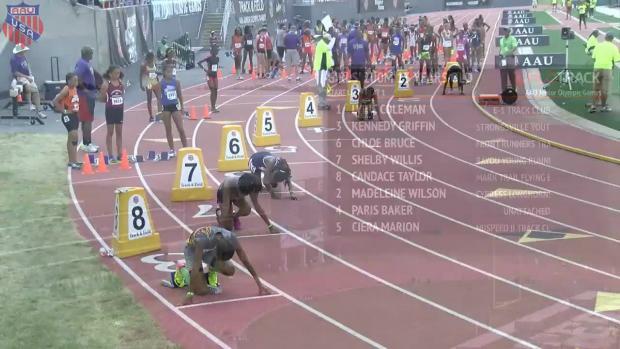 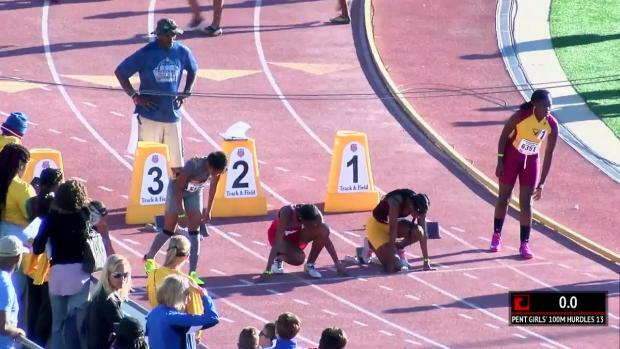 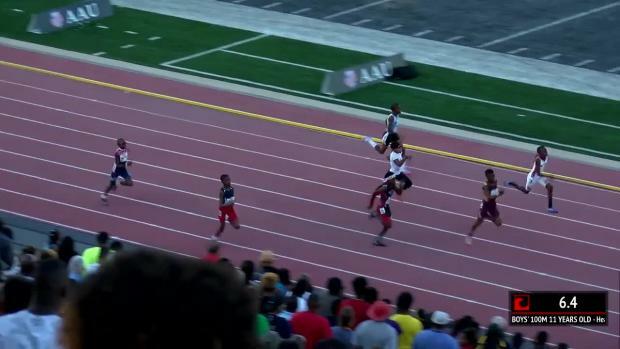 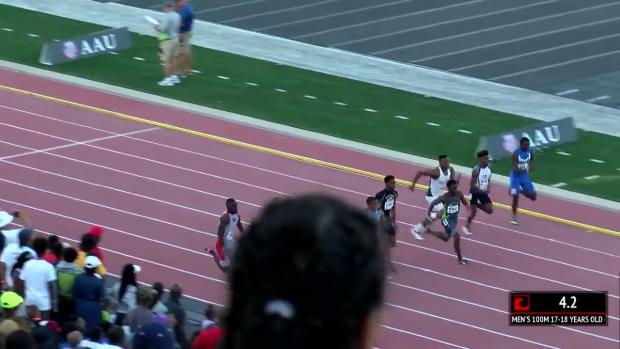 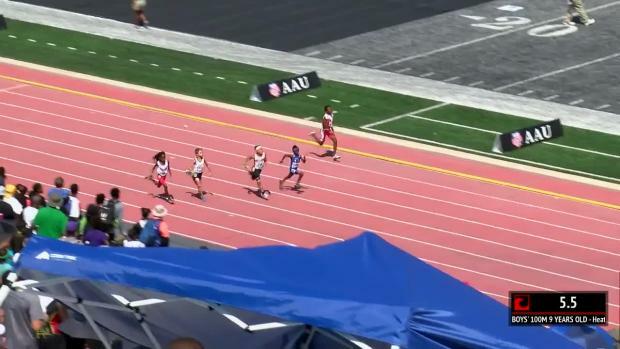 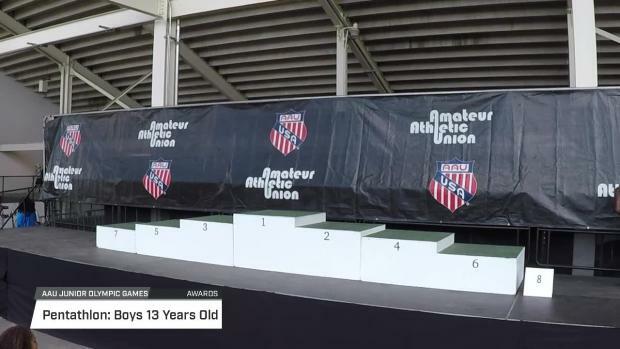 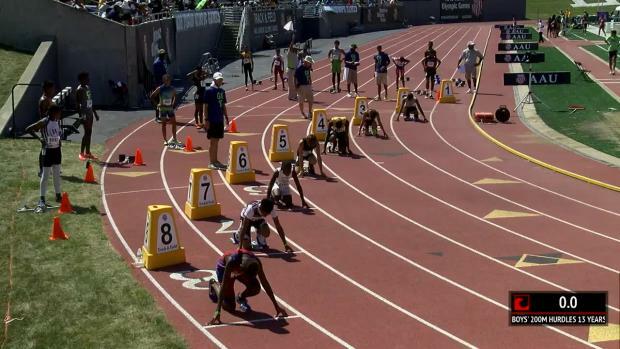 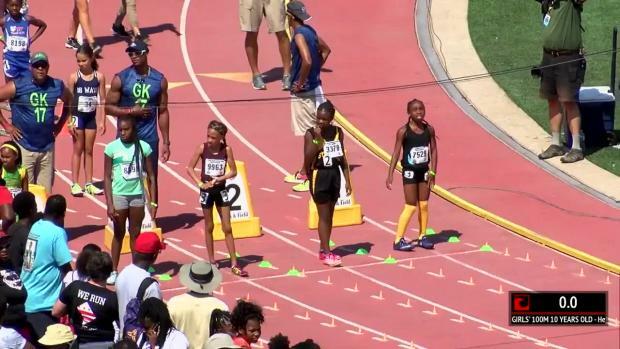 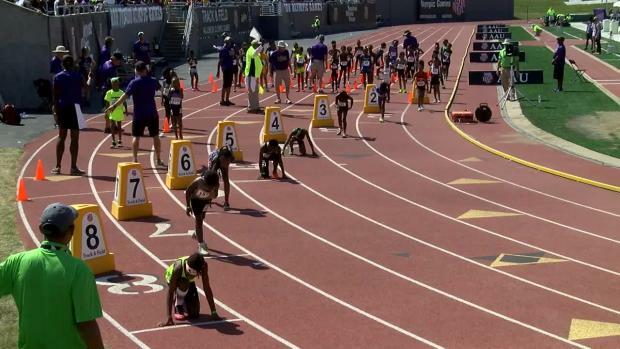 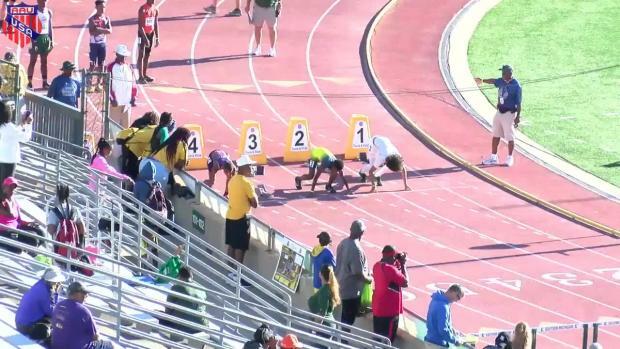 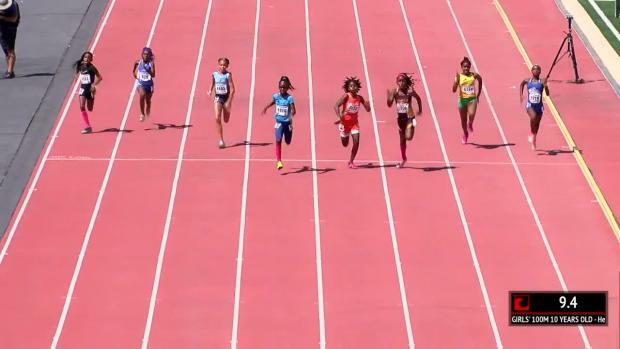 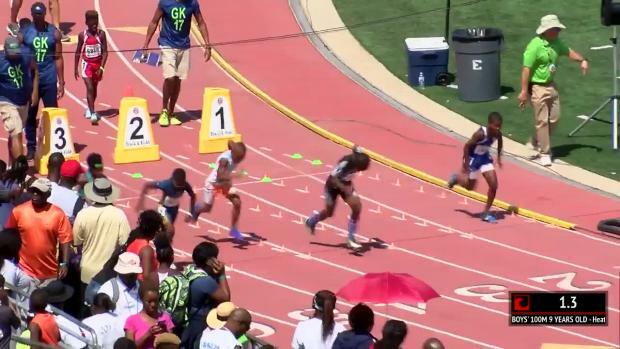 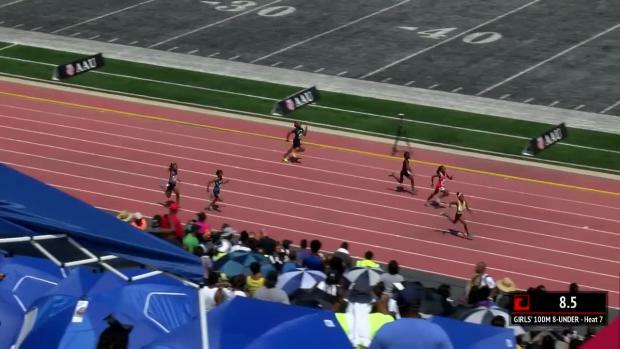 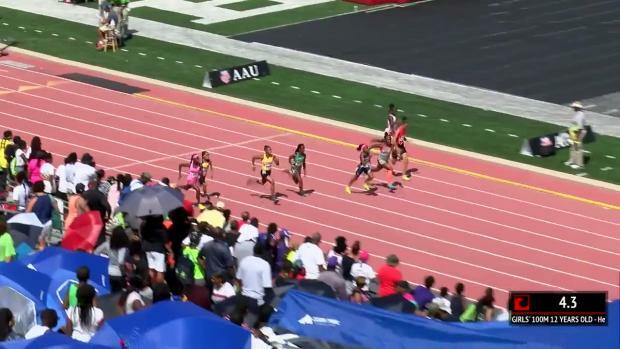 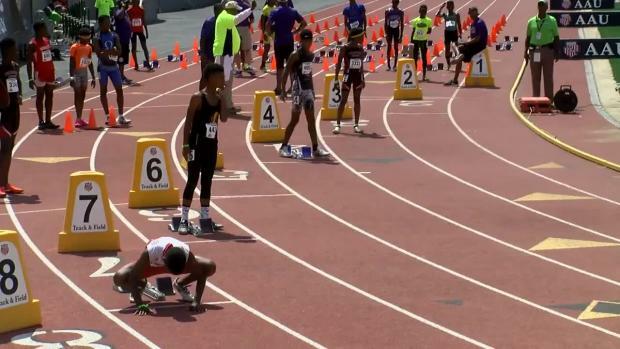 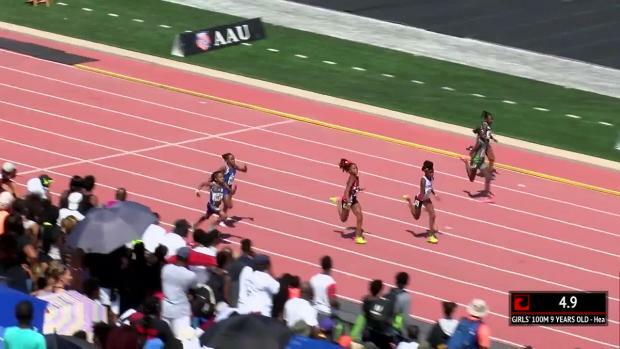 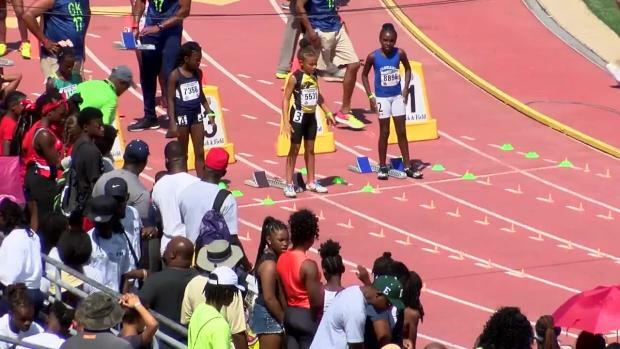 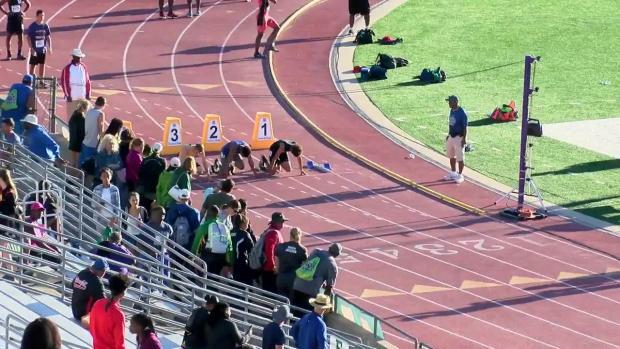 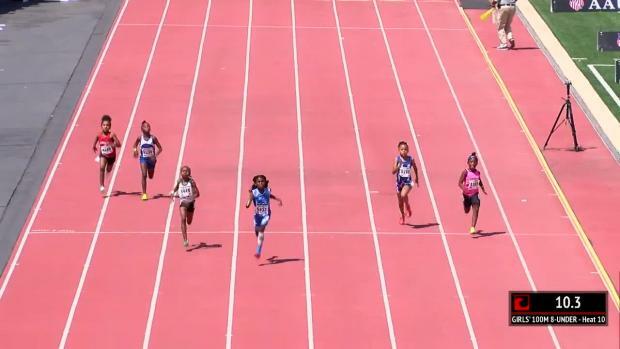 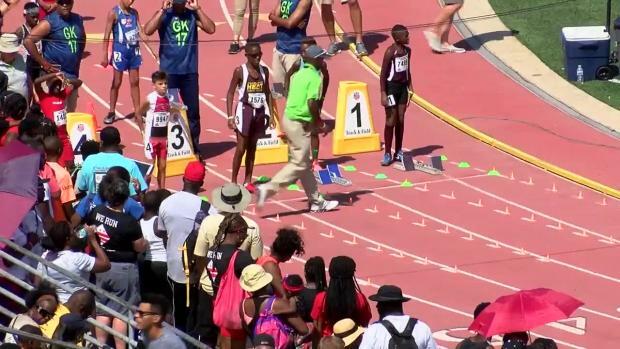 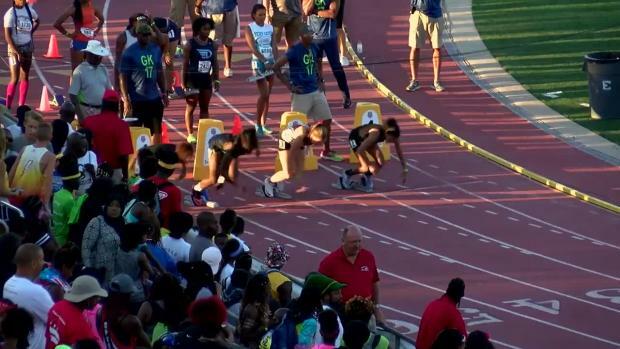 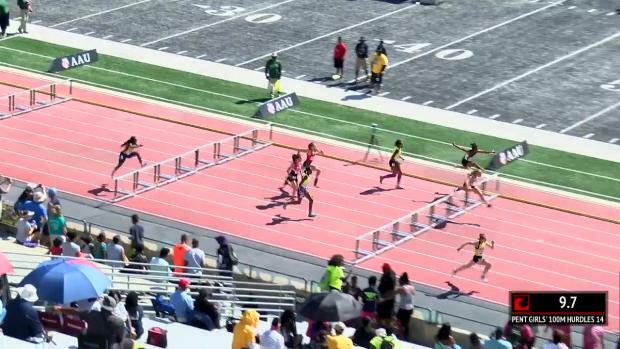 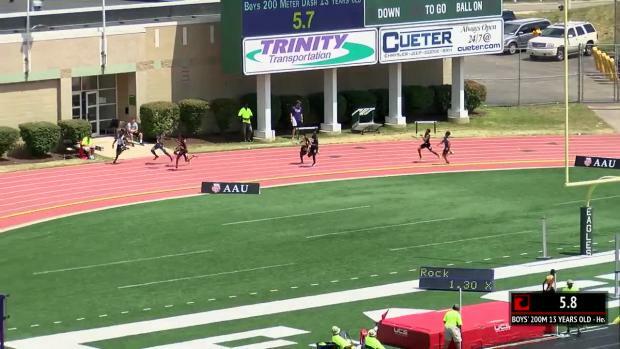 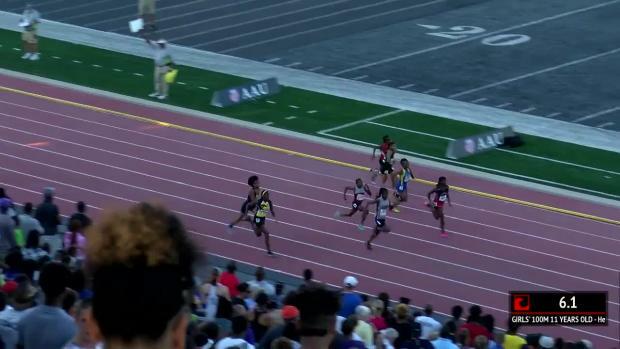 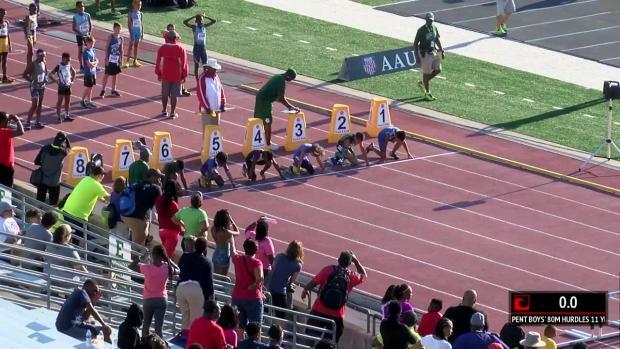 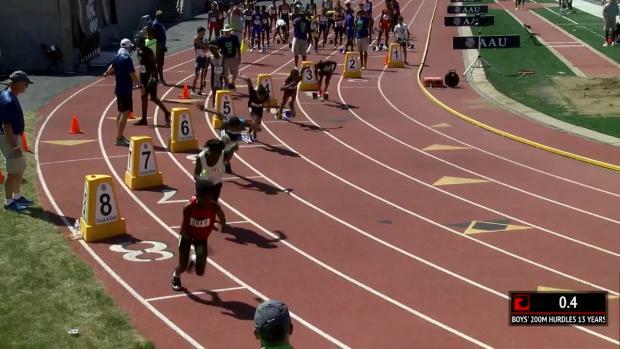 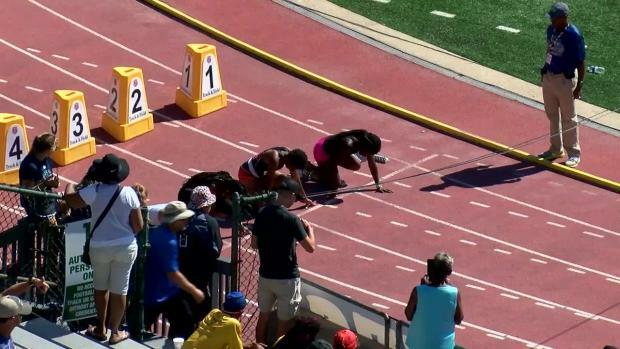 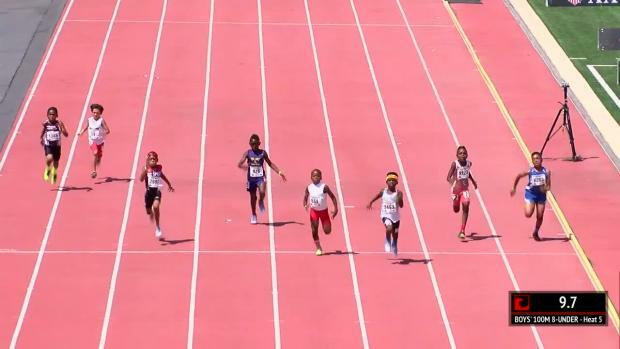 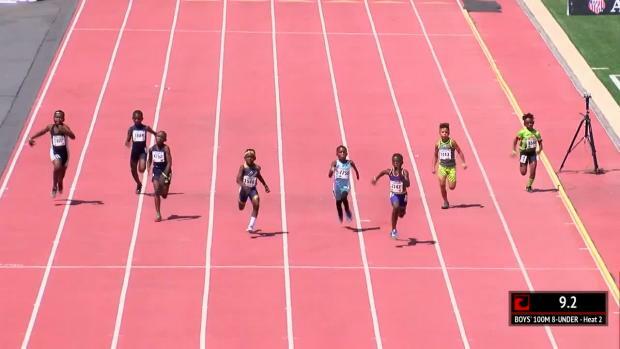 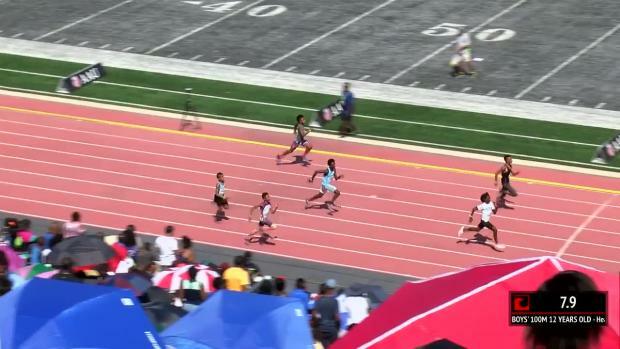 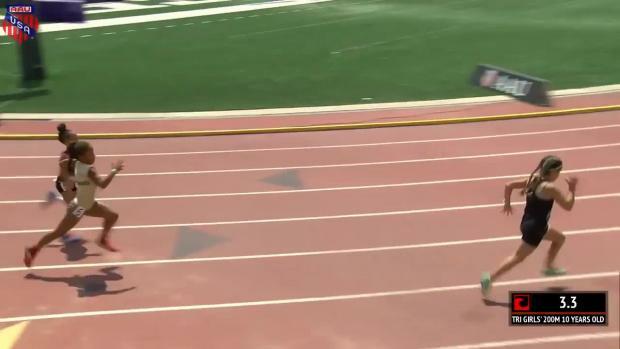 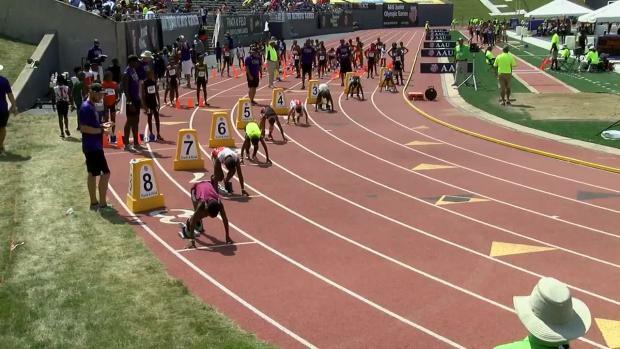 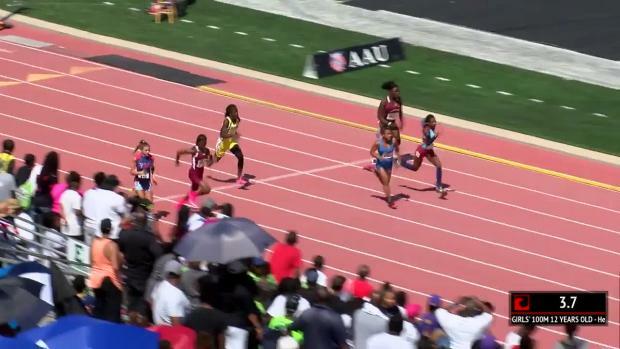 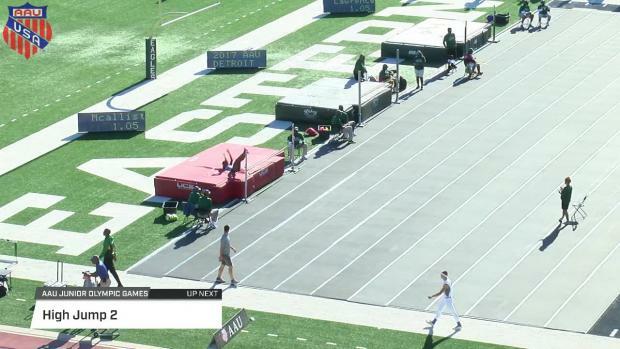 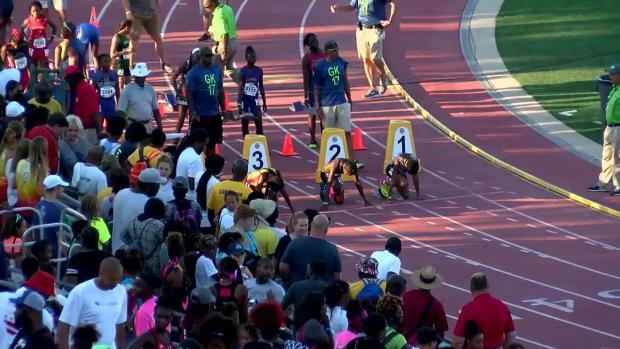 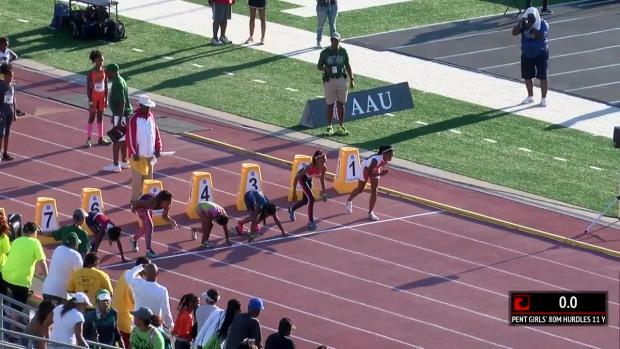 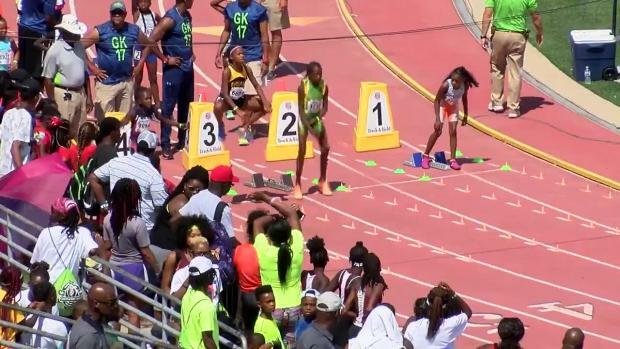 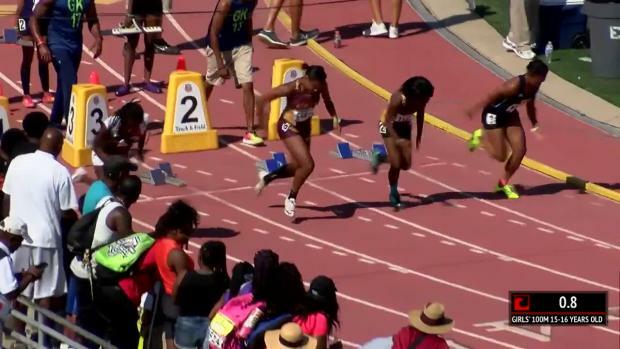 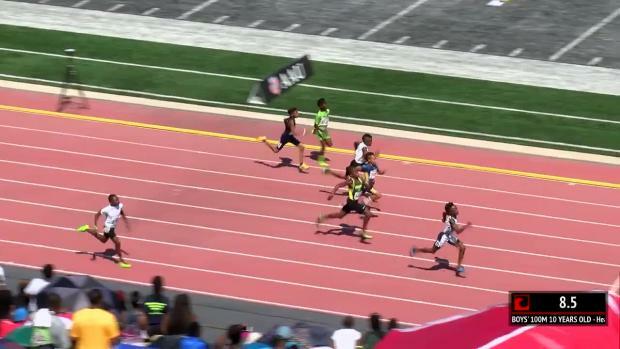 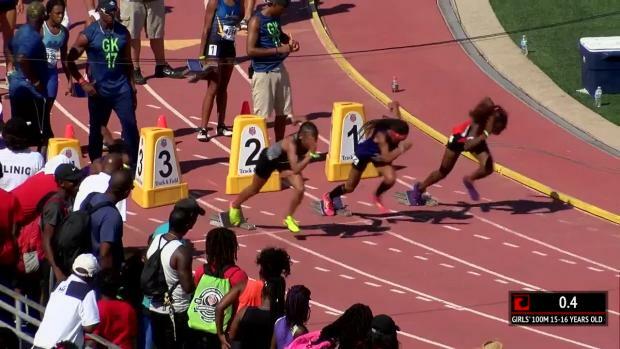 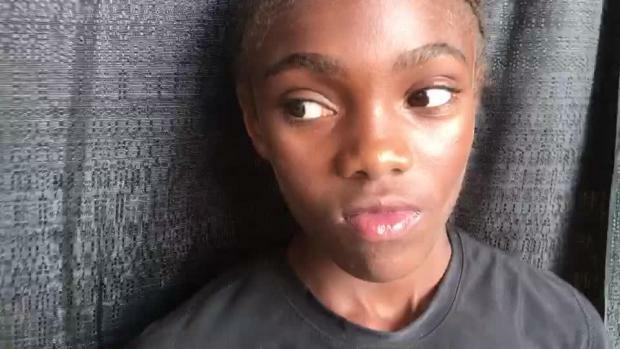 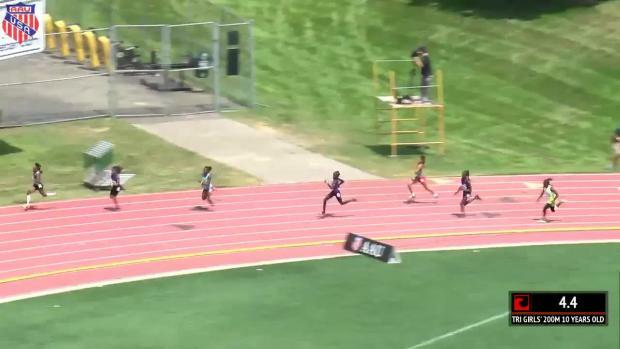 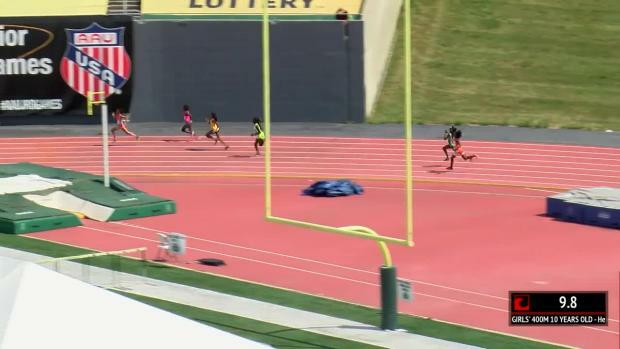 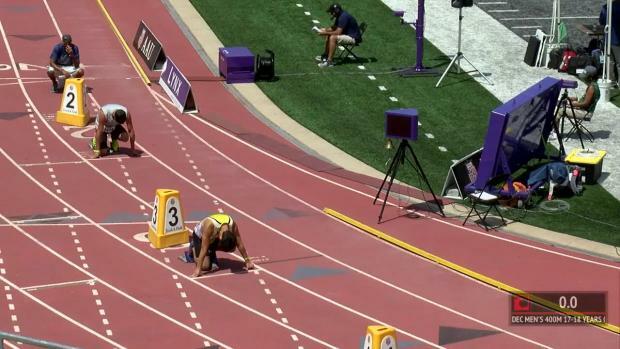 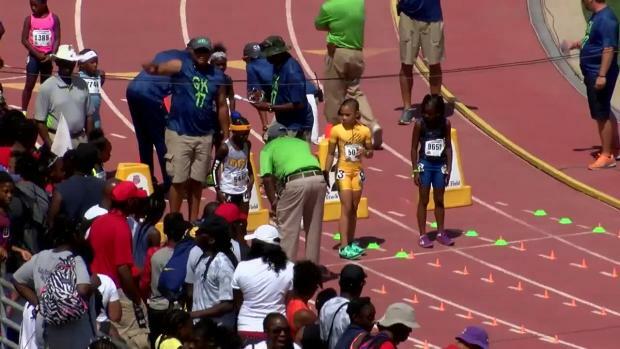 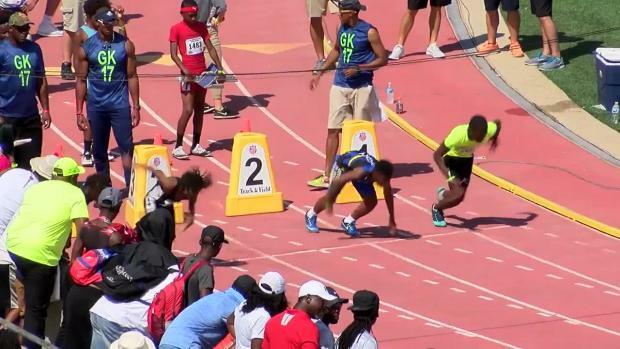 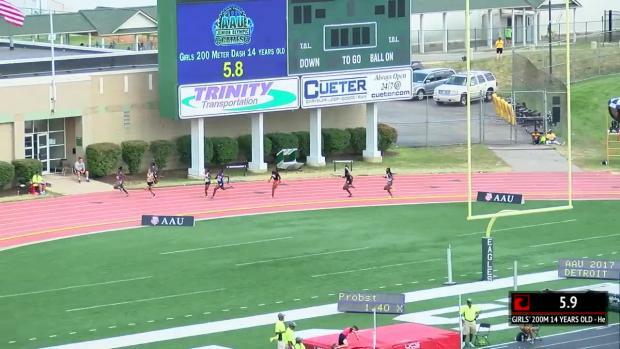 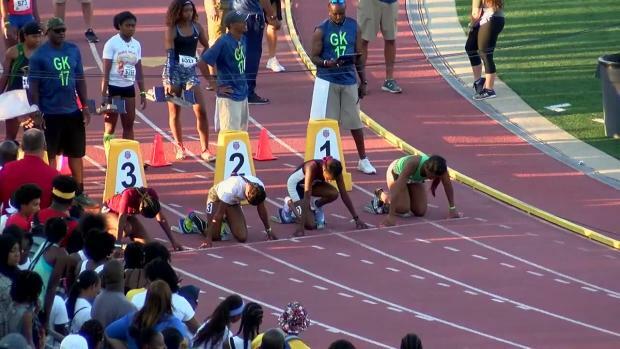 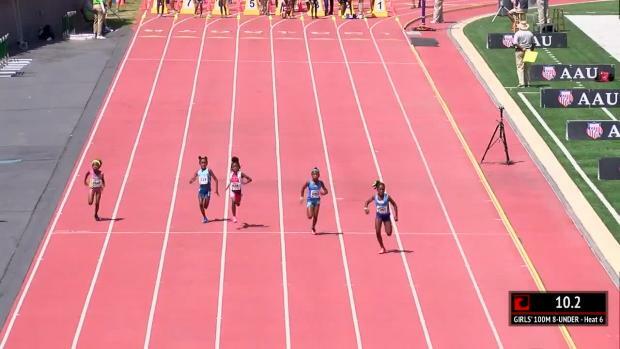 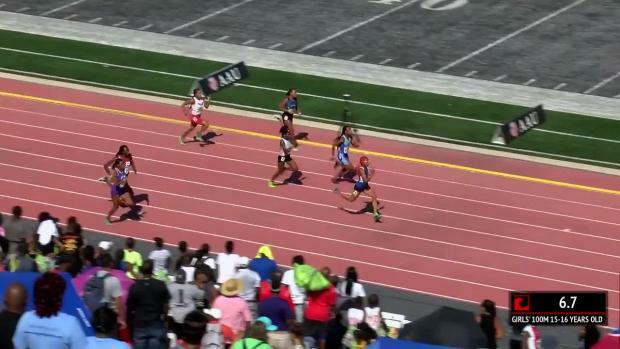 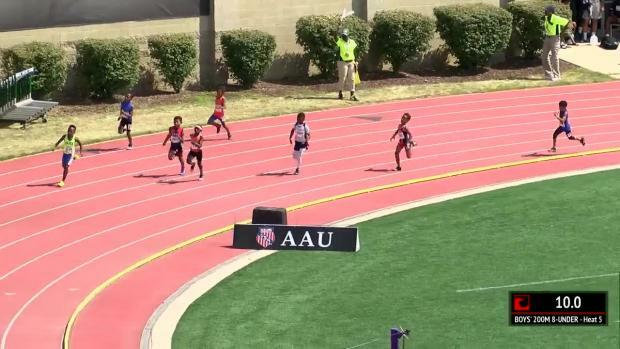 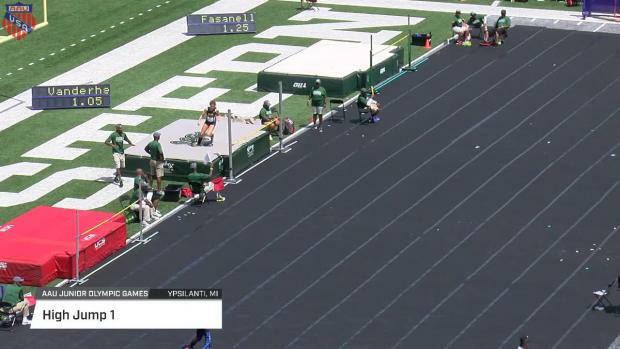 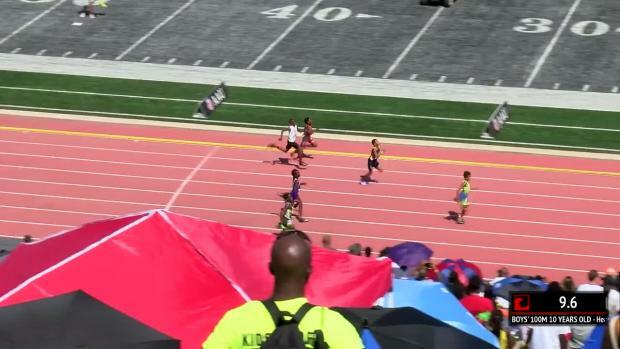 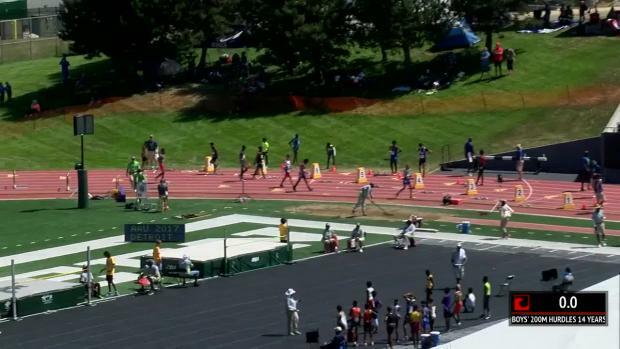 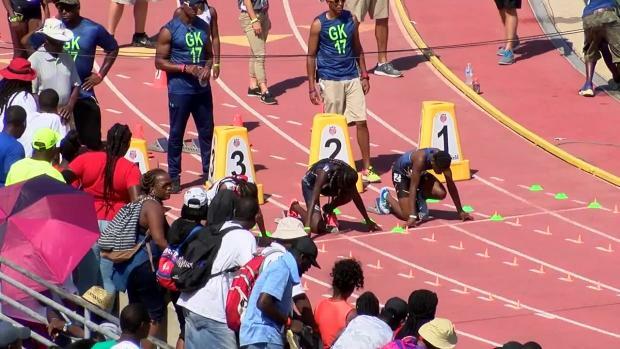 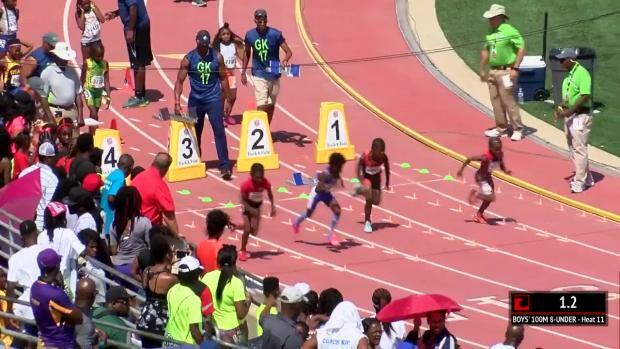 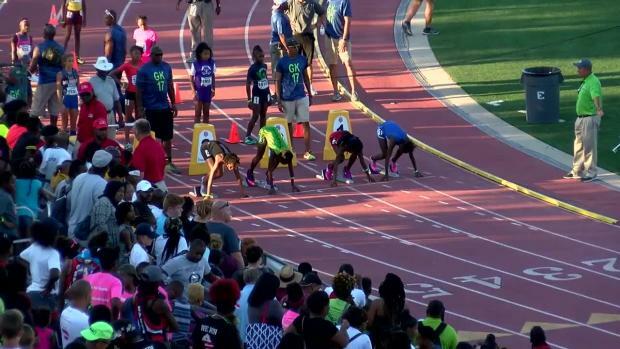 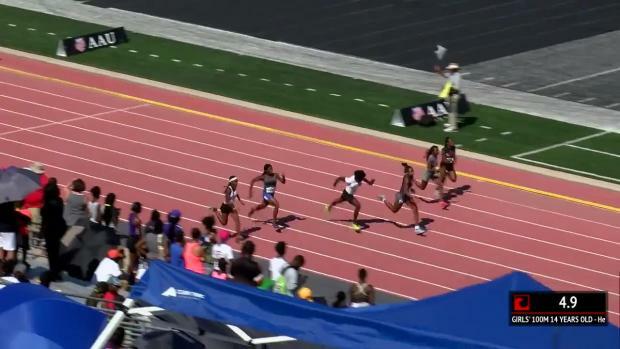 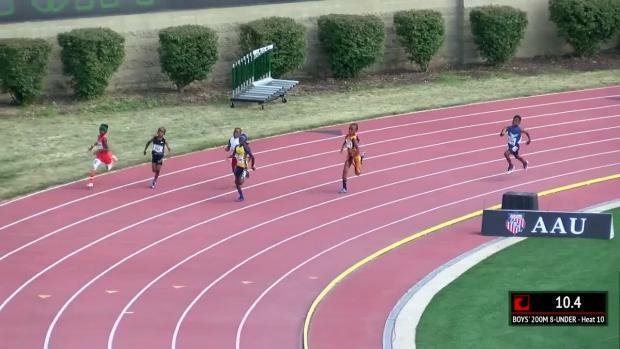 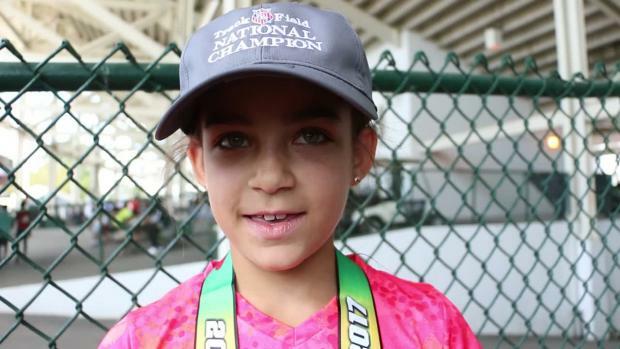 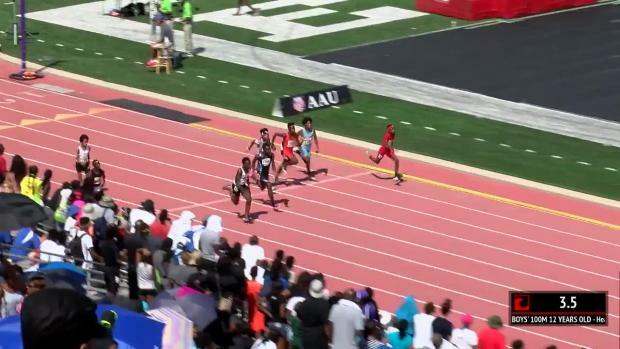 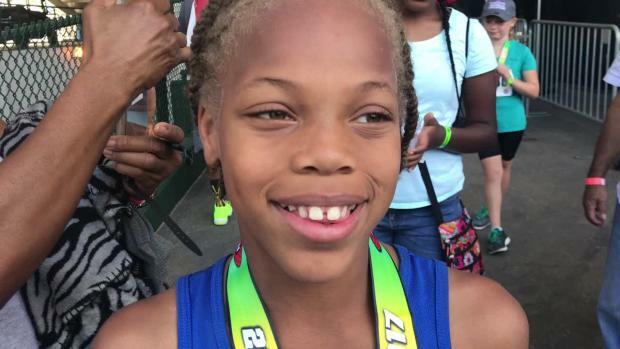 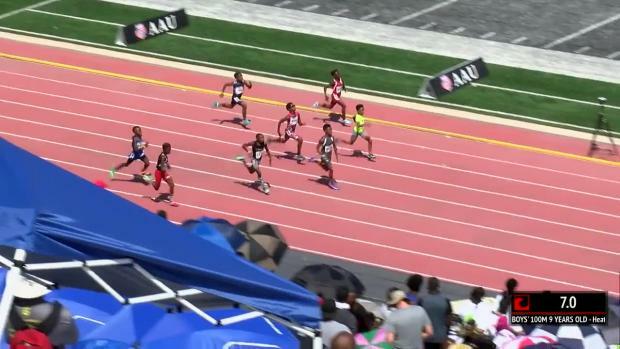 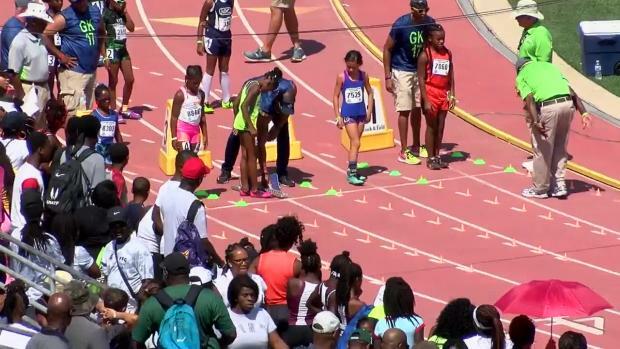 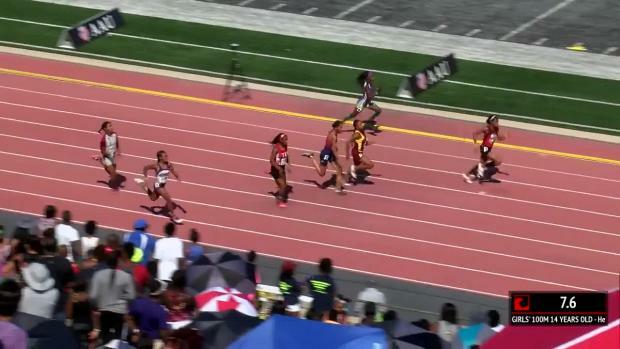 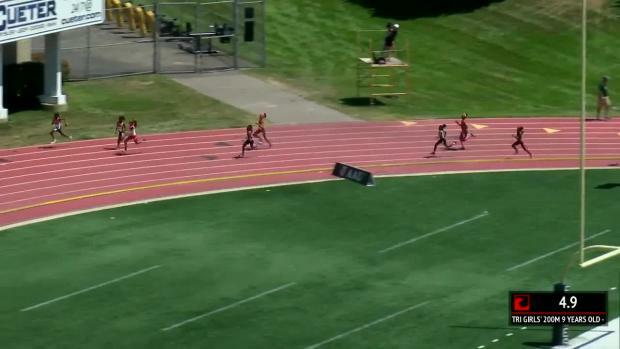 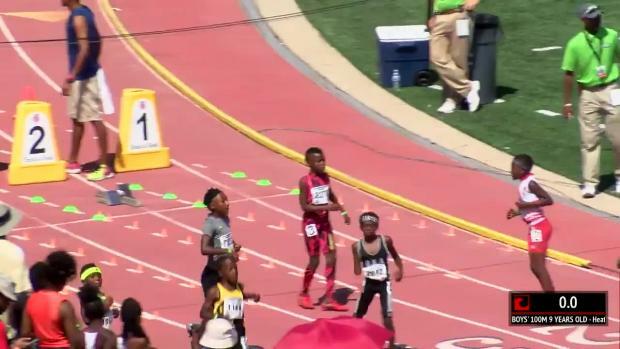 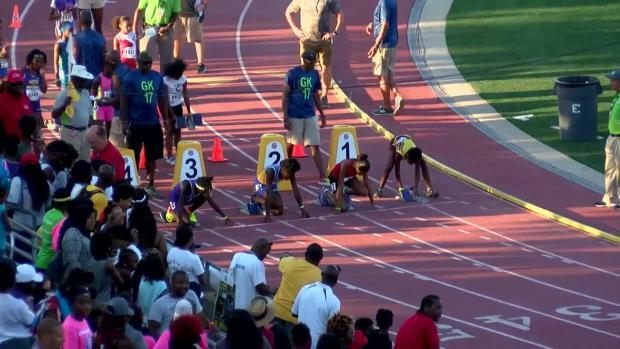 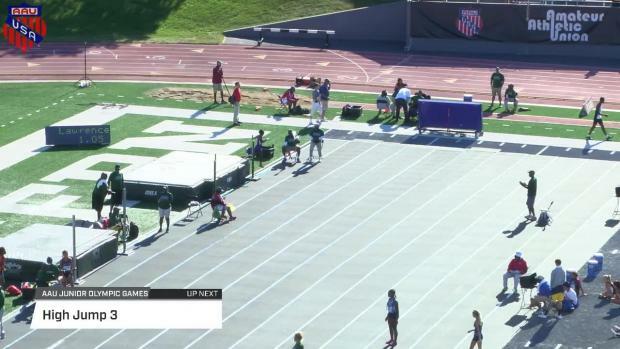 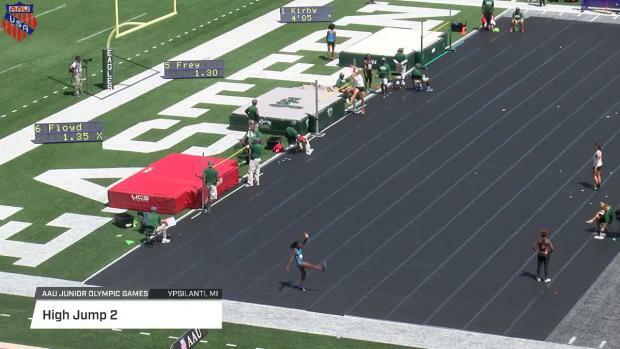 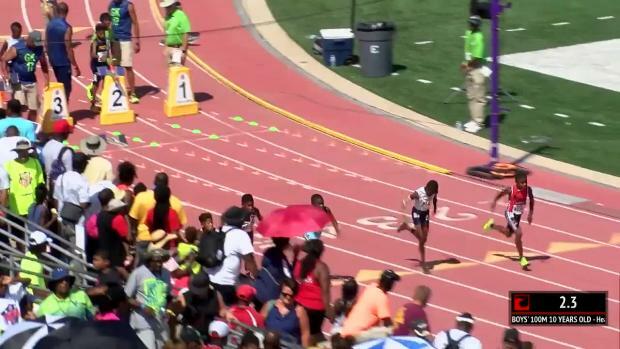 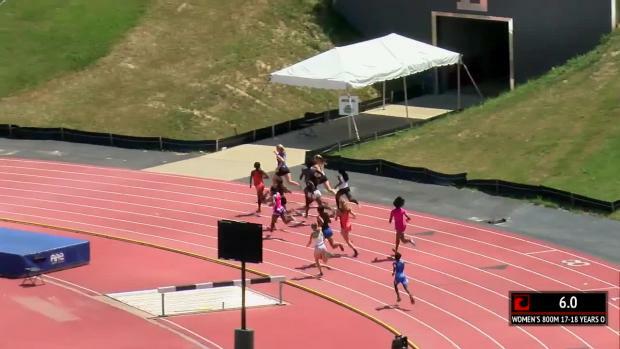 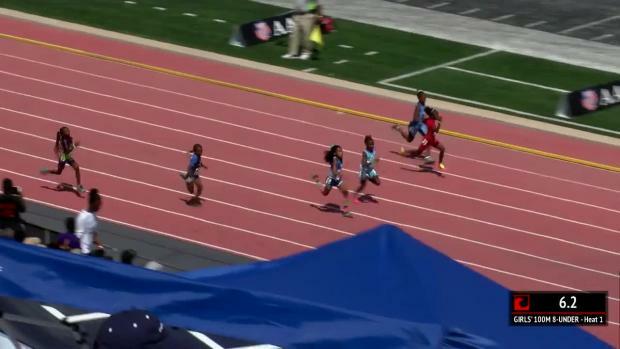 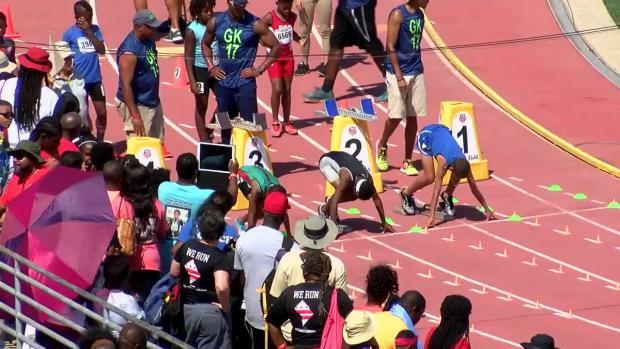 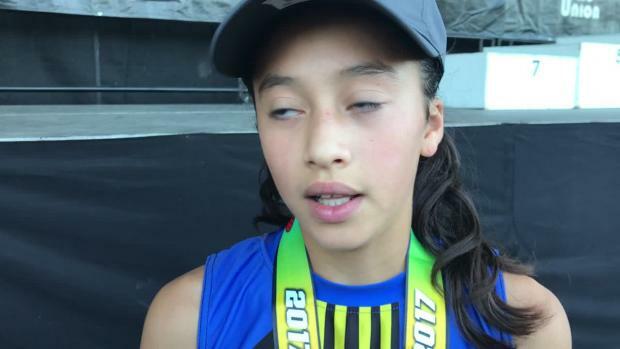 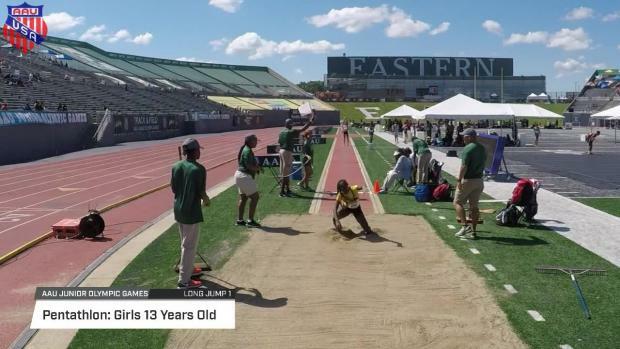 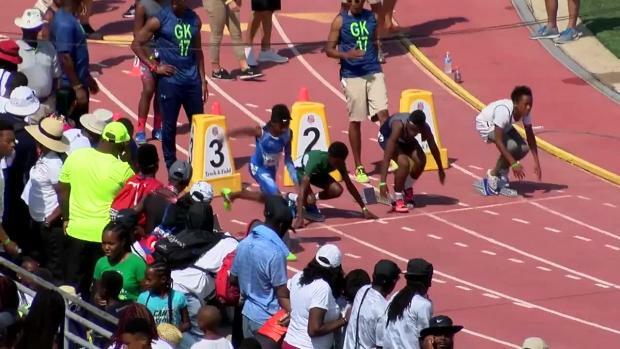 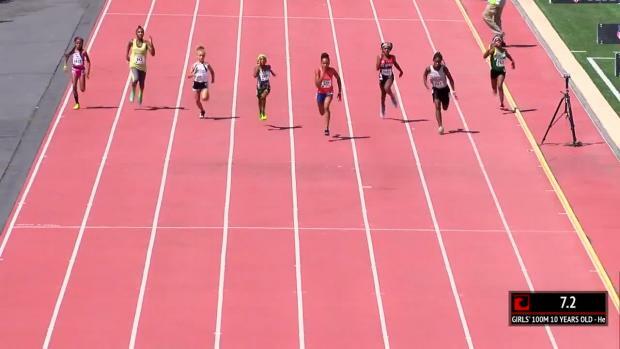 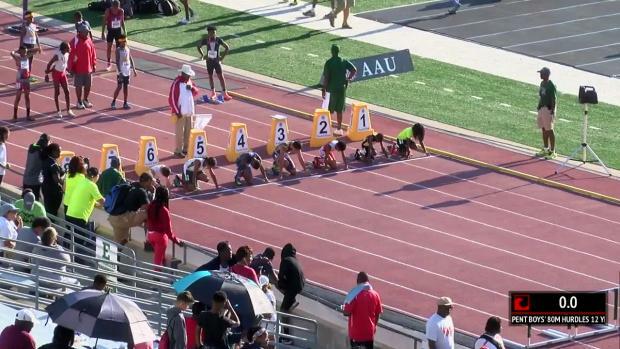 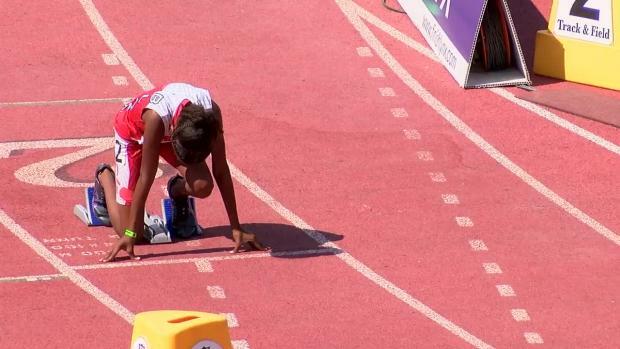 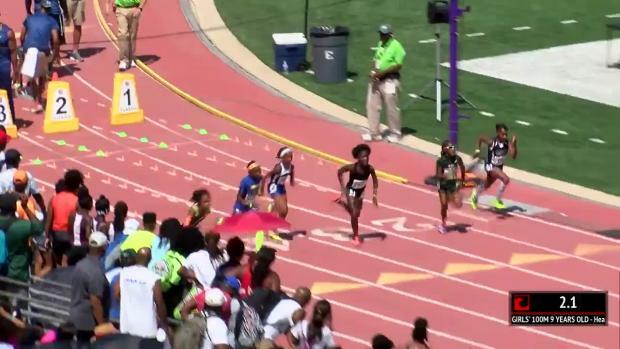 But Sabree Brooks of Indiana didn't just crack it -- she demolished it, clocking 12.76 to set a new standard for 10-year-old girls in track and field's shortest sprint.SaBree Brooks just broke the AAU National Record for the 10-year-old girls running 12.76!! 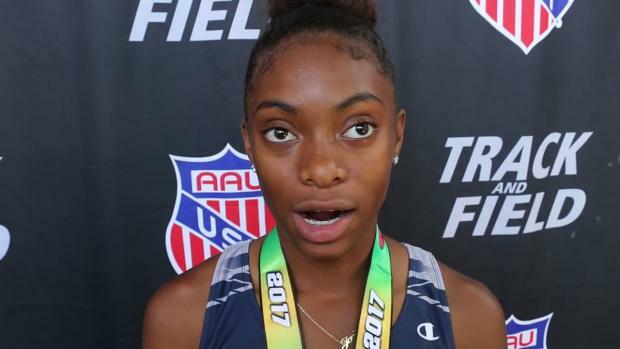 #AAUJROGames pic.twitter.com/hLgXGeJLA6— MileSplit US (@milesplit) July 31, 2017 "I ran my race and I kept my pace," she said after the prelim win. 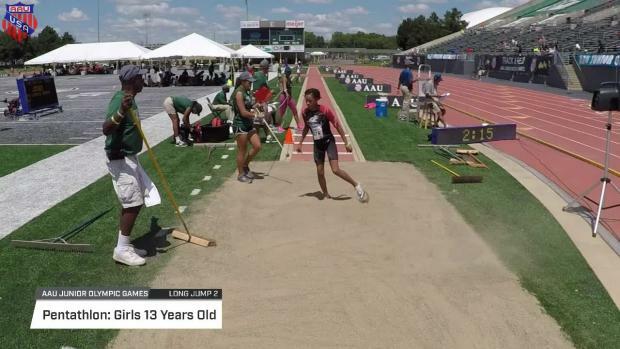 "I did drive phase for 15 meters and then put my head up. 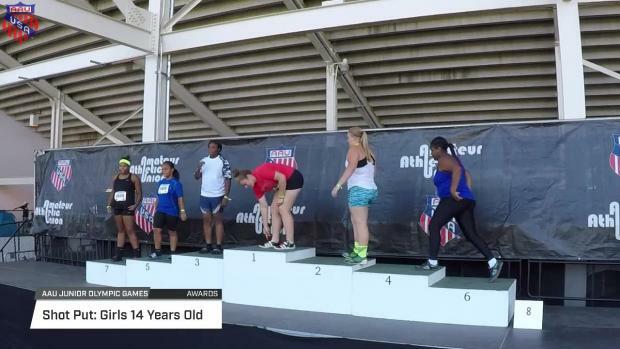 "Brooks, who hails from Indianapolis, owned a previous personal best of 13.3. 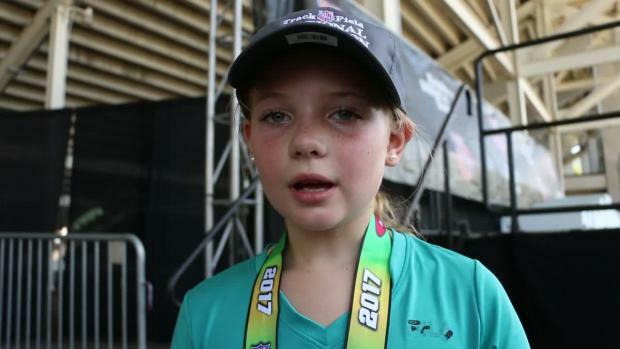 She represented Athletes Lives Network Sports with a red singlet and said in a post-race interview that her favorite colors include red, hot pink, gold, and silver. 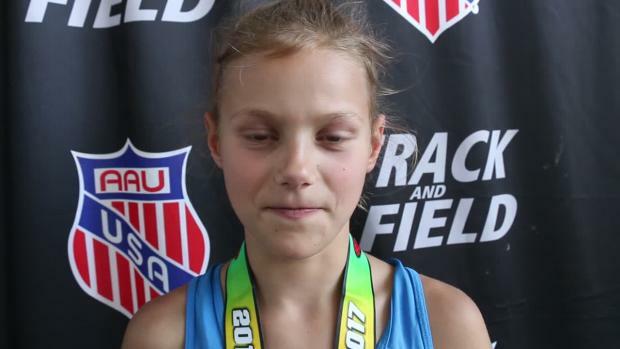 She ate oatmeal for breakfast this morning.Brooks has competed in track and field since she was seven years old. 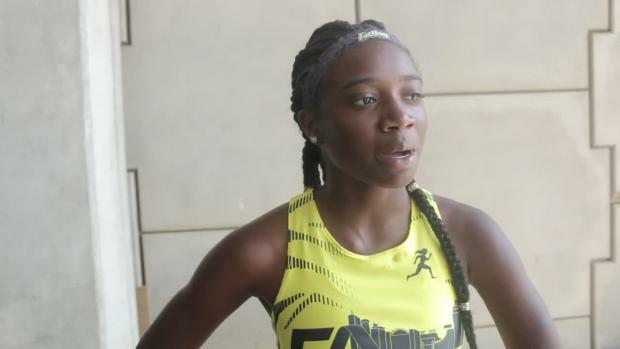 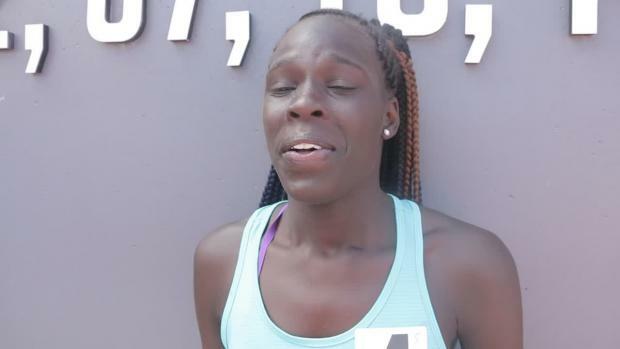 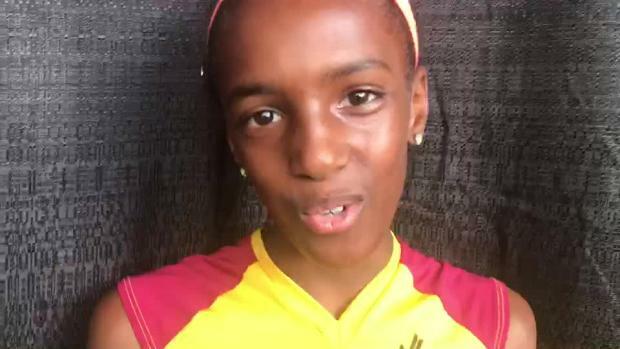 Later this week, she will contest the 400m and 200m, where she said she hopes to run "a 1:01 or 59 seconds flat, and in the 200m, I want to run a 27 flat or 25 flat. 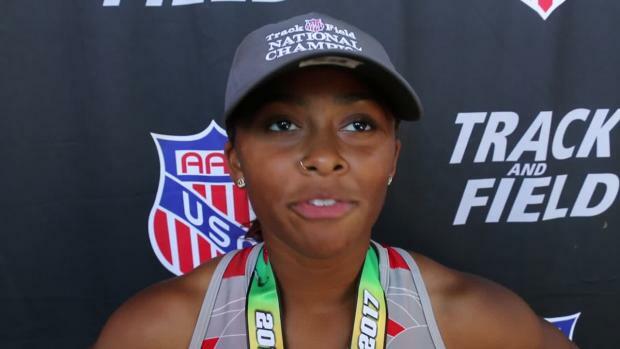 "Brooks has another Robinson record to aim for in the 200m; she also set the AAU national championships record in that event in 2001 with a 26.36 effort.The 400m record is just a year old, as Kanai Bey-English of Pennsylvania ran 59.51 last year. 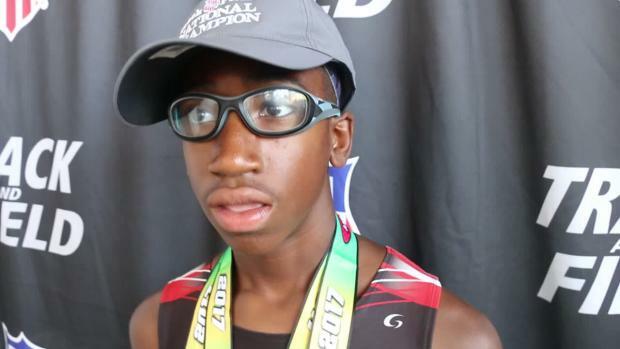 Athing Mu of Trenton, NJ has had a very successful meet at the AAU Junior Olympic Games. 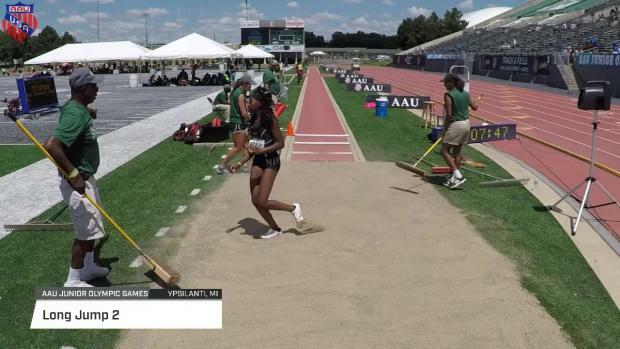 Four individual high schoolers from Maryland were crowned champions at this year's AAU Junior Olympics and many more turned in exceptional performances! 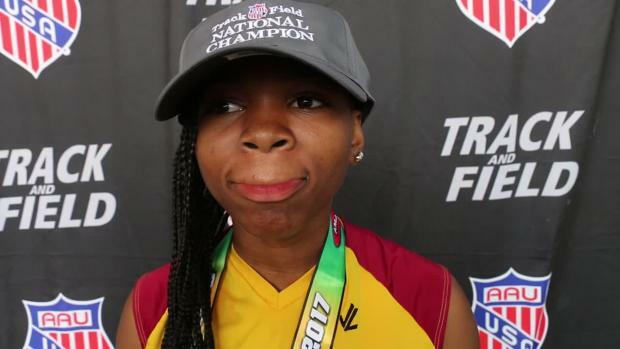 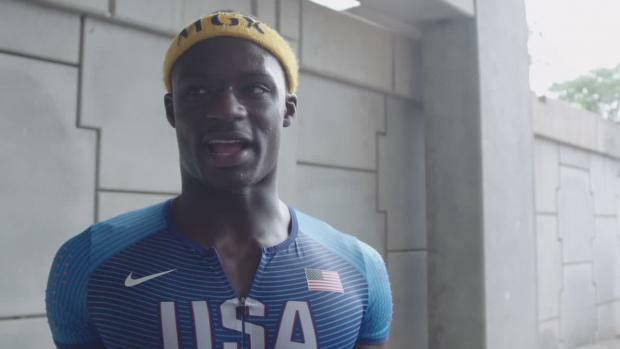 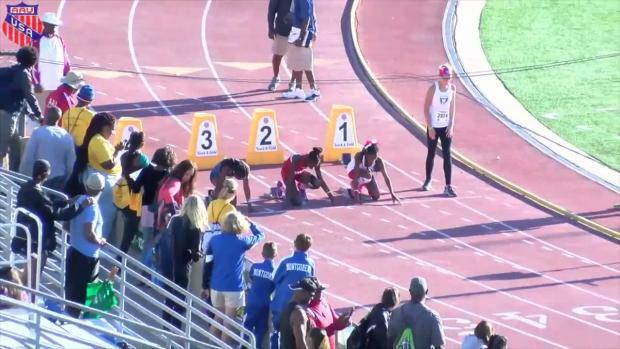 With every new record Tamari Davis sets on the track, new expectations seem to build for the 14-year-old sprinter from Florida. 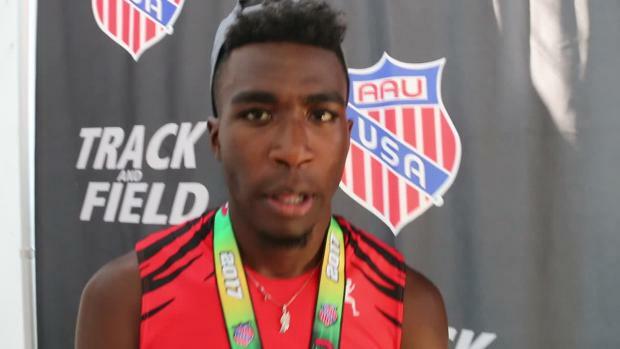 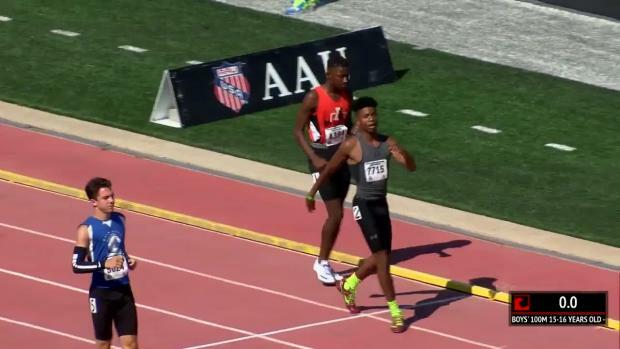 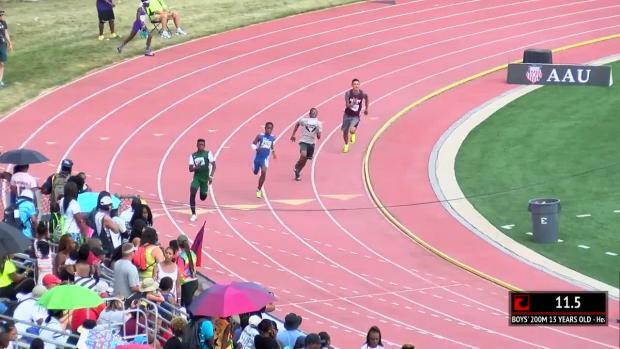 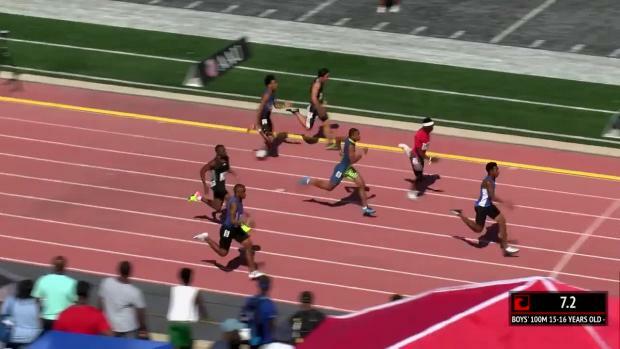 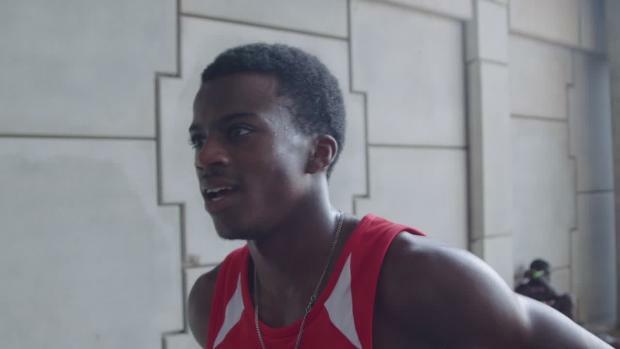 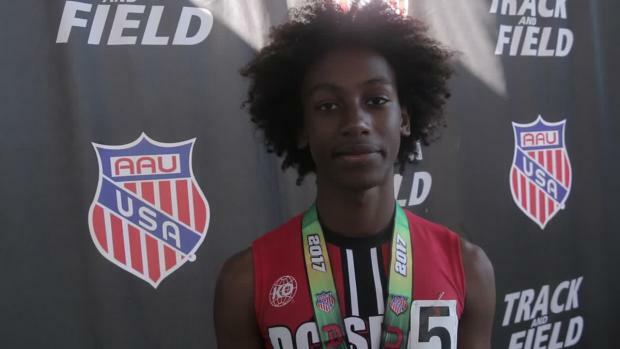 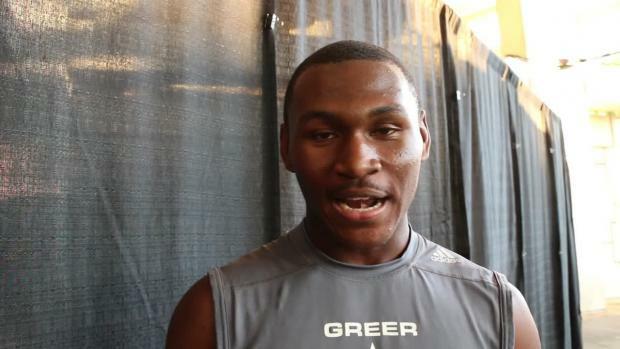 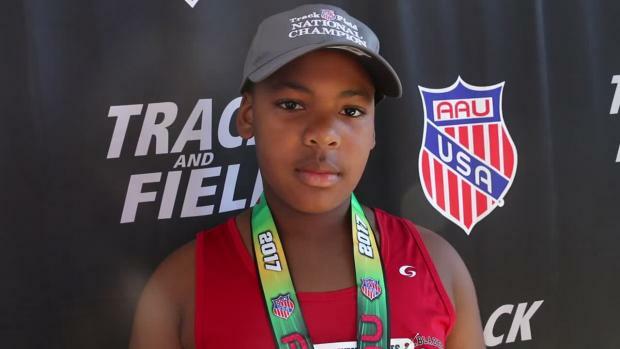 Ashton Allen is going to be an athlete to watch in the 200m and 400m at the AAU Junior Olympic Games. 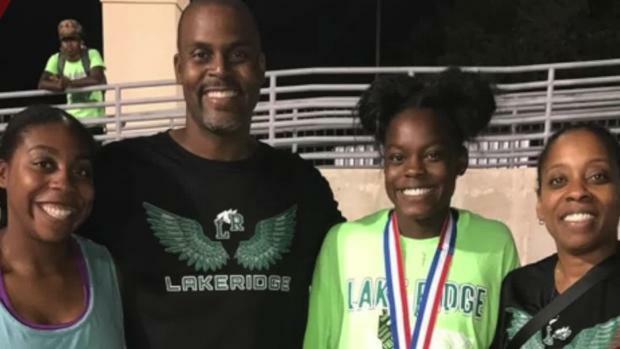 Rising senior Sydney Lane is wading through her college choices as she enters her senior season. 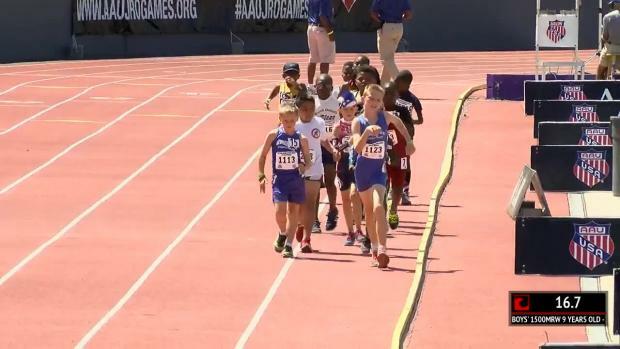 Aeneas Reed Jr. and Alec Reed competed for a shared cause at the AAU Junior Olympic Games. 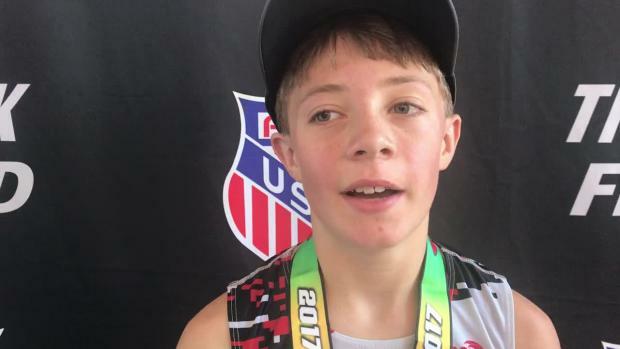 When Seth Norder was three years old, his favorite book was one from the Berenstain Bears series. 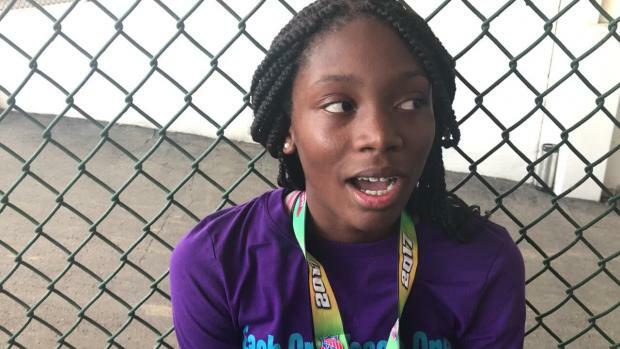 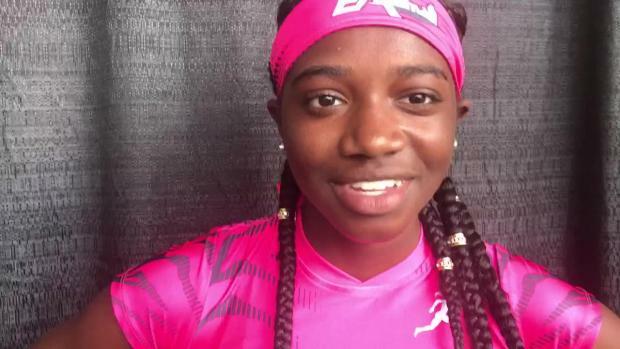 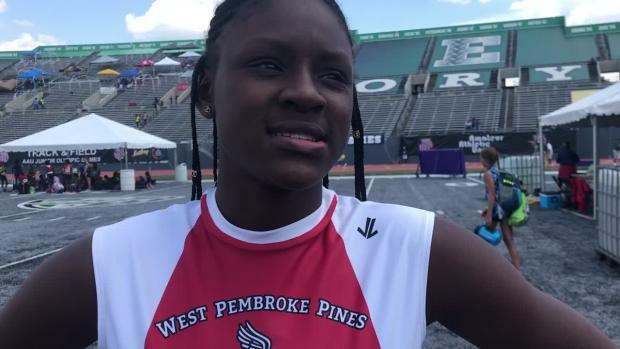 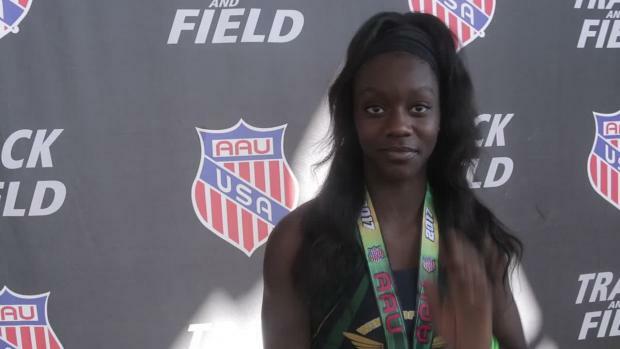 We caught up with Hope Igbinoghene in this week's Friday Focus to see what she had to say about her high school track season, her performance last weekend and her goals for the AAU Junior Olympics. 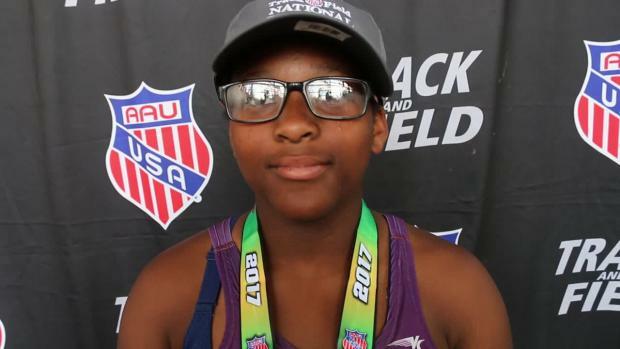 Anavia Battle looks to take home double gold at AAU Junior Olympics. 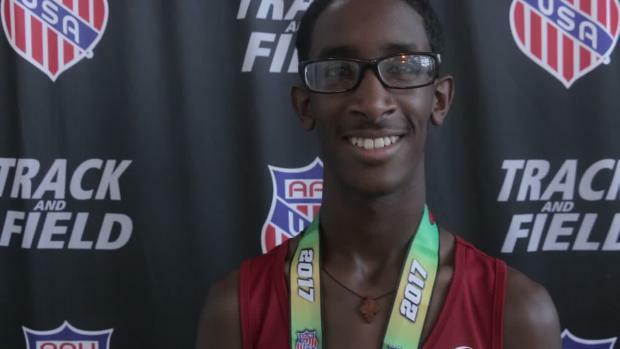 Check out who from North Carolina is traveling to Ysipilanti, Michigan for the AAU Junior Olympic Games? 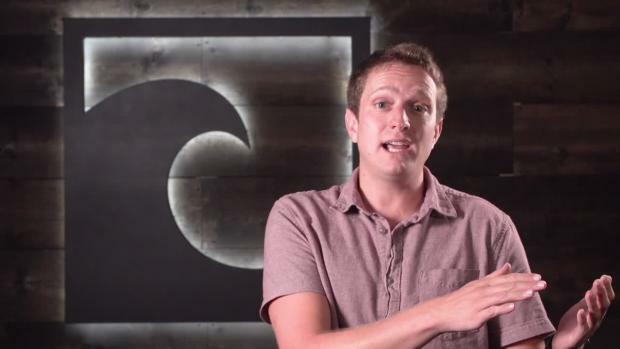 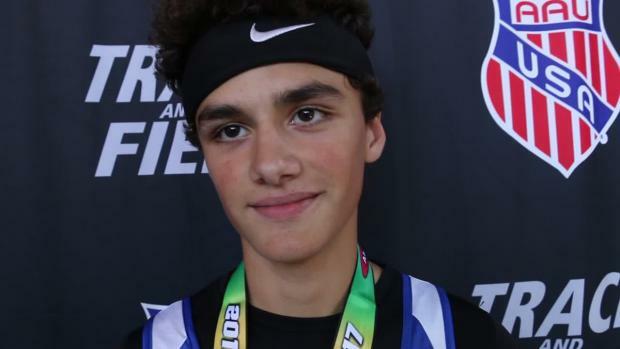 Michael Hoffer knows what can be done with a little belief and some can-do attitude. 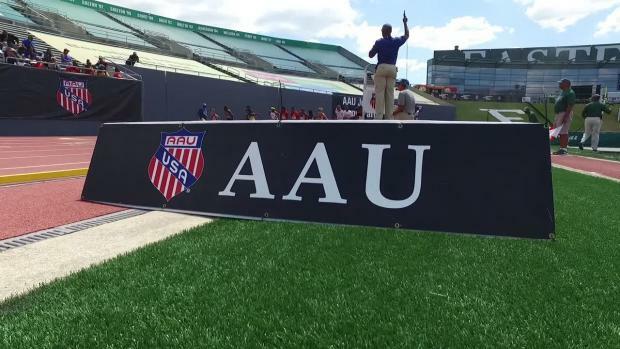 Throughout this summer you will be able to keep up with all the AAU action across the country. 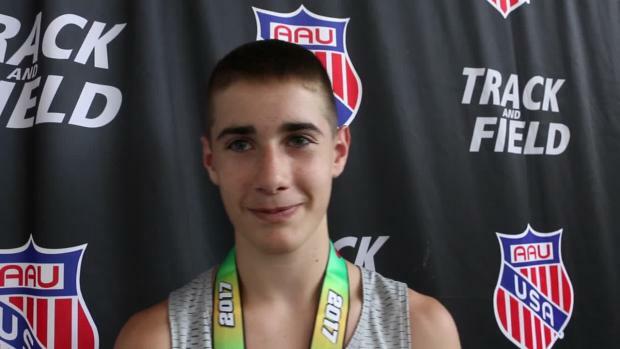 Here are New Jersey's entries for the AAU Junior Olympic Games. 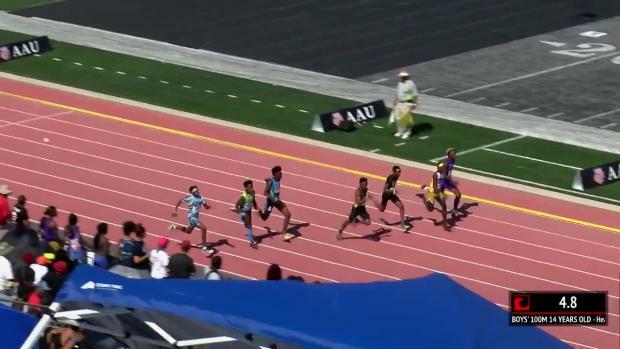 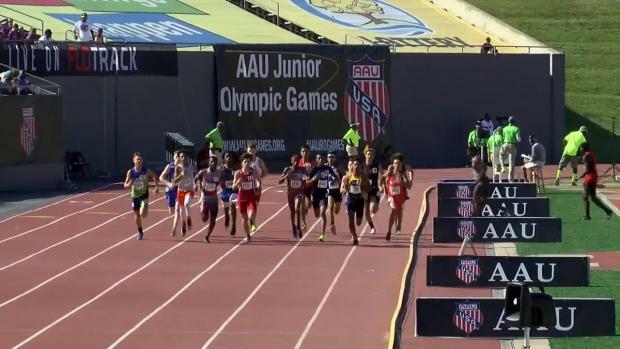 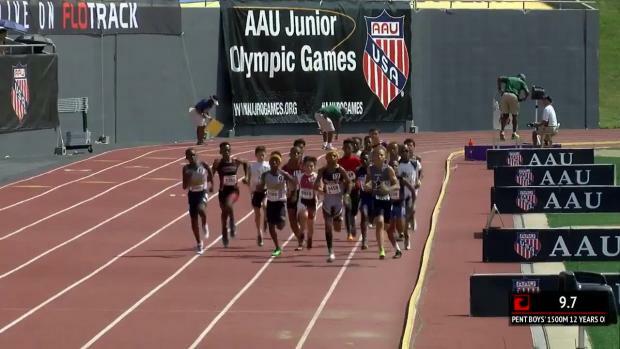 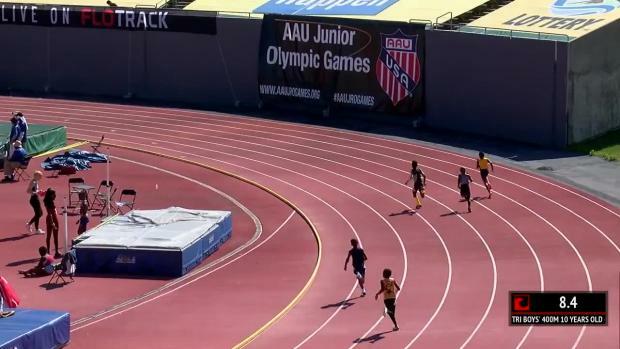 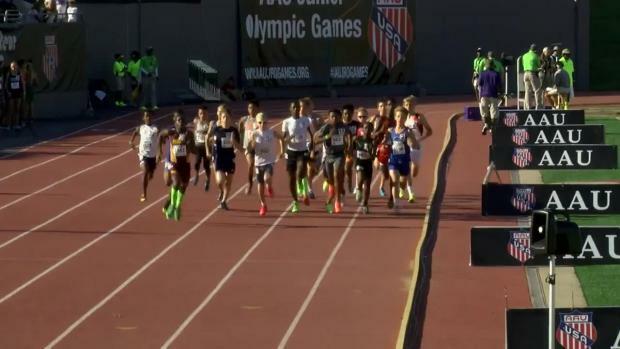 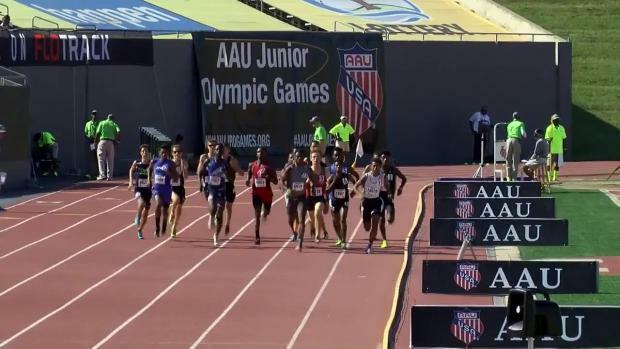 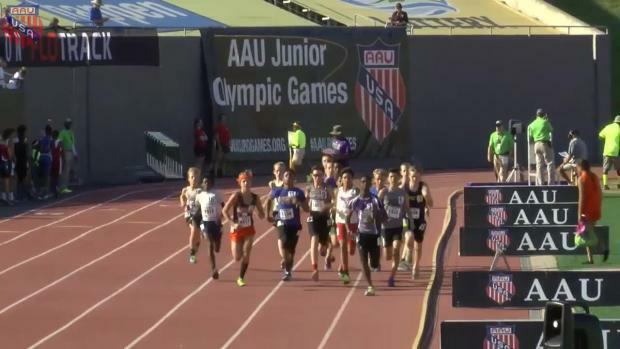 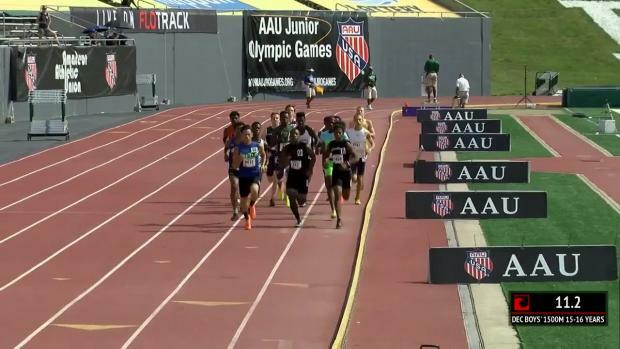 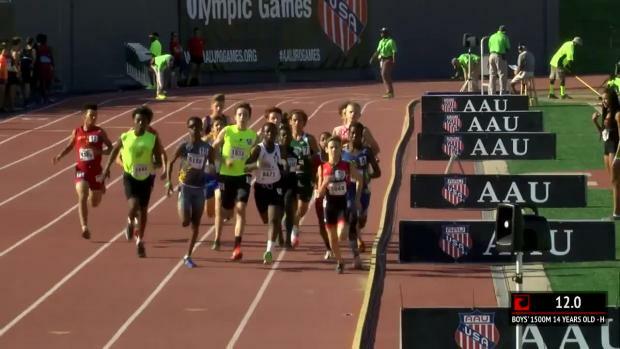 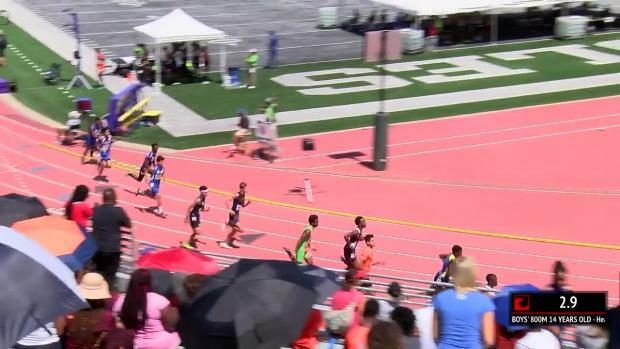 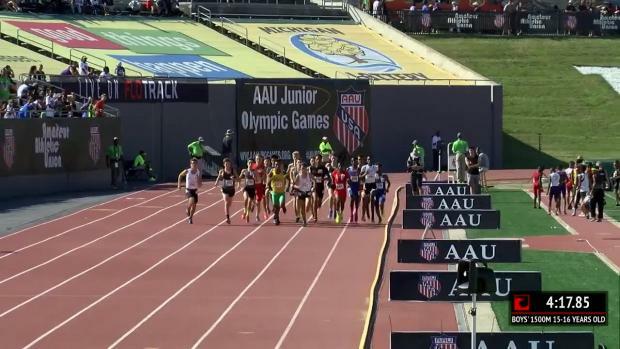 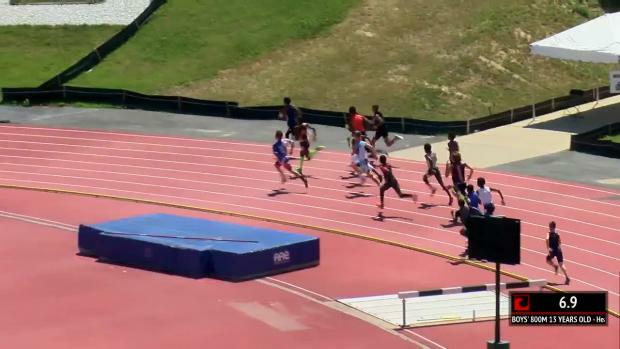 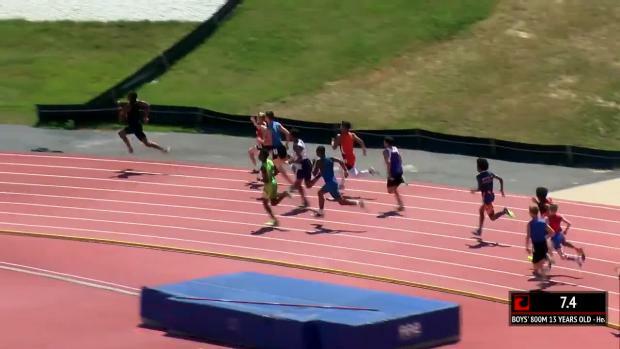 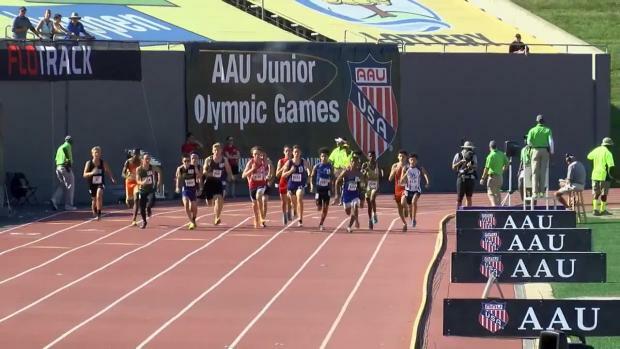 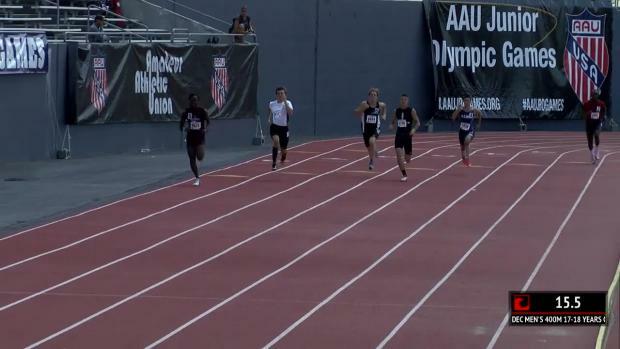 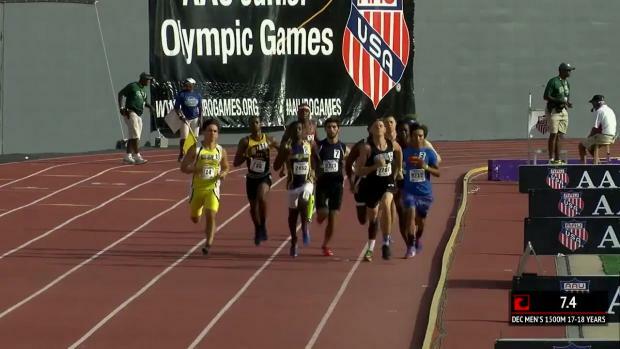 Check out some of the highlights from day six of the AAU Junior Olympic Games. 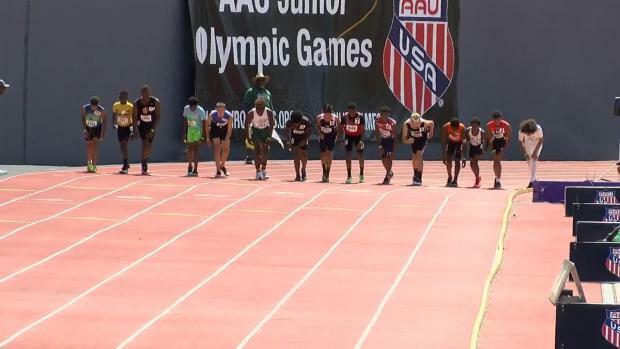 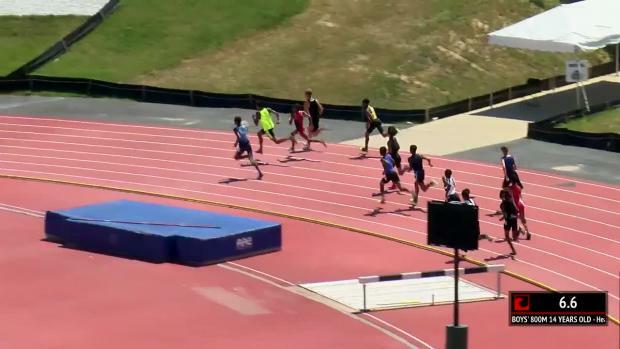 Check out some of the highlights from day three of the AAU Junior Olympic Games. 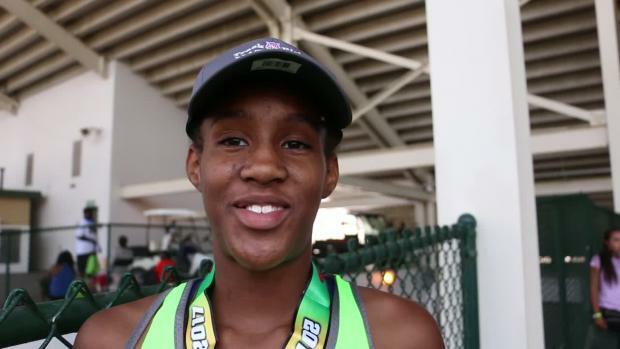 Alicia Burnett looks to add more gold to her collection at the AAU Junior Olympics. 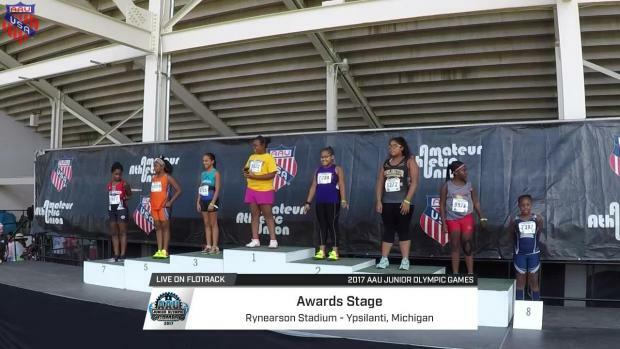 Kyra Jefferson got her start by competing in the AAU. 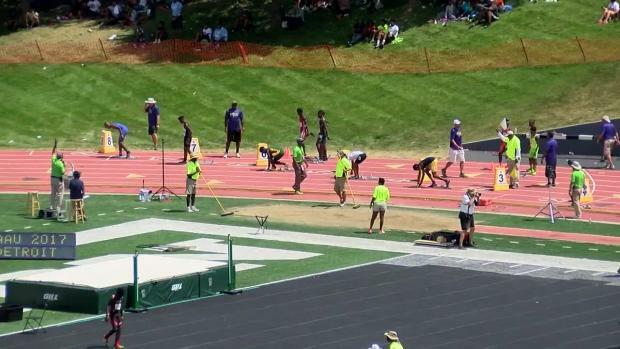 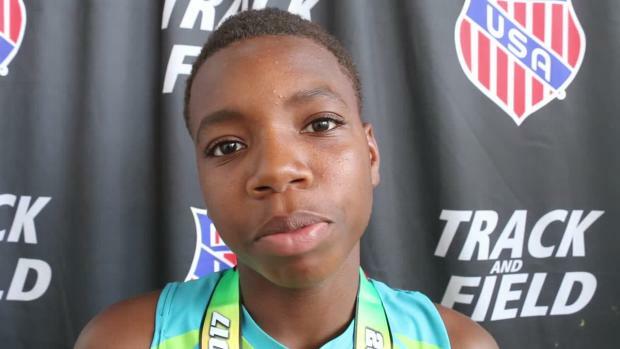 Athing Mu looks to take home two national records at the AAU Junior Olympics this summer. 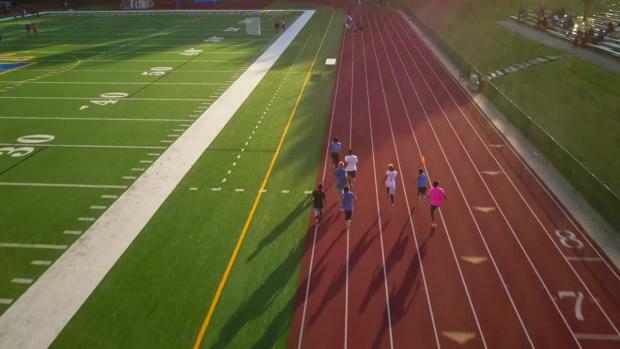 The biggest blockbuster of the summer, Wonder Woman, might be released nationally this week and we aren't talking about a movie. 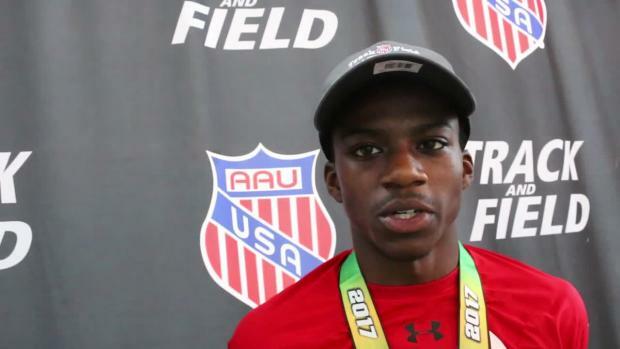 A total of 32 athletes on this year's Team USA squad for the 2017 IAAF World Championships in London are AAU Junior Olympic Games alumni. 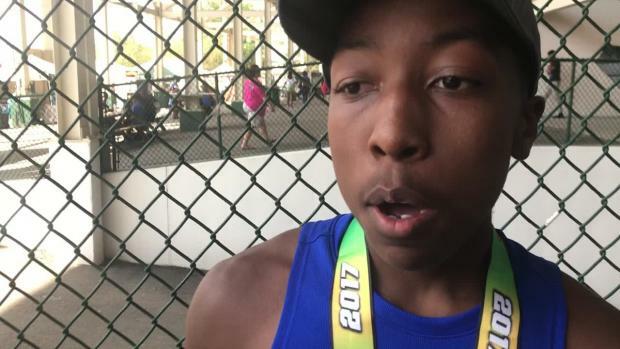 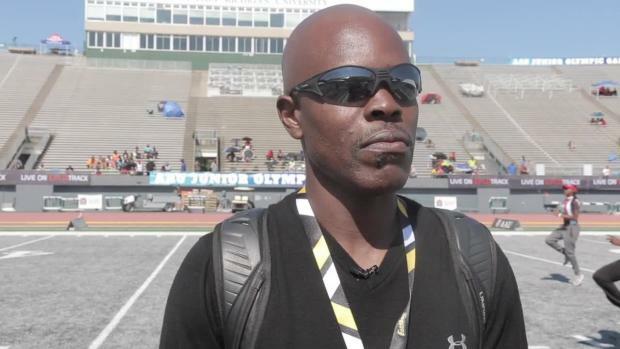 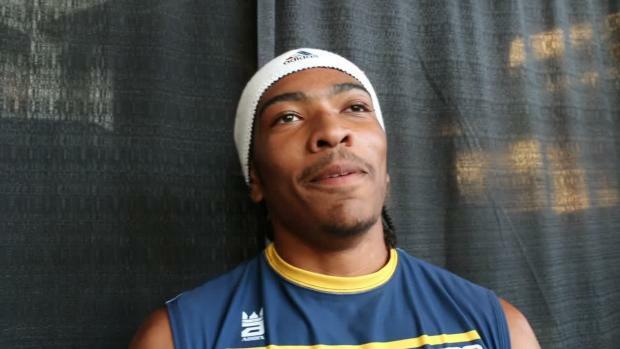 Gary Moore Jr. has a track and field pedigree that has helped him win the AAU JO pentathlon title. 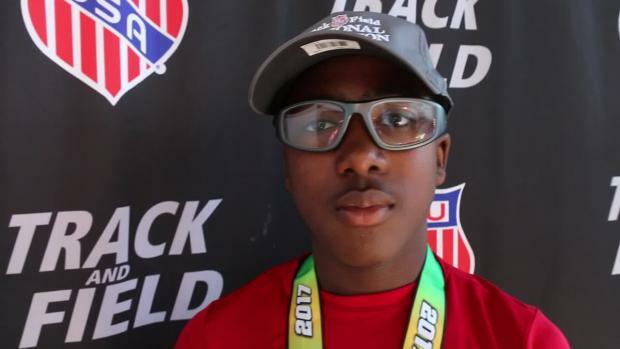 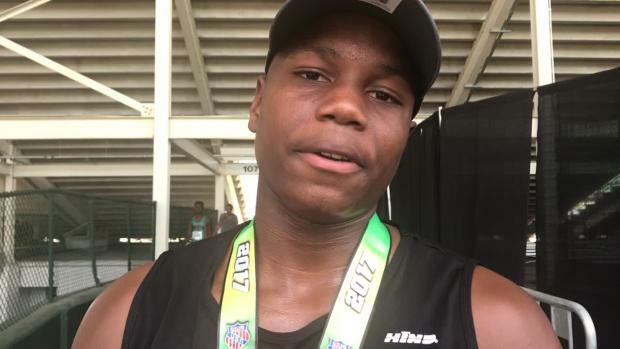 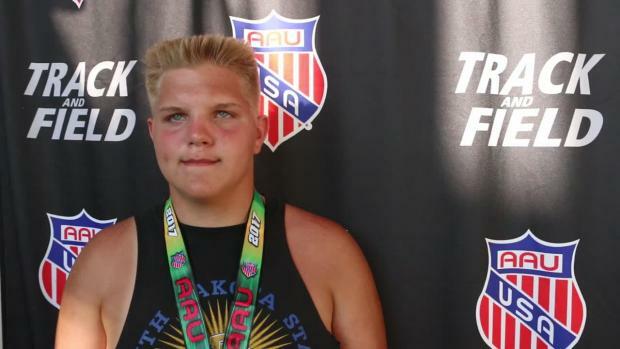 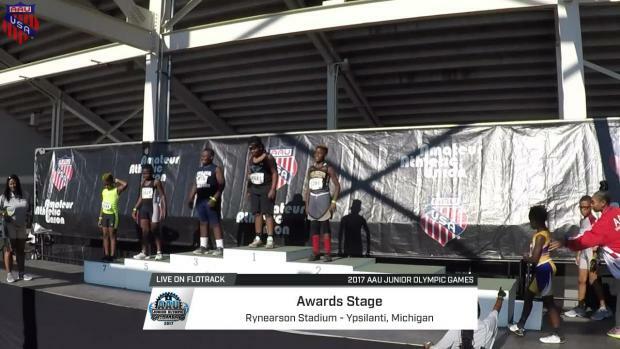 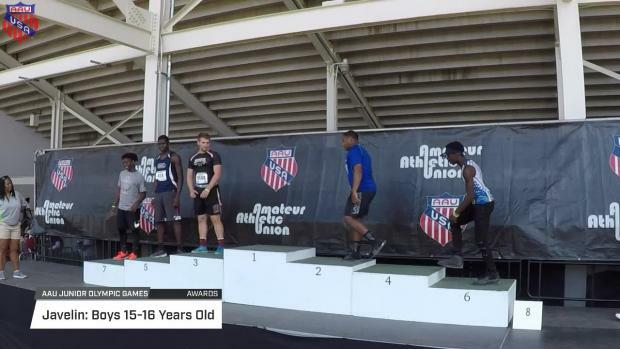 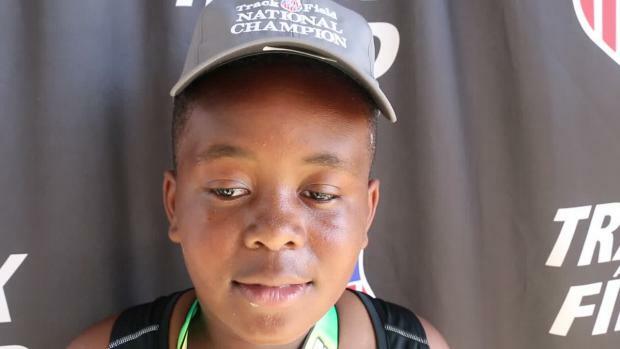 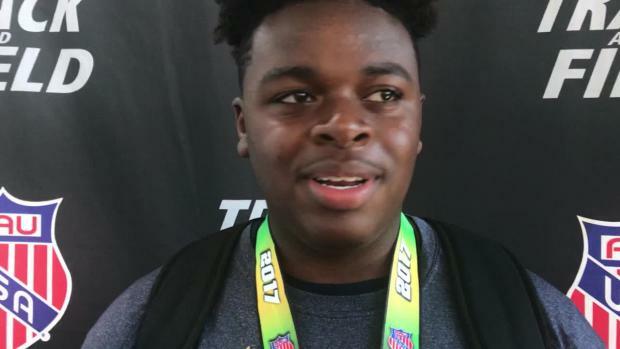 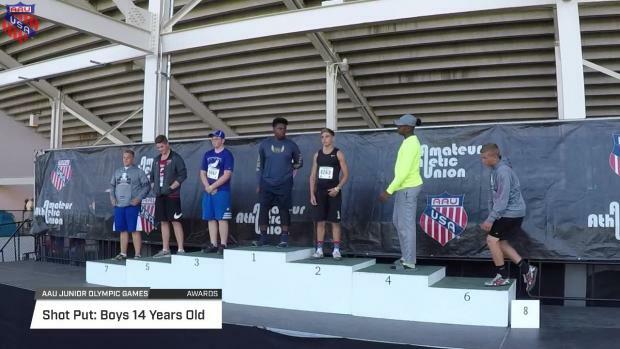 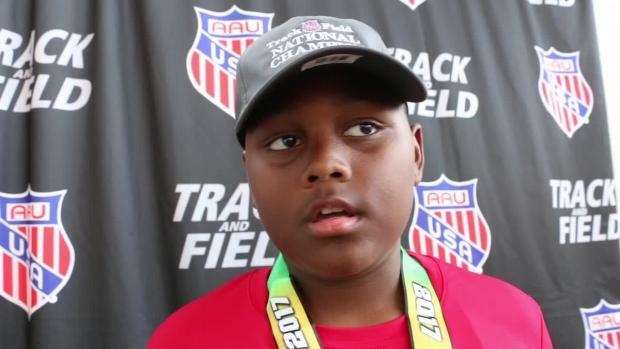 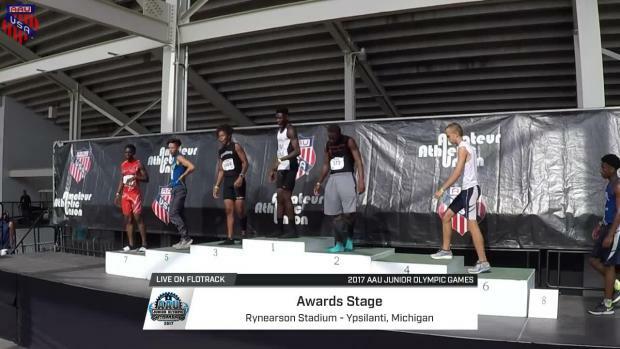 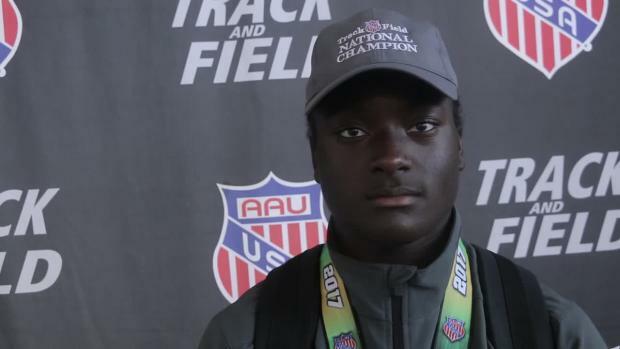 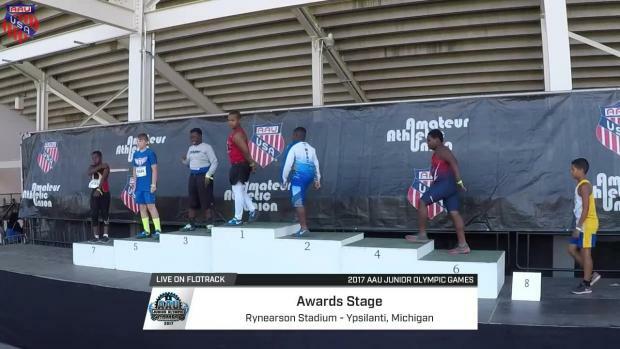 Kevin Adams II won his second straight national championship in the boys 13-year-old discus at the AAU Junior Olympic Games in Ypsilanti, Michigan. 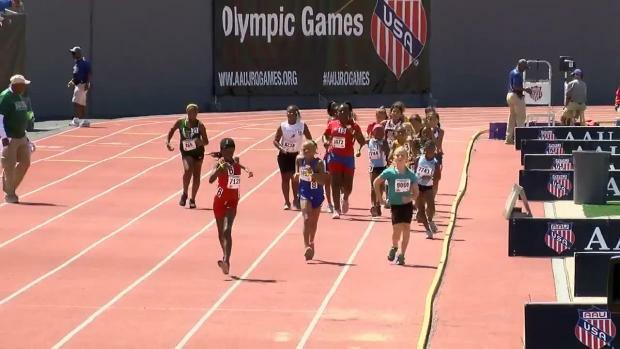 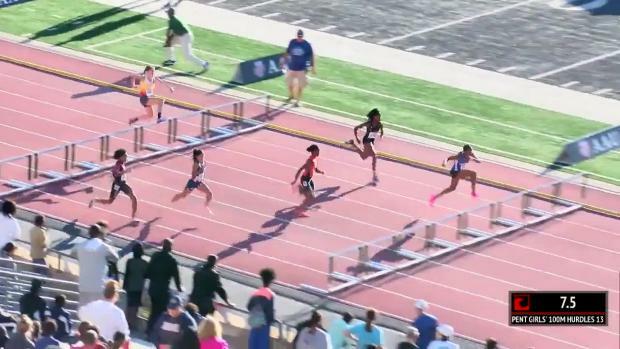 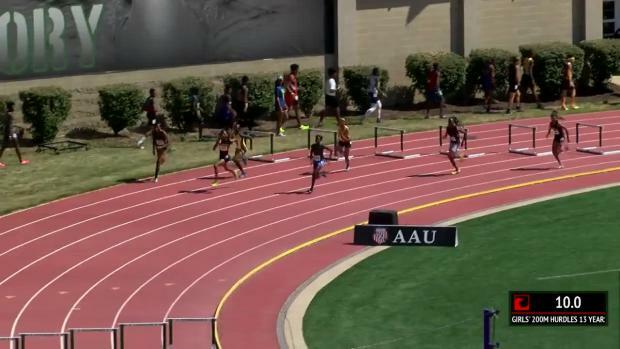 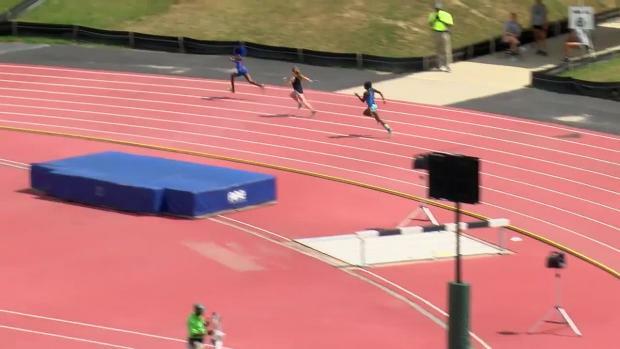 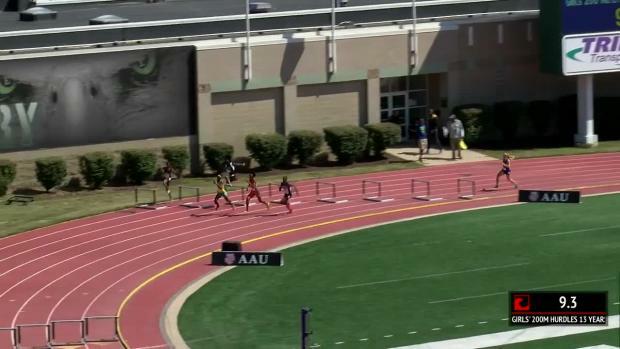 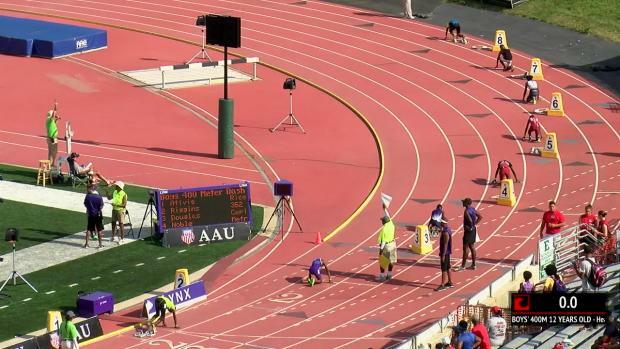 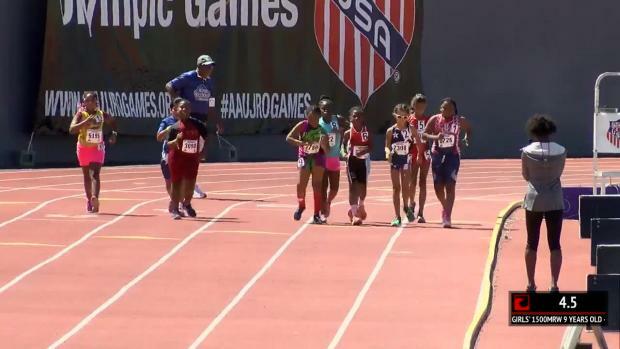 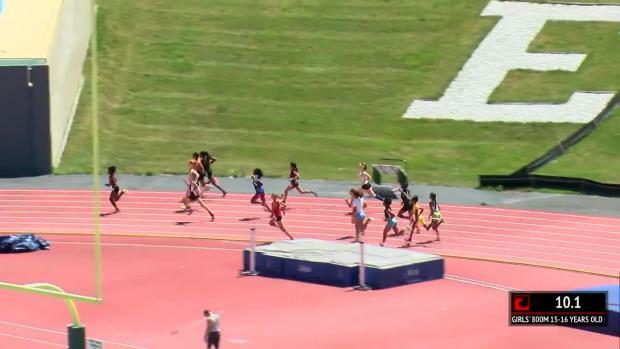 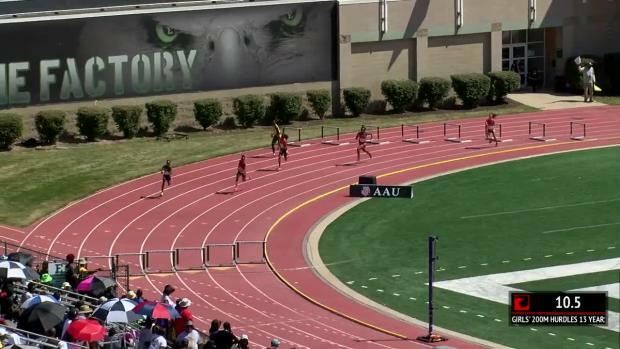 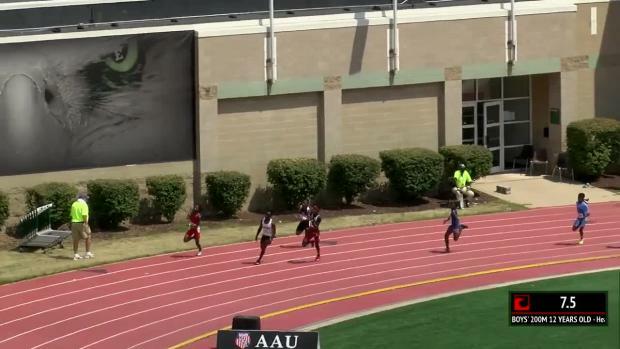 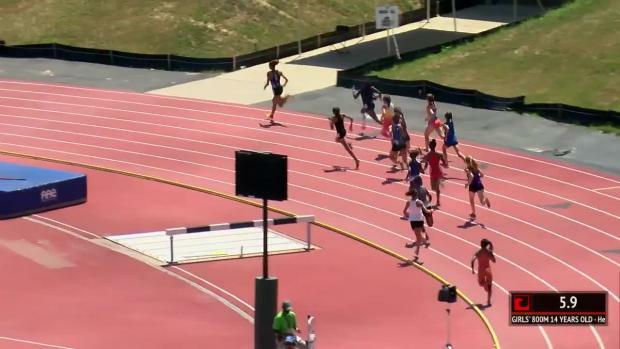 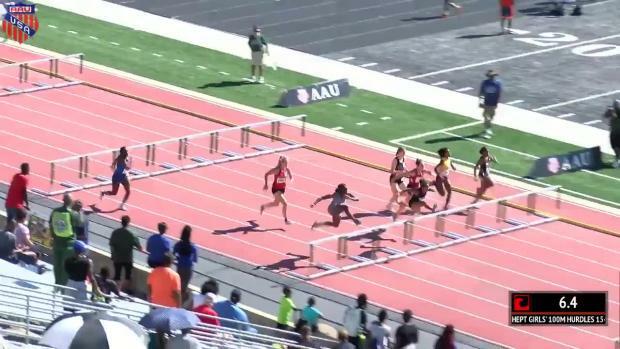 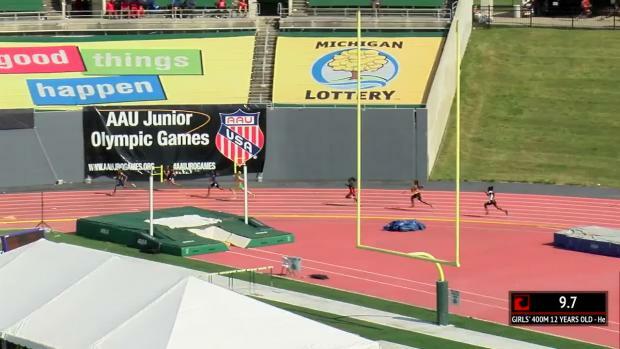 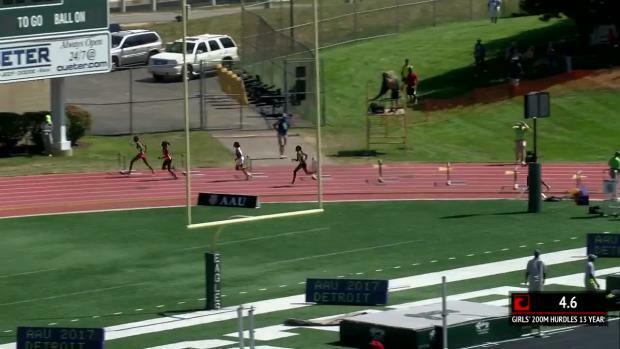 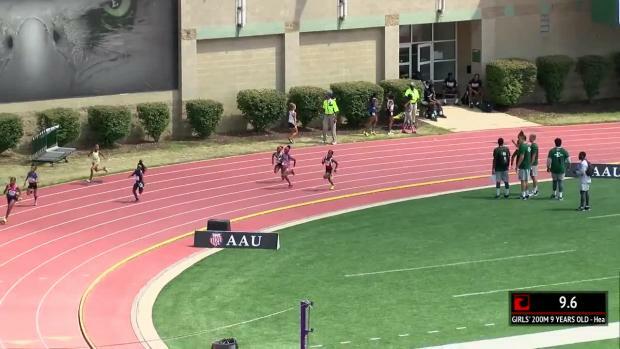 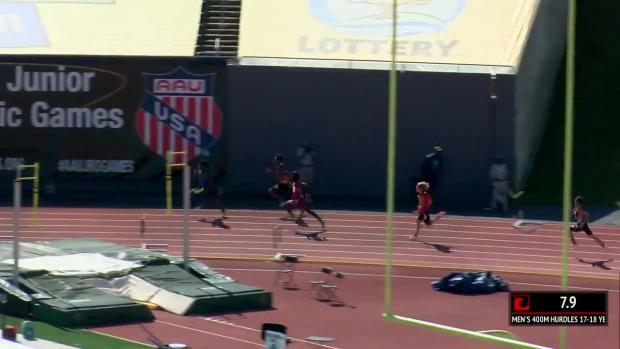 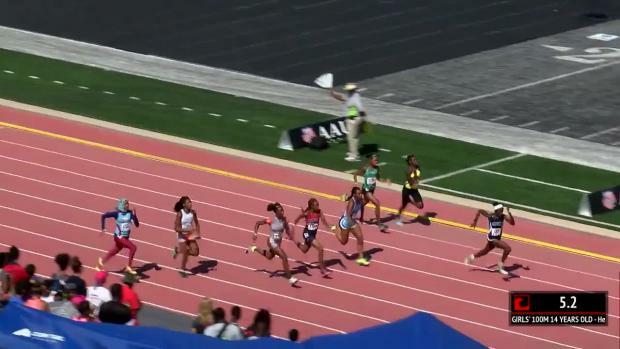 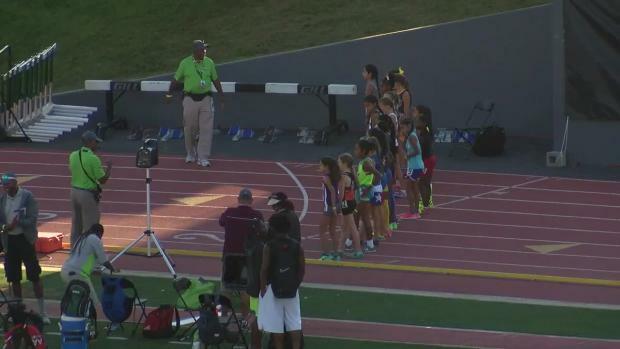 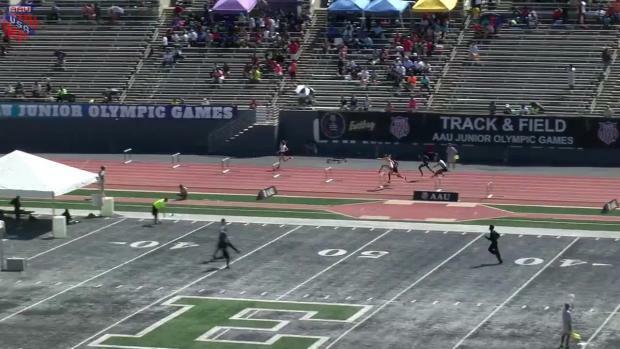 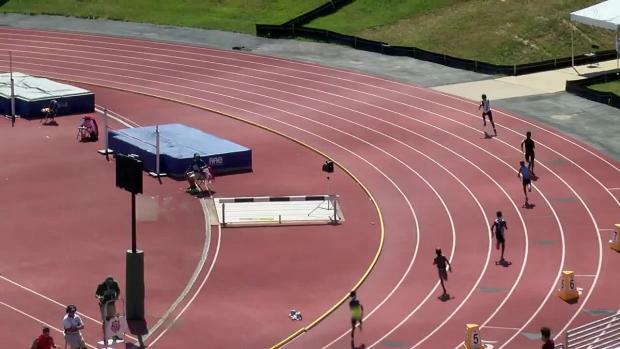 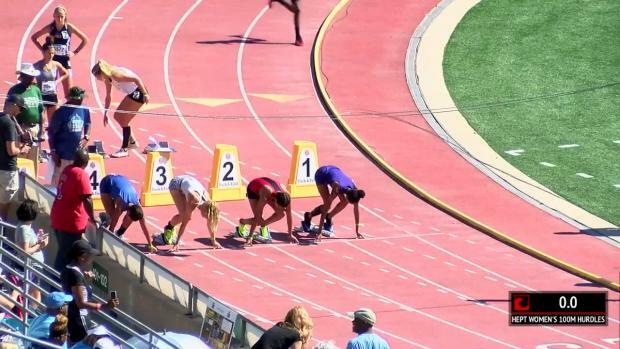 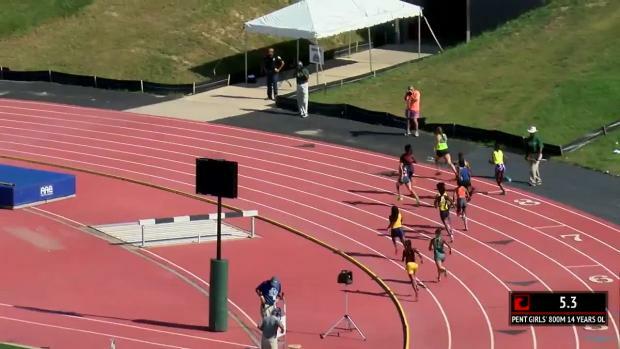 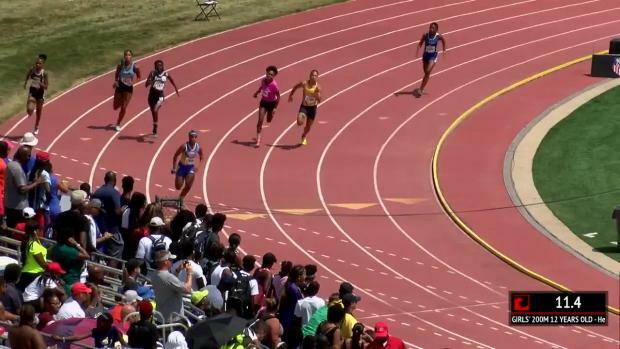 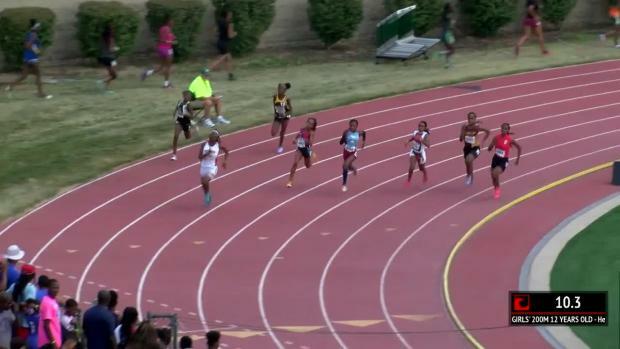 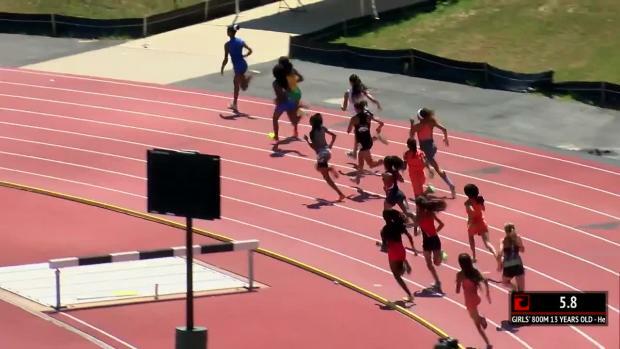 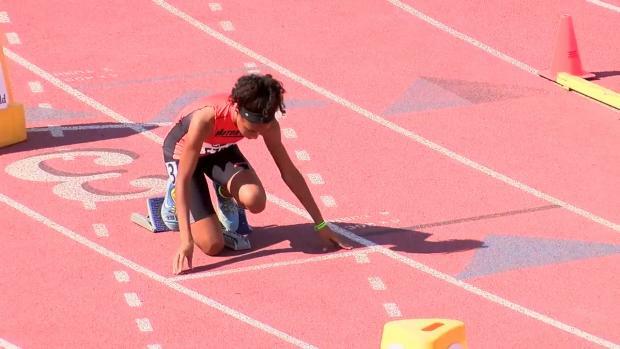 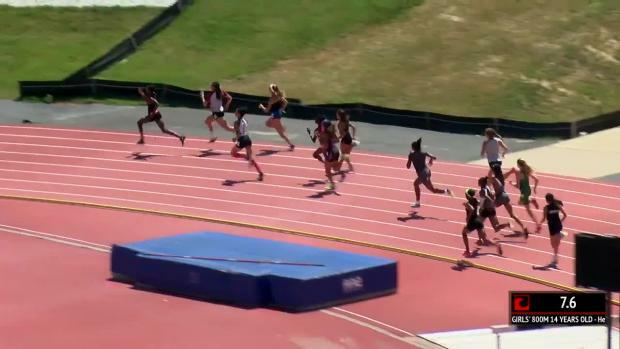 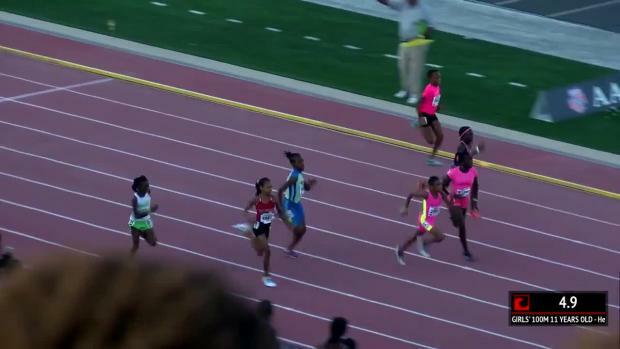 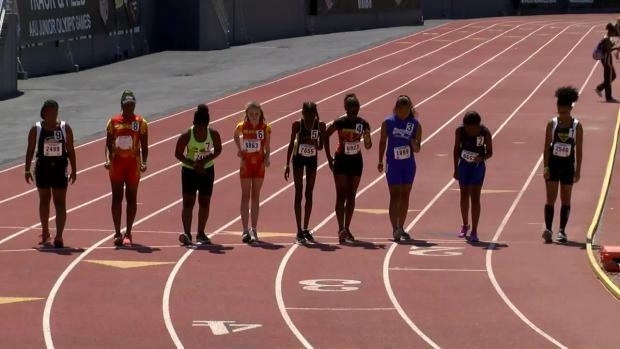 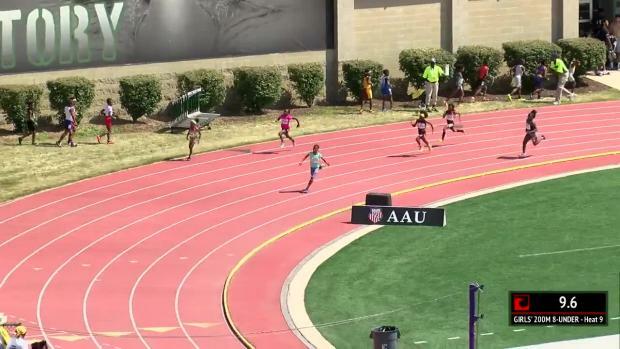 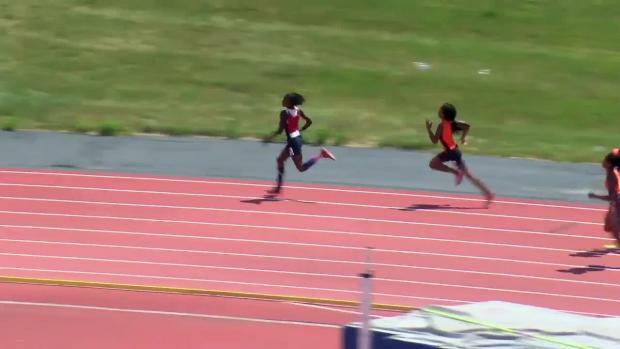 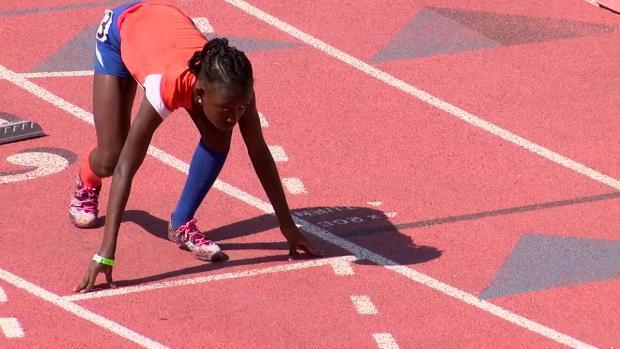 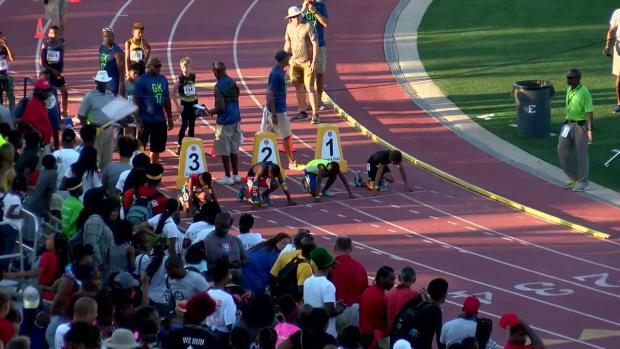 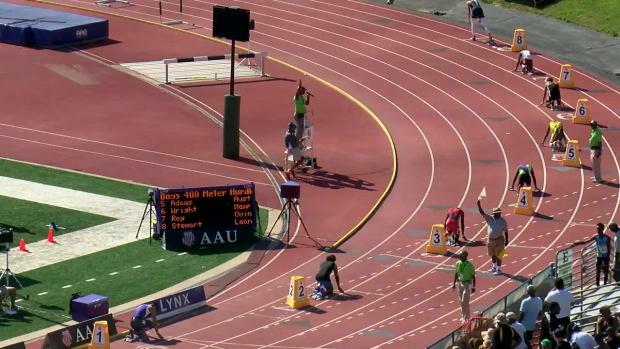 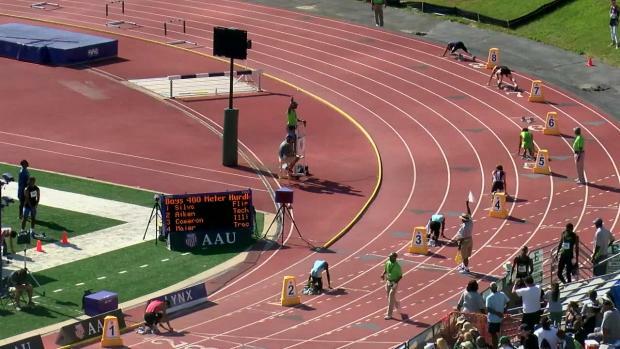 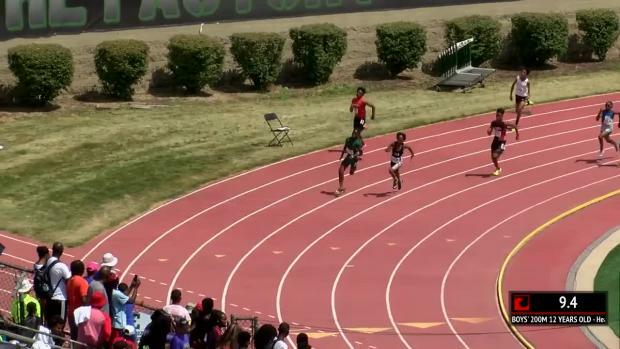 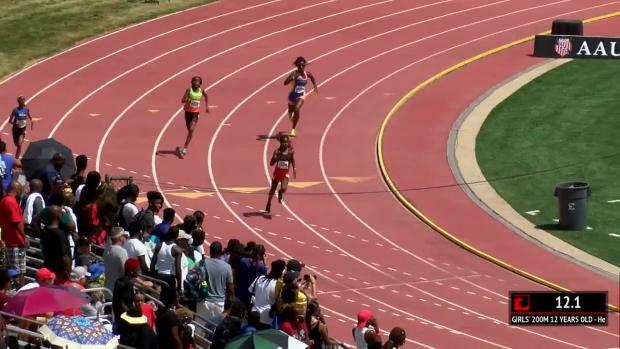 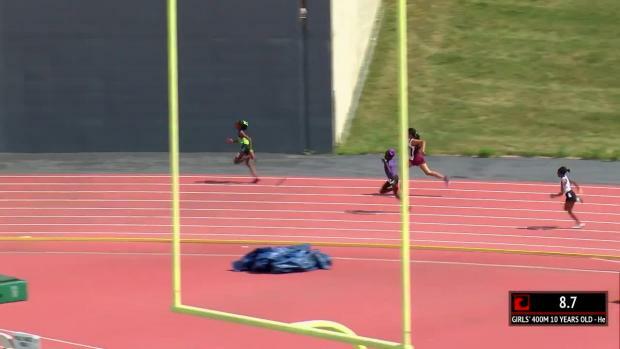 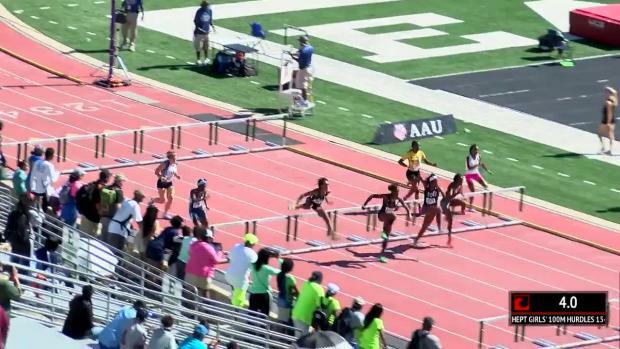 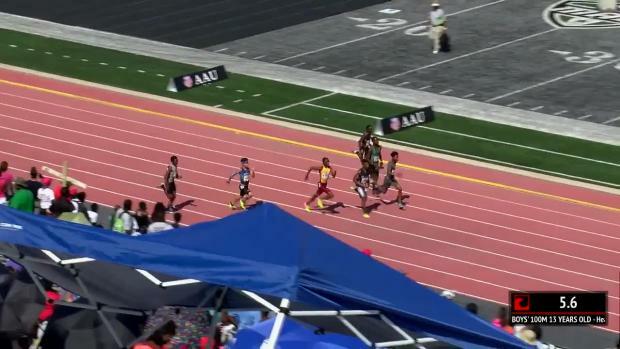 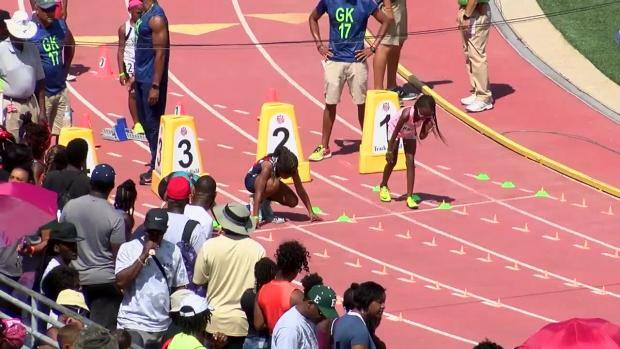 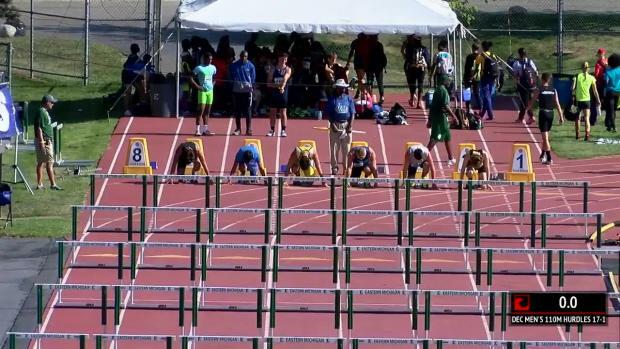 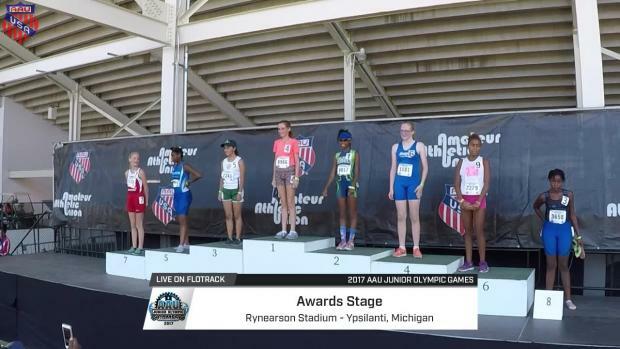 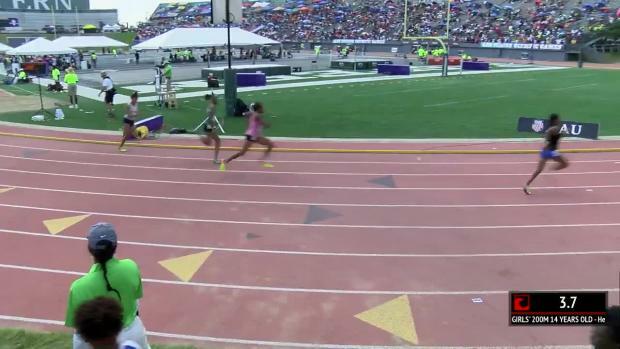 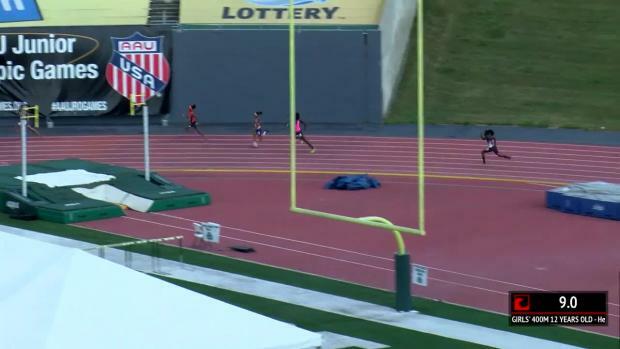 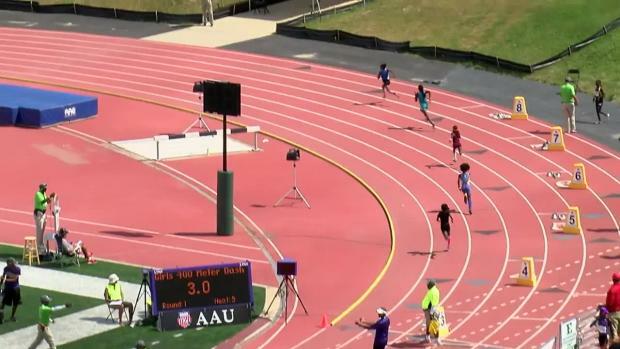 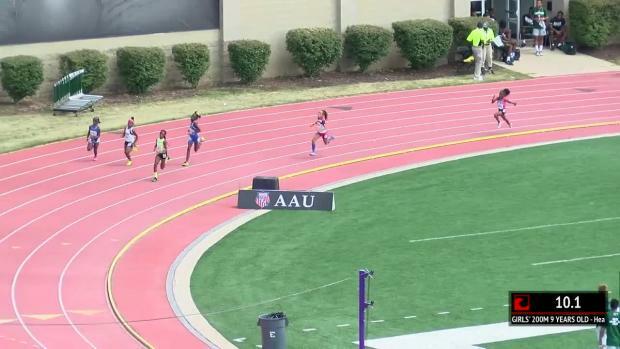 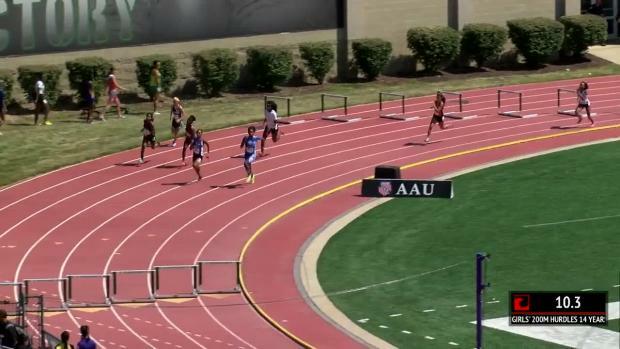 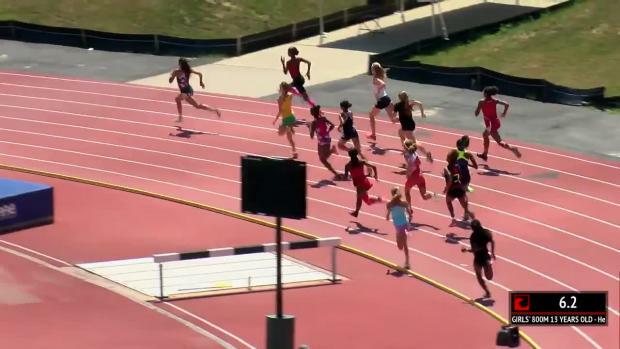 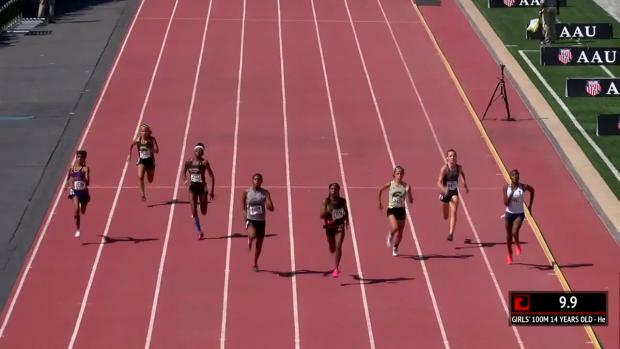 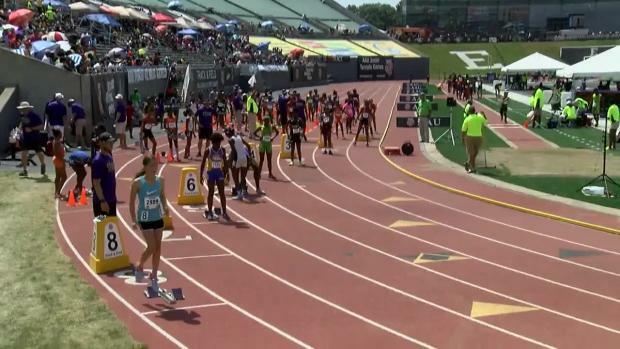 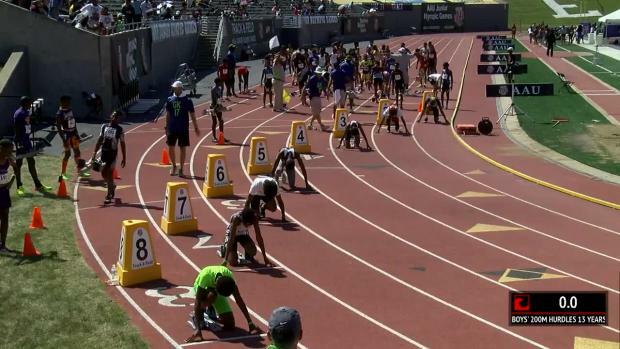 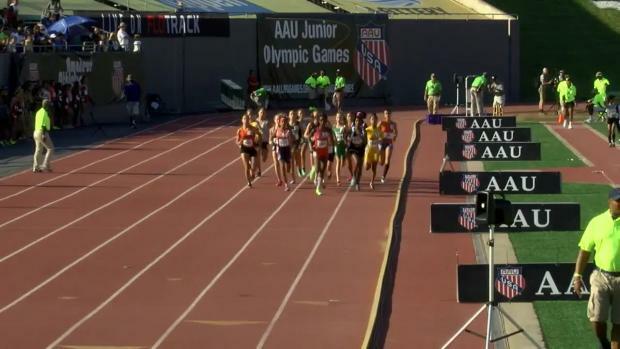 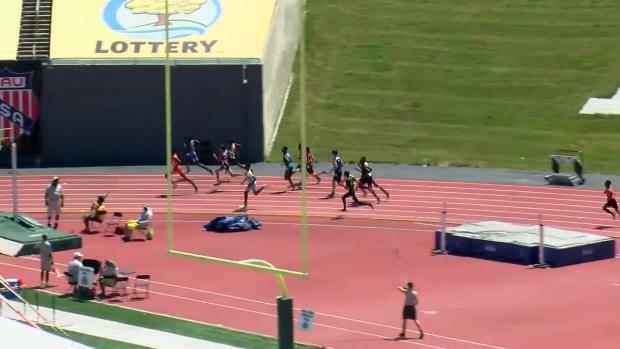 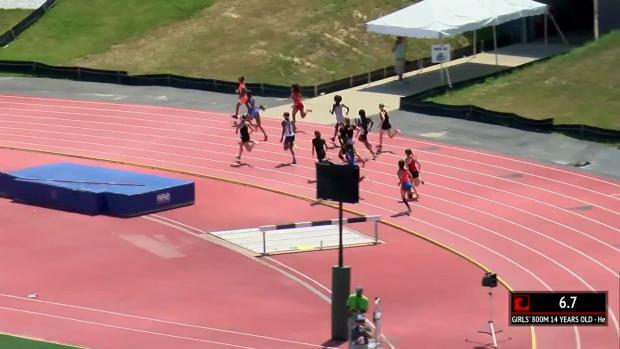 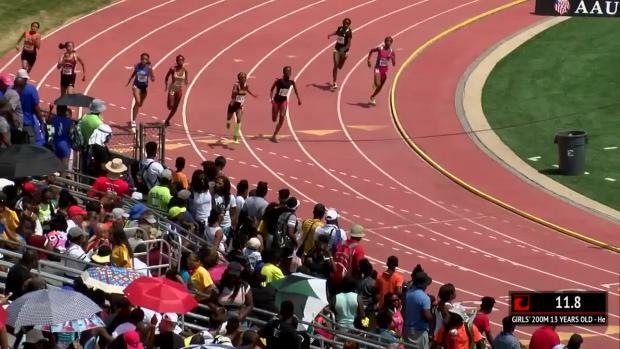 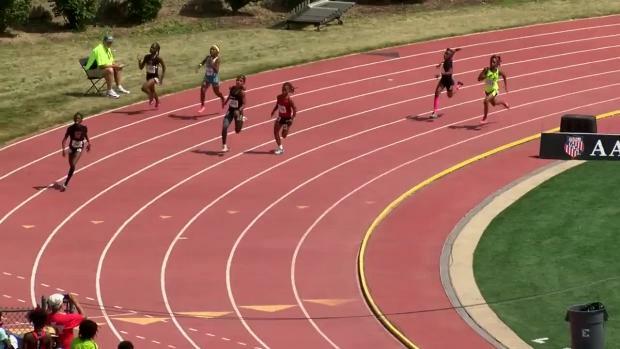 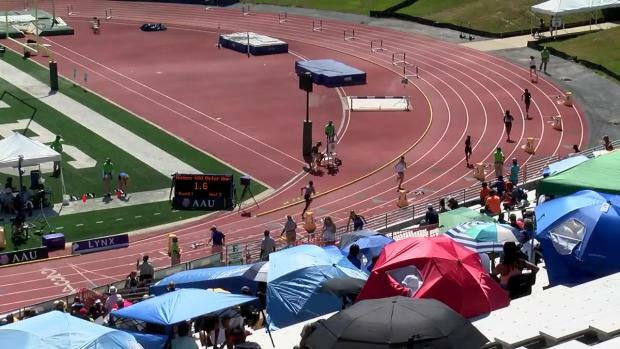 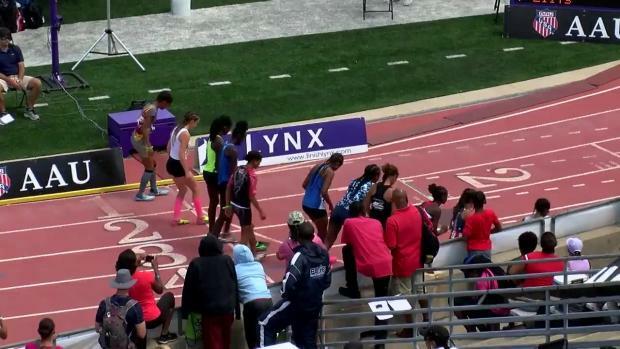 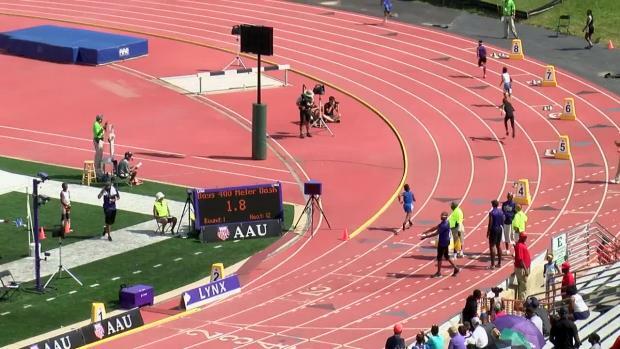 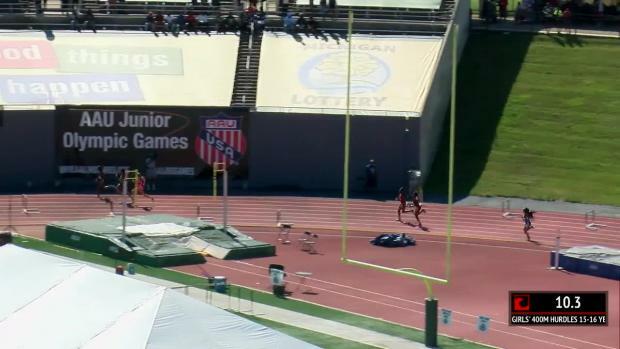 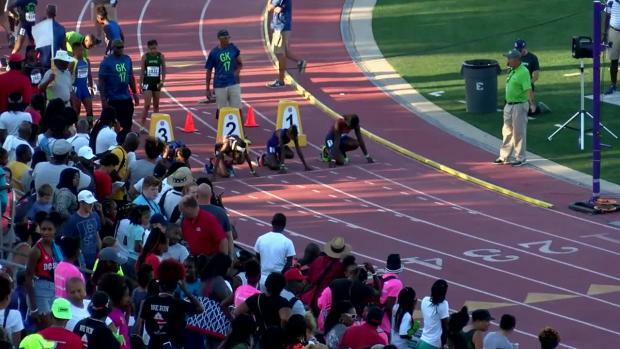 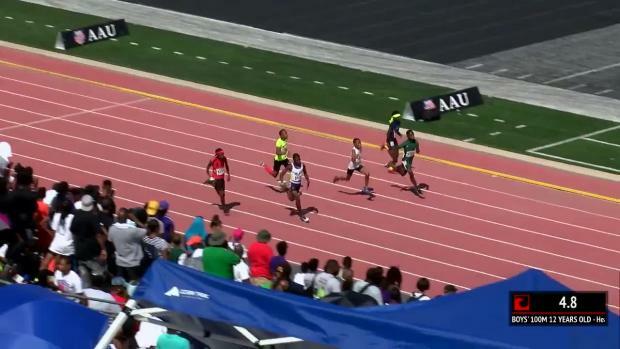 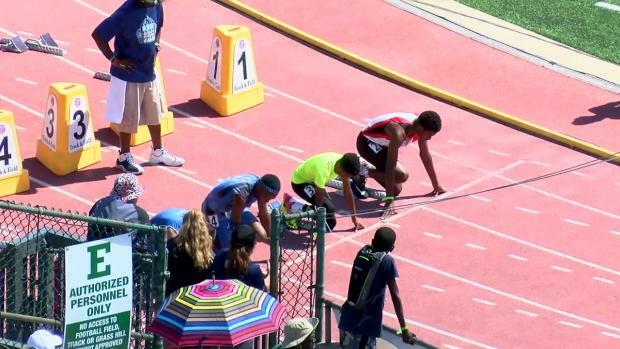 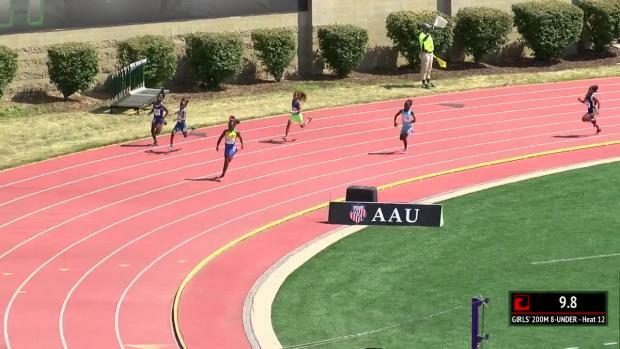 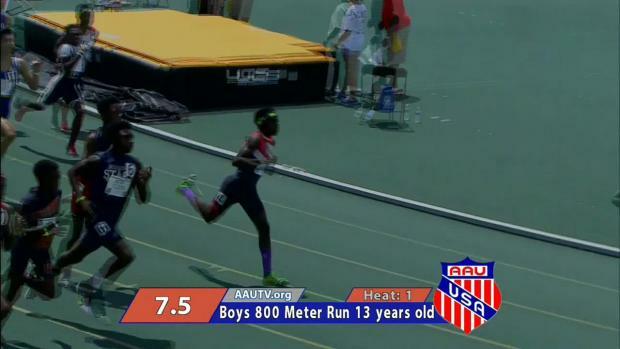 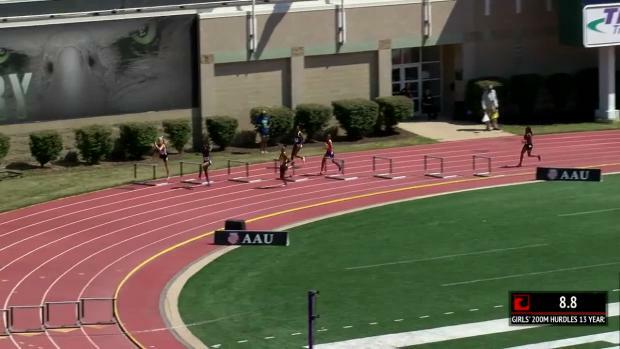 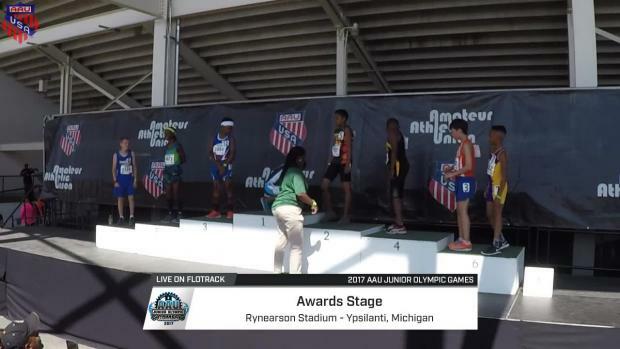 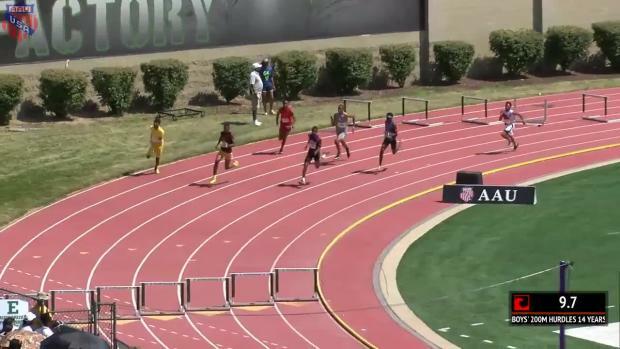 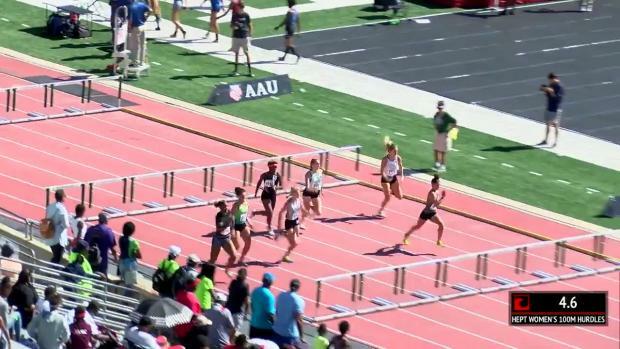 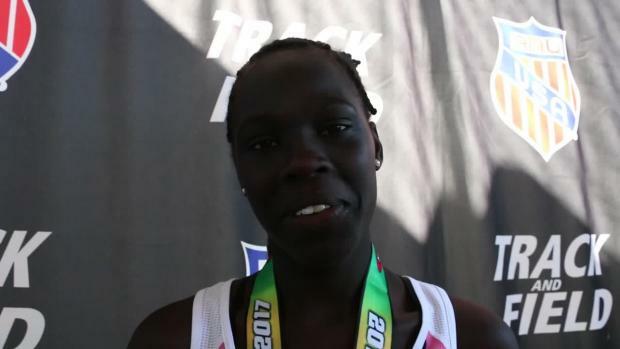 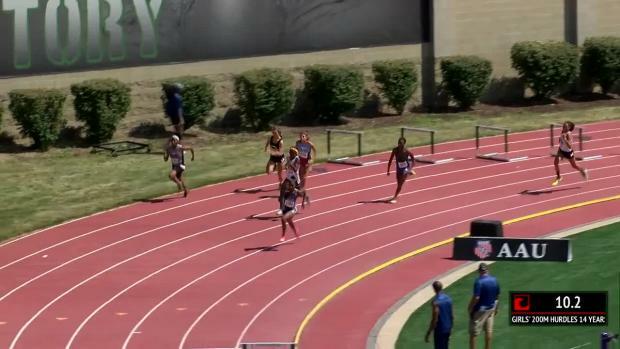 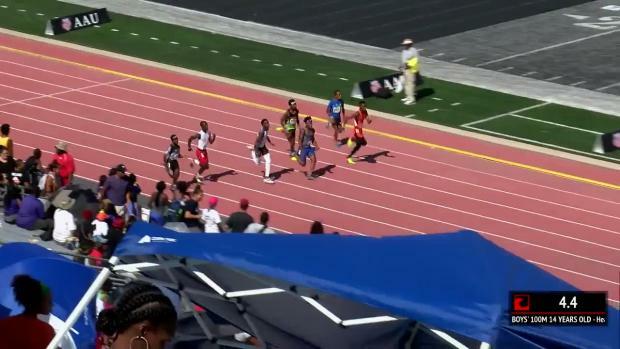 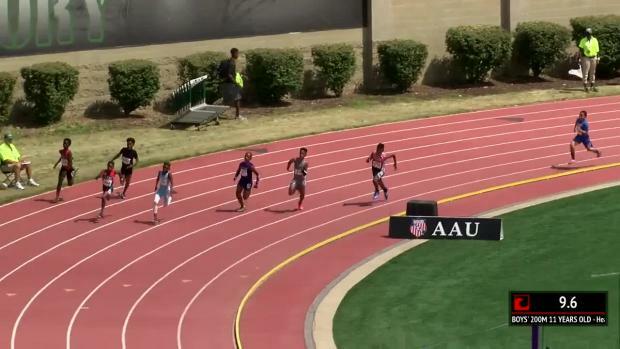 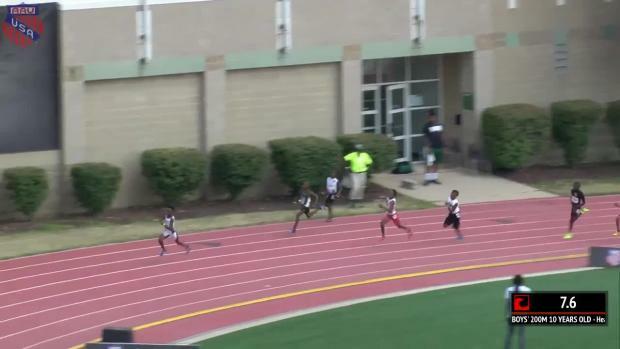 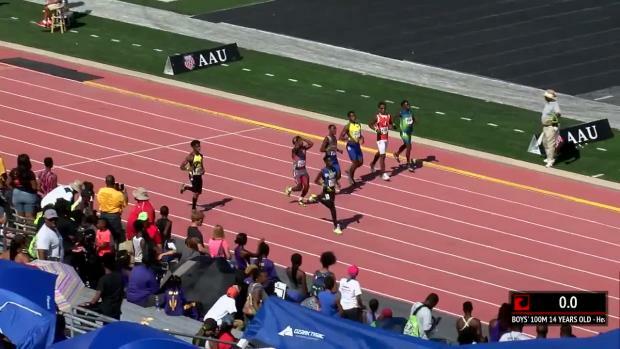 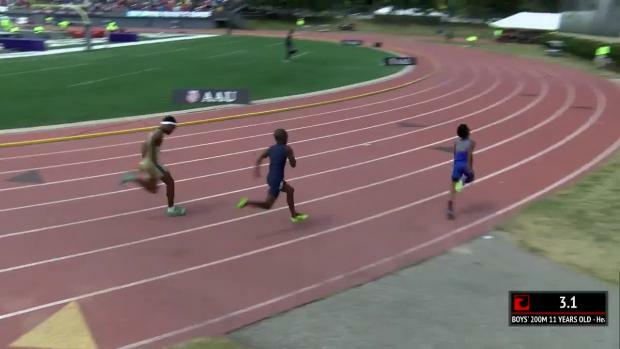 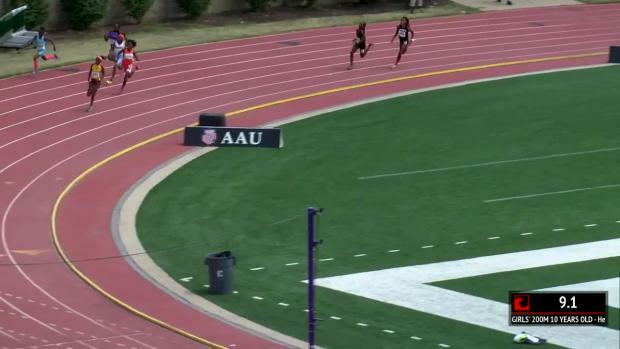 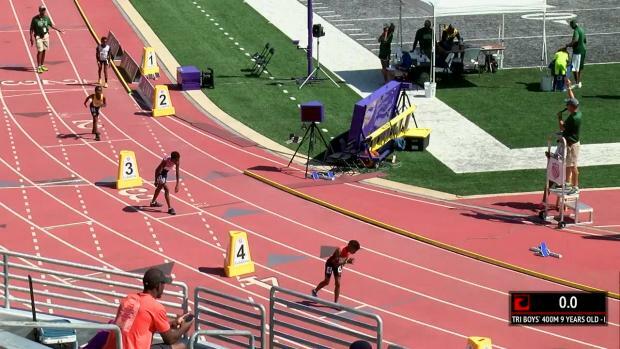 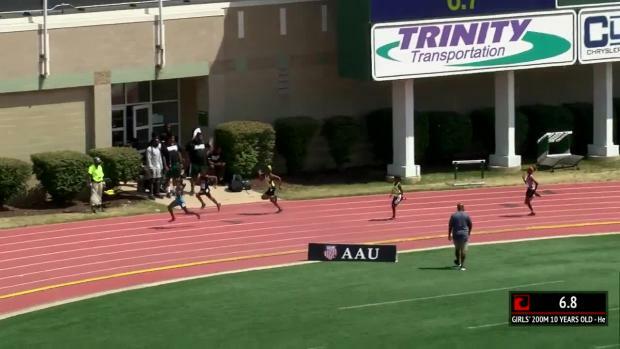 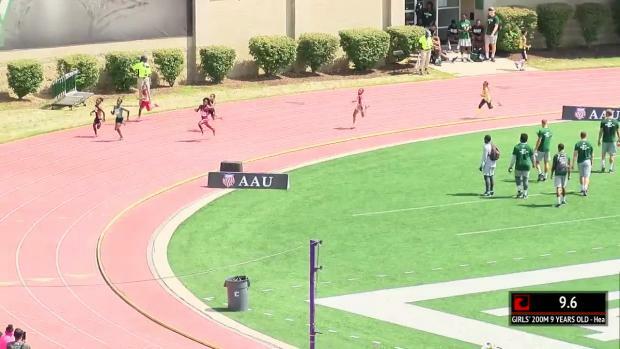 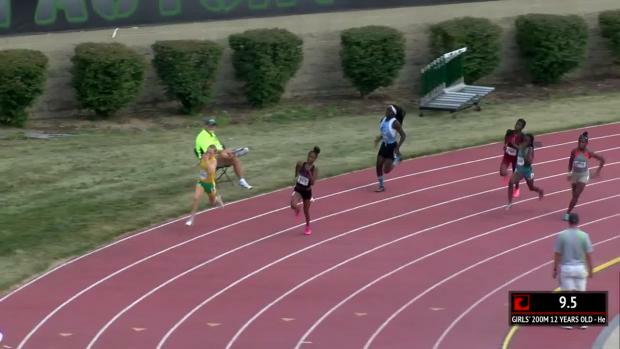 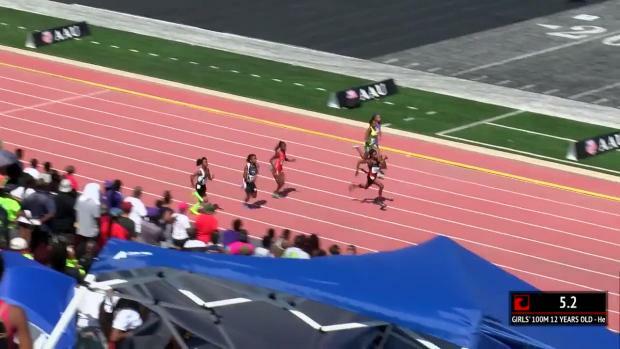 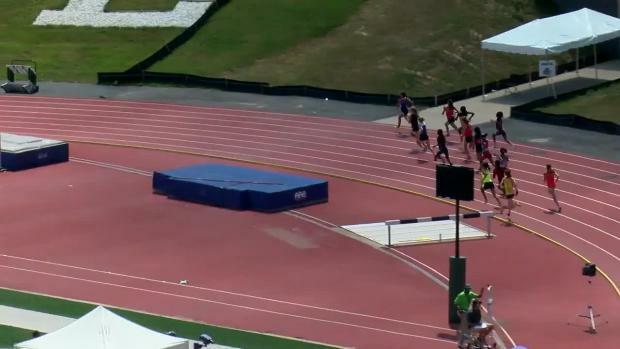 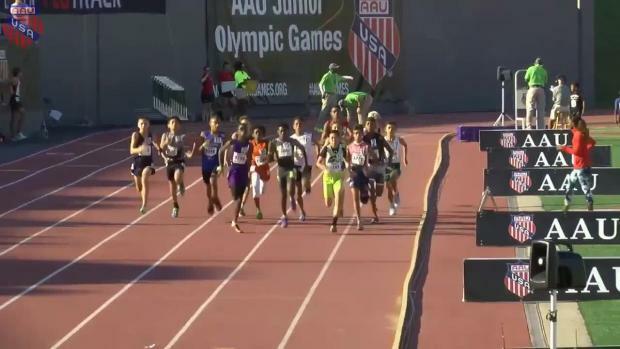 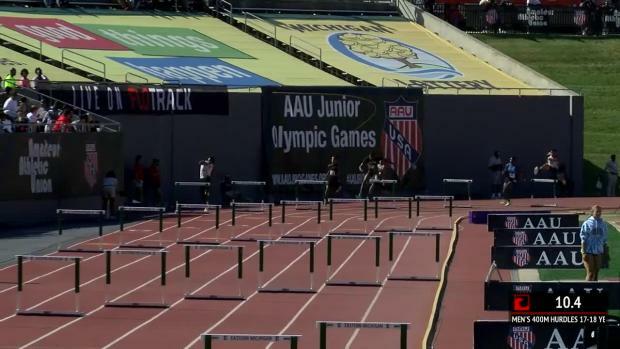 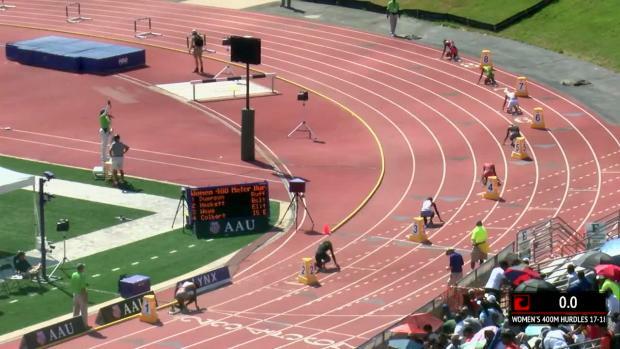 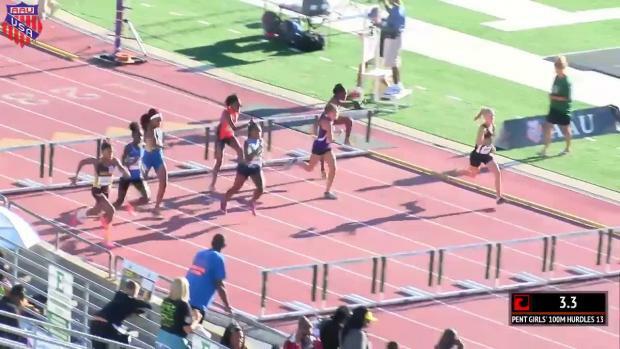 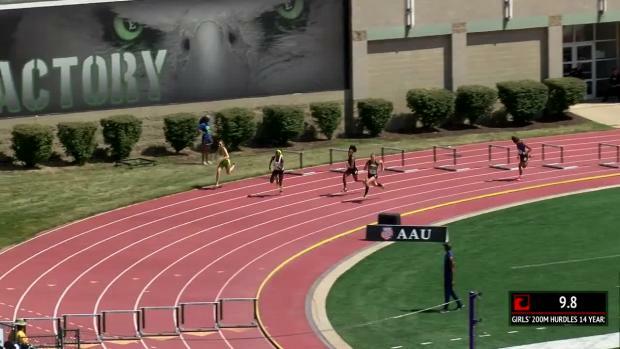 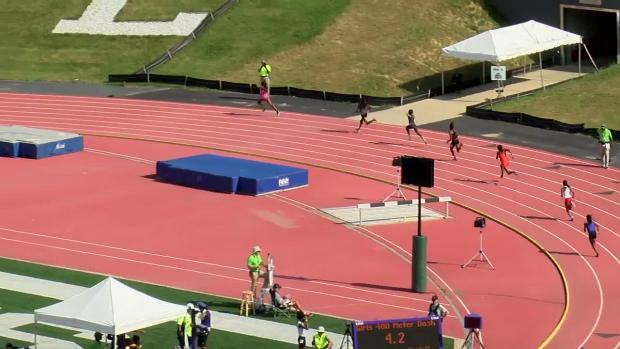 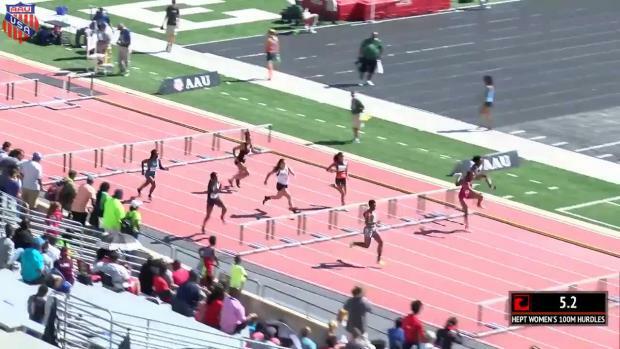 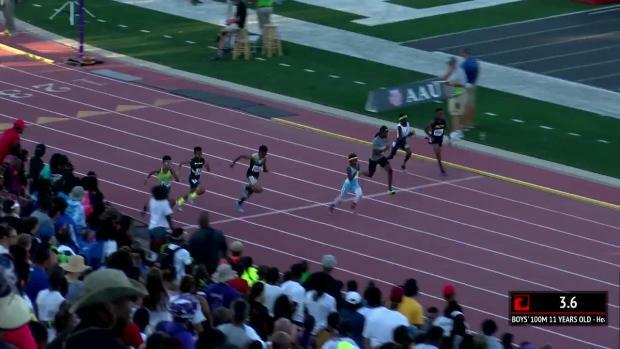 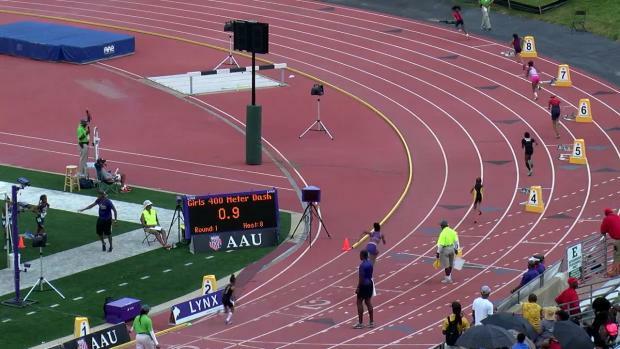 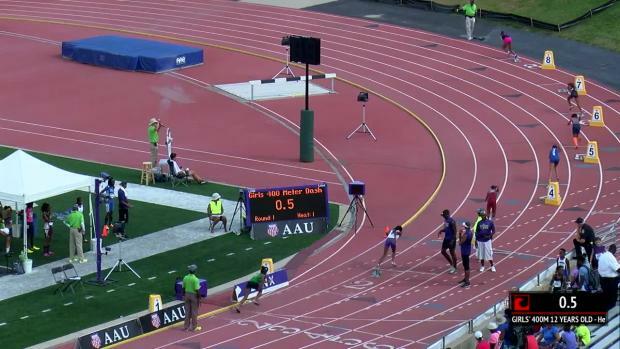 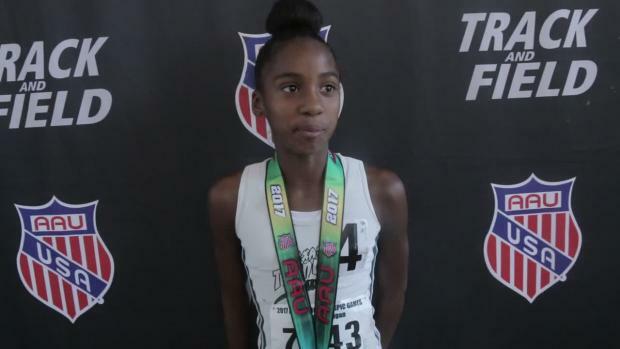 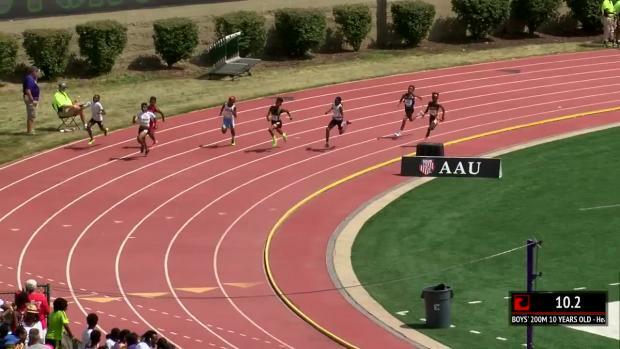 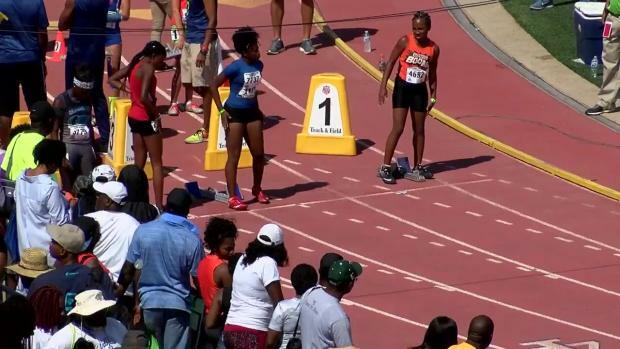 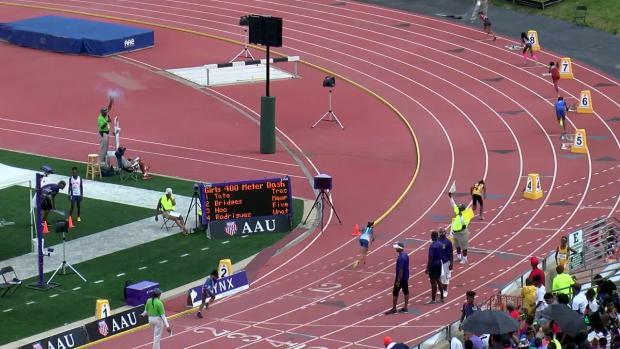 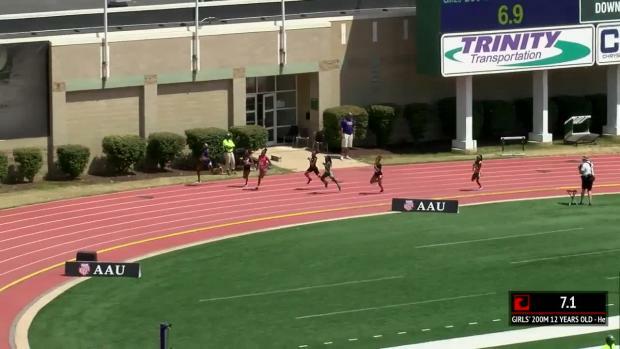 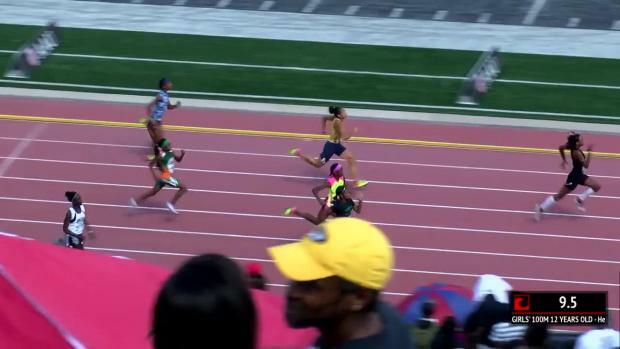 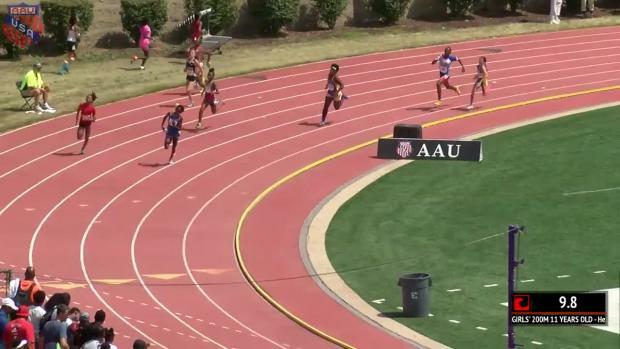 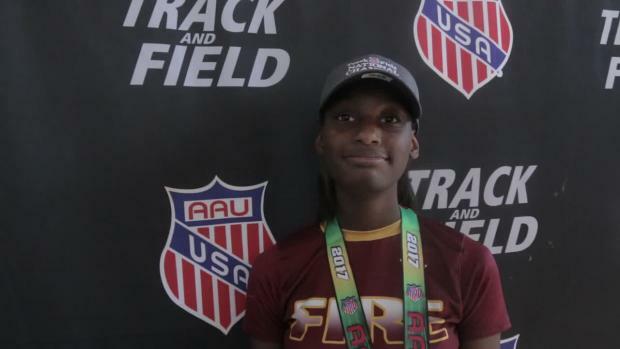 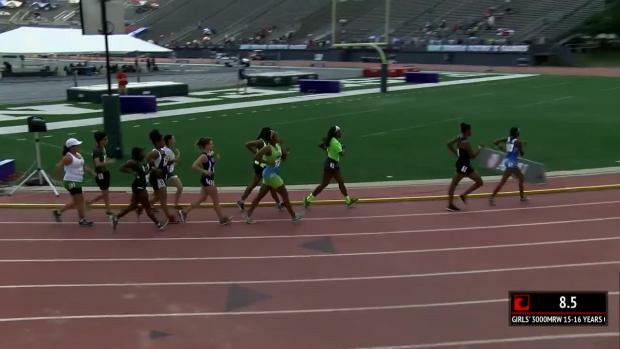 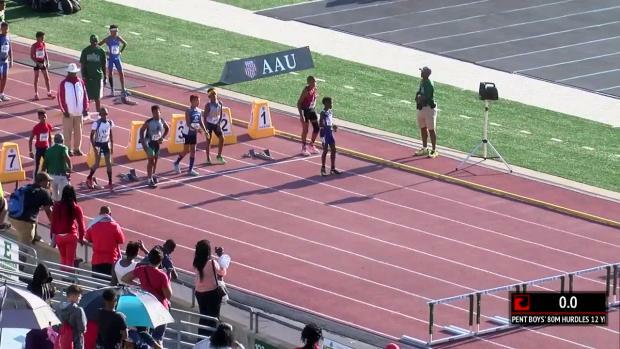 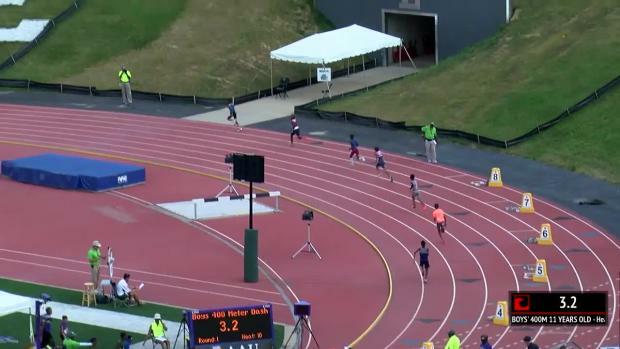 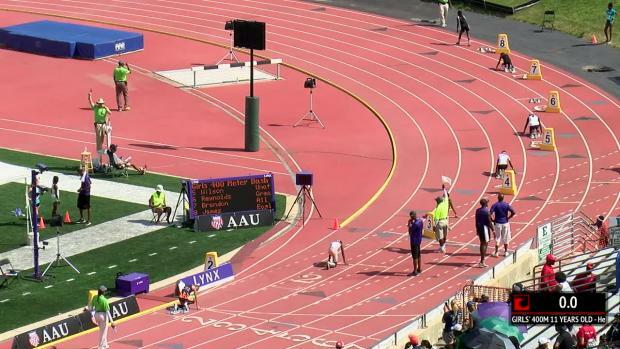 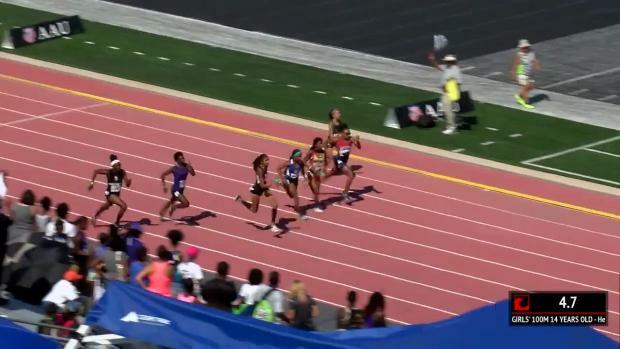 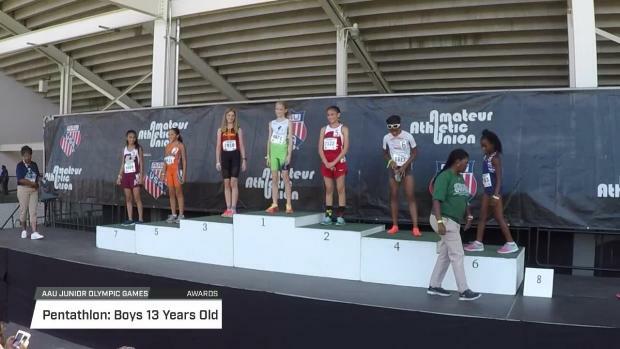 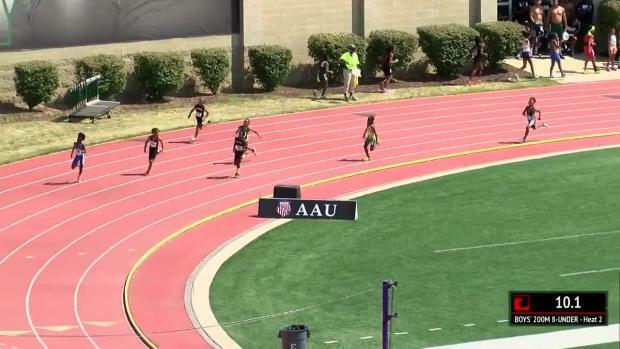 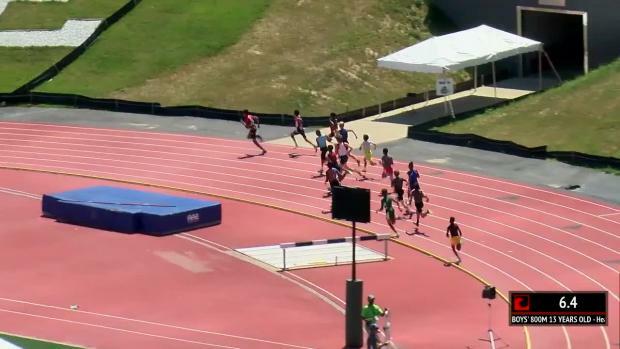 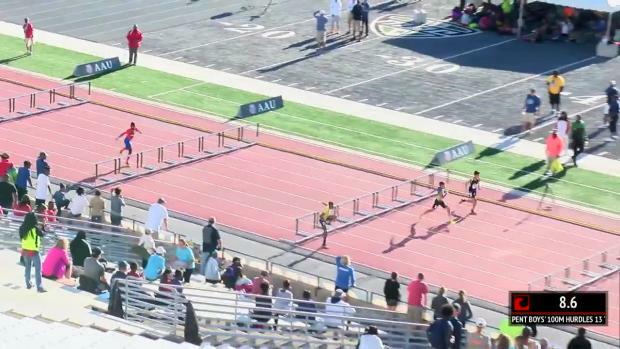 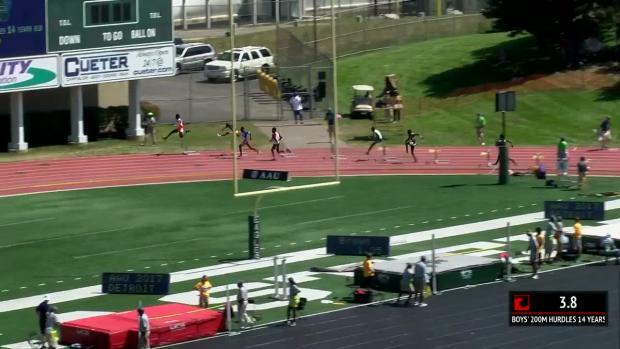 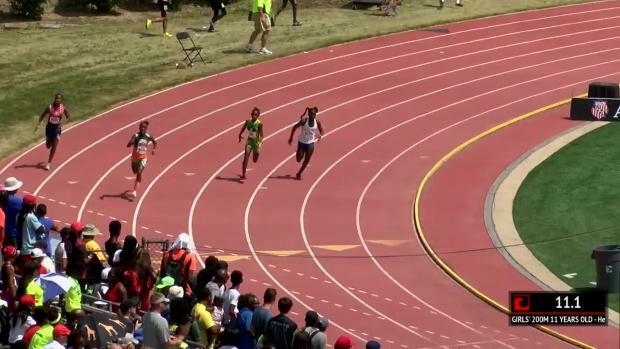 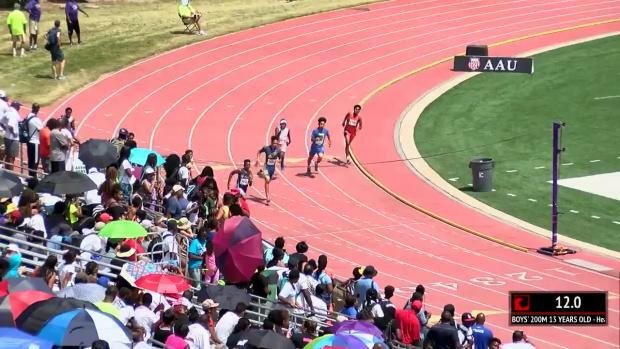 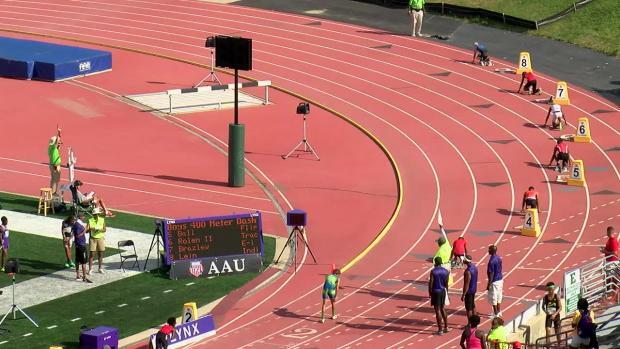 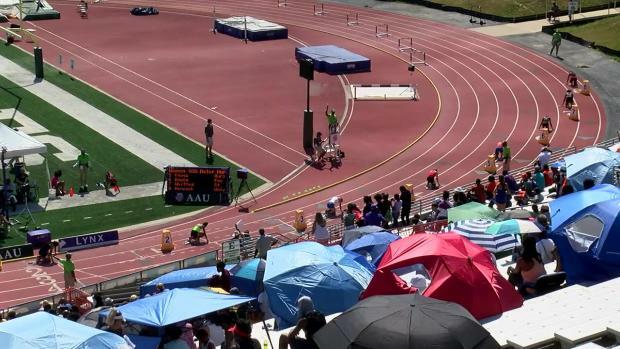 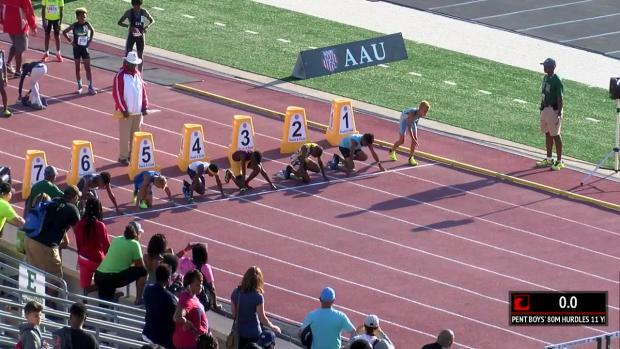 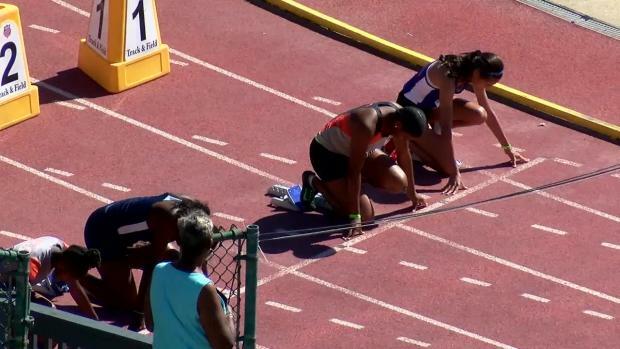 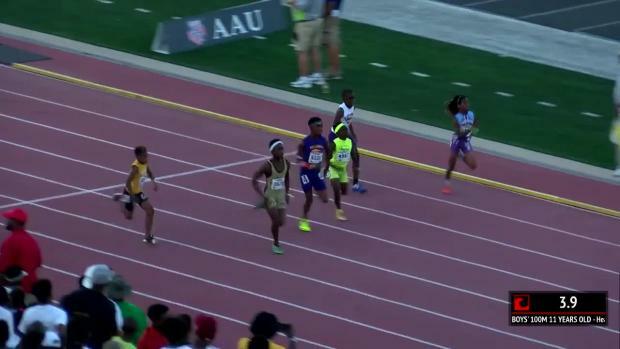 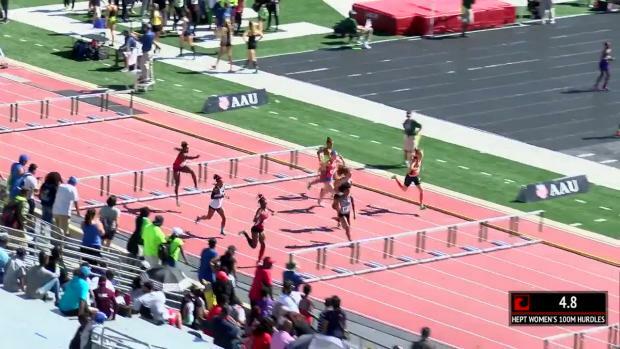 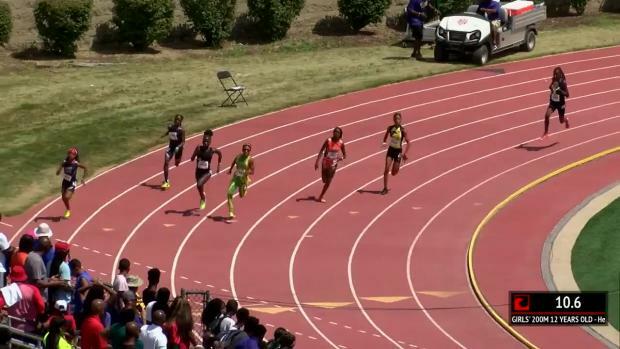 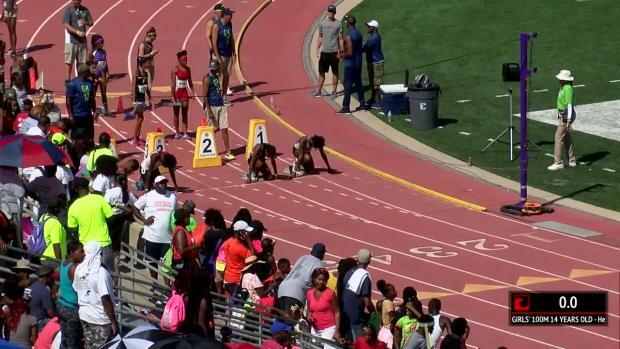 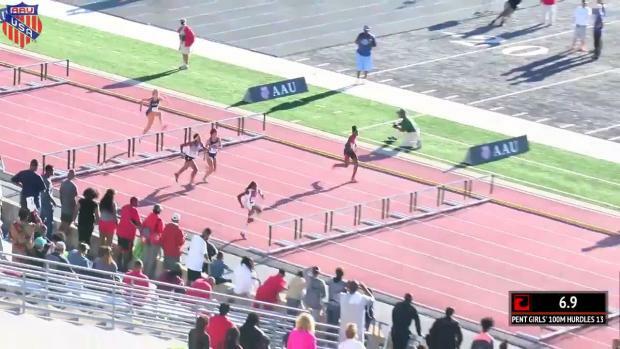 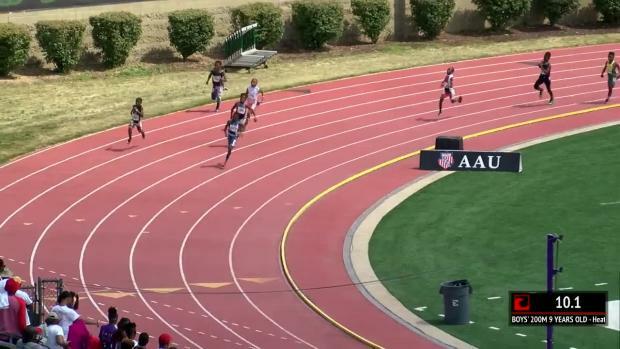 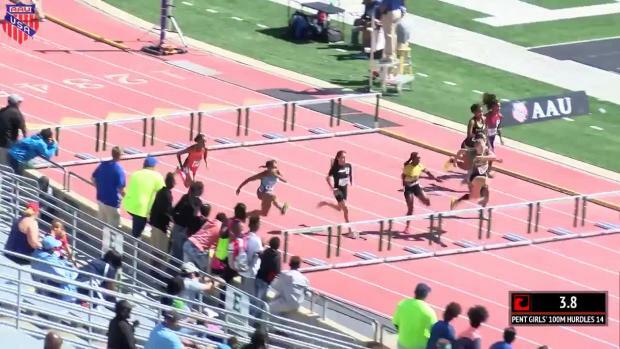 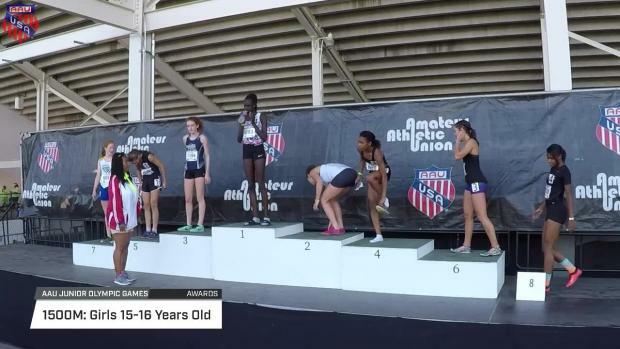 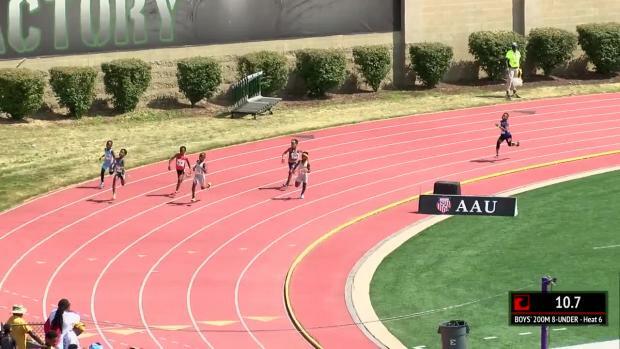 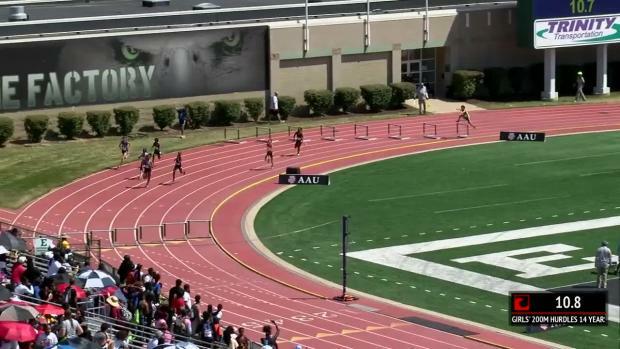 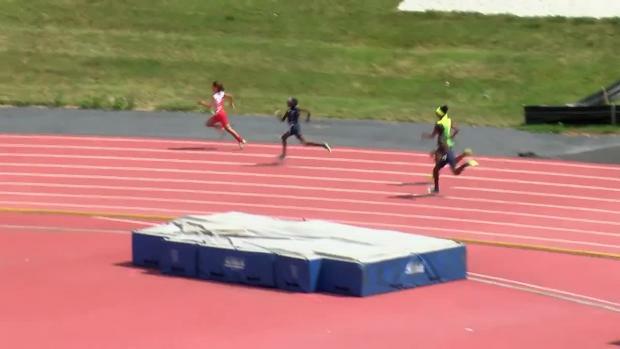 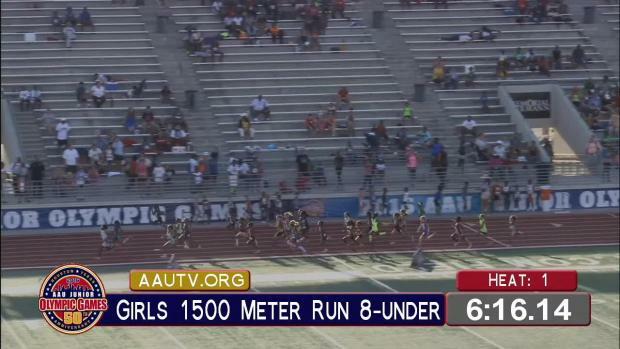 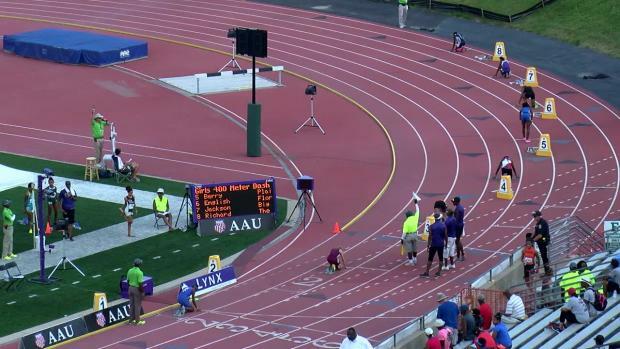 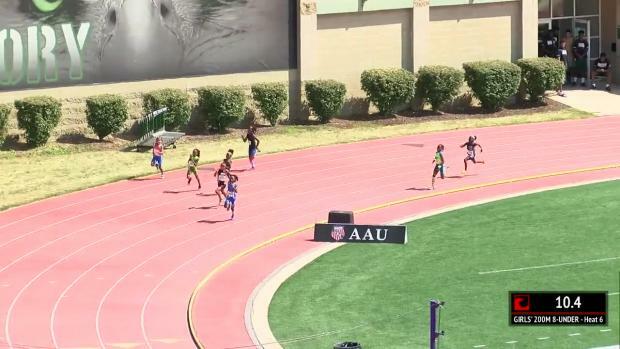 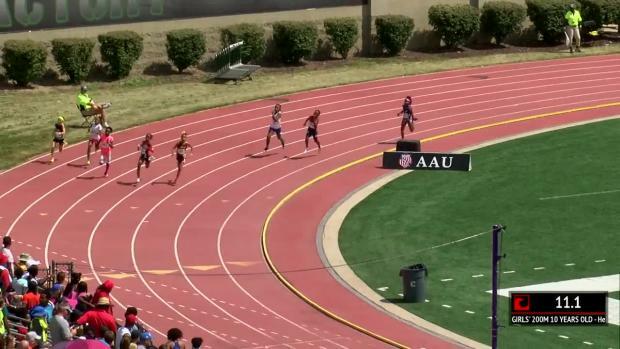 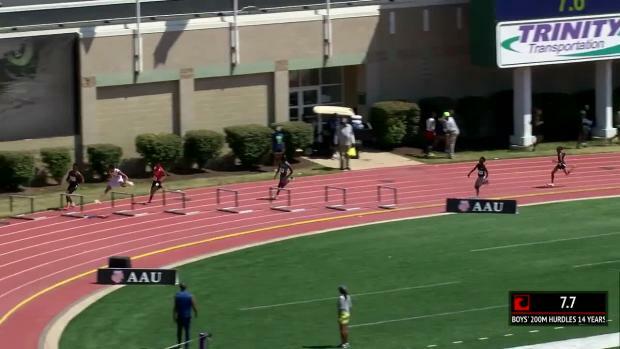 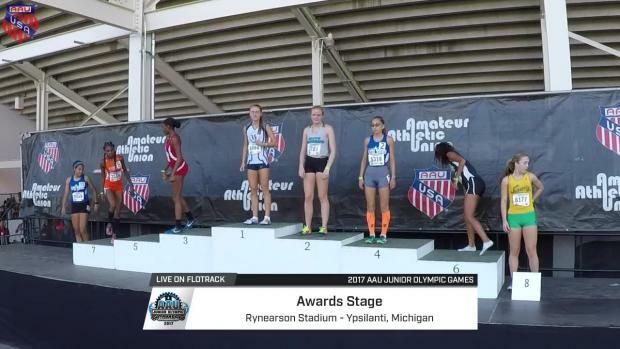 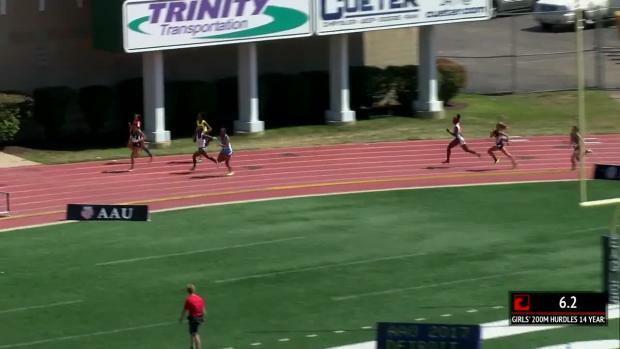 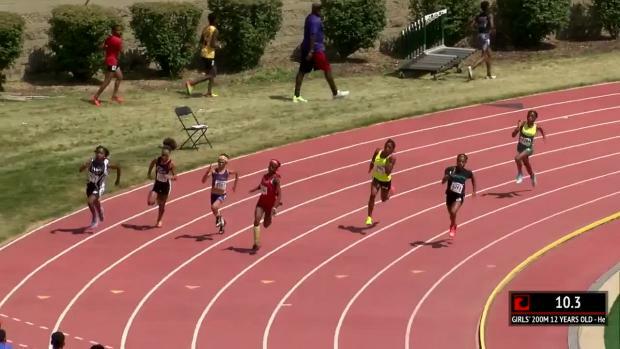 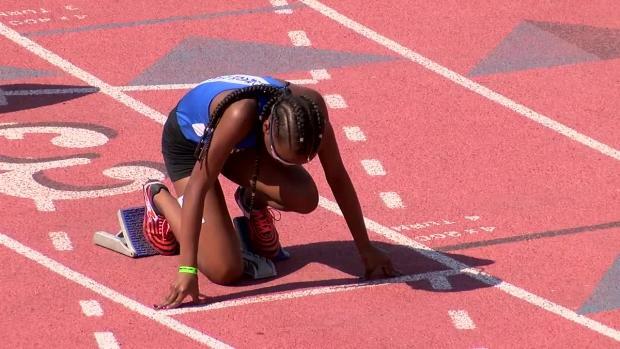 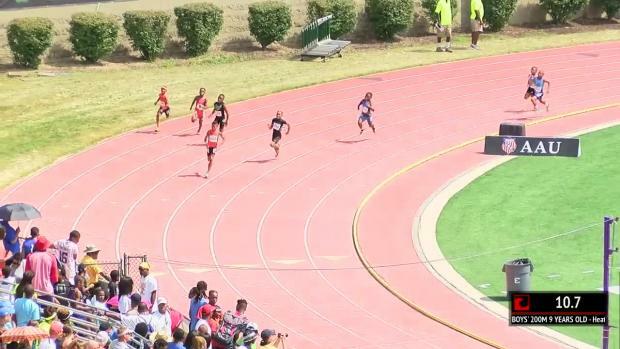 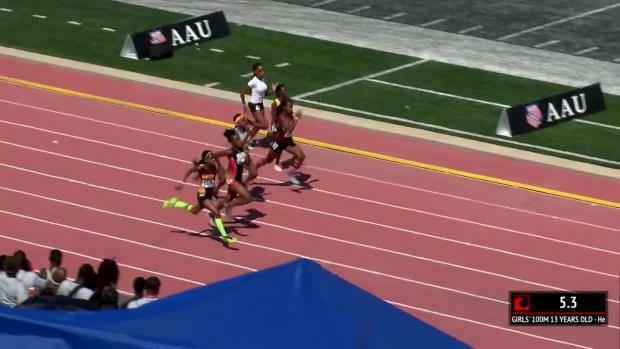 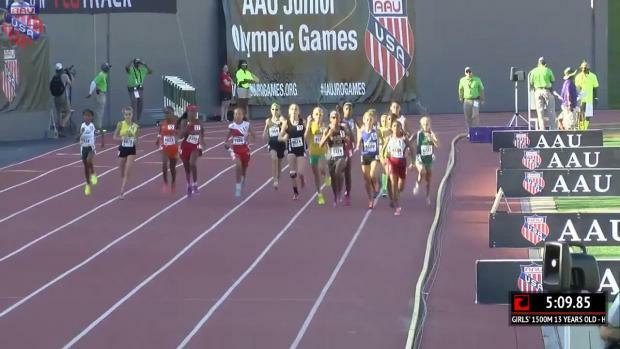 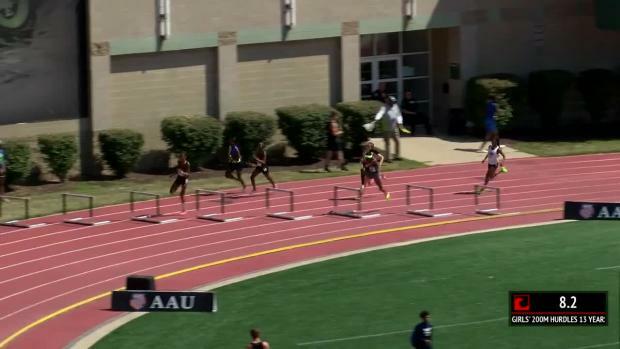 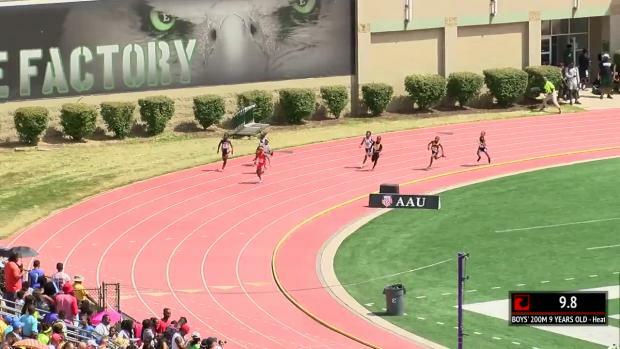 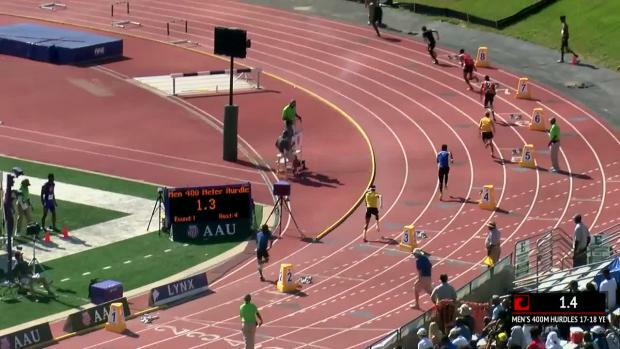 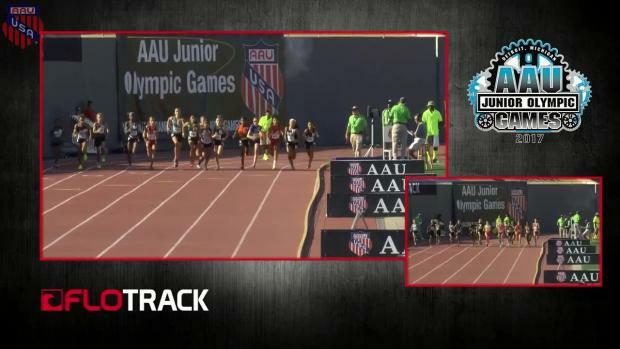 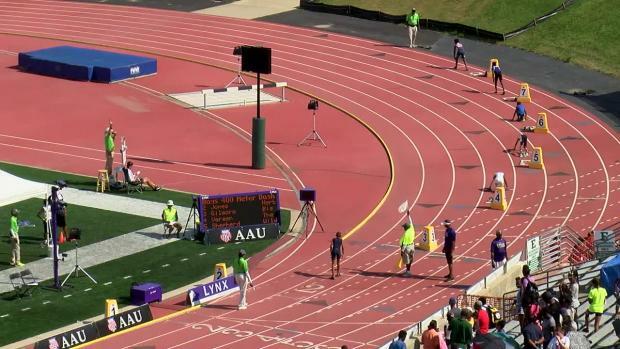 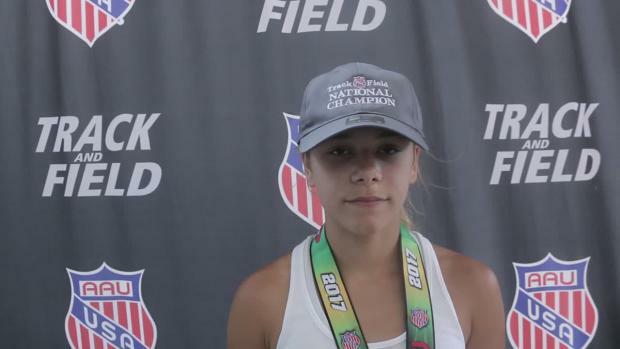 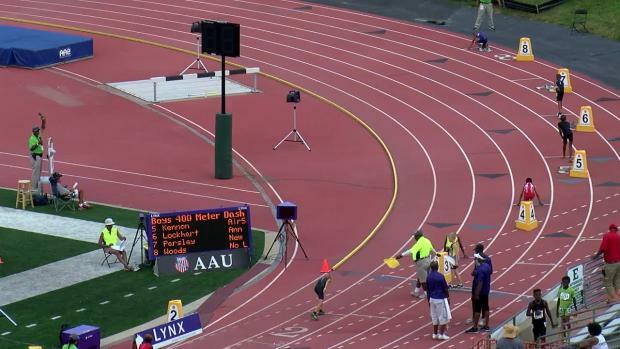 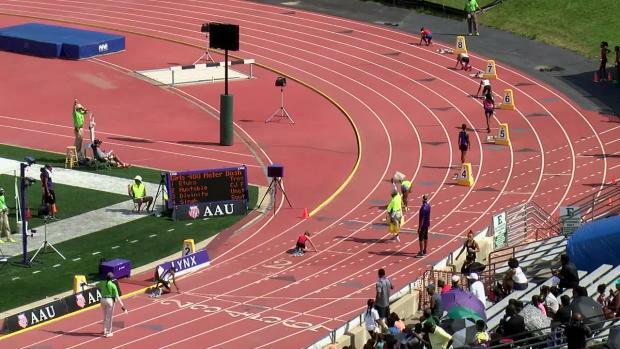 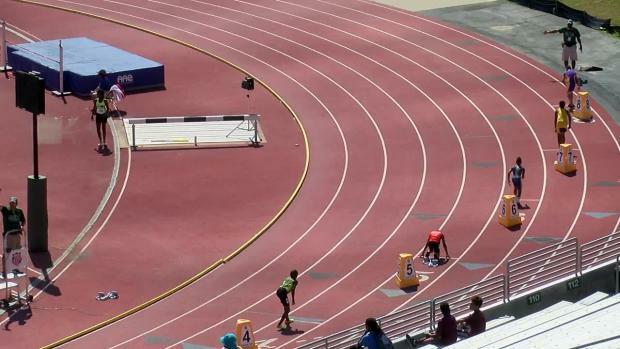 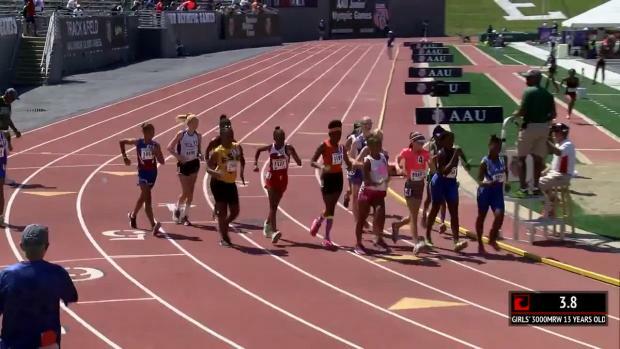 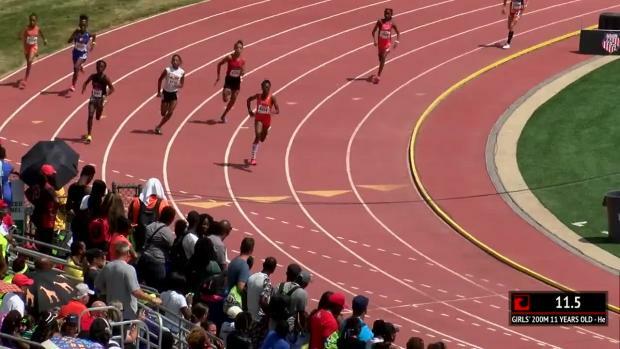 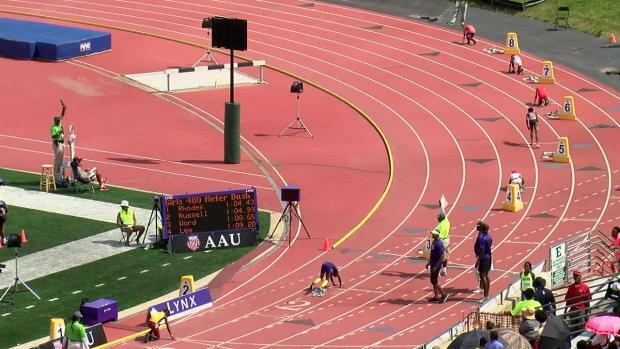 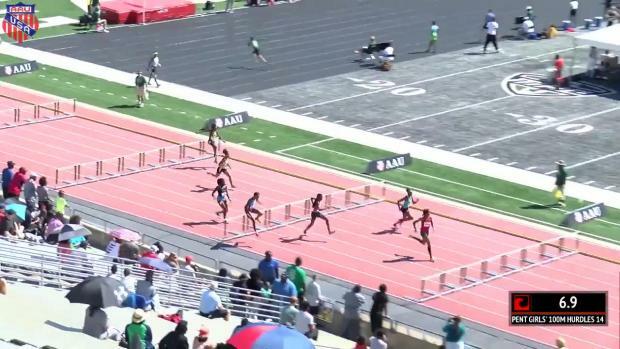 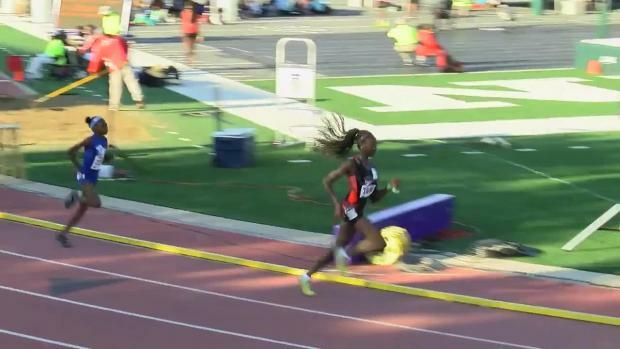 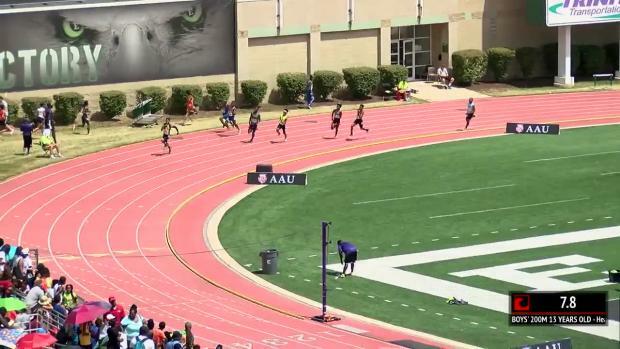 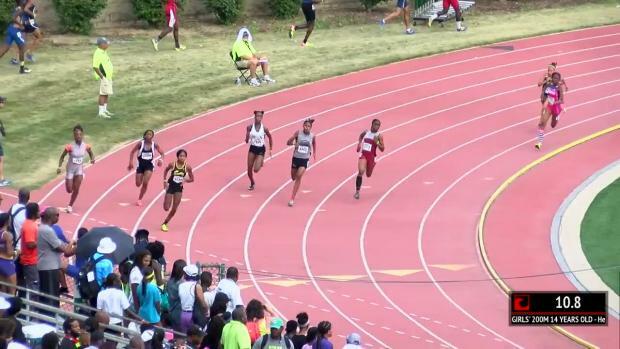 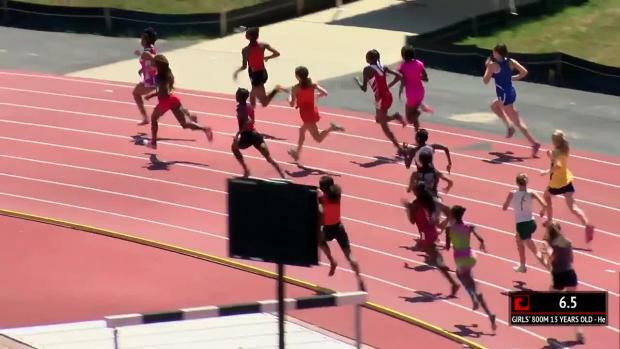 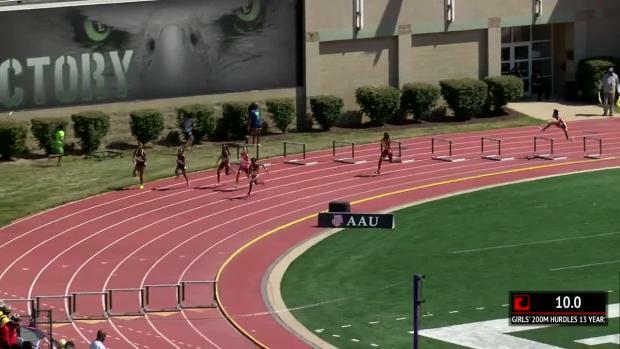 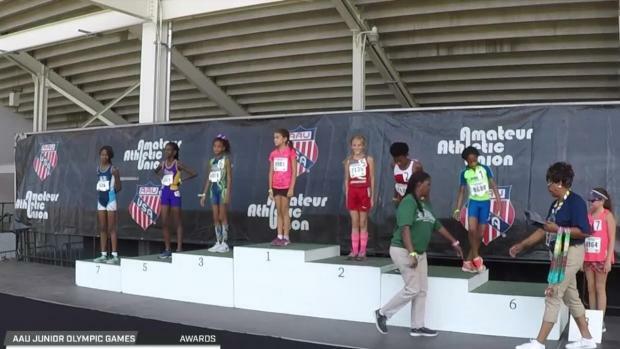 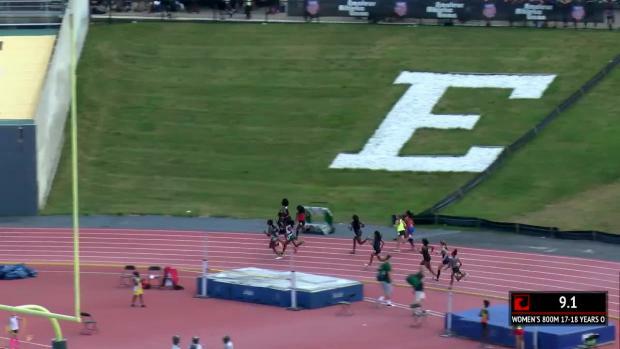 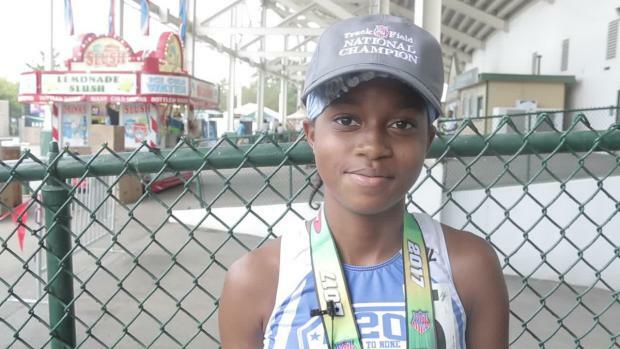 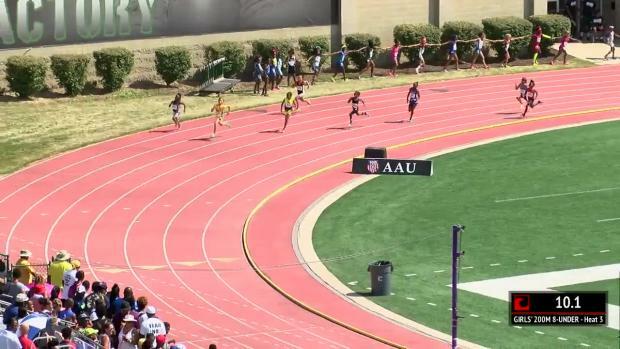 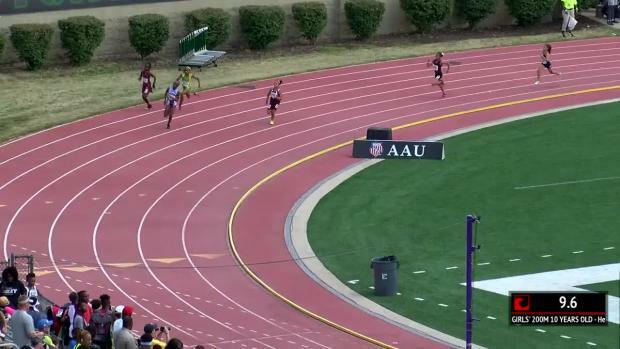 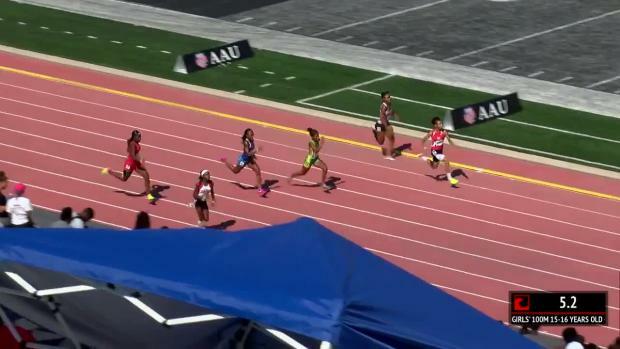 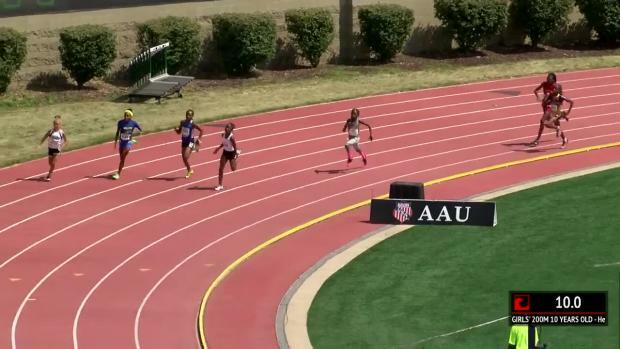 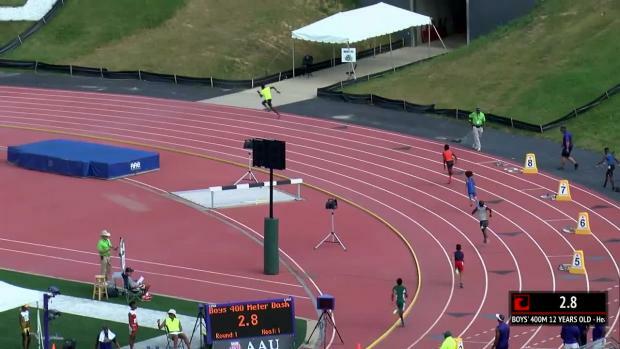 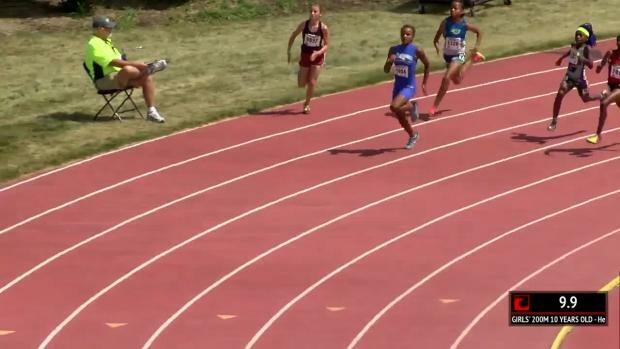 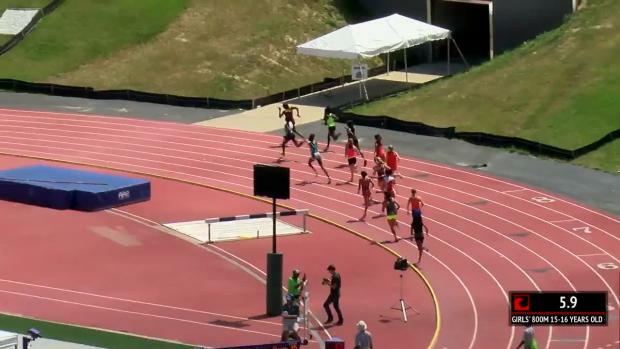 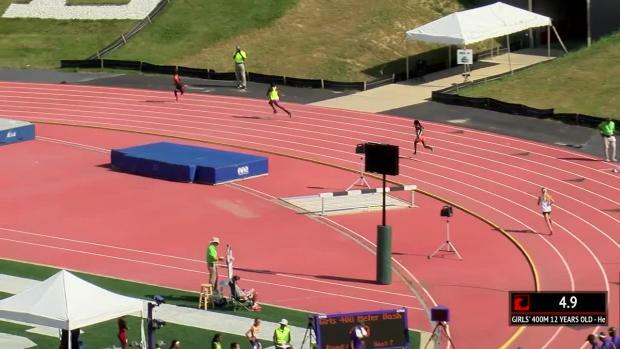 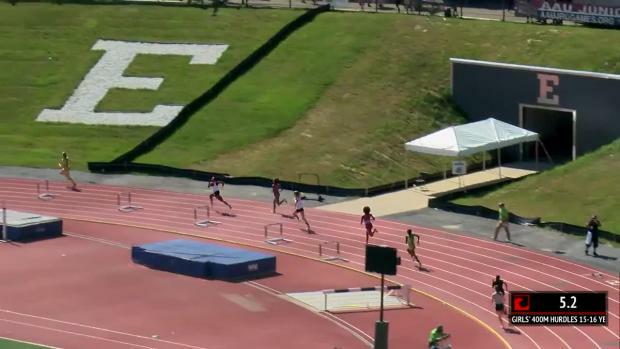 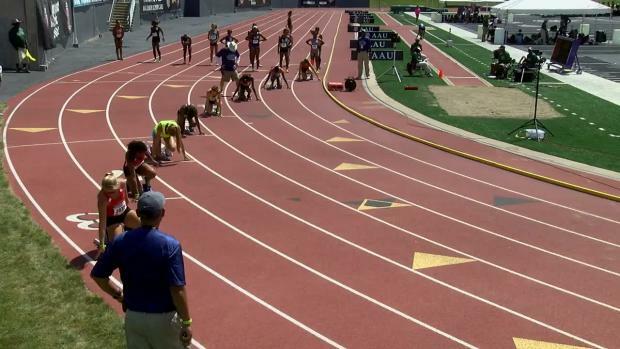 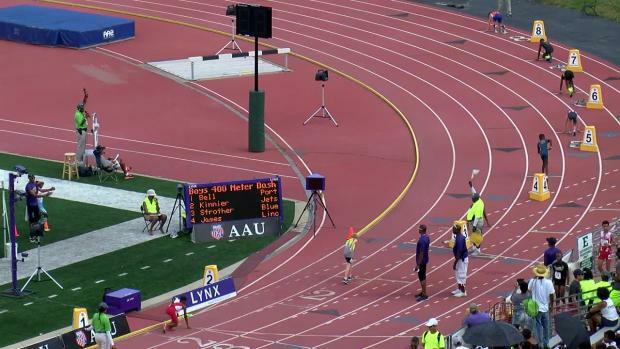 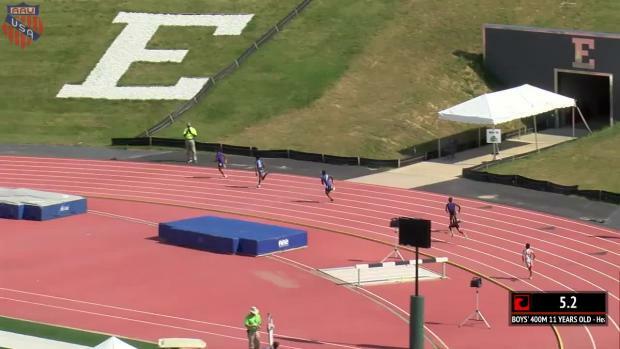 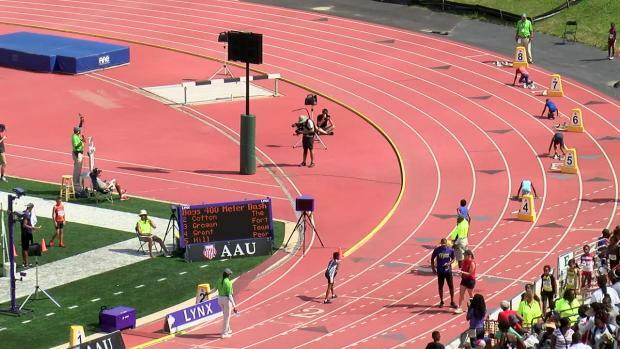 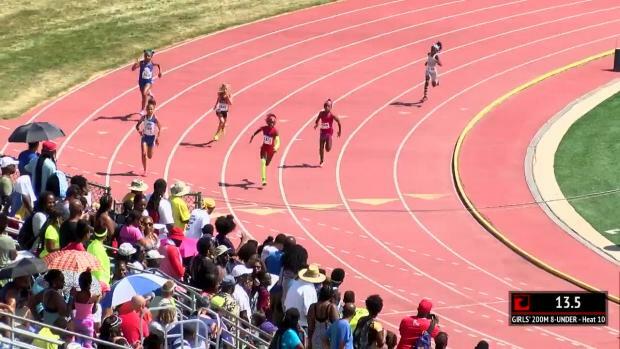 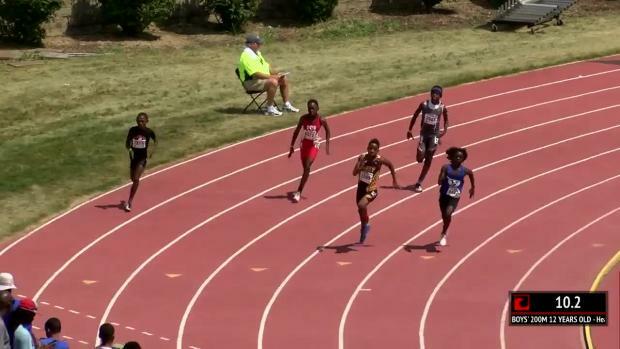 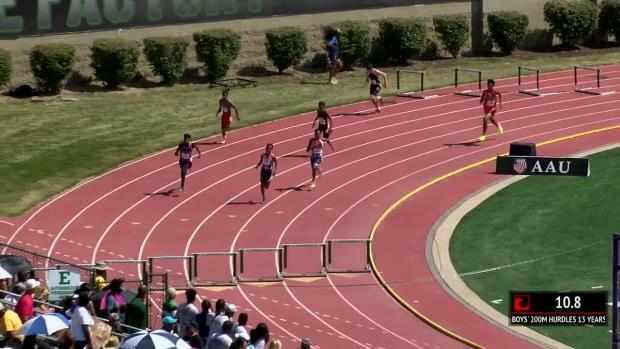 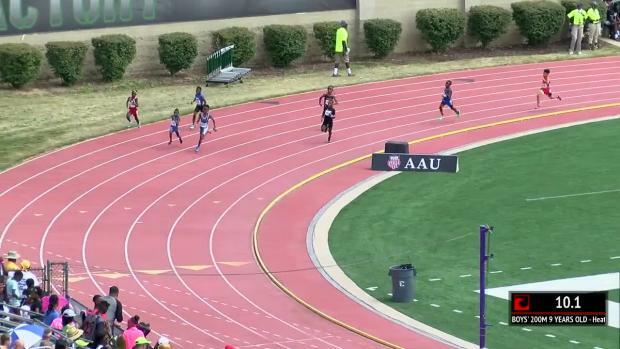 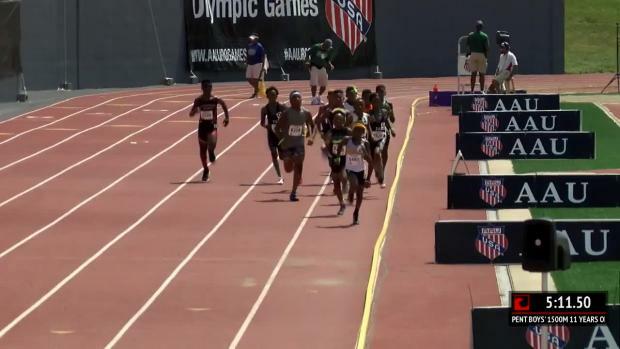 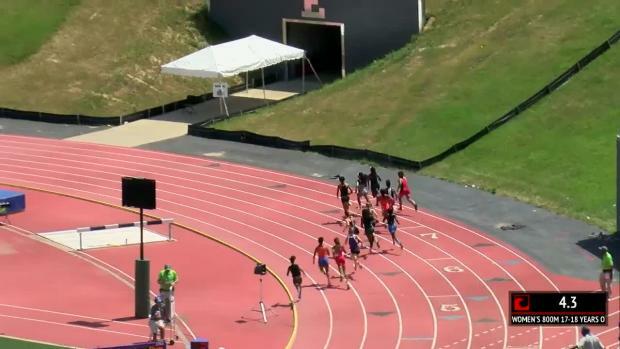 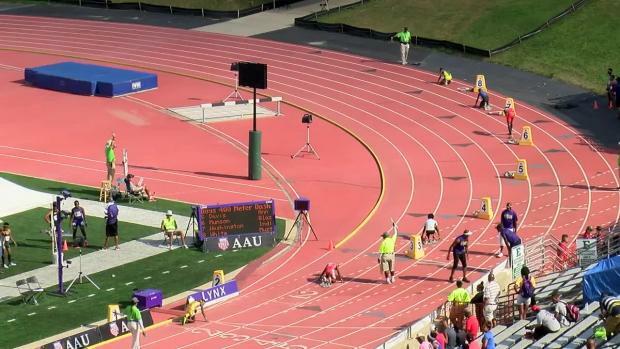 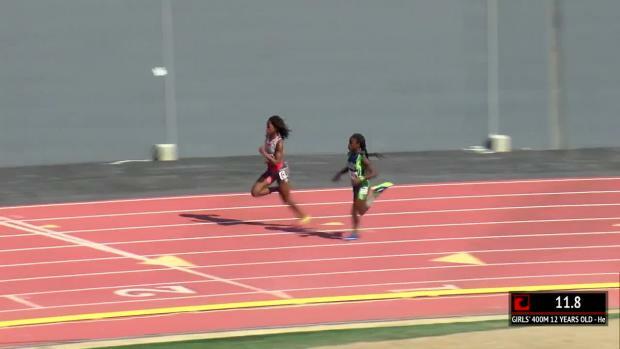 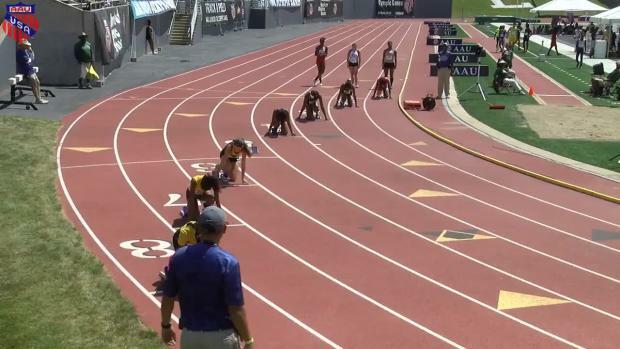 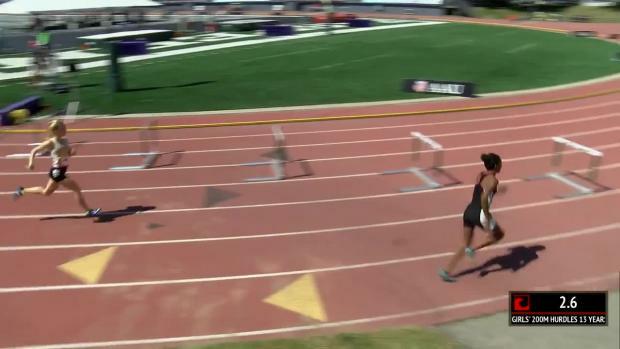 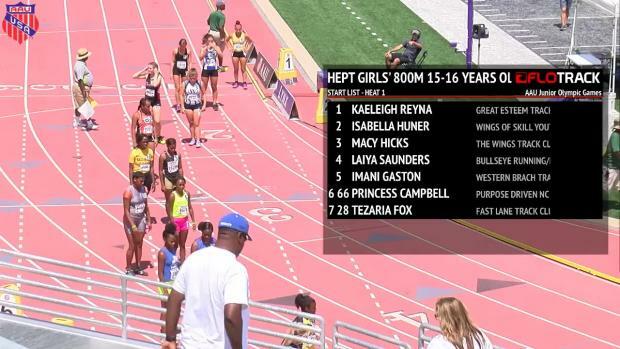 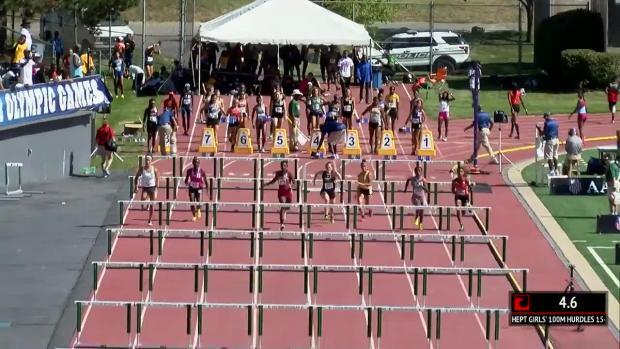 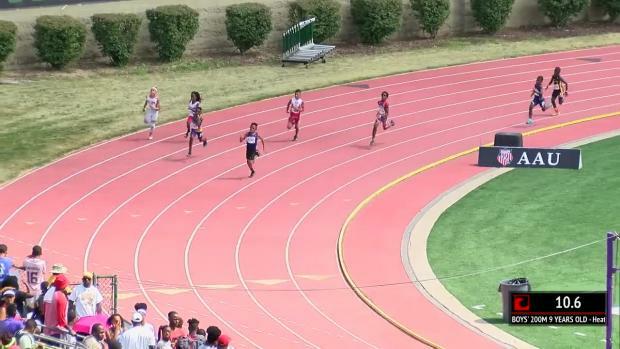 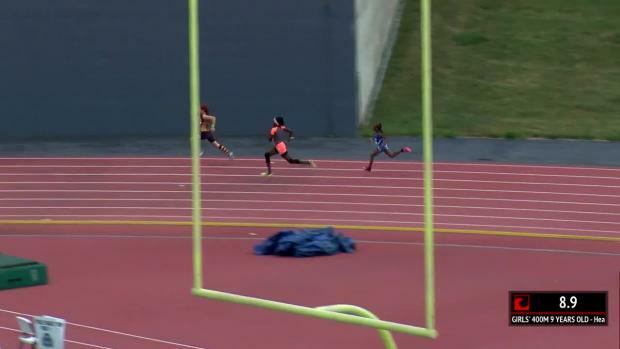 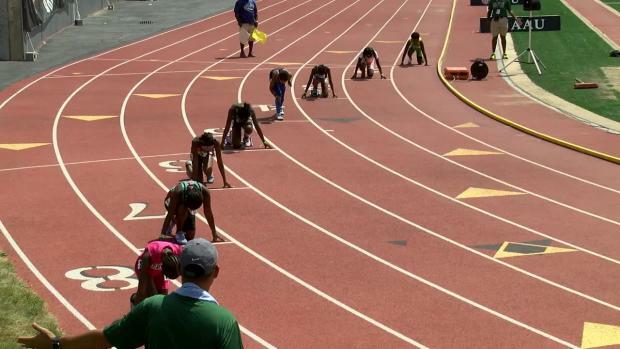 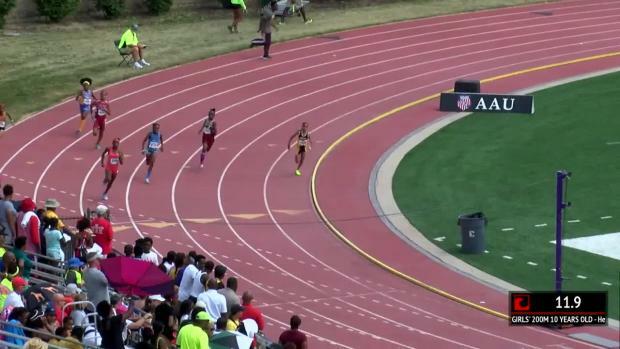 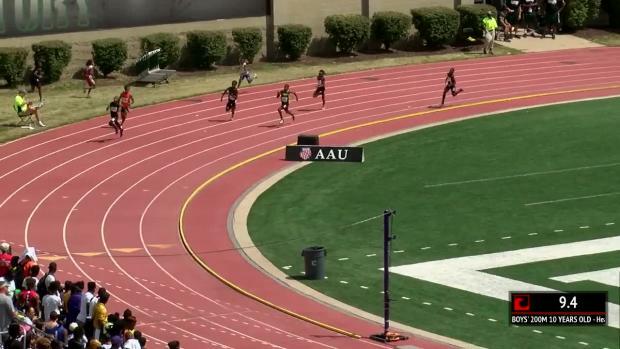 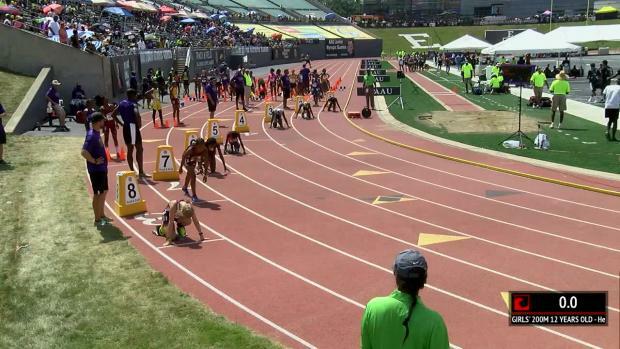 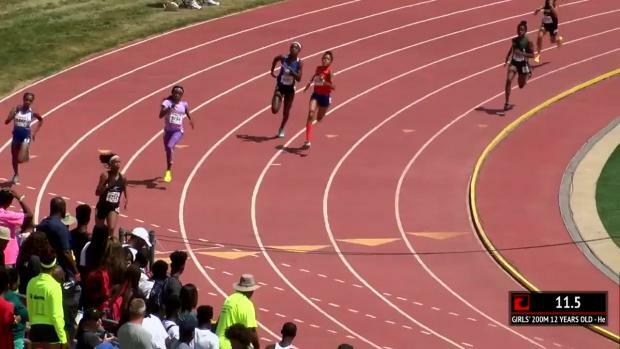 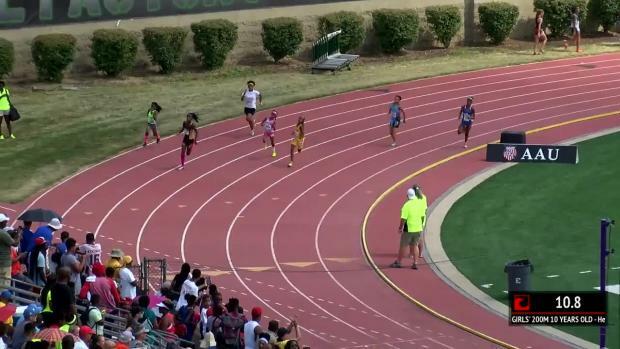 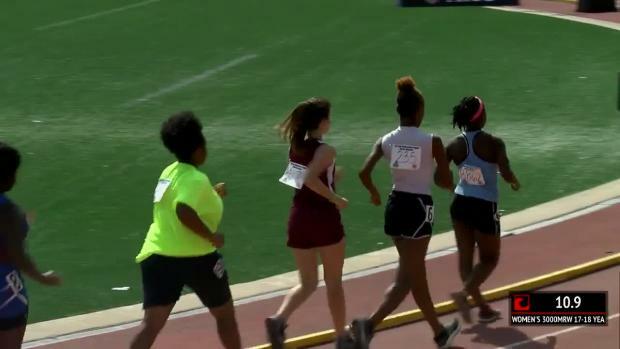 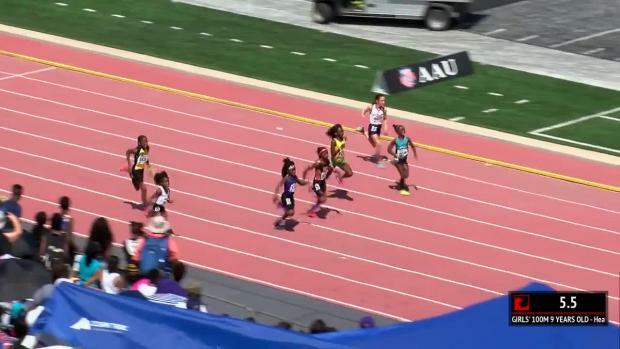 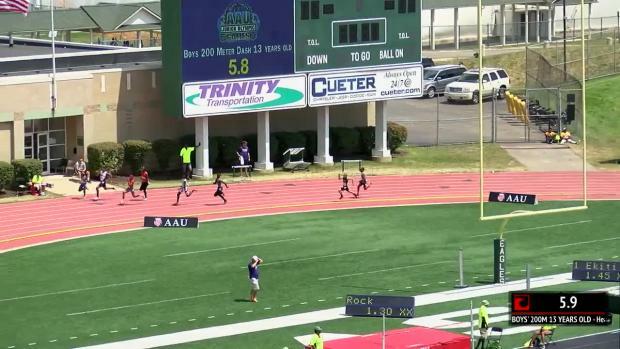 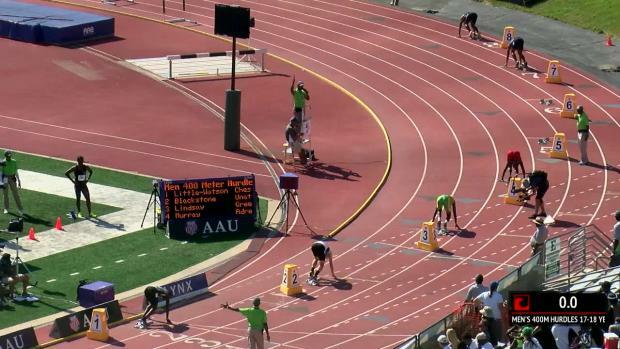 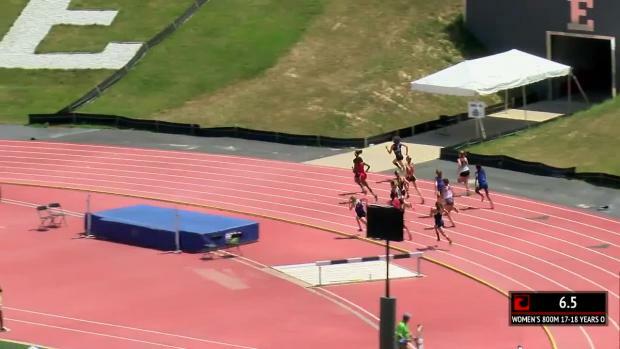 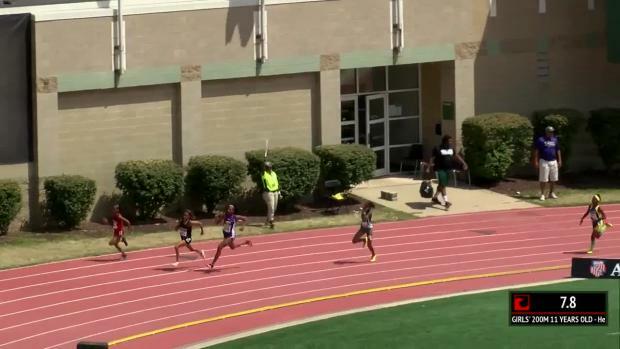 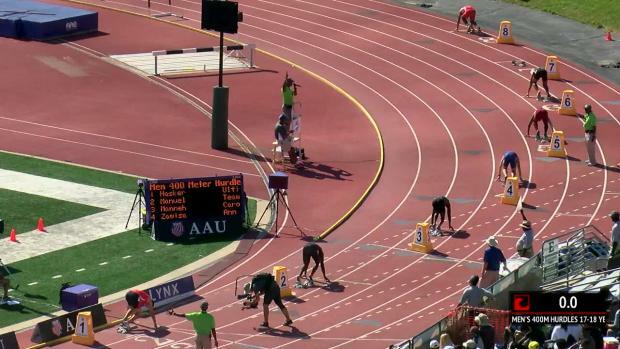 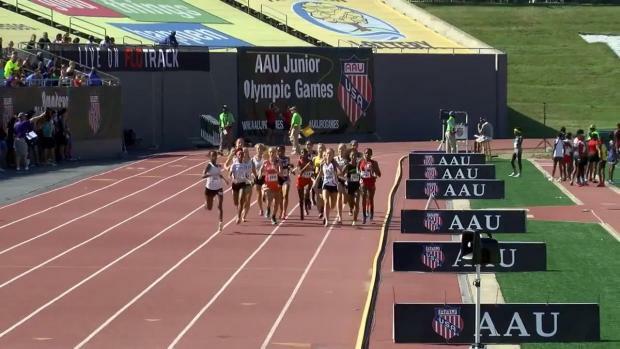 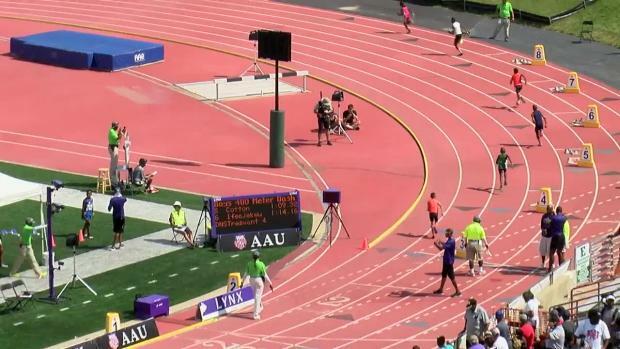 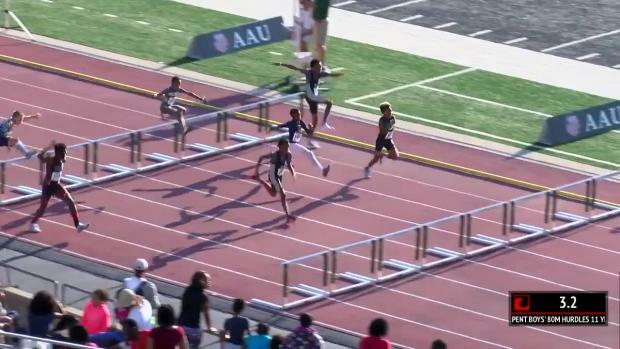 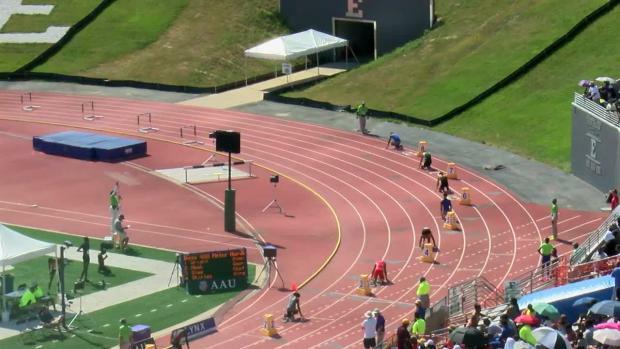 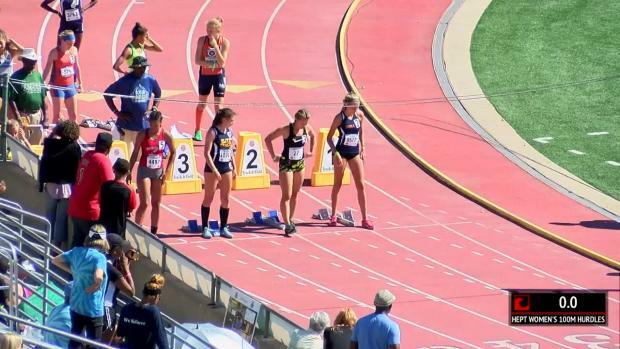 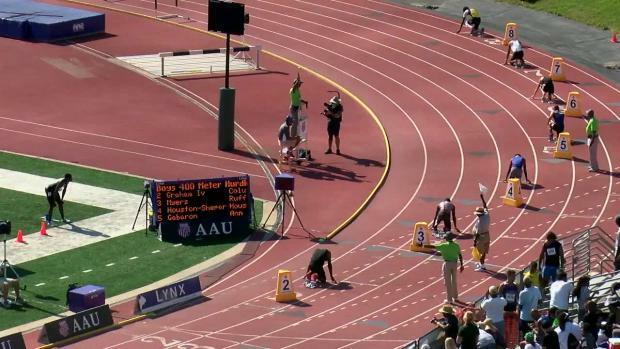 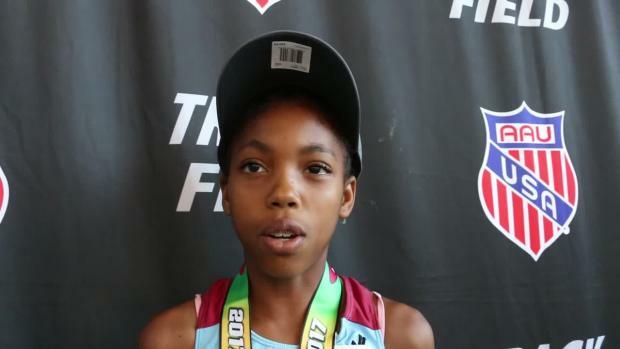 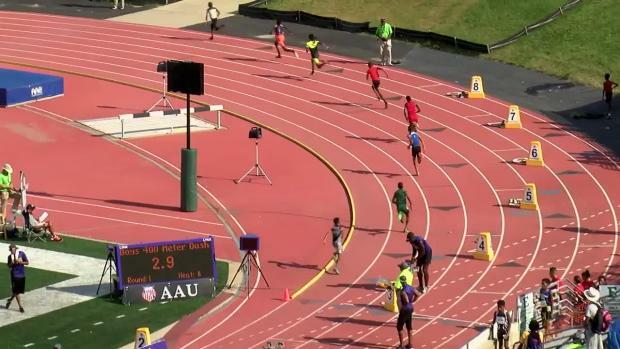 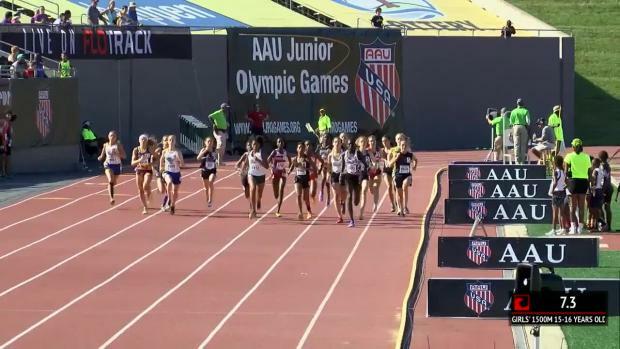 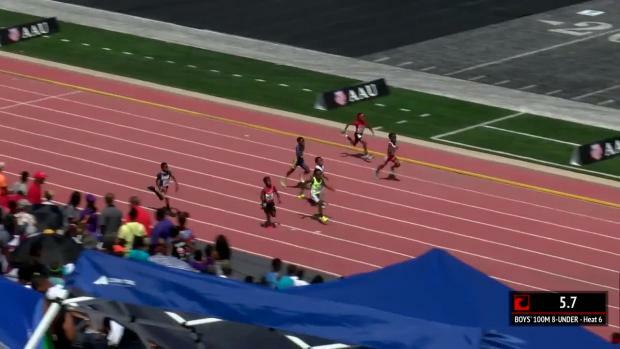 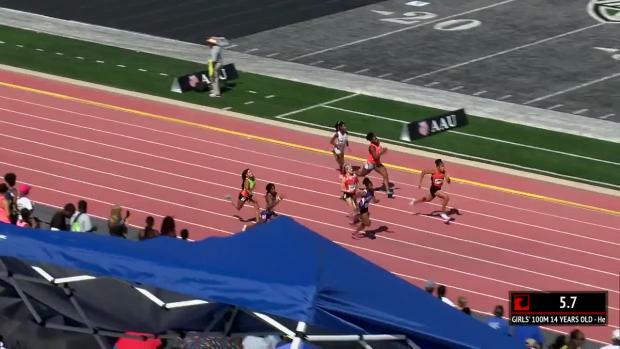 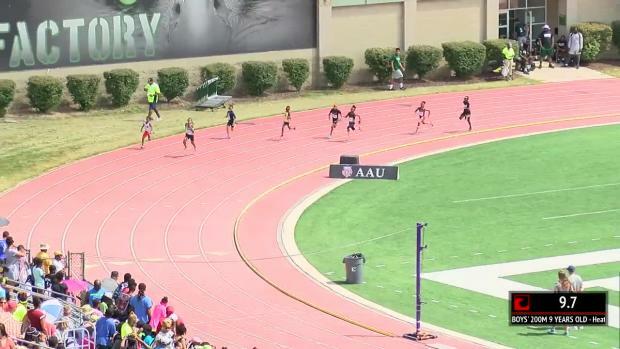 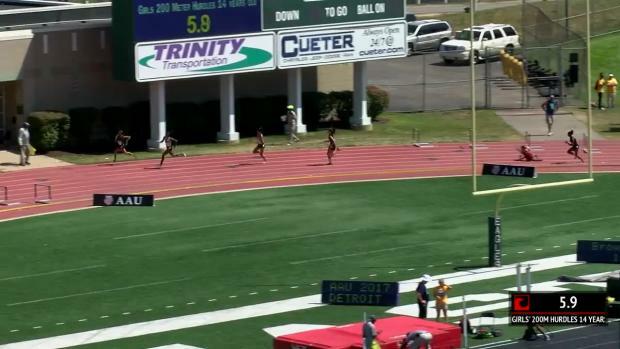 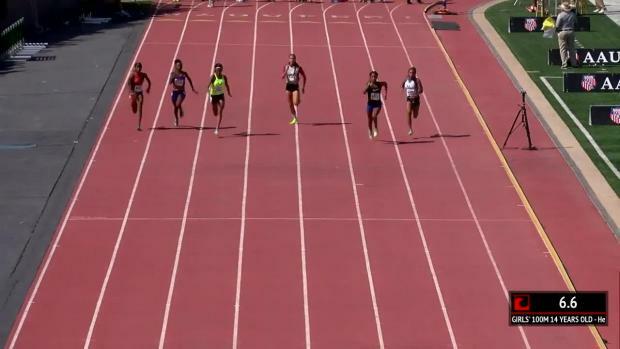 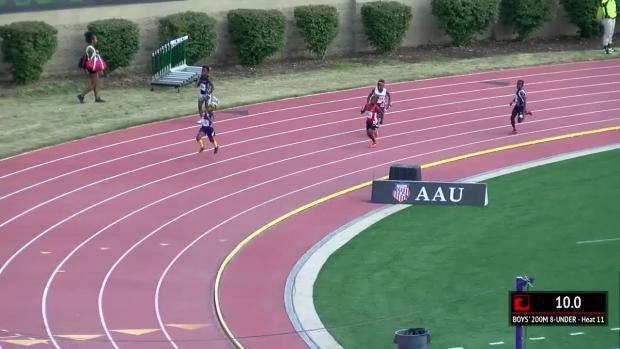 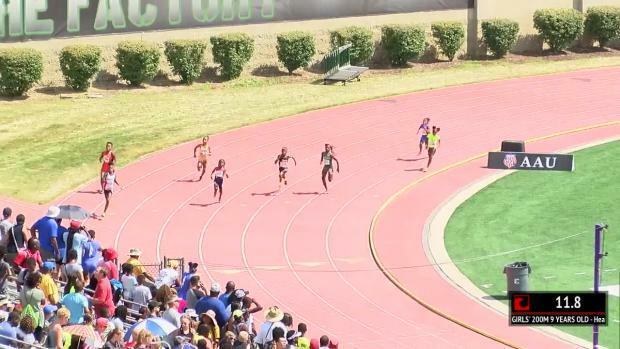 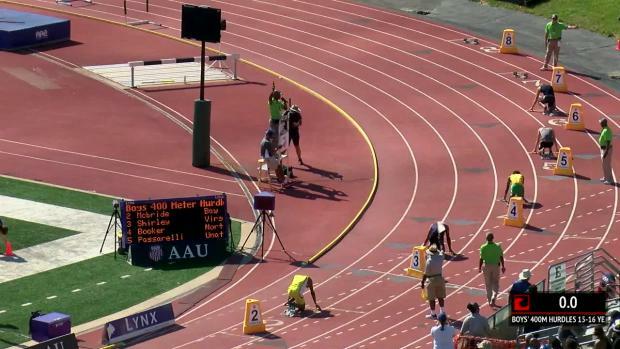 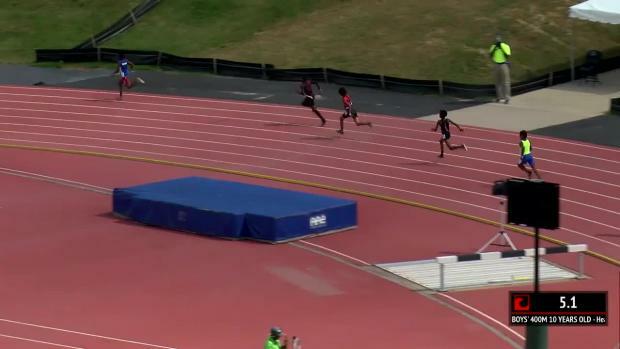 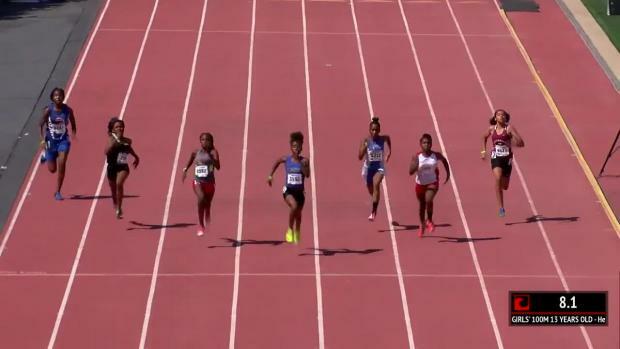 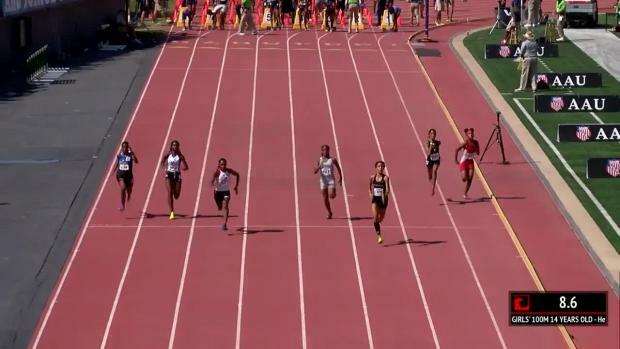 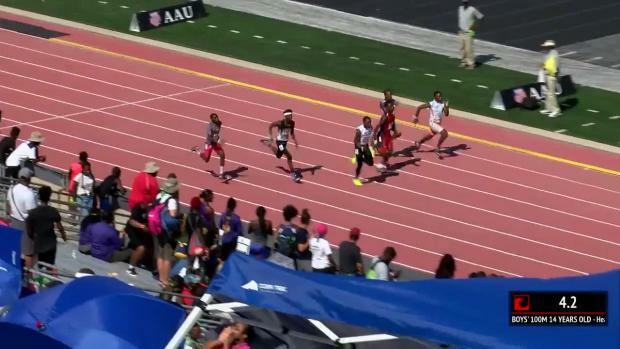 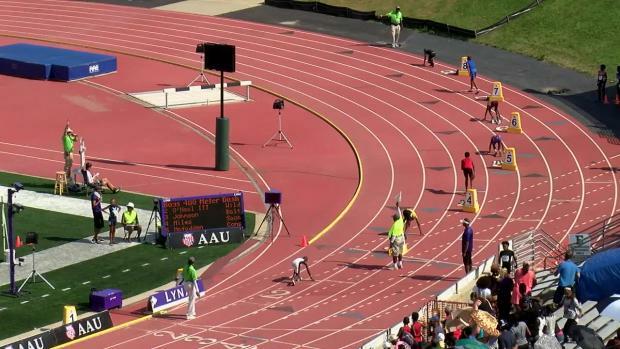 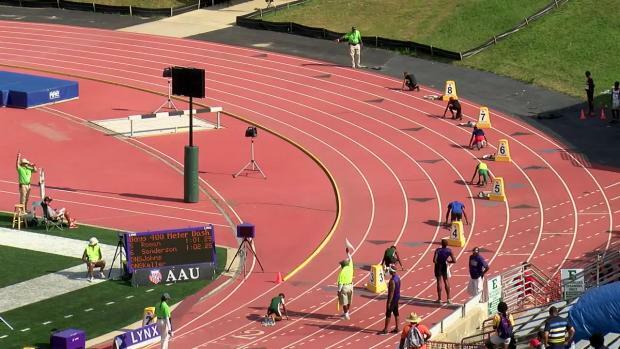 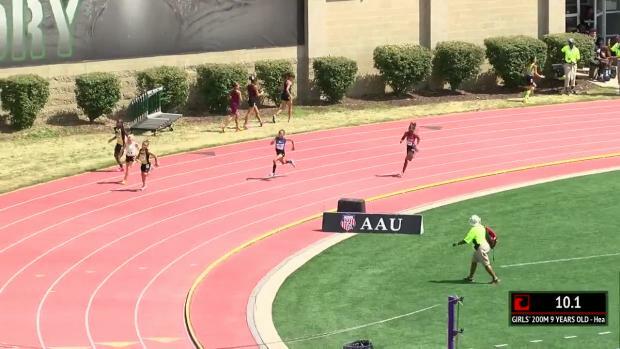 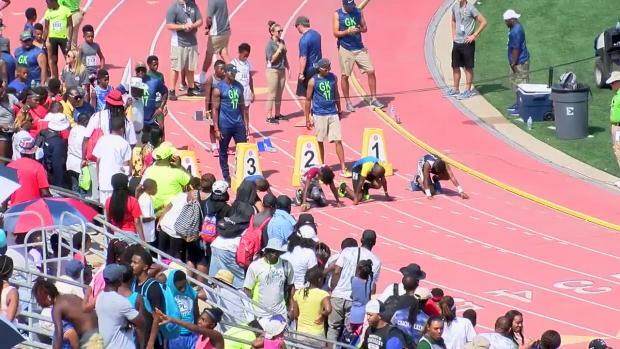 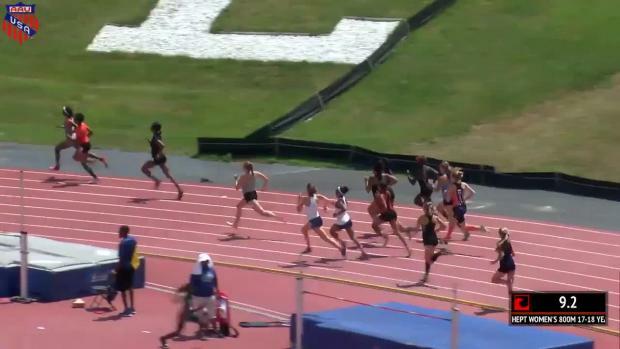 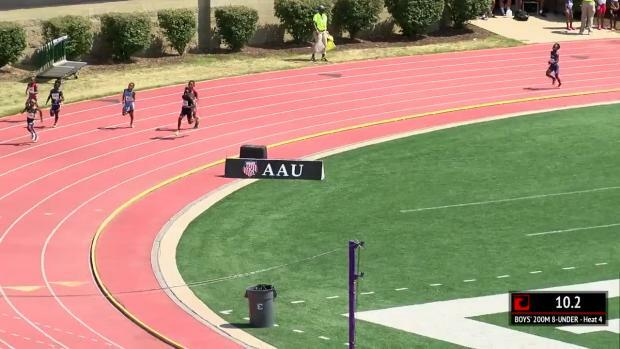 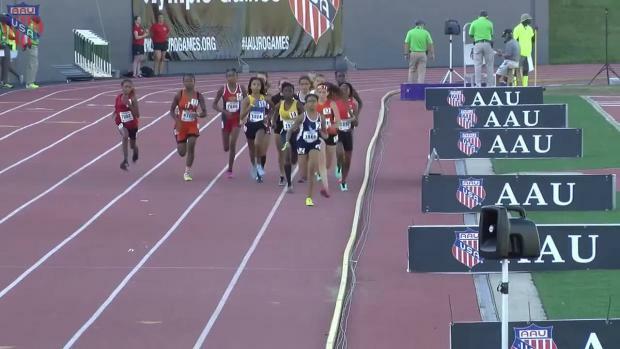 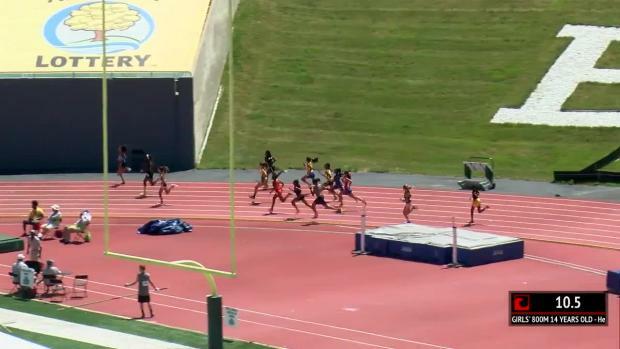 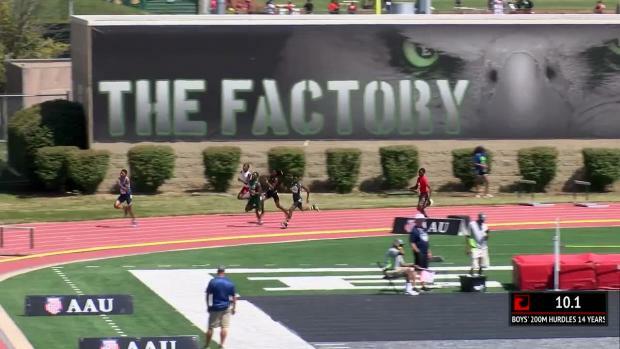 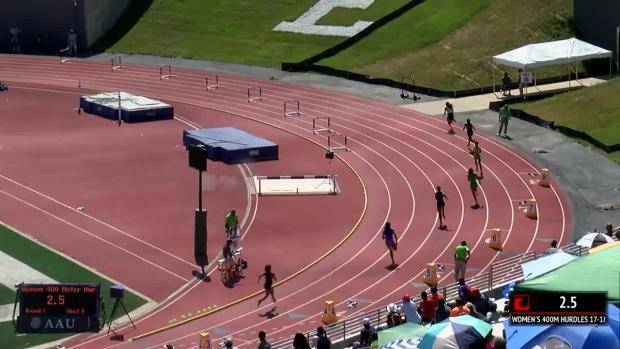 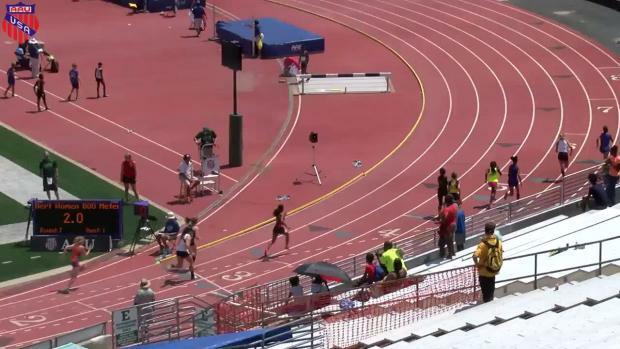 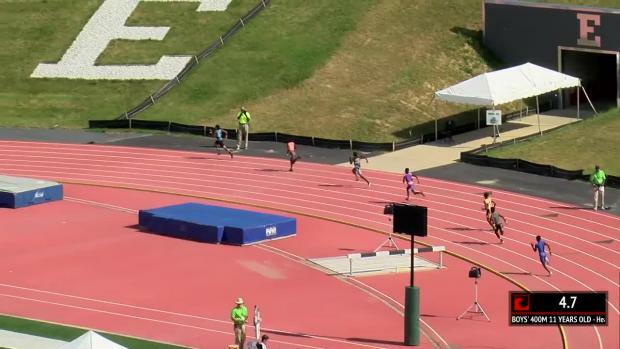 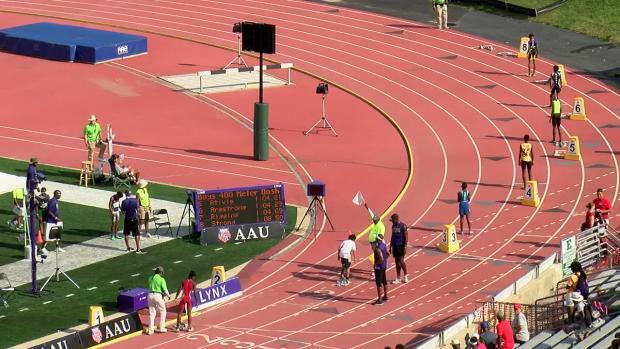 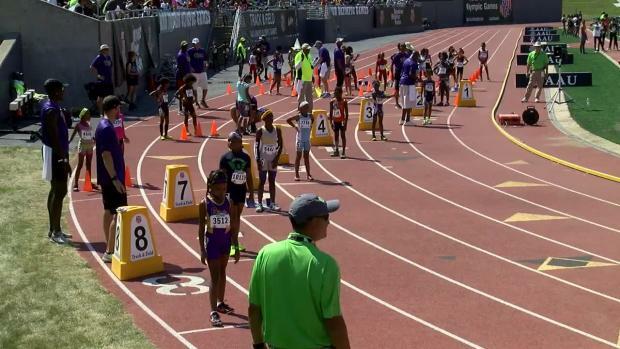 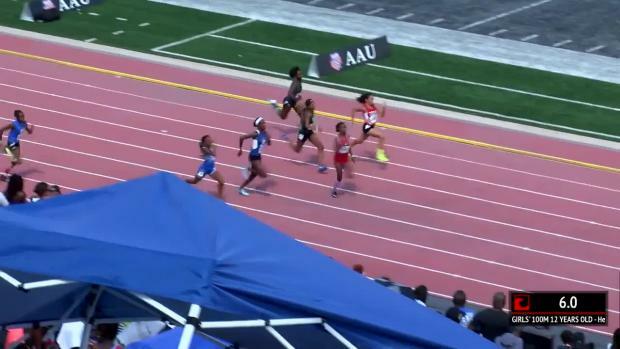 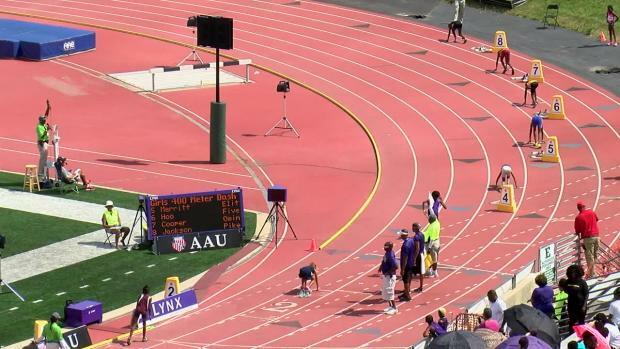 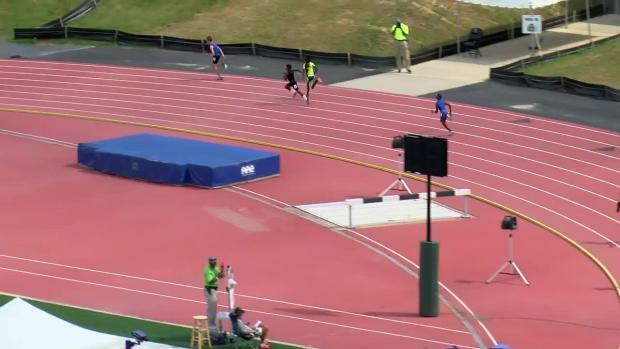 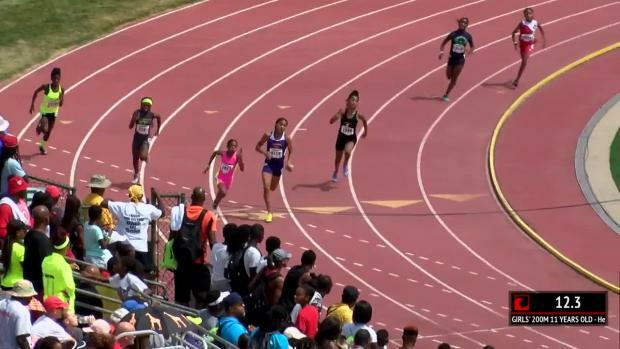 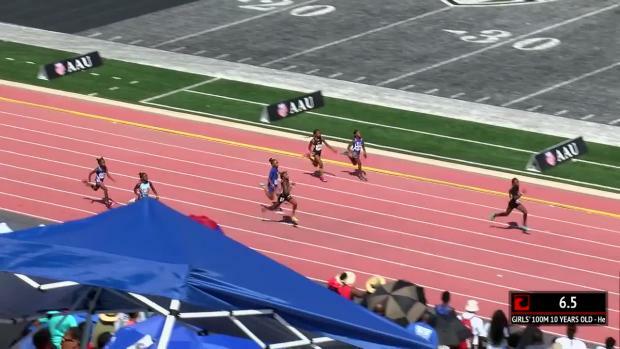 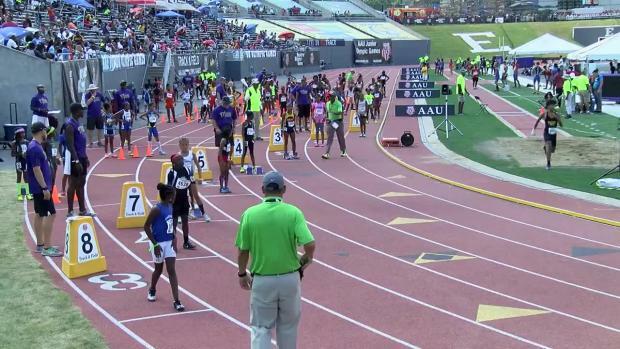 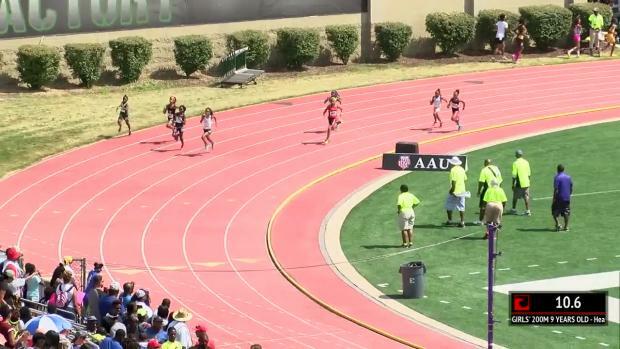 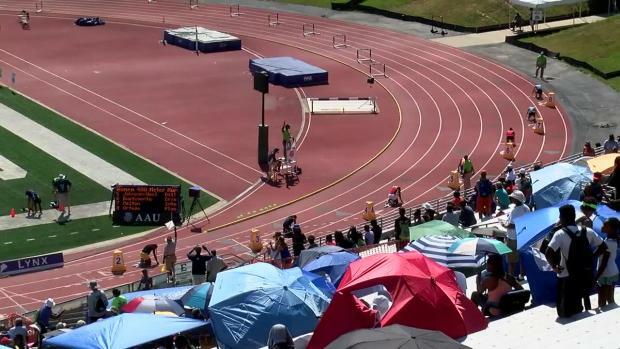 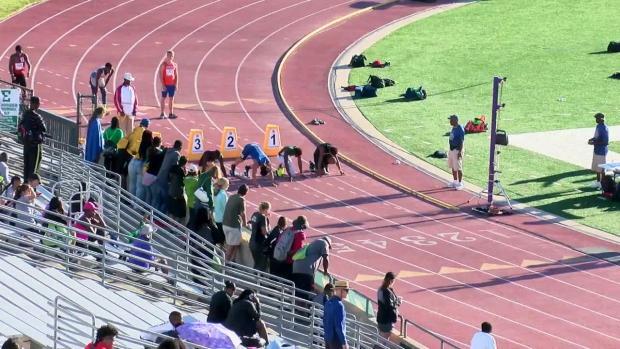 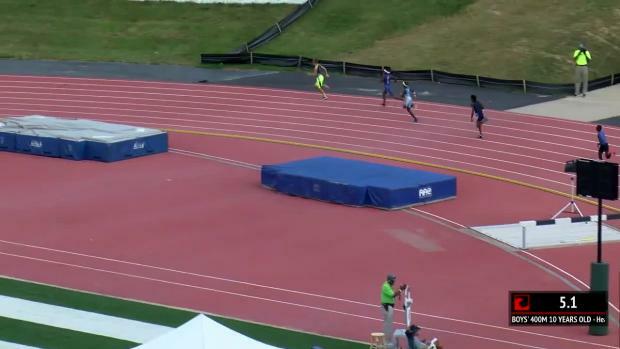 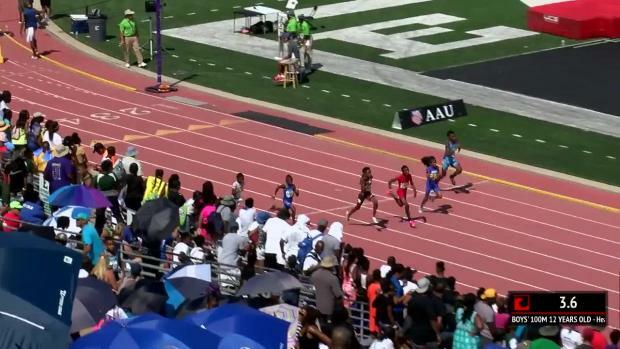 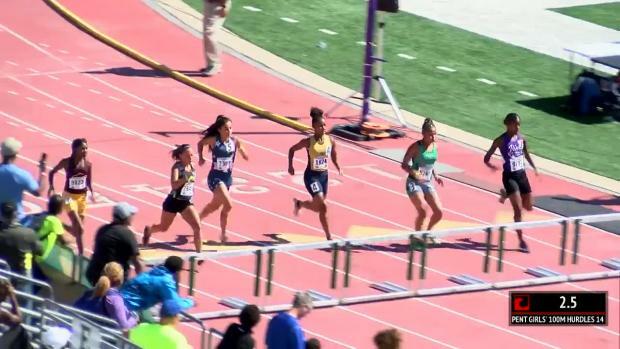 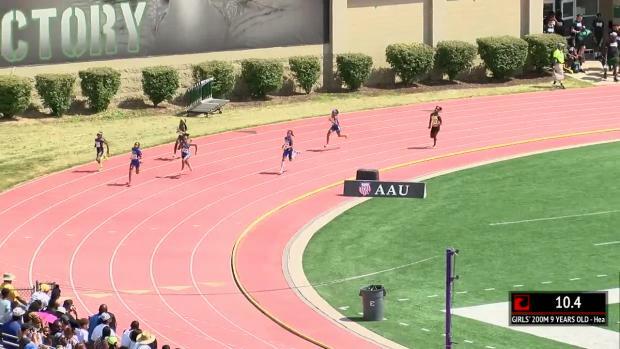 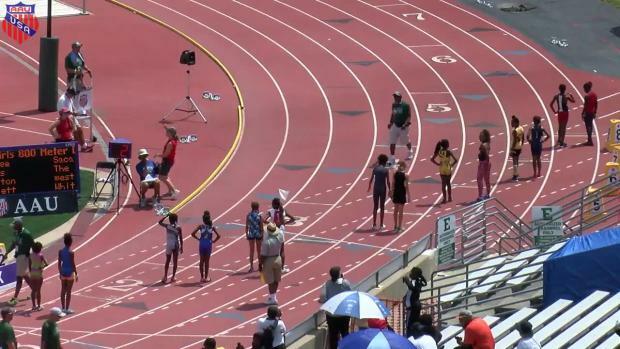 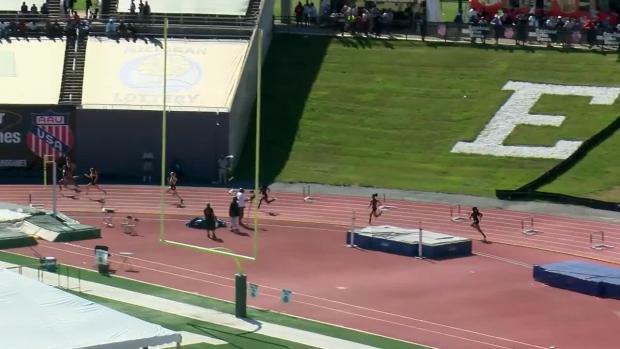 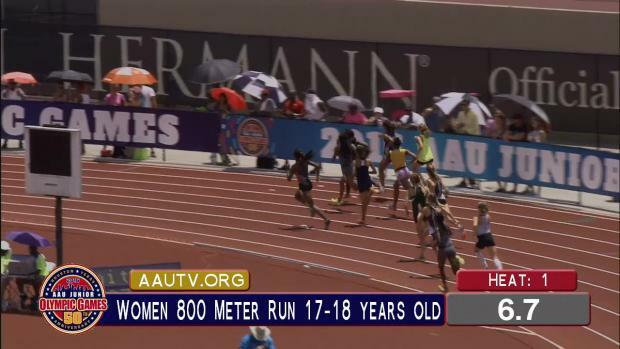 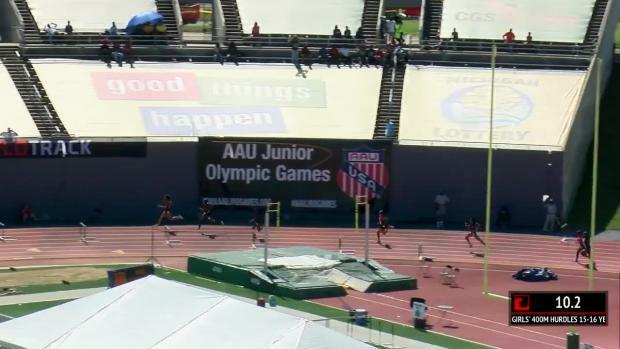 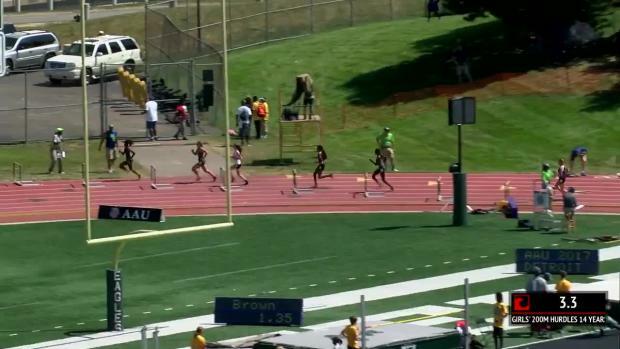 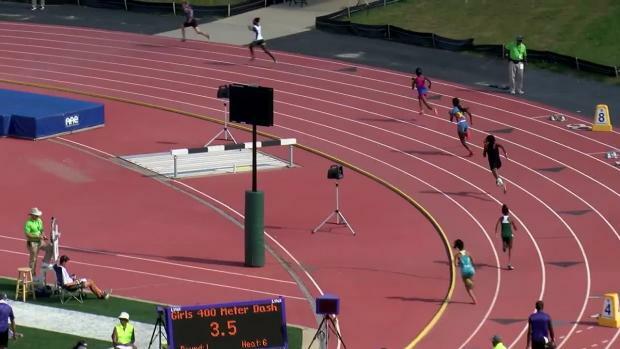 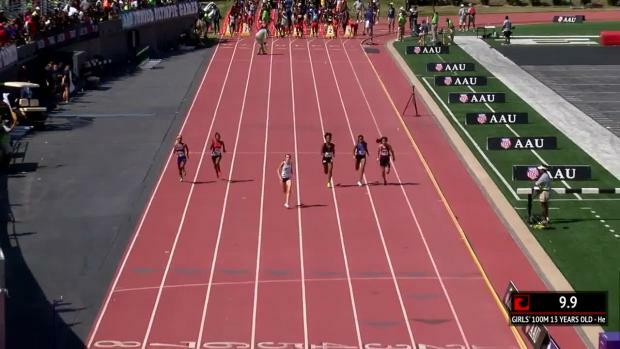 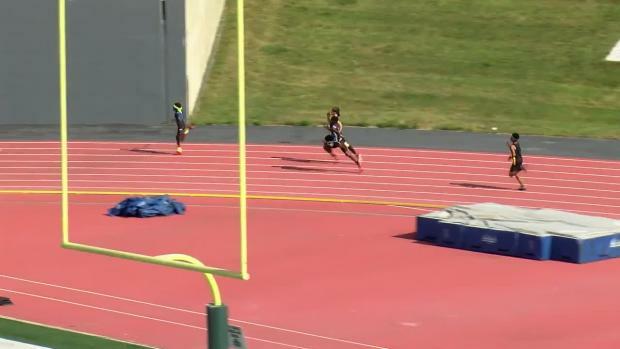 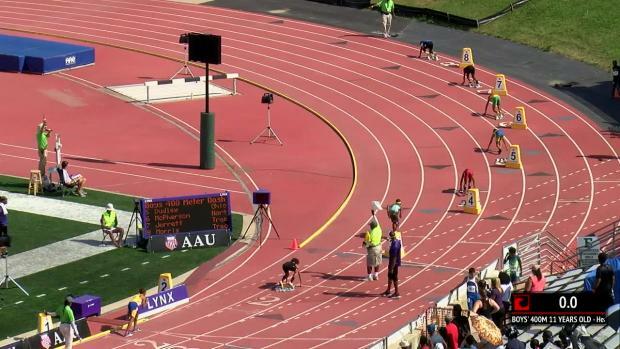 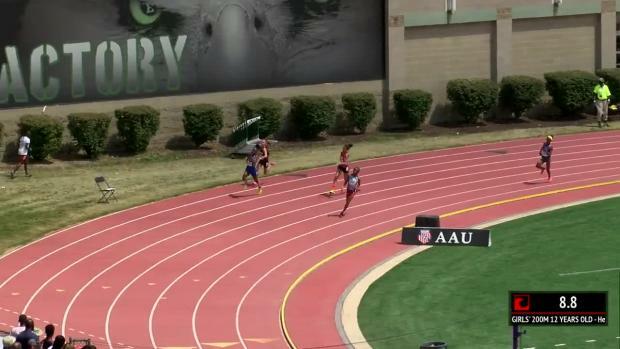 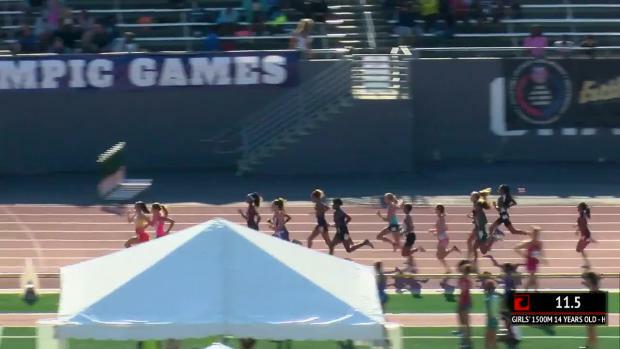 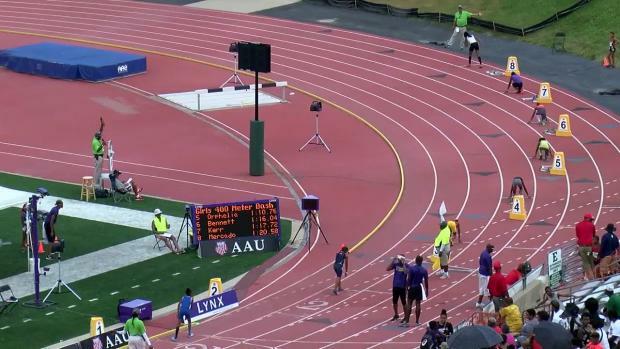 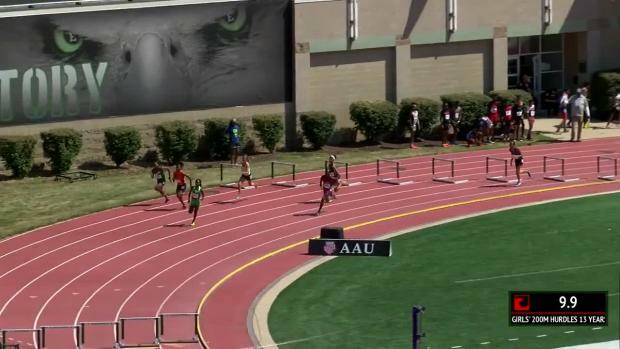 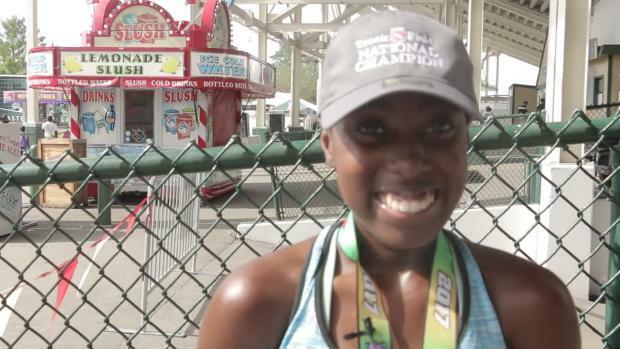 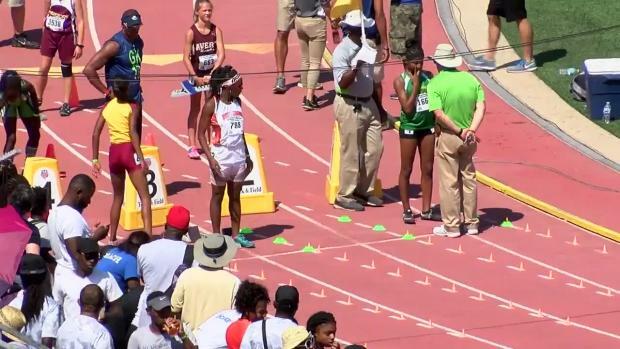 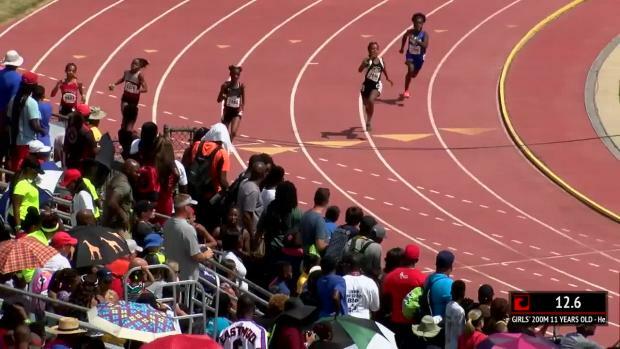 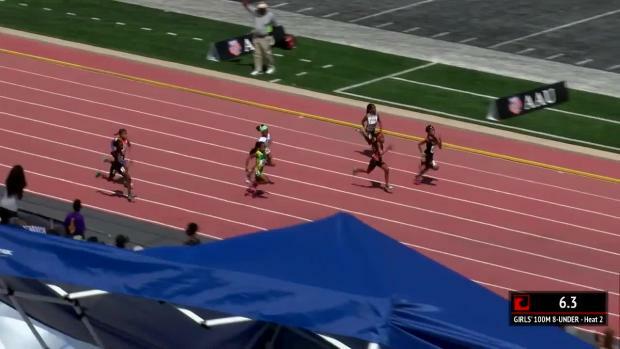 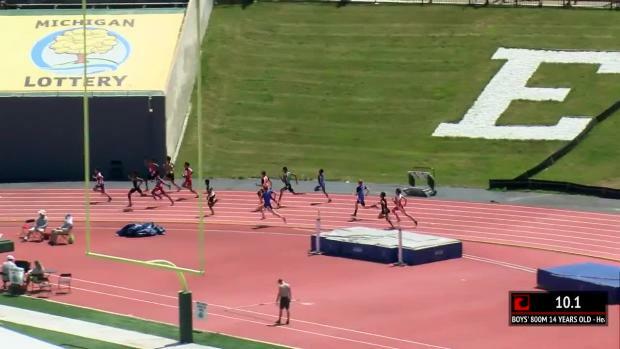 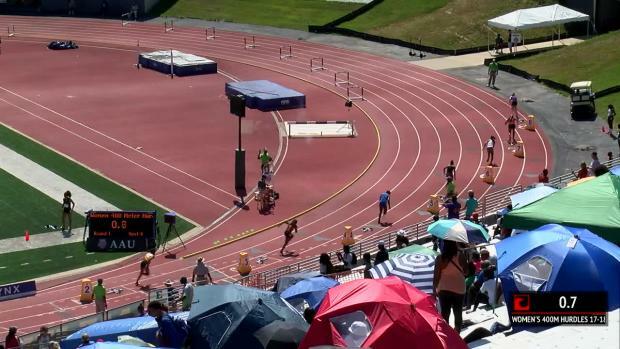 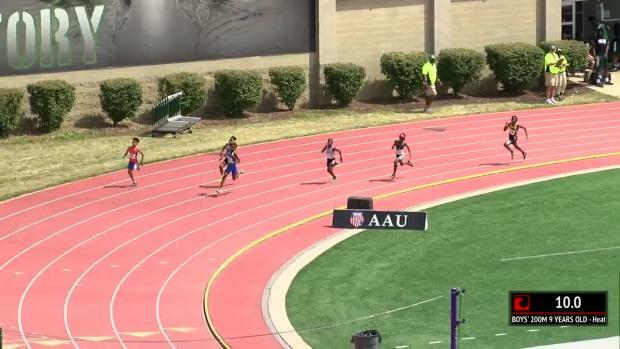 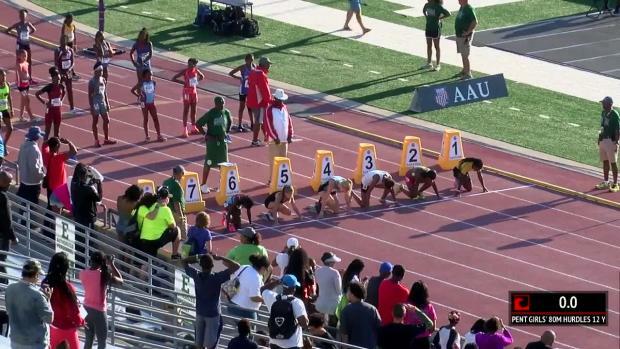 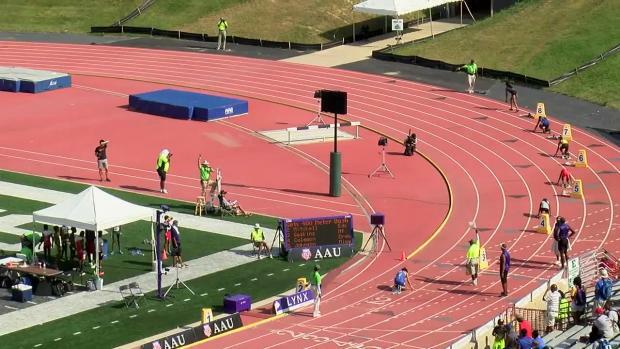 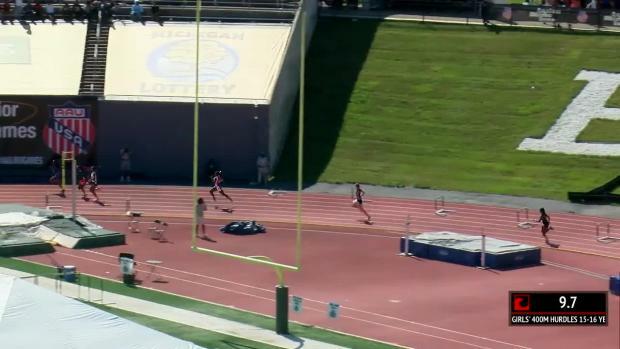 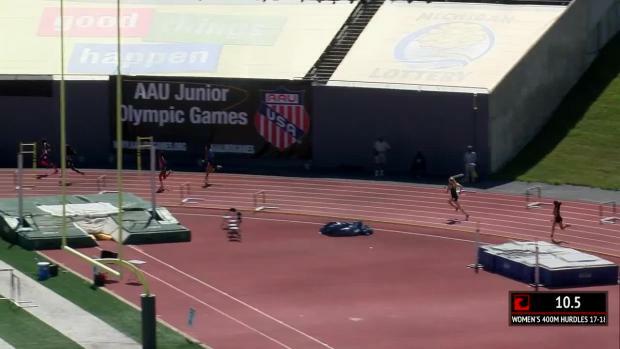 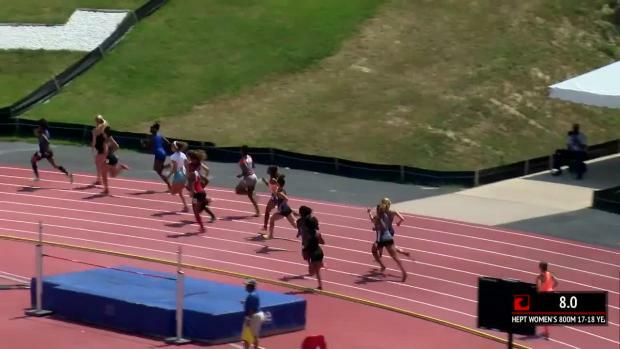 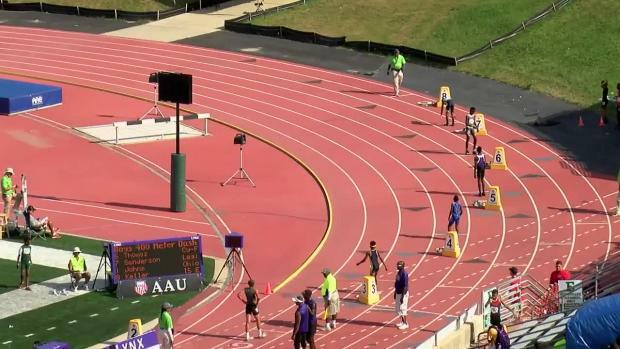 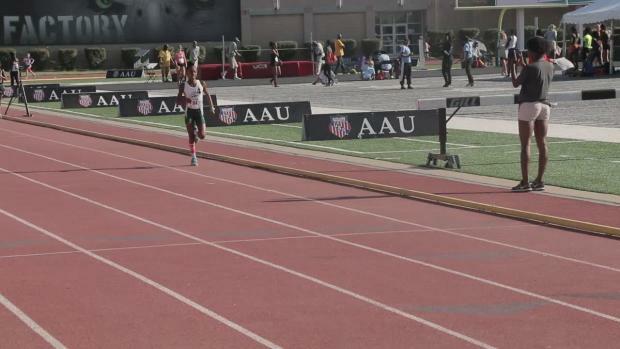 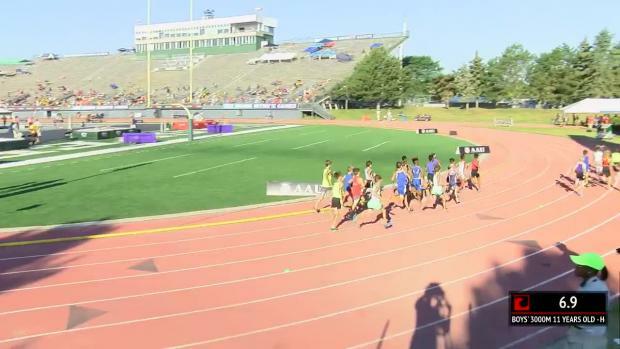 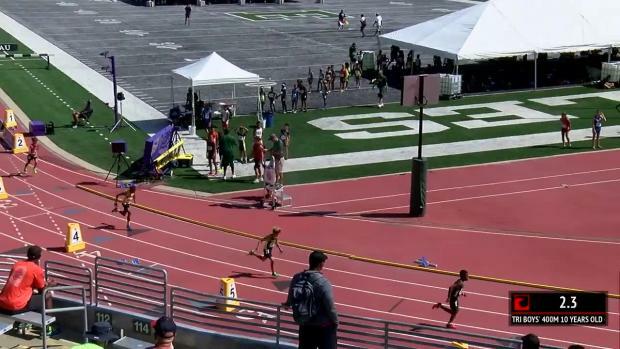 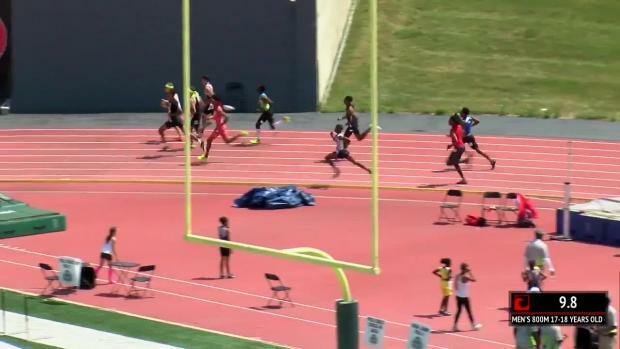 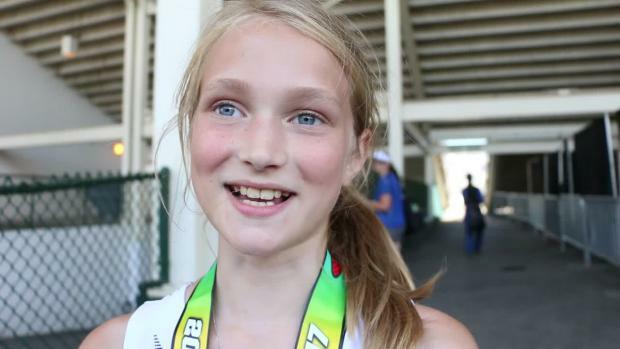 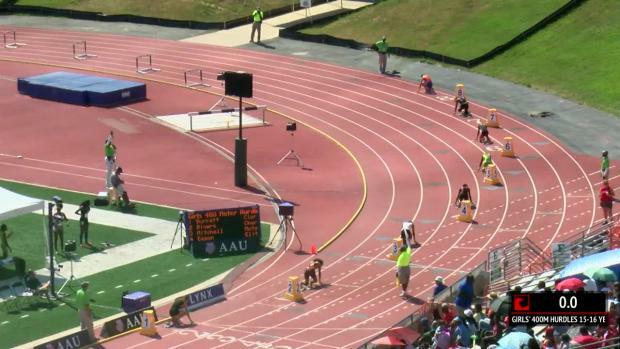 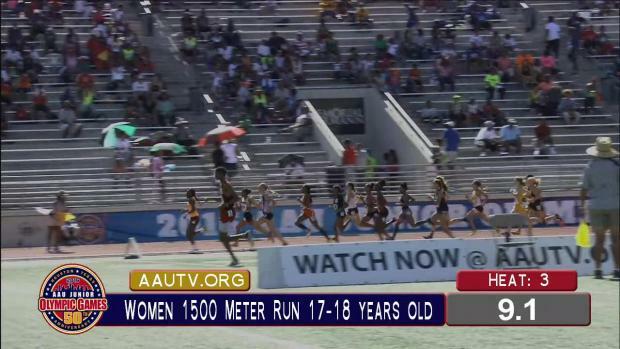 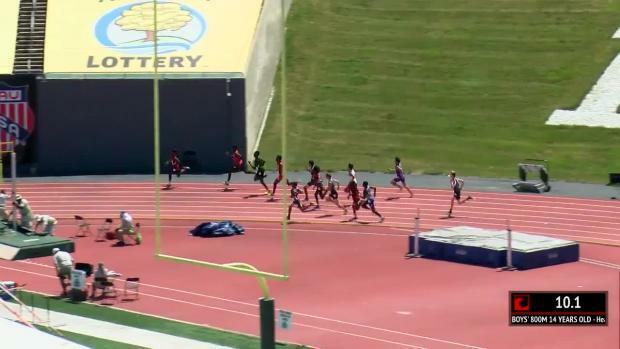 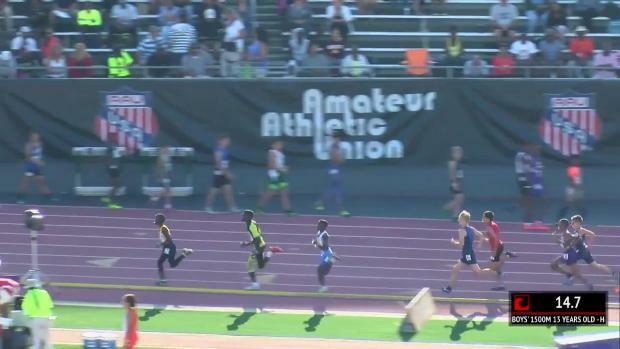 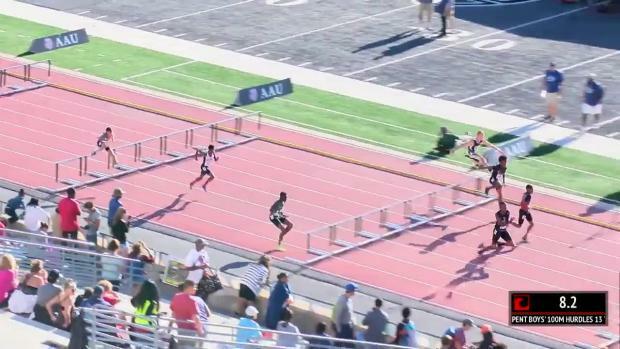 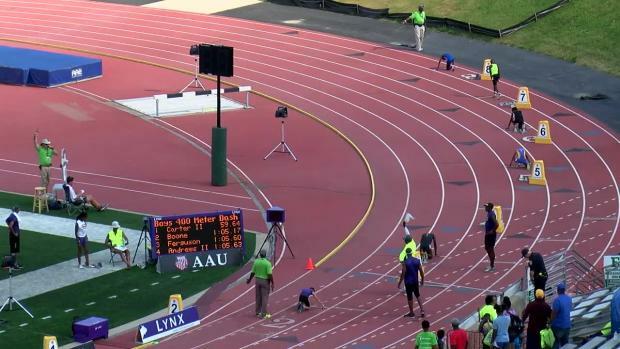 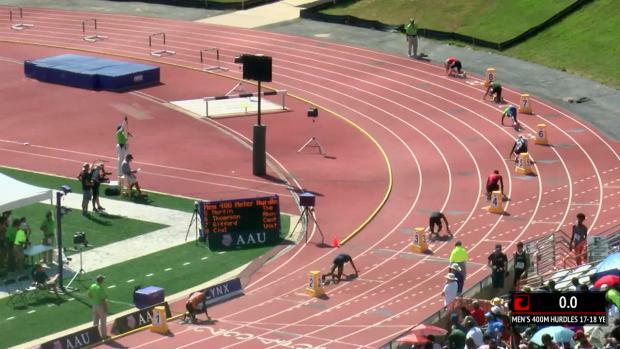 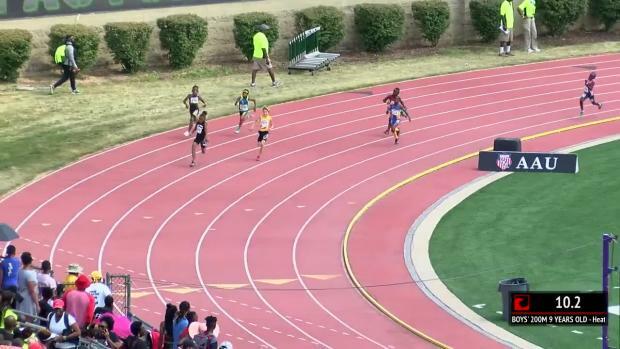 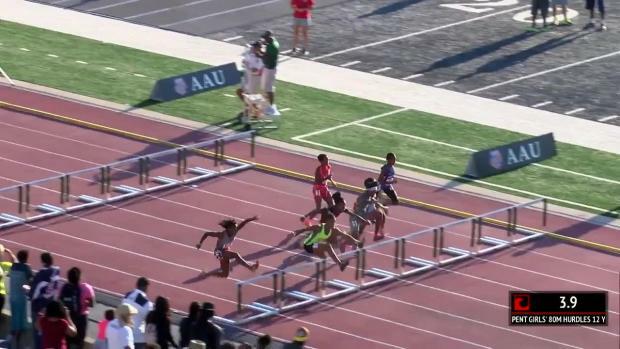 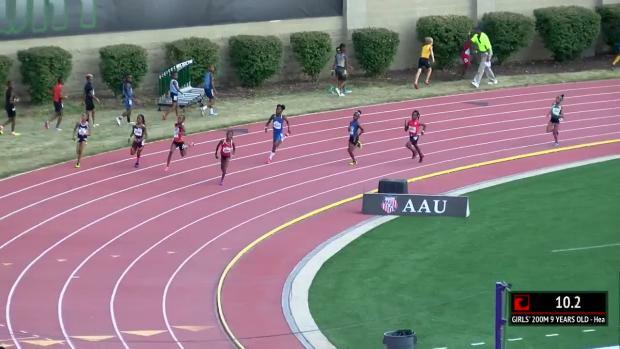 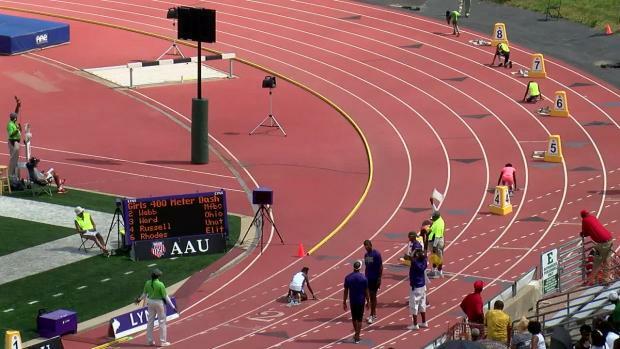 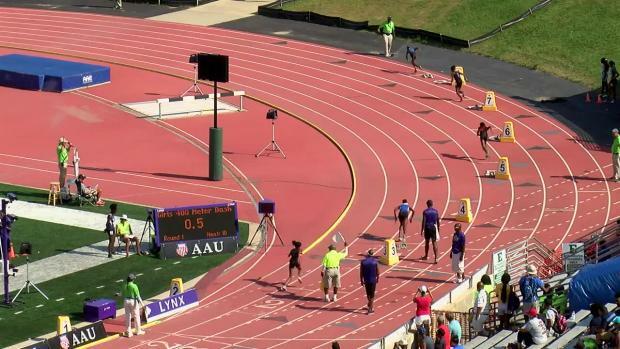 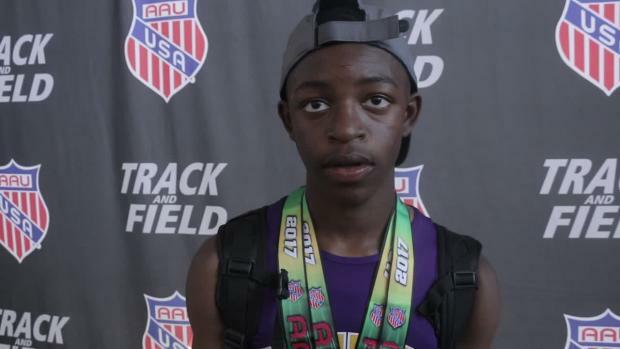 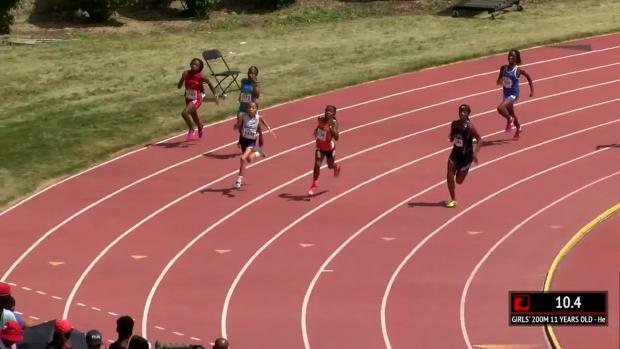 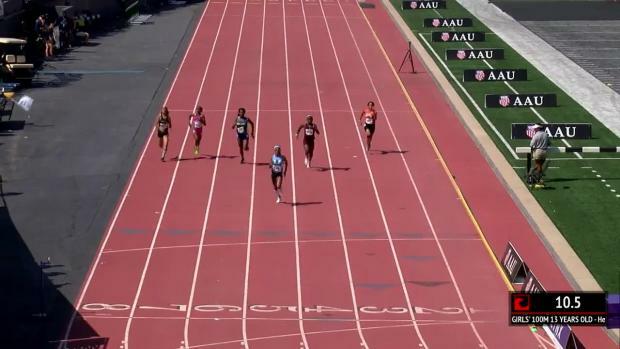 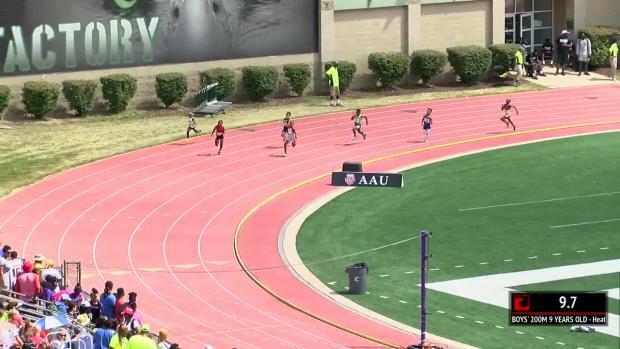 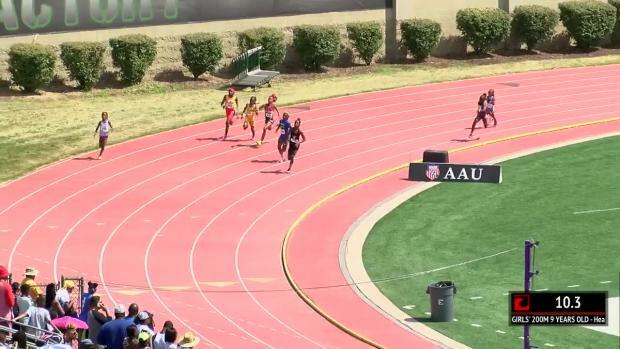 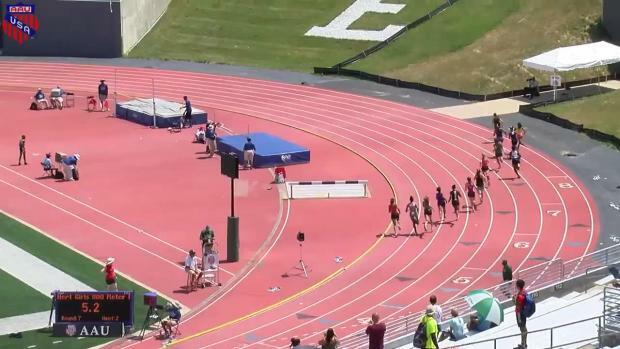 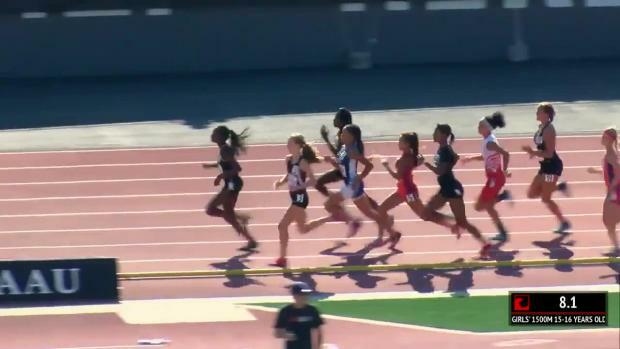 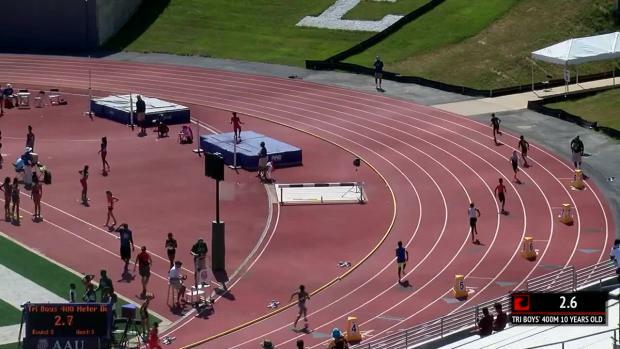 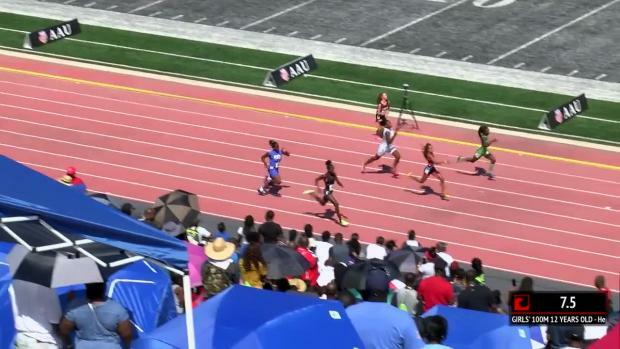 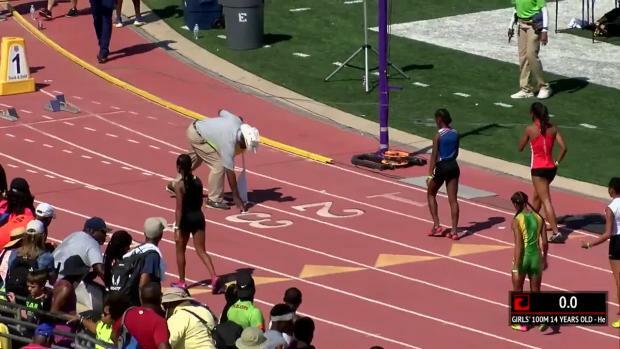 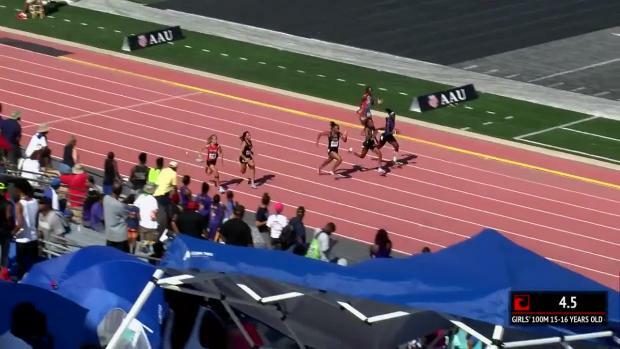 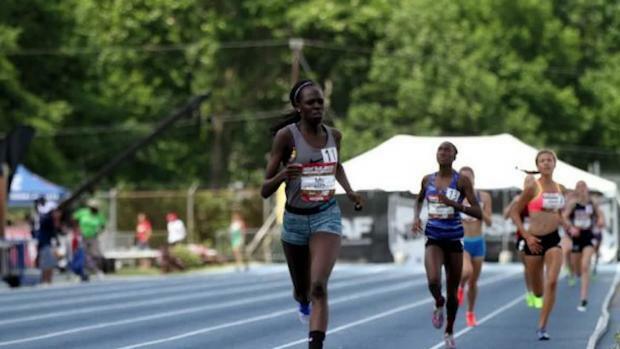 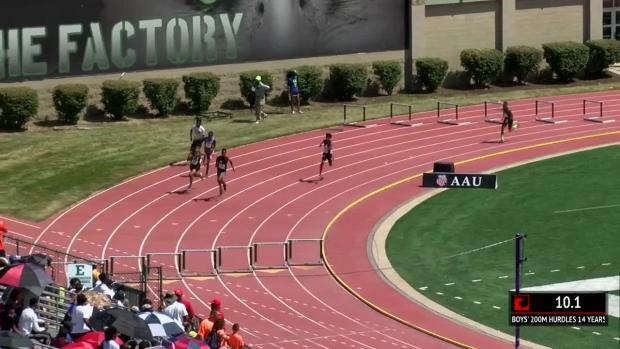 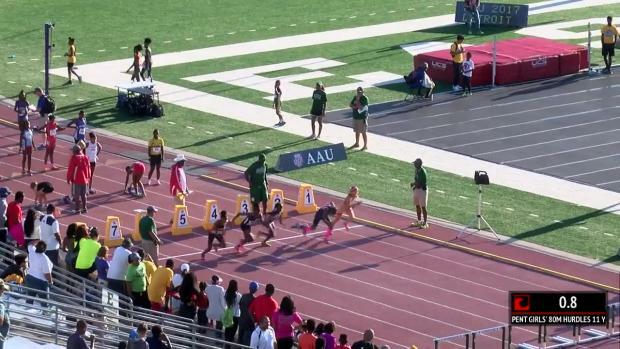 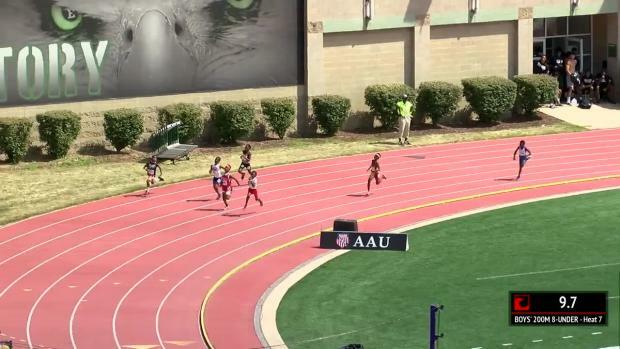 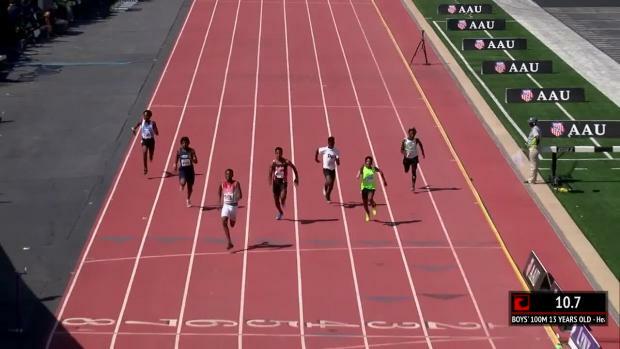 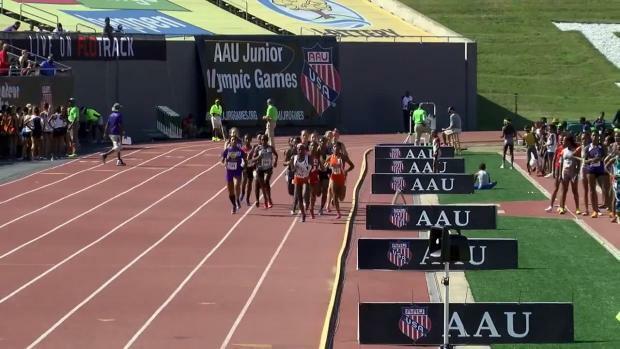 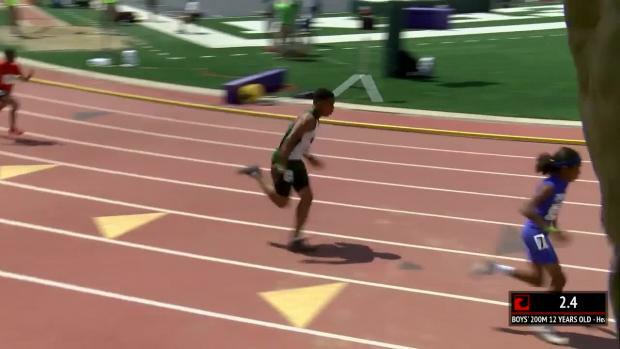 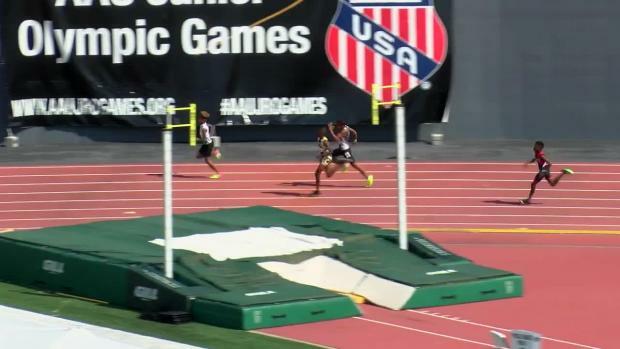 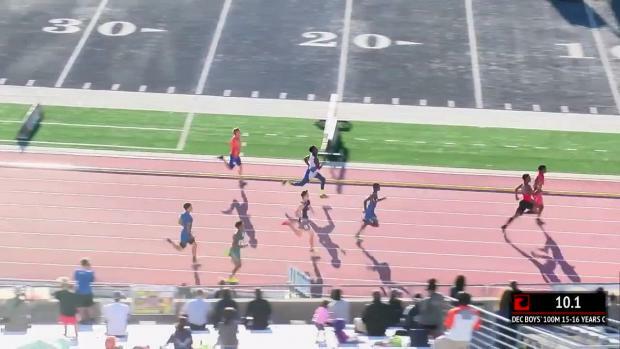 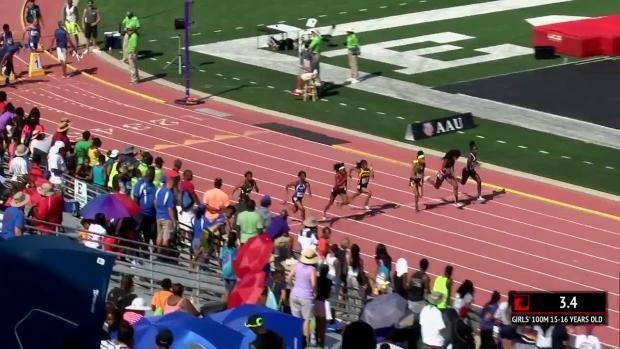 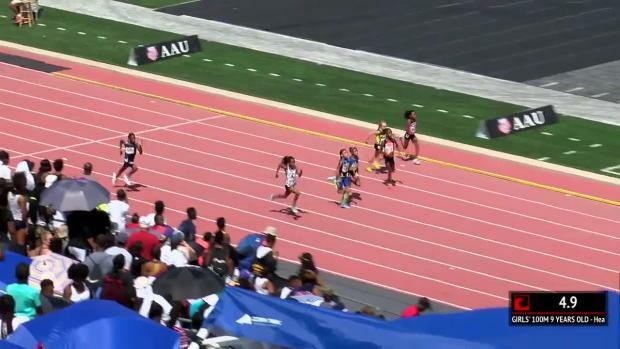 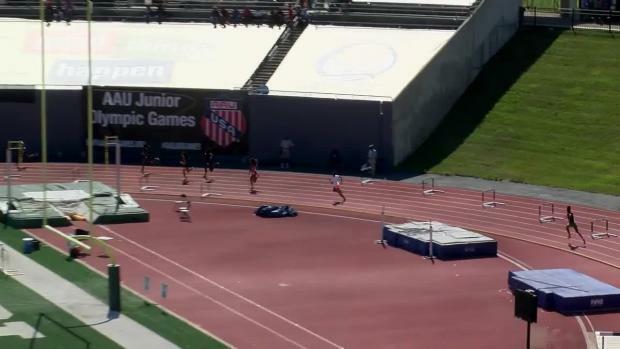 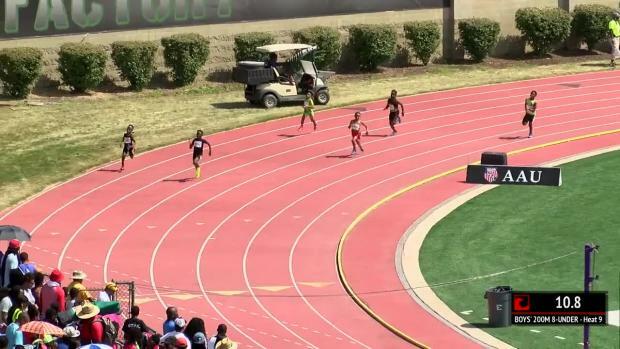 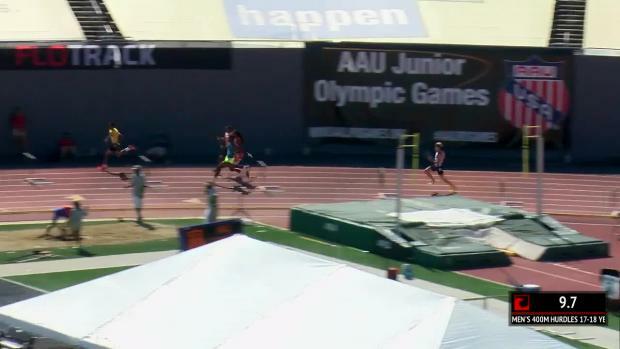 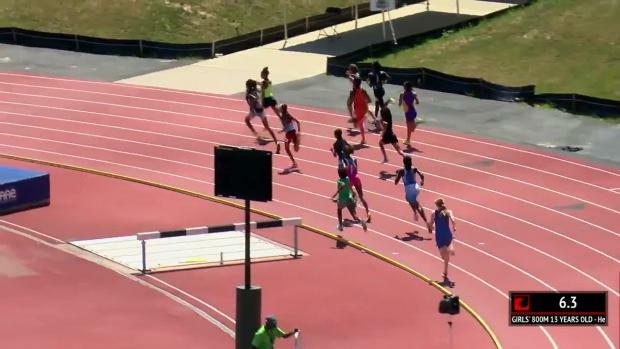 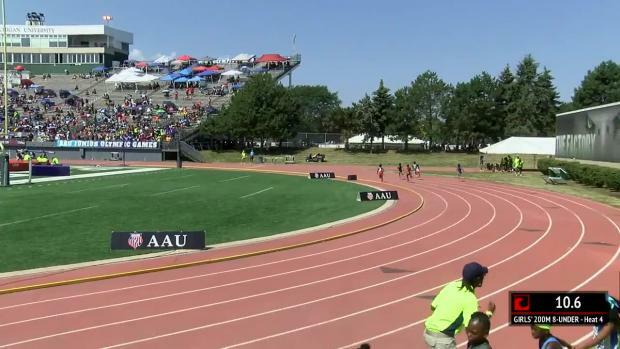 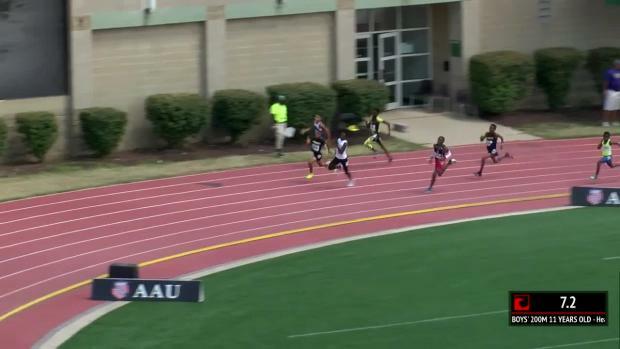 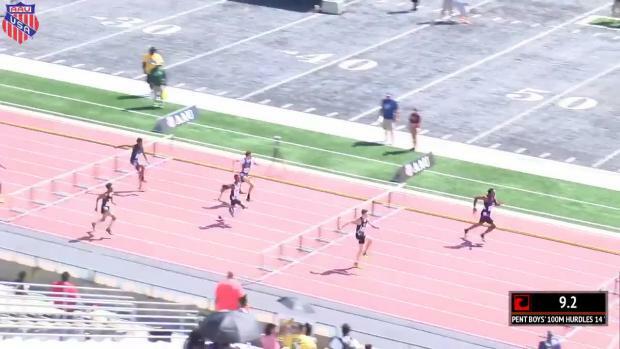 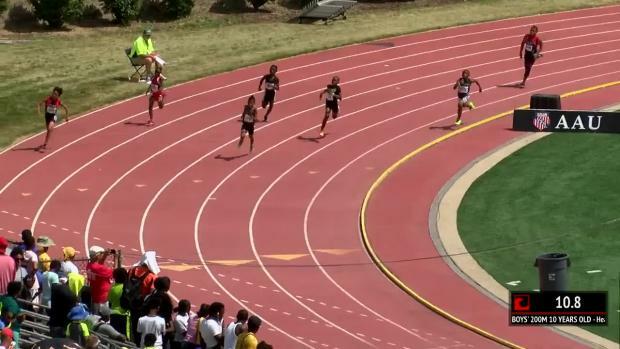 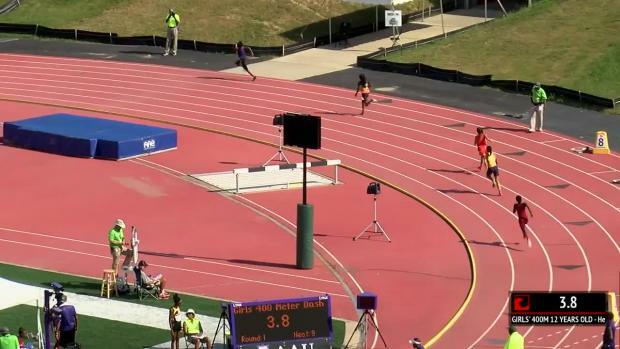 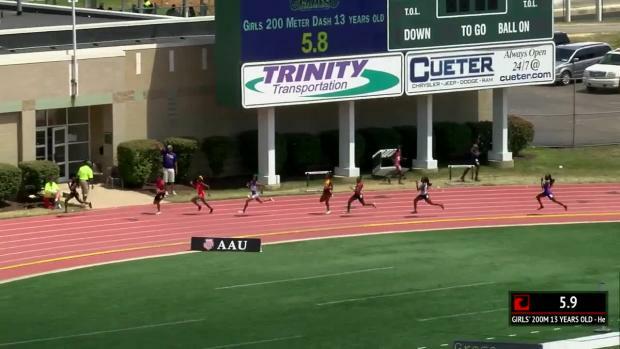 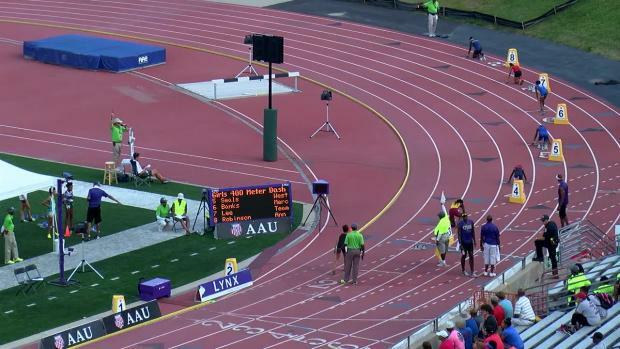 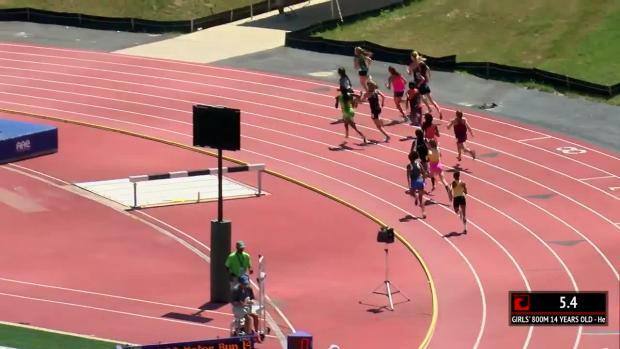 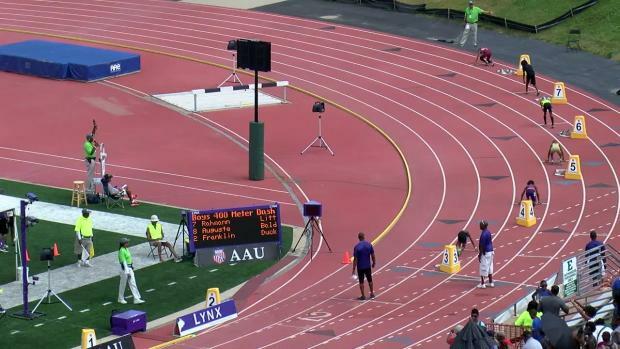 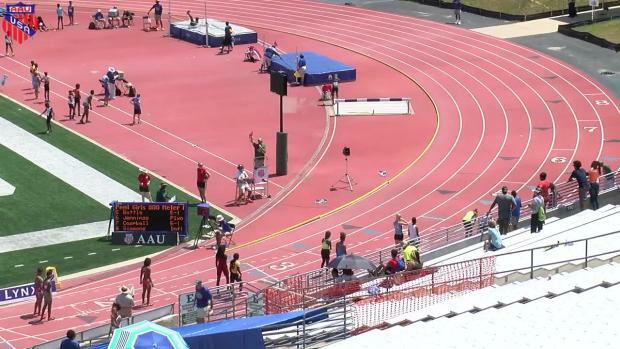 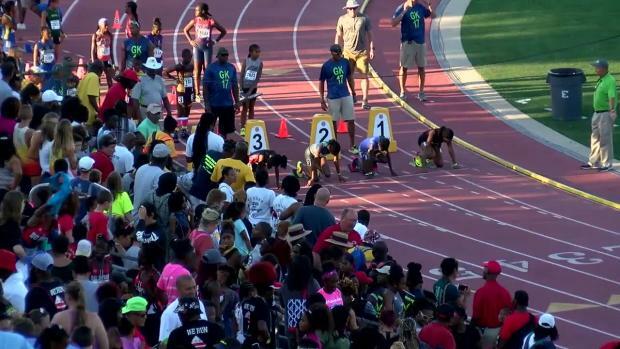 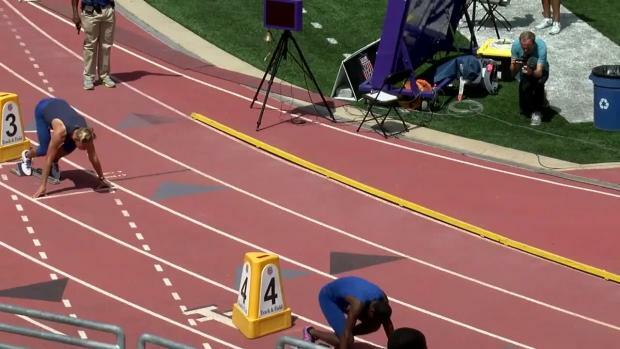 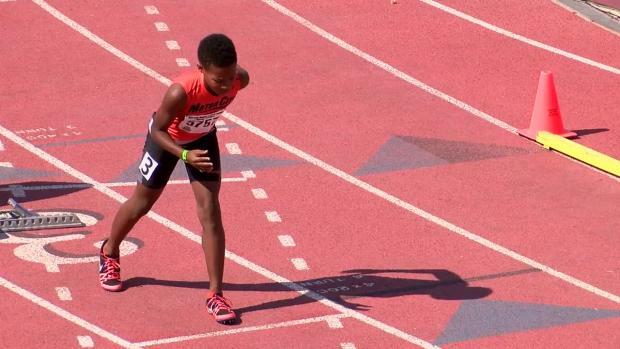 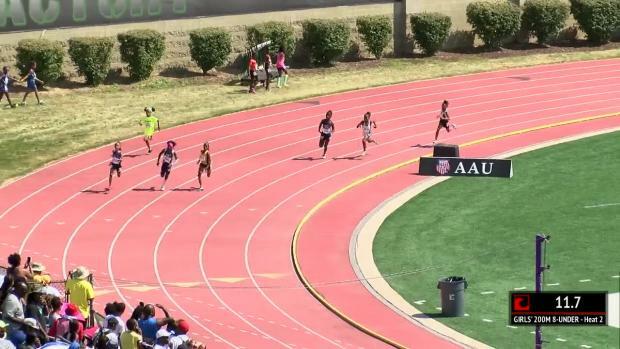 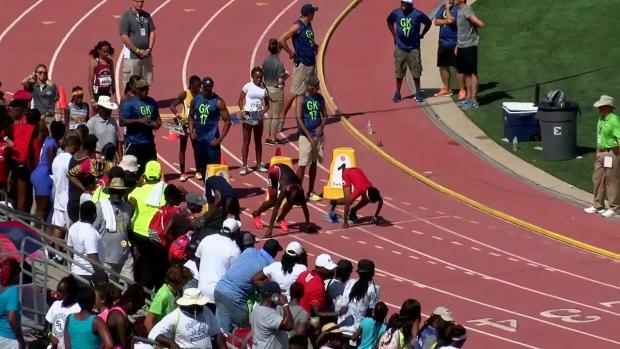 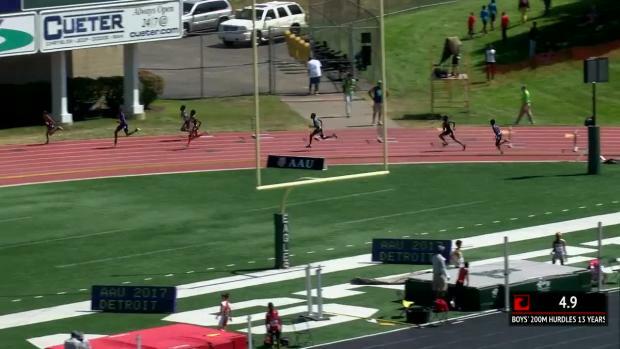 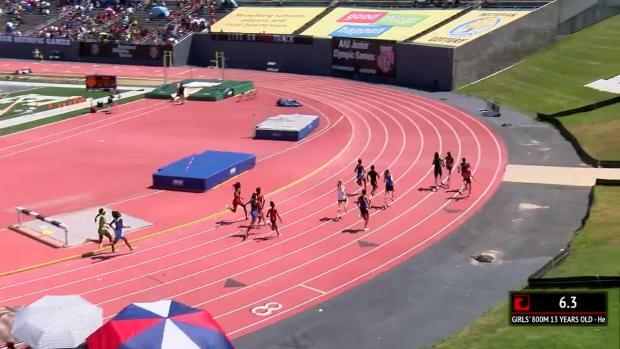 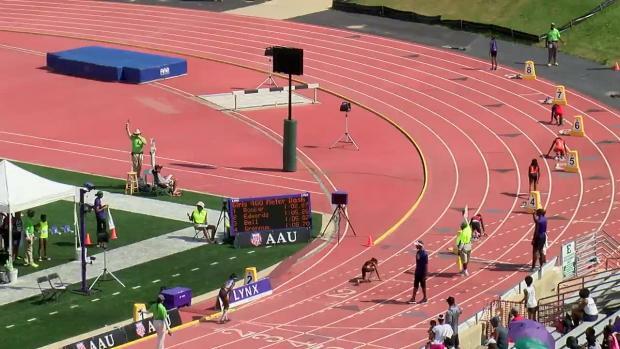 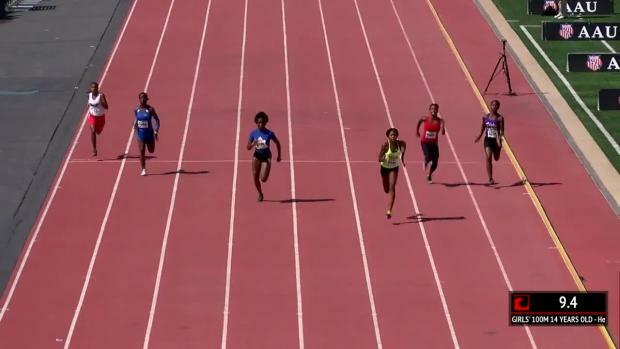 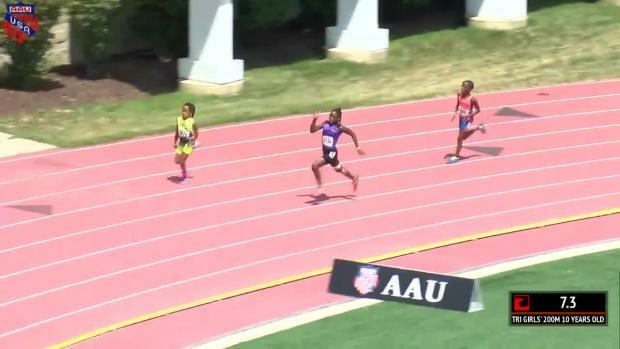 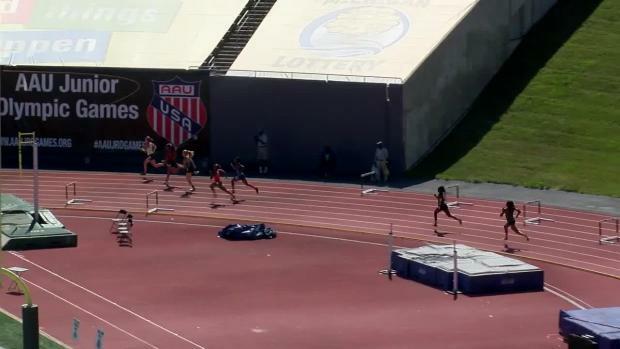 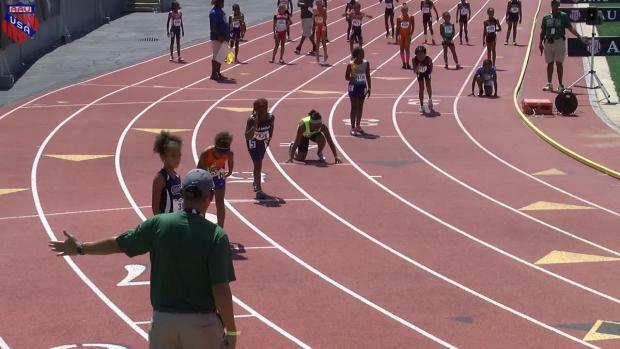 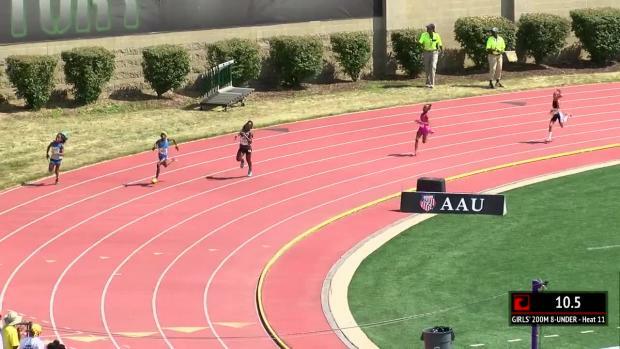 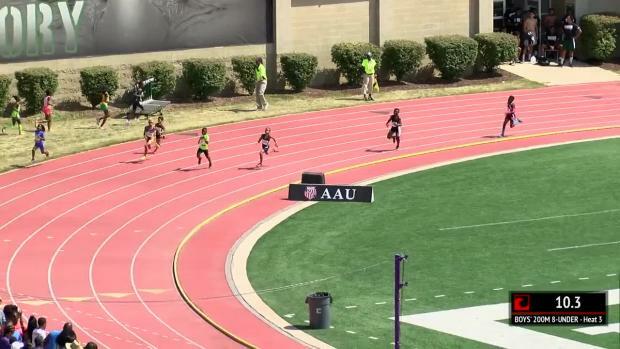 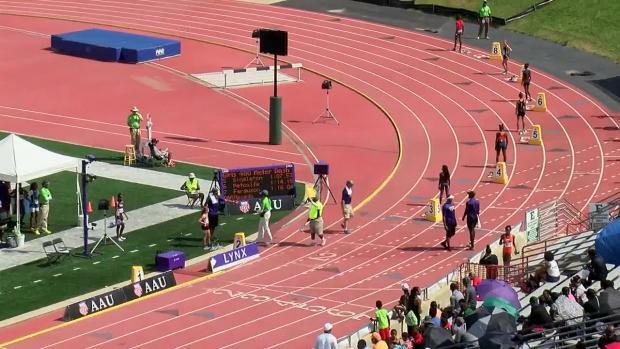 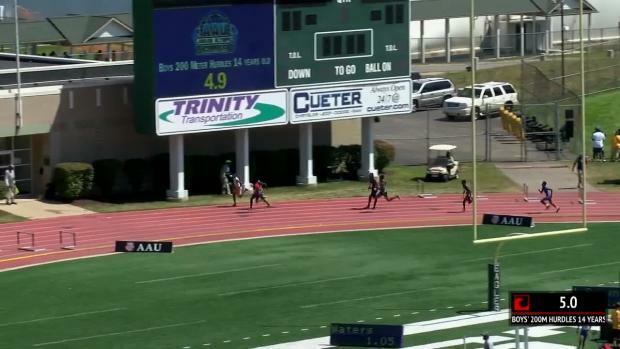 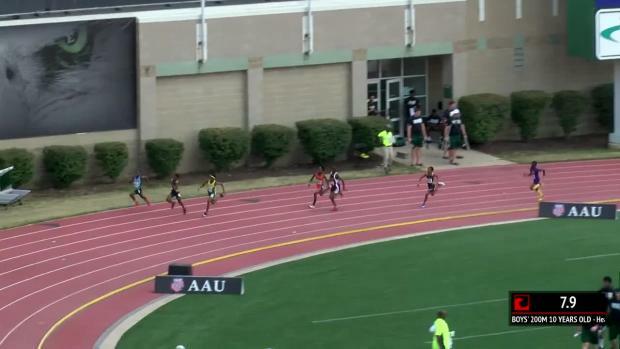 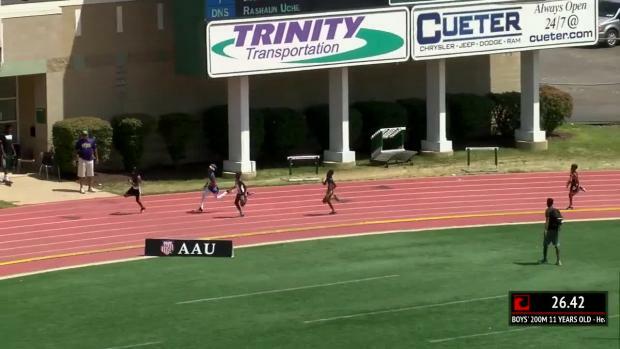 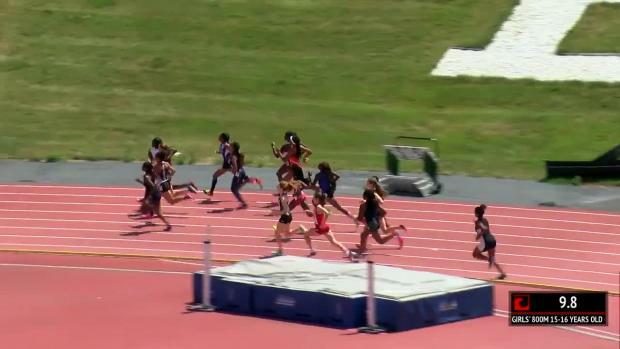 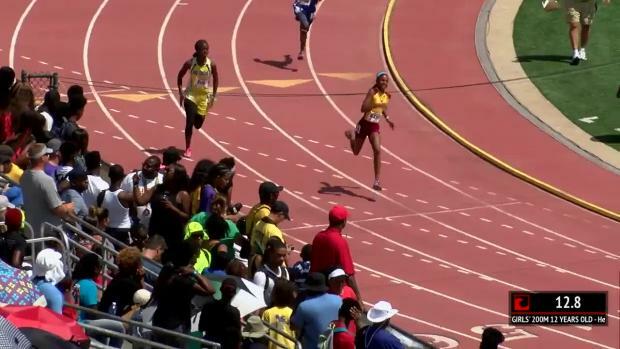 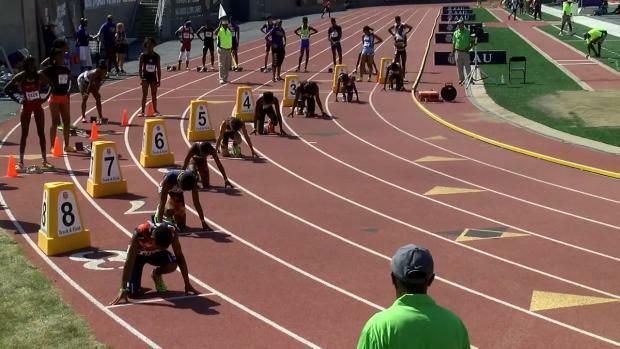 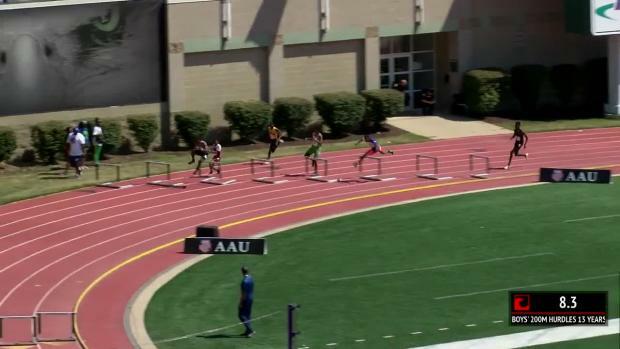 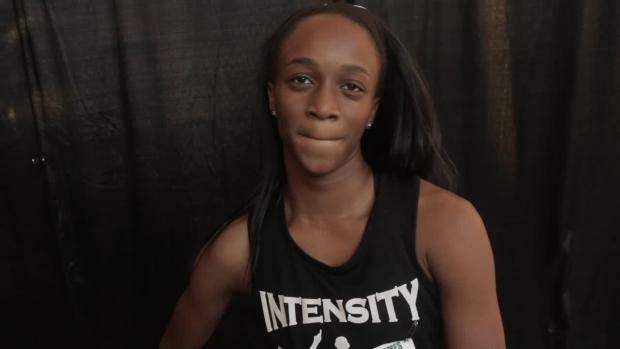 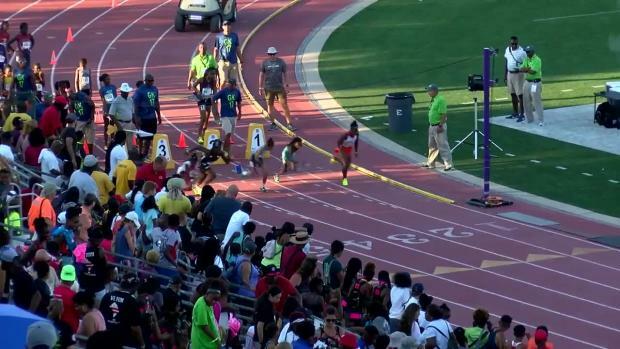 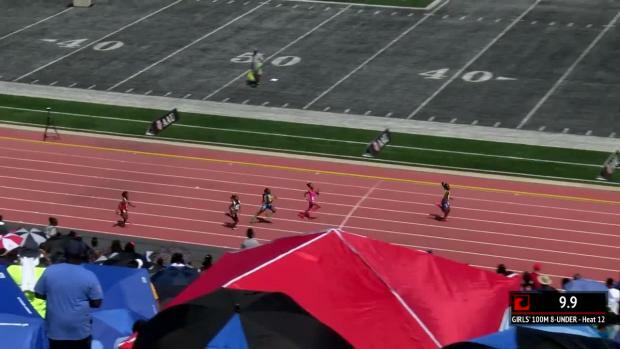 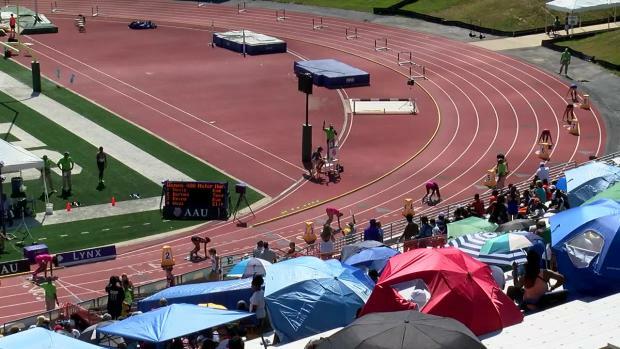 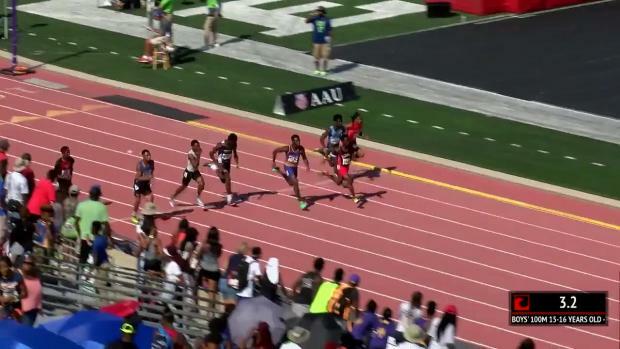 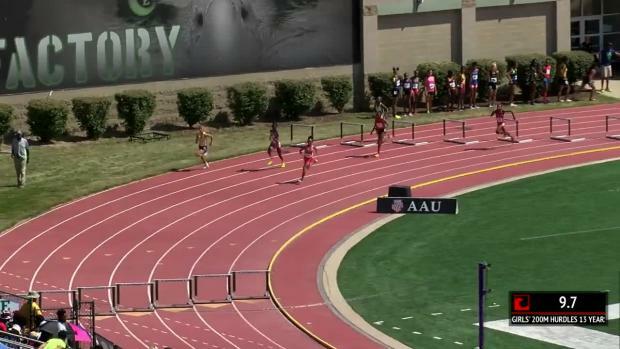 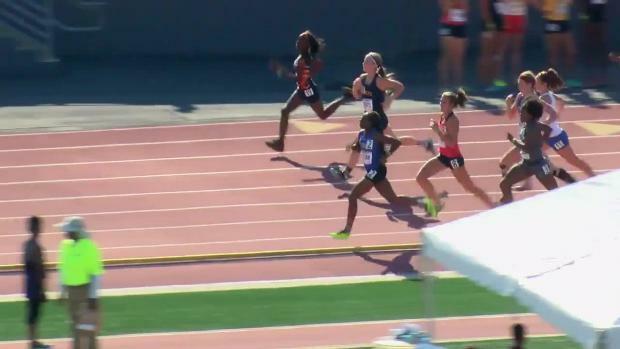 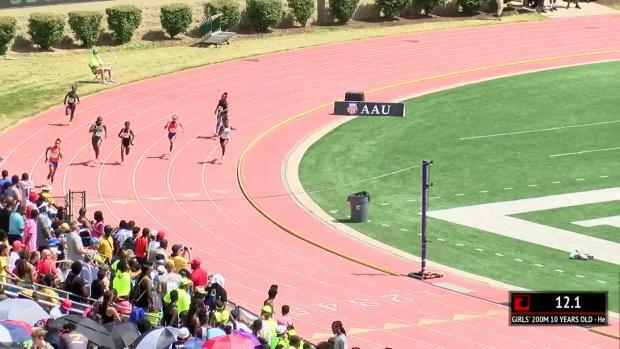 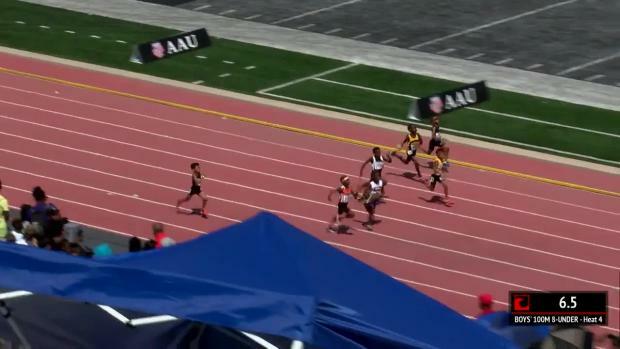 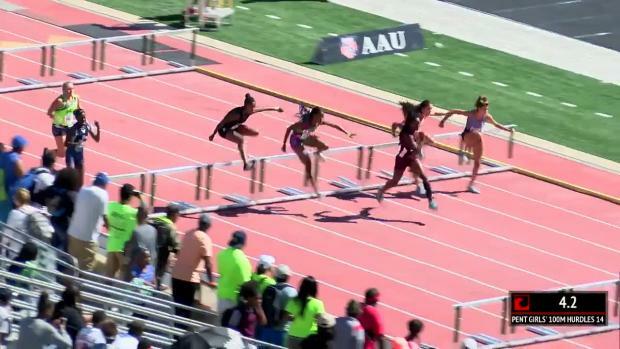 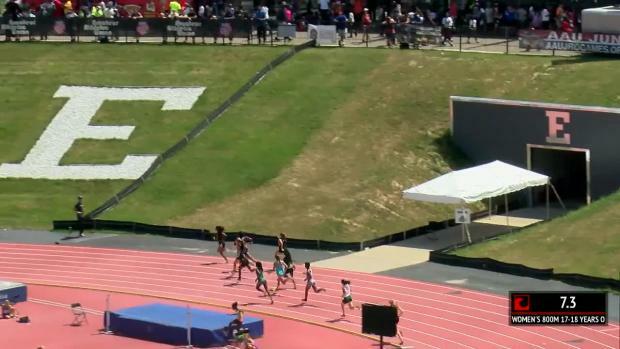 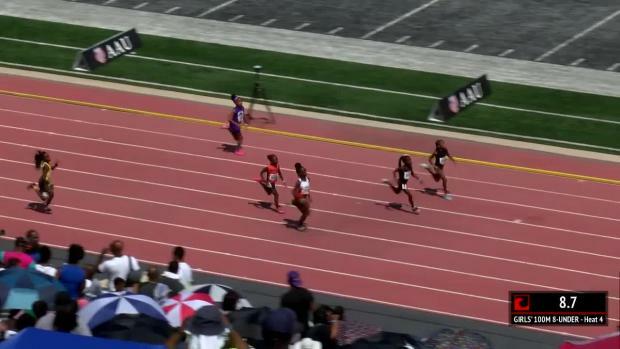 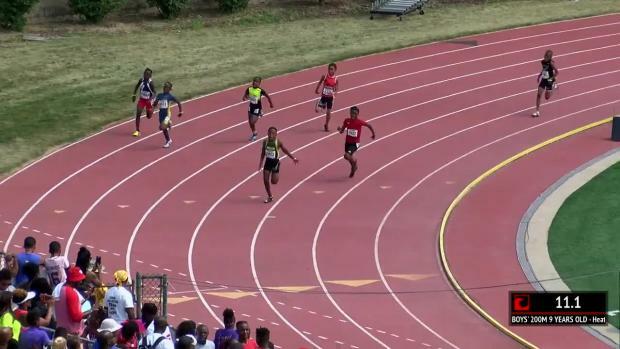 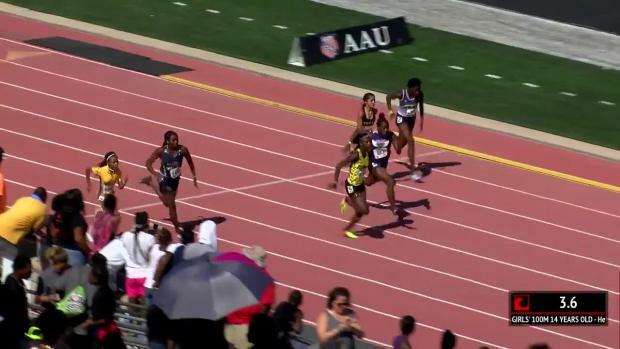 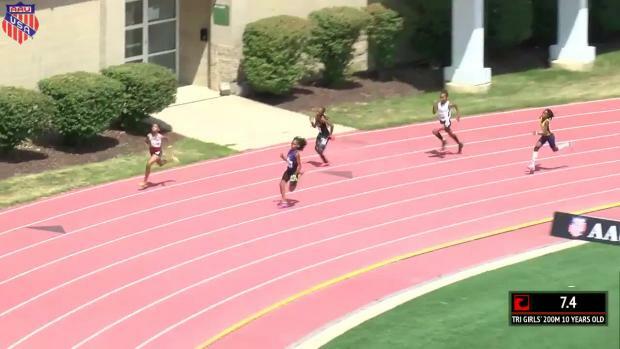 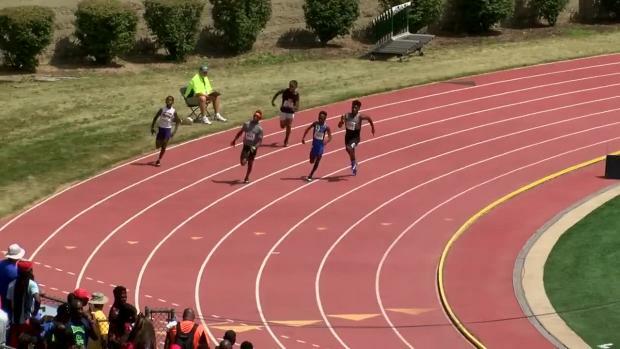 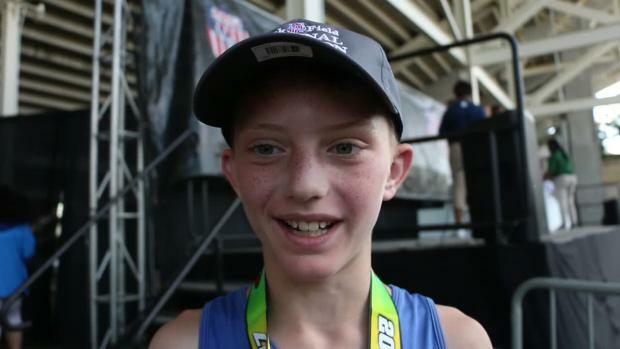 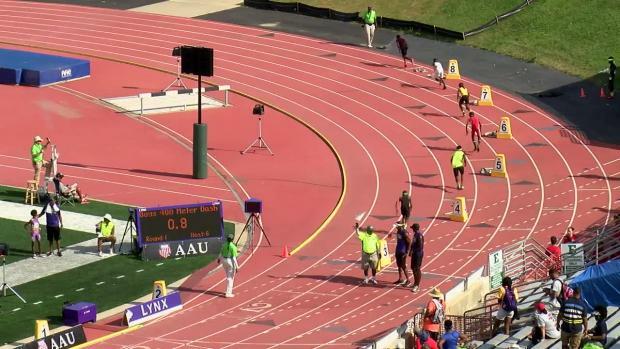 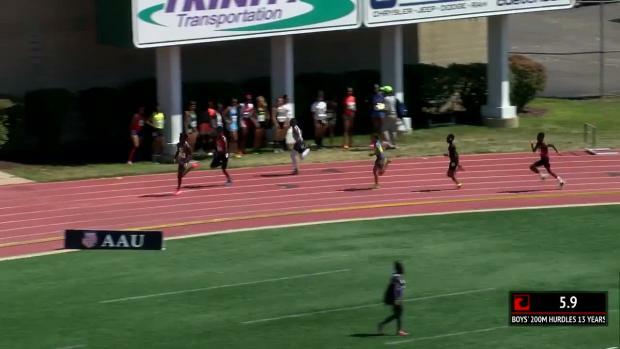 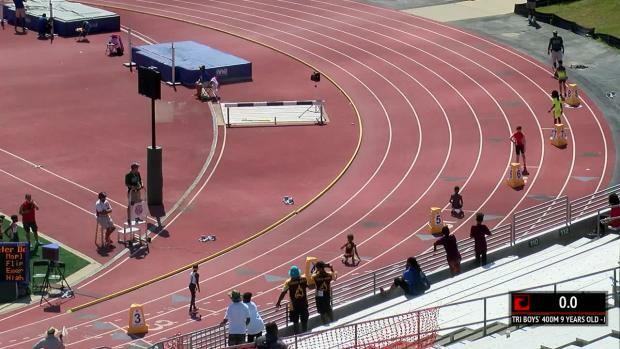 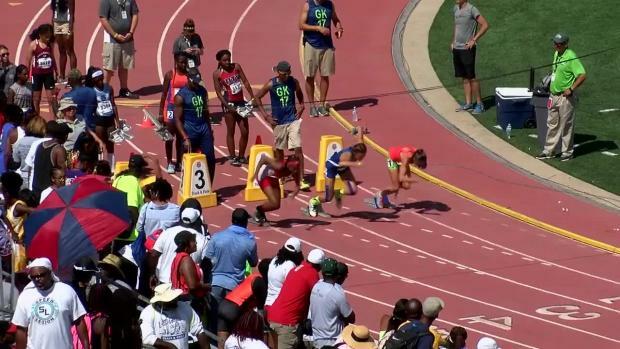 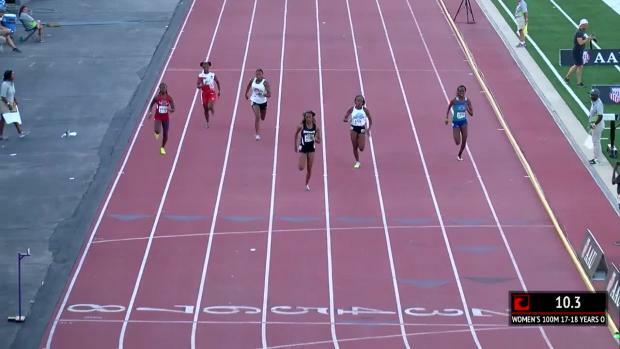 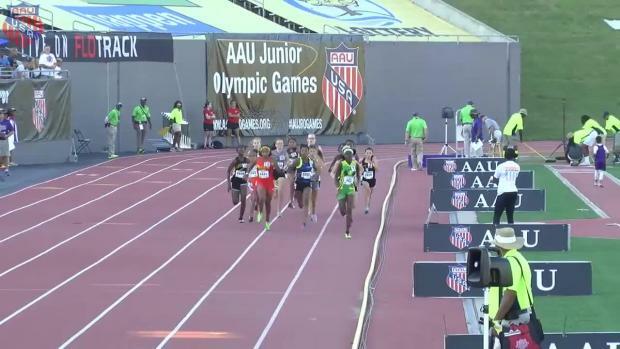 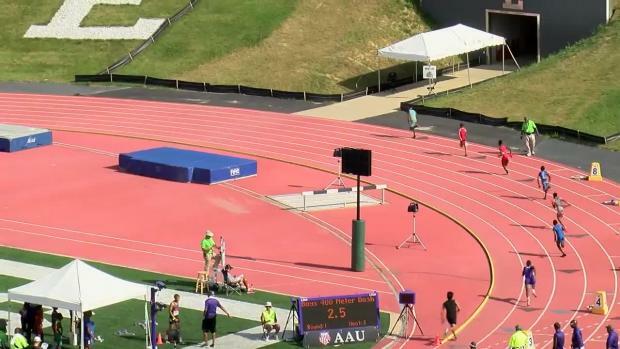 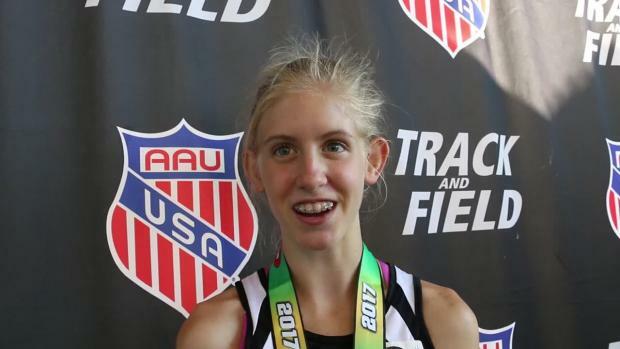 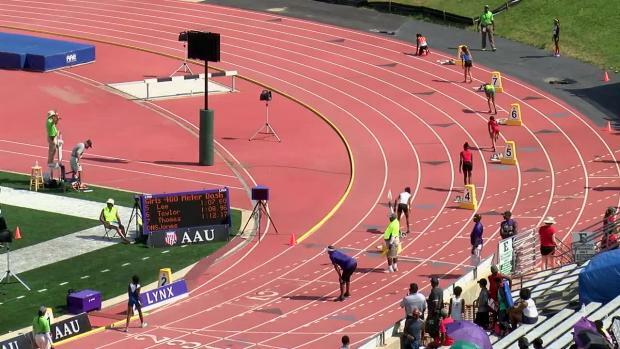 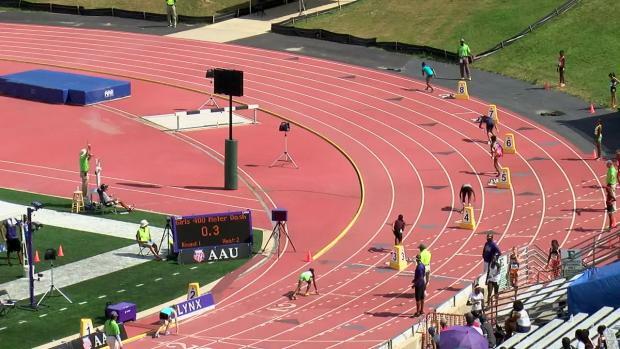 13 Year Old Lauren Tolbert set a 9 second PR to run 2:16.97 at the AAU Junior Olympic Games! 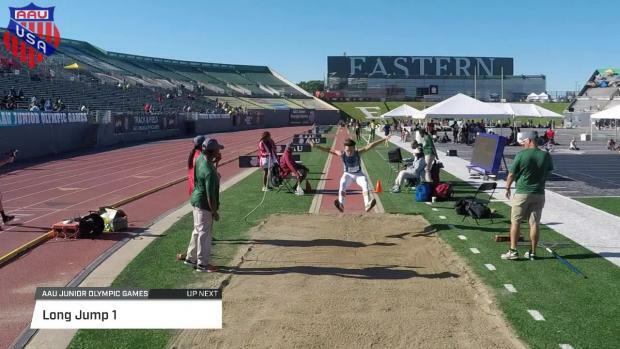 East Greenwich junior sets three personal records in the process. 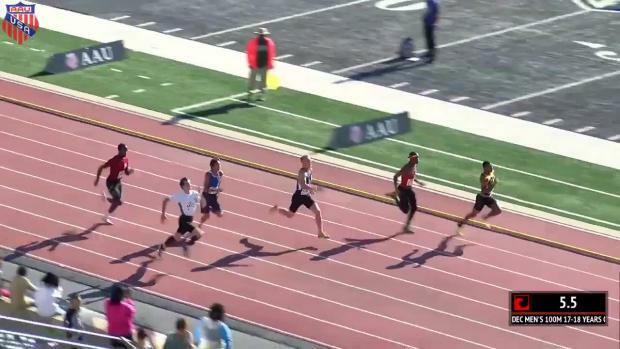 Laird won the 100 meters and followed that up with an incredible senior year! 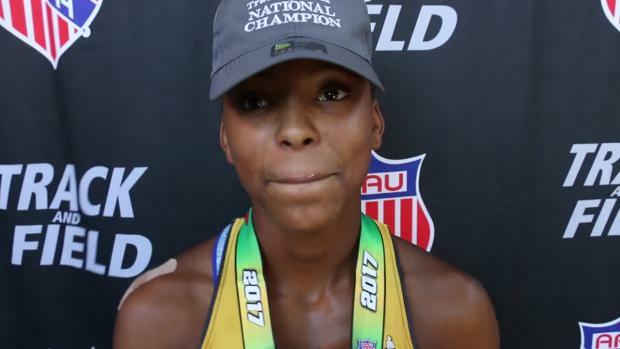 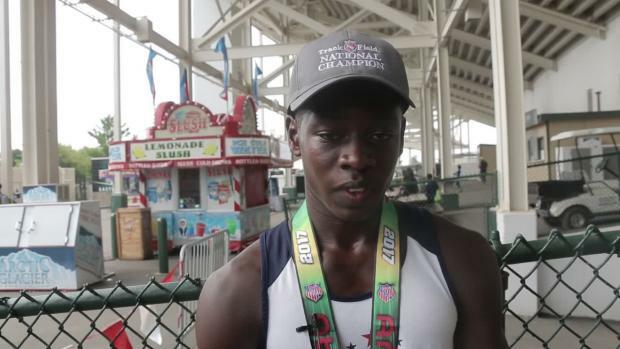 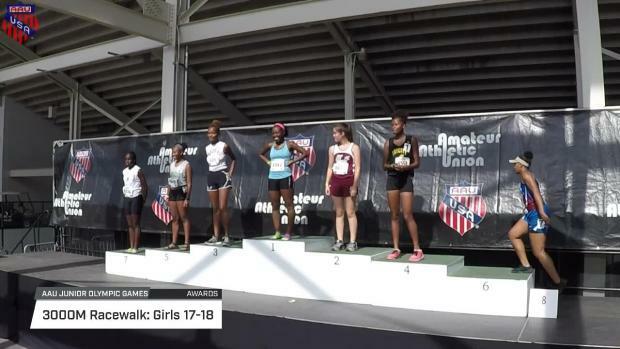 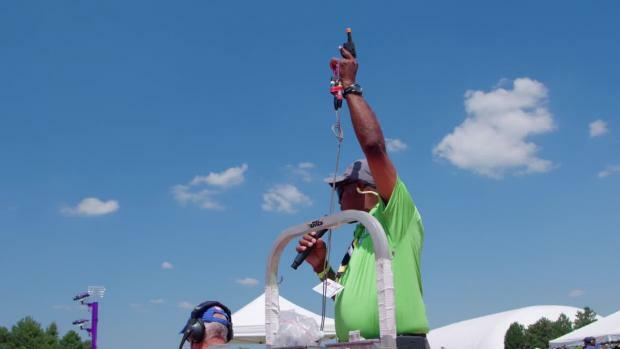 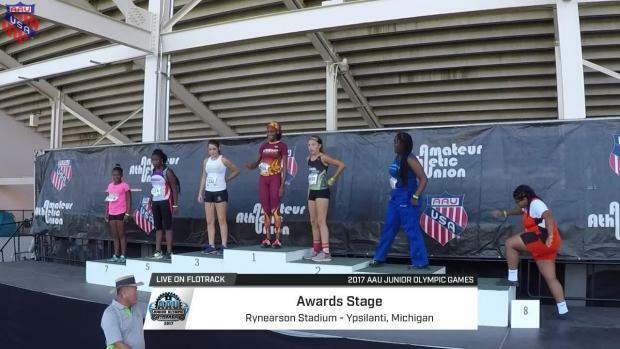 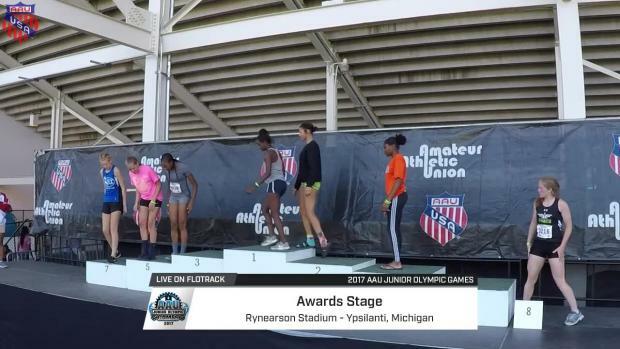 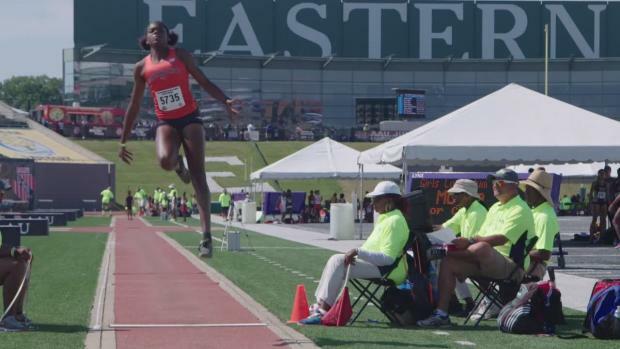 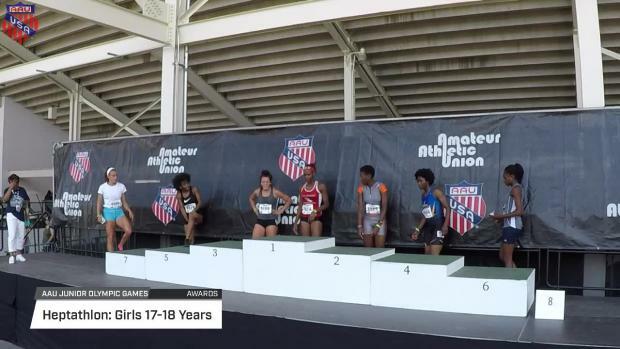 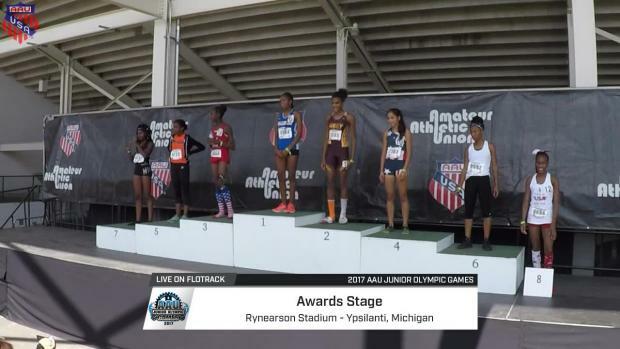 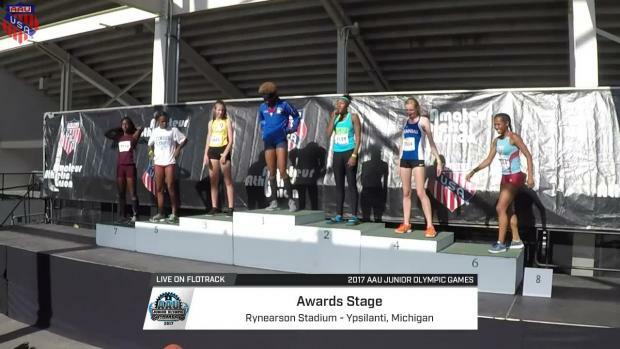 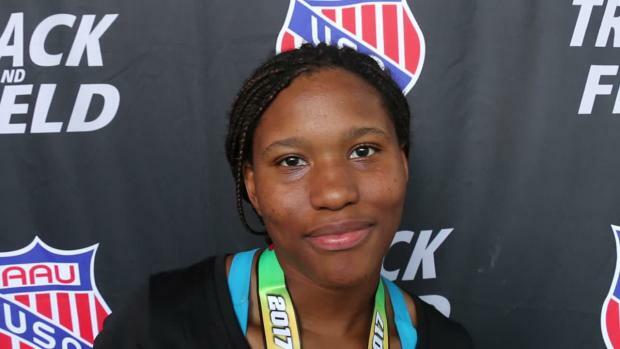 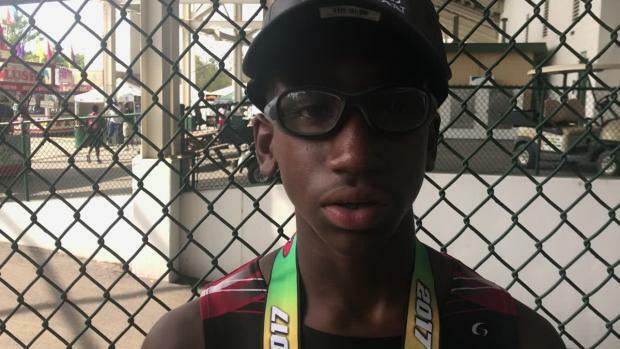 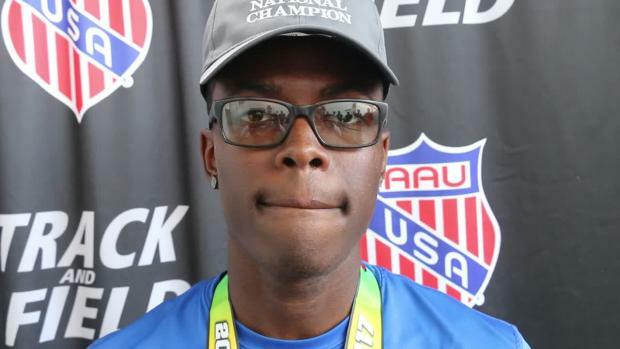 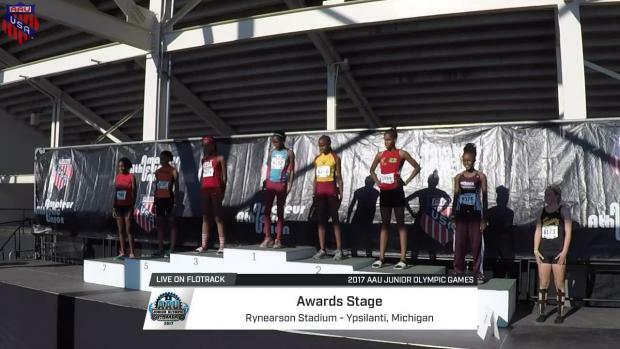 Soon to be Phoebus frosh, Jahnelle Saunders took home the AAU Junior Olympic Games pentathlon national title this weekend in dominating fashion. 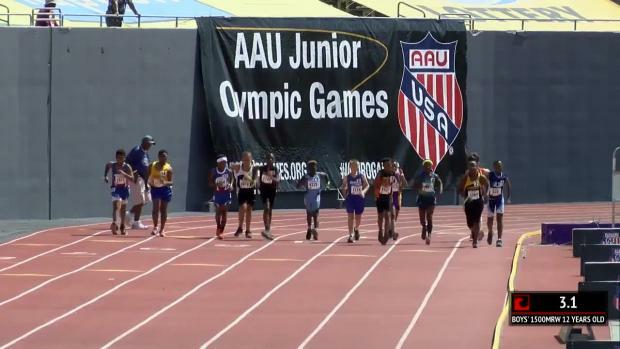 Check out which athletes are competing at the AAU Junior Olympic Games! 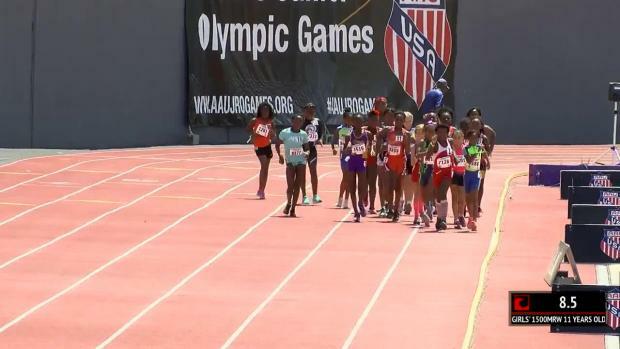 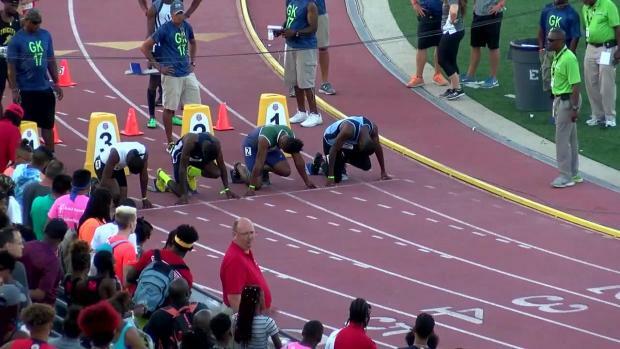 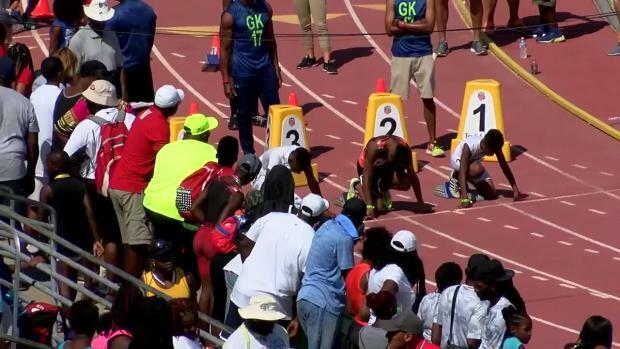 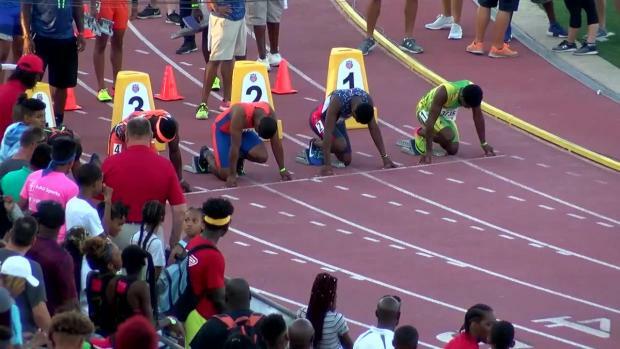 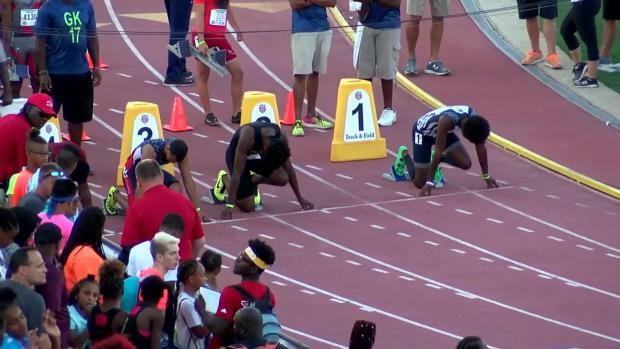 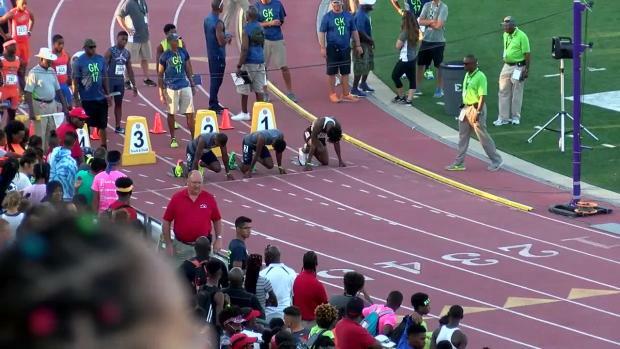 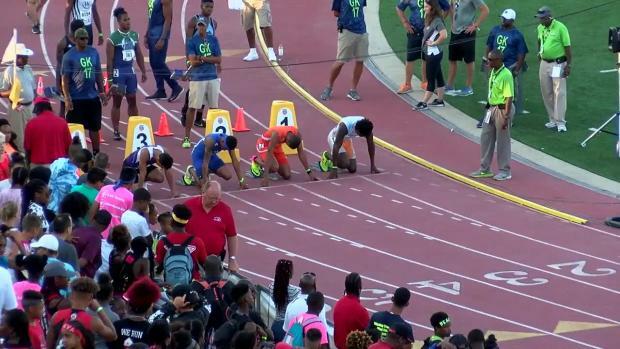 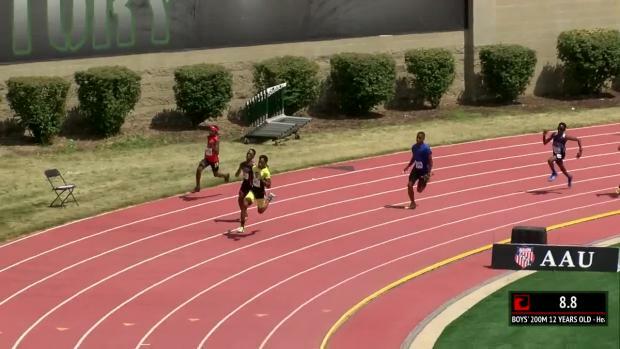 The Ohio Heat are seeking a top 3 finish in the 4 x 400m relay final at the AAU Junior Olympic Games. 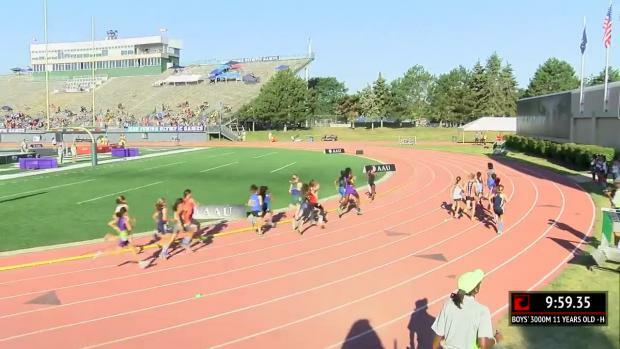 Entries for meet that starts July 29. 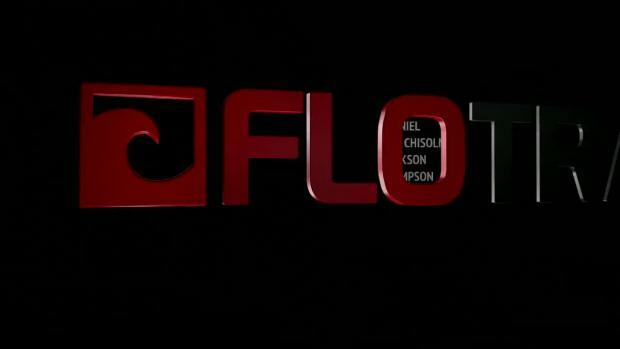 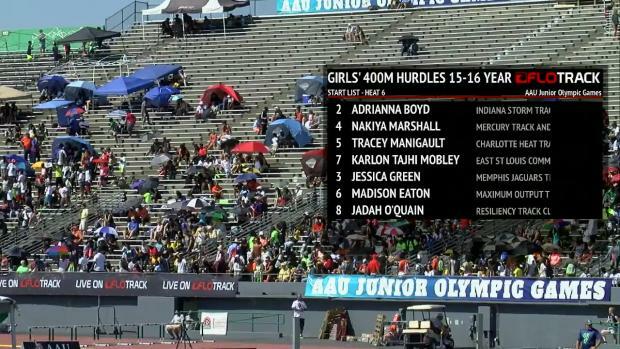 Meet live on FloTrack. 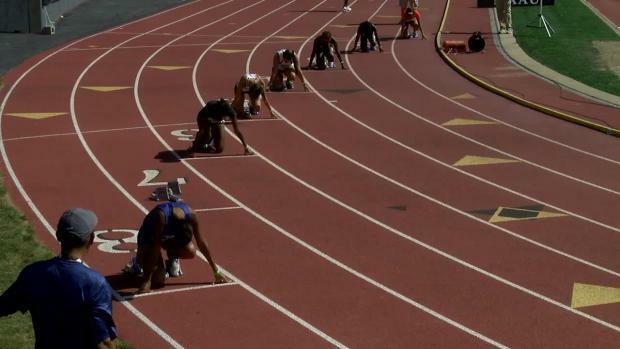 Seven-day meet, which begins on Friday, features 16 athletes from the Bay State area. 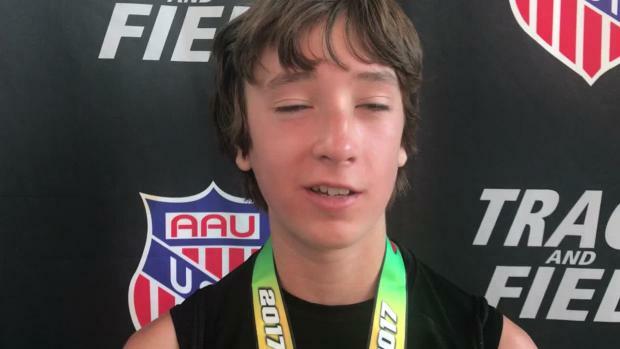 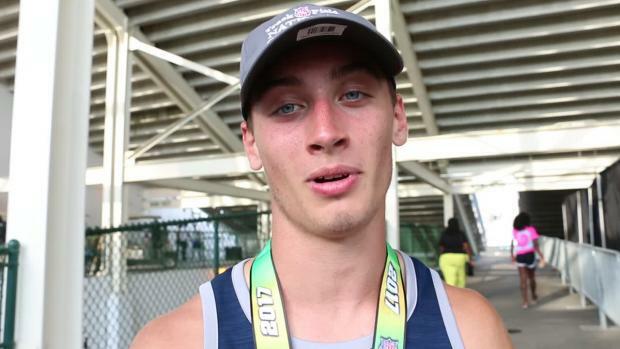 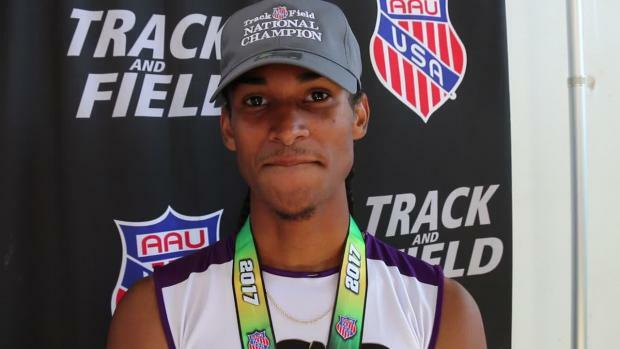 Citrus Park Christian rising senior Trevor Foley made it two national championships in the 2k steeplechase after claiming gold at the AAU Junior Olympic Games. 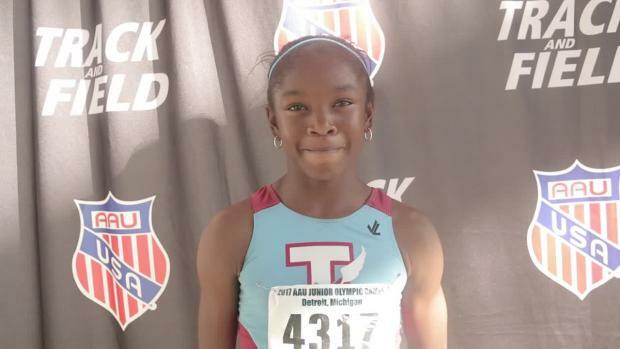 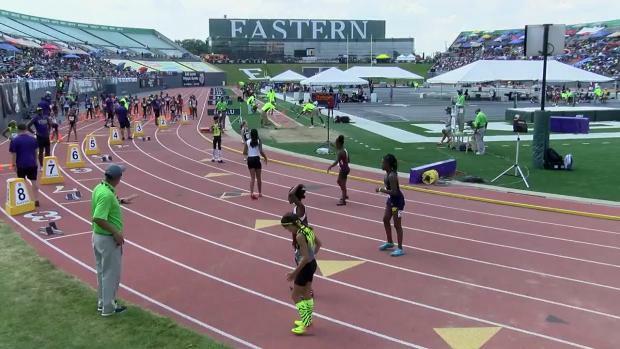 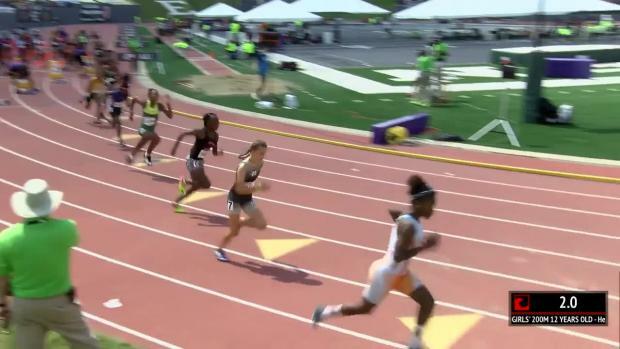 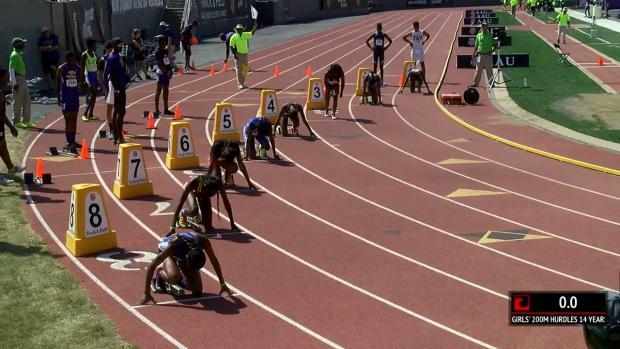 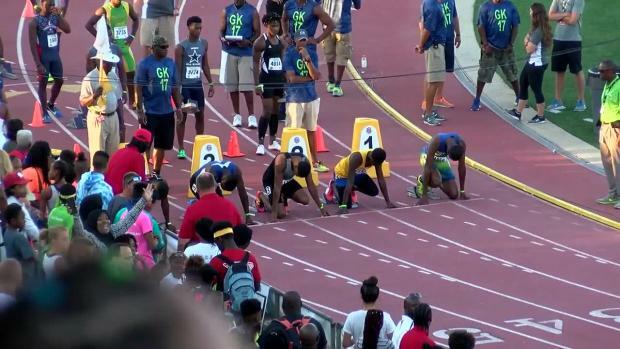 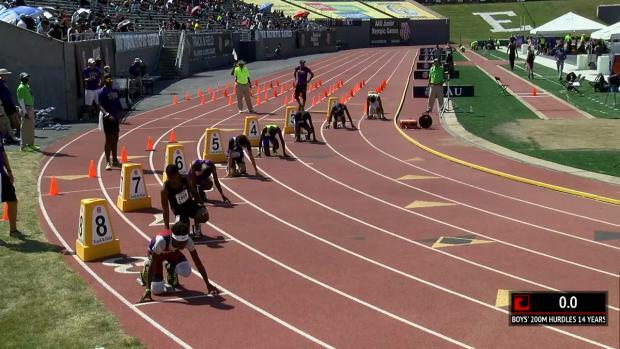 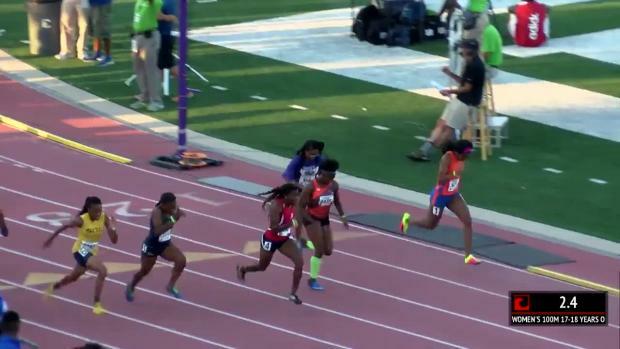 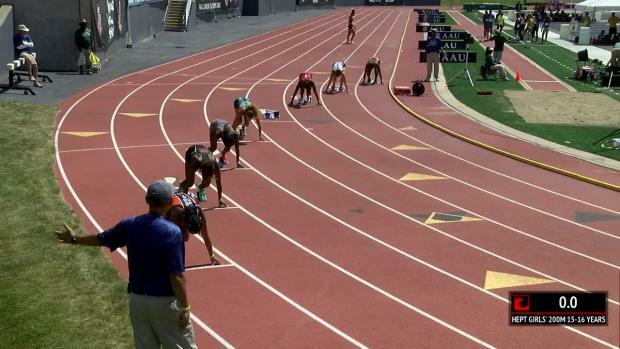 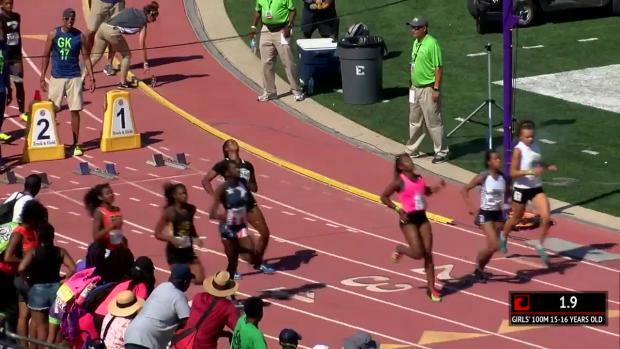 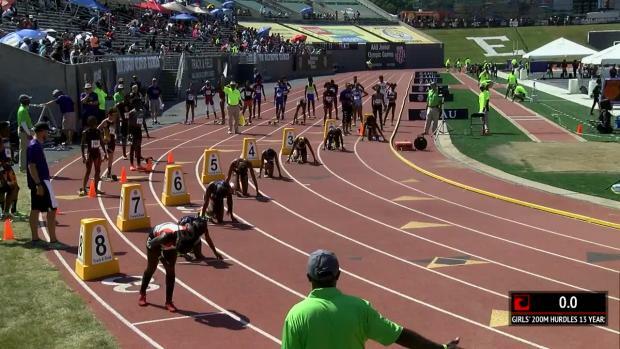 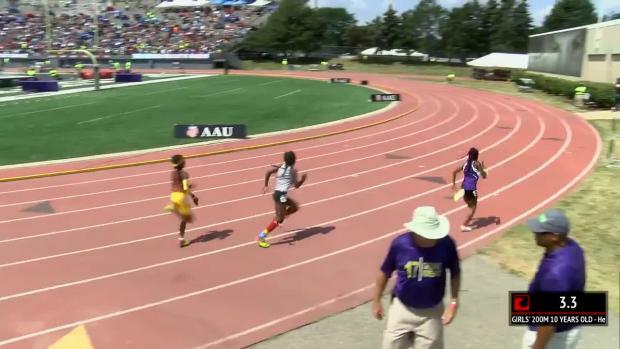 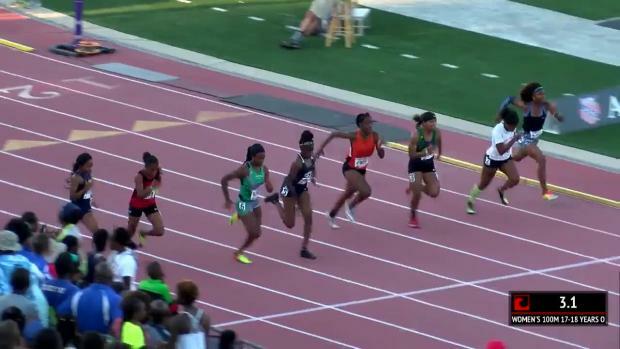 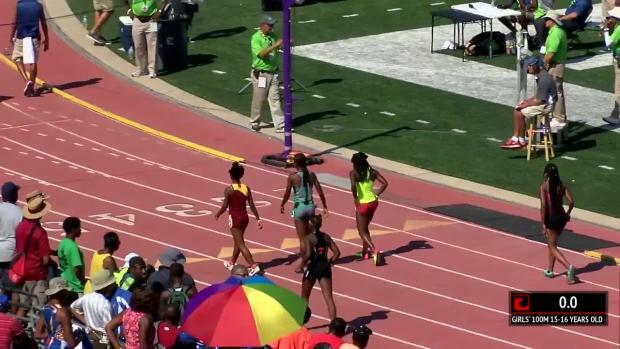 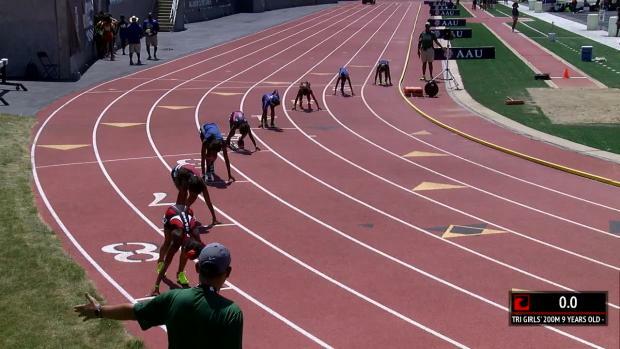 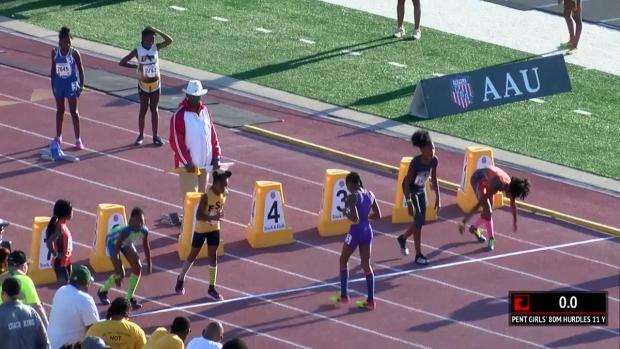 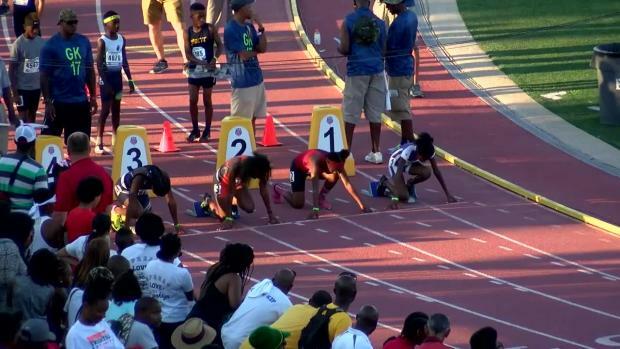 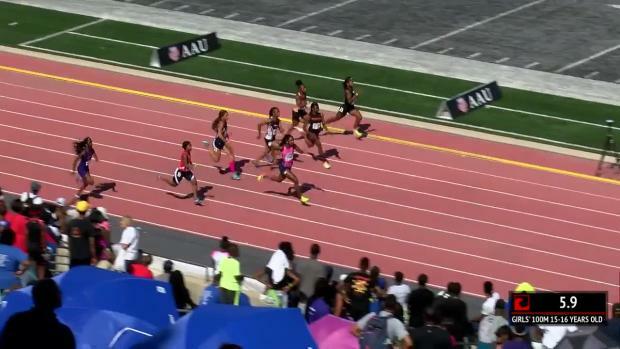 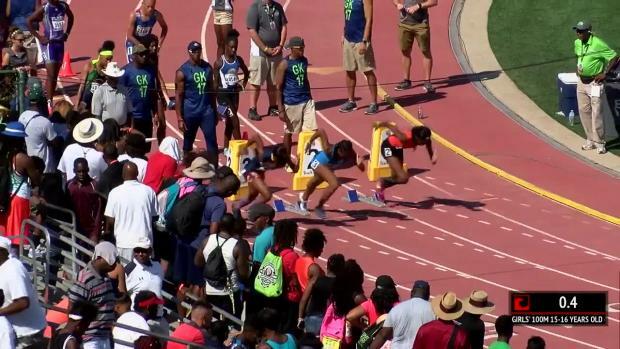 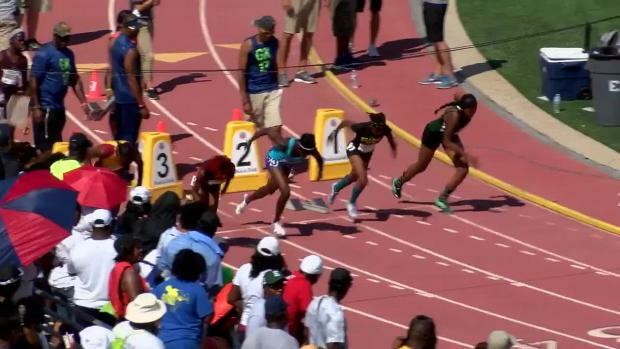 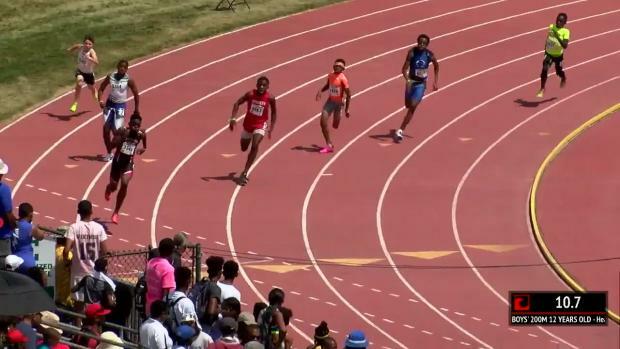 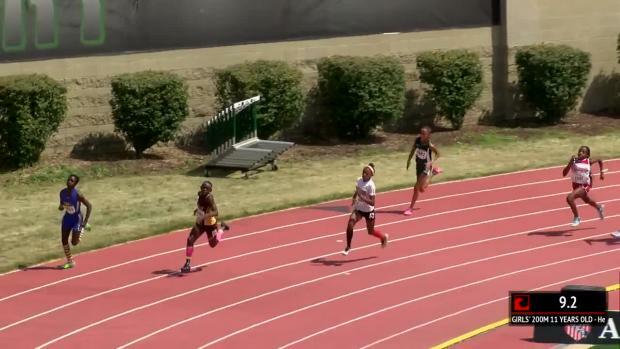 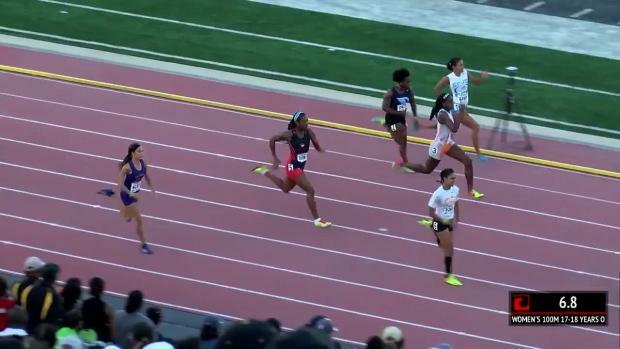 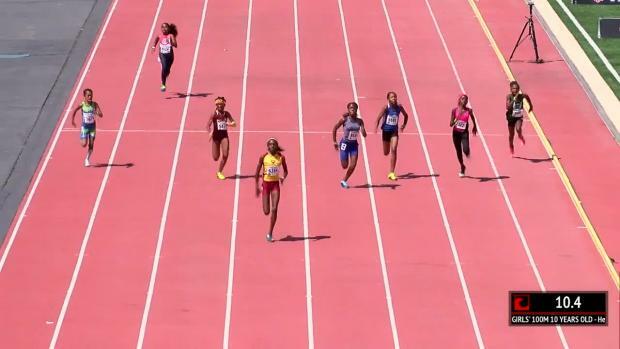 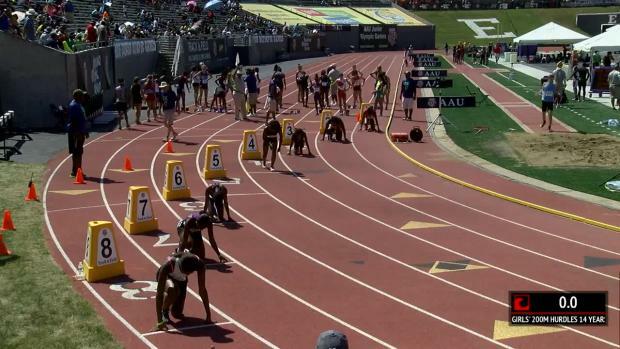 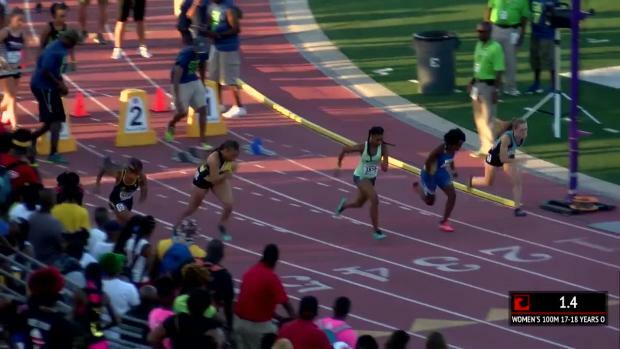 Tamari Davis set a 14 year old age group record at the AAU Junior Olympic Games running 11.48s in the 100m prelims. 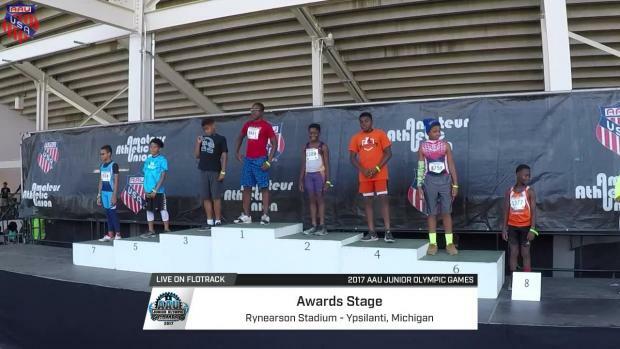 A fleet of Golden State athletes have made the trip to Michigan to compete in one of the biggest meets of the outdoor season! 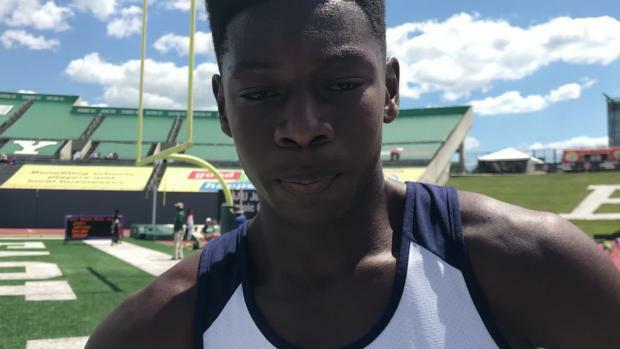 Central Catholic junior captured 400m dash, finished fourth in shot and 100m dash. 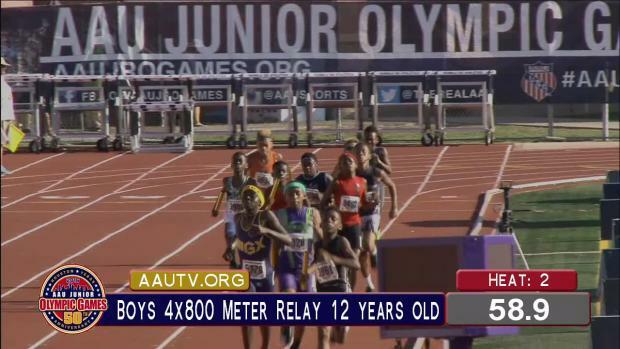 Look for coverage of the AAU Junior Olympic Games starting July 29. 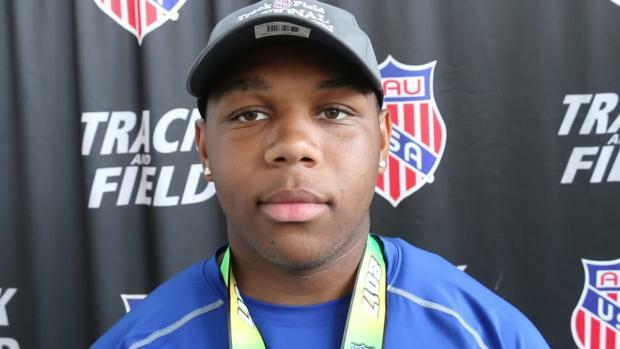 Del'Mario Hairston will compete against the country's best athletes at the AAU Junior Olympic Games. 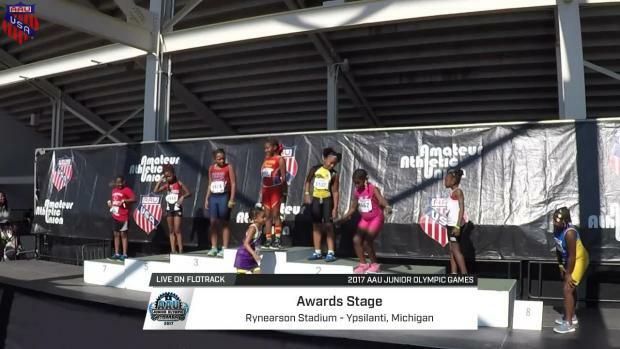 Caisja Chandler and McKenzie Long are set to compete at the AAU Junior Olympic Games in Michigan. 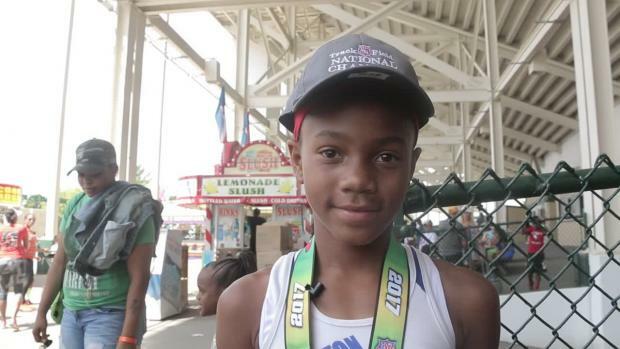 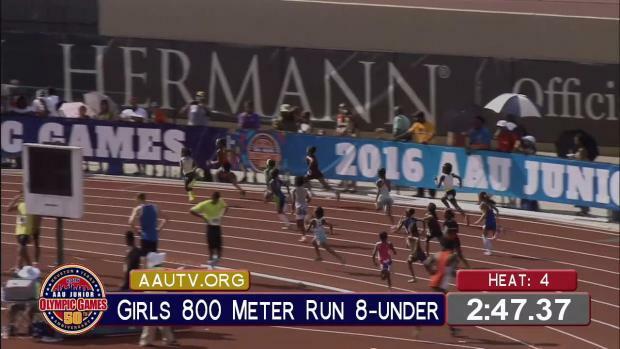 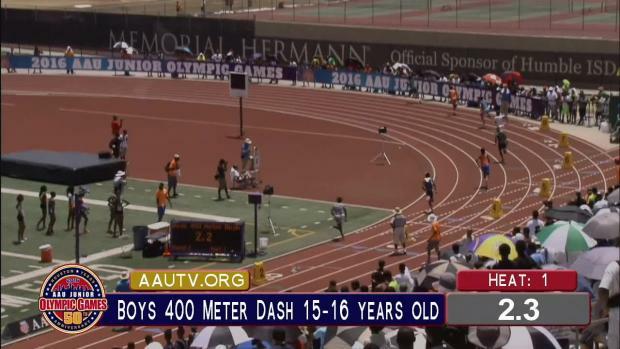 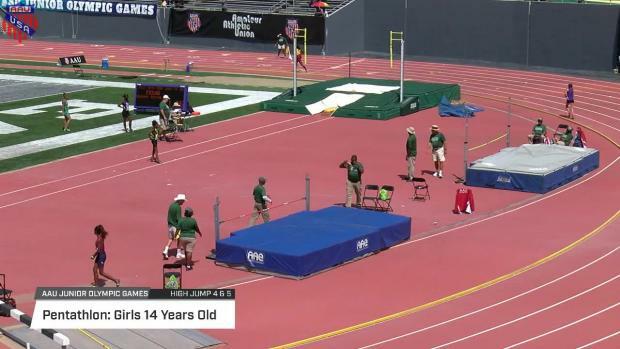 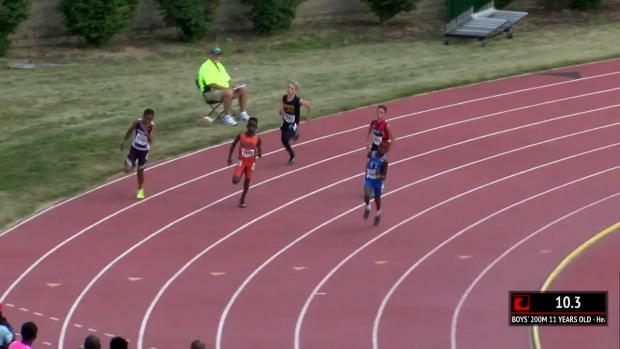 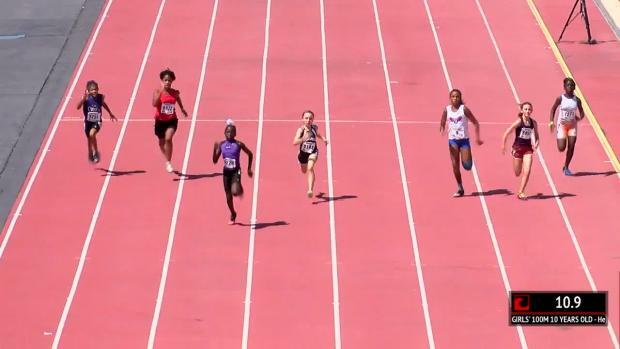 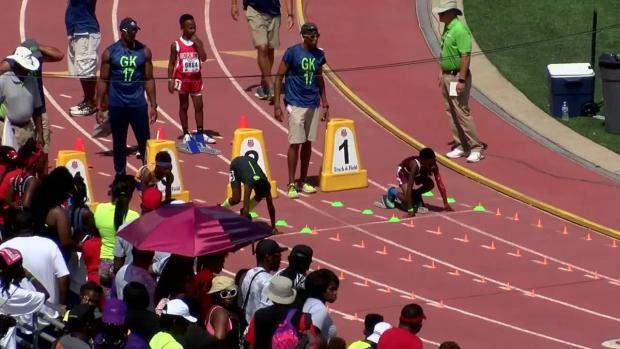 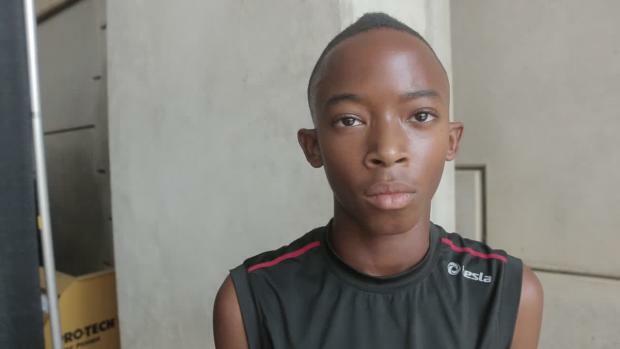 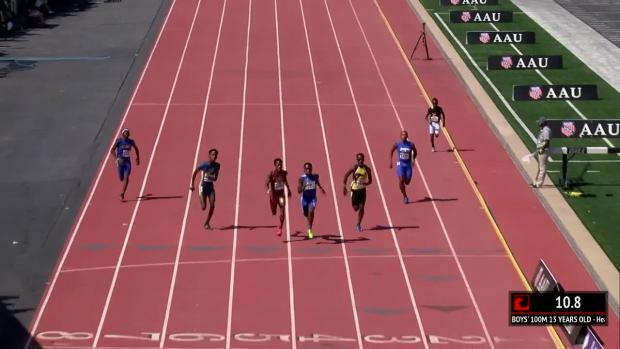 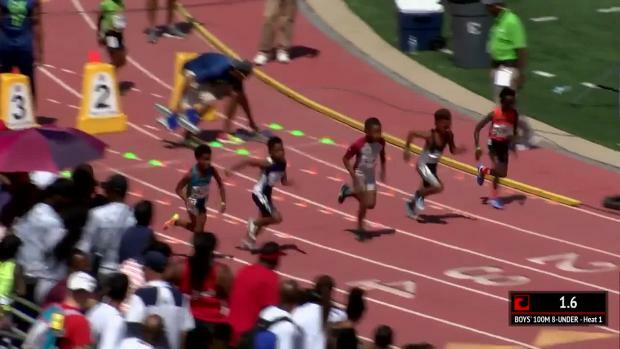 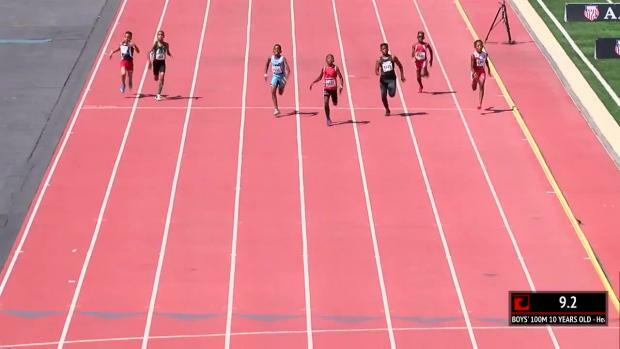 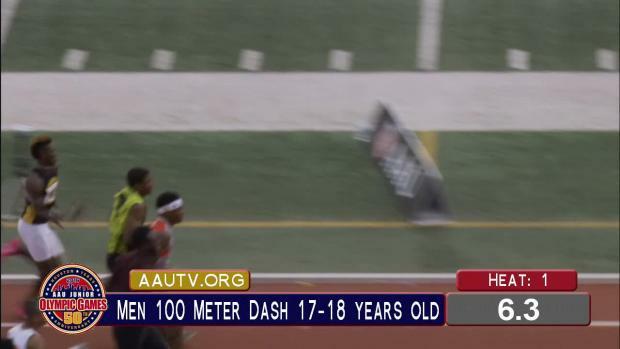 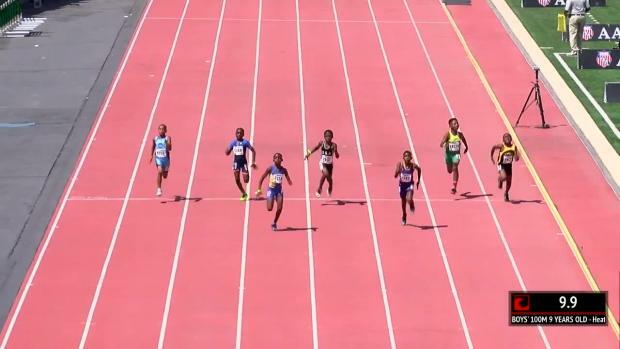 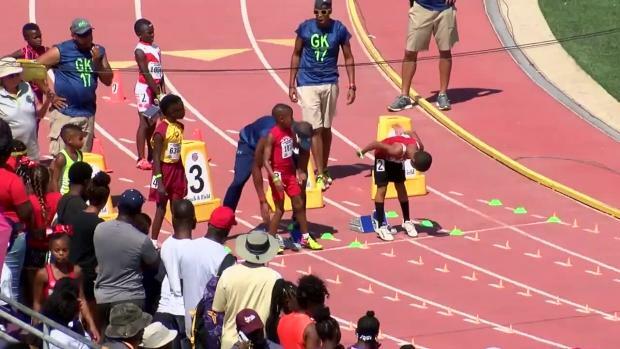 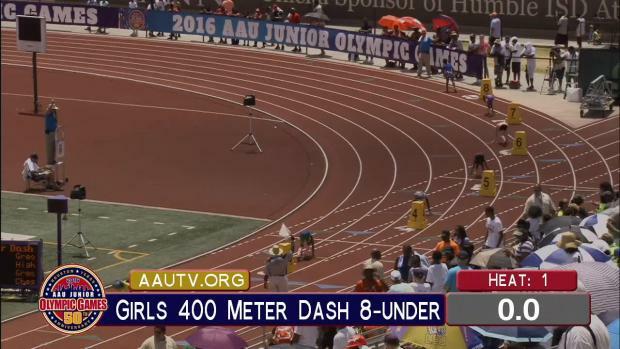 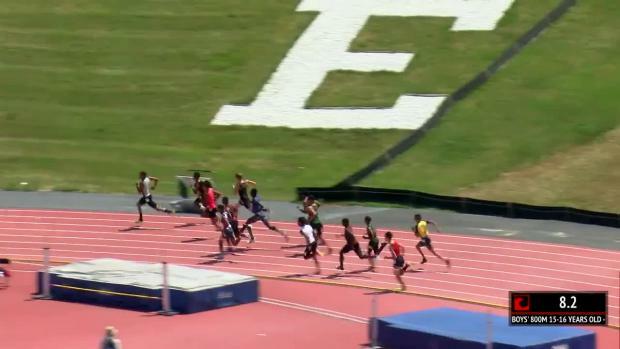 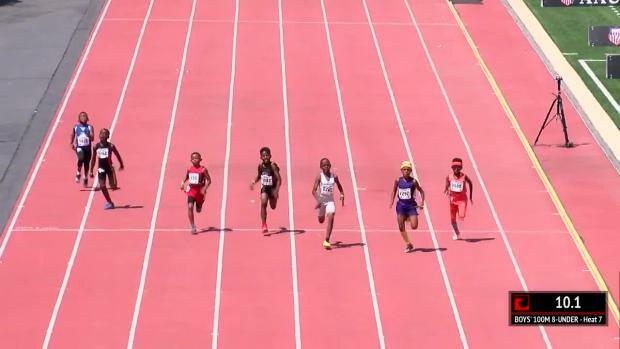 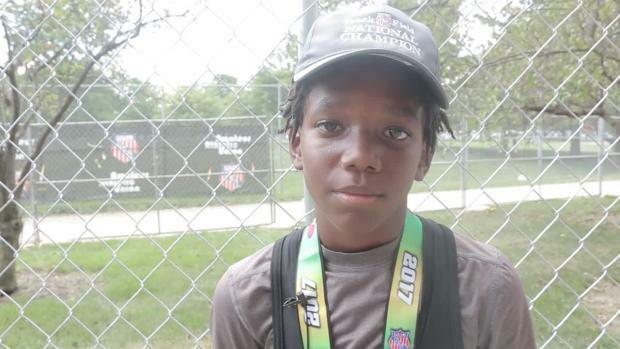 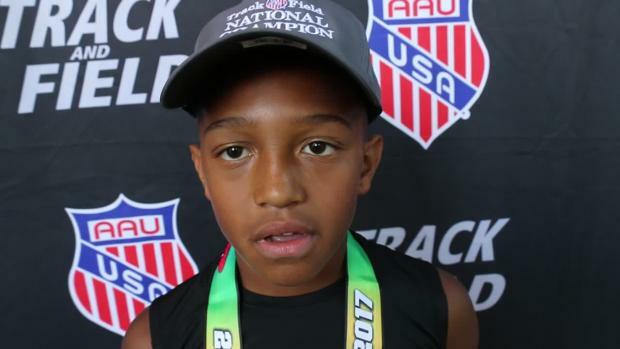 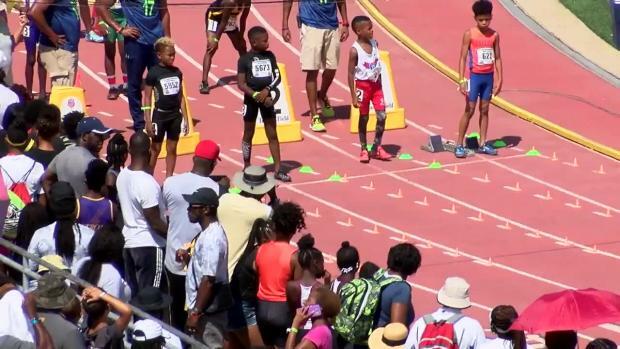 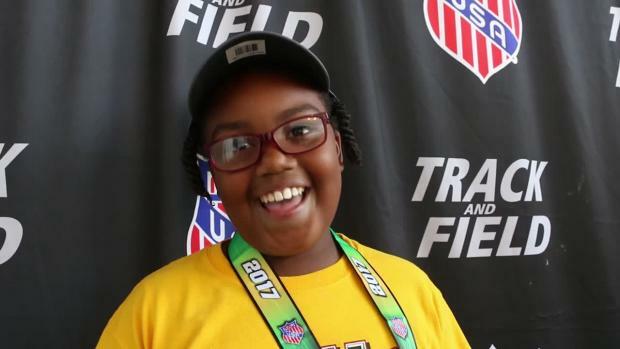 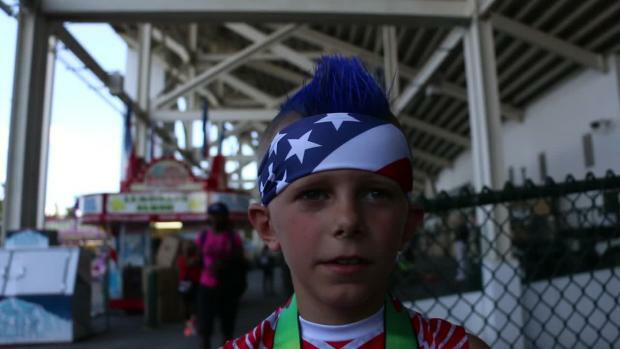 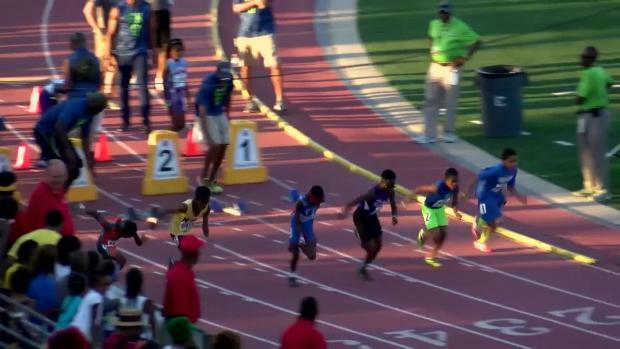 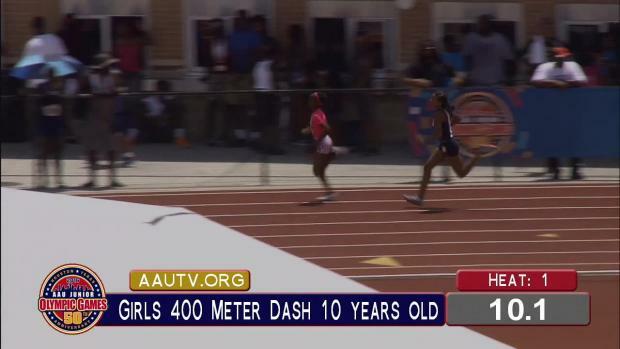 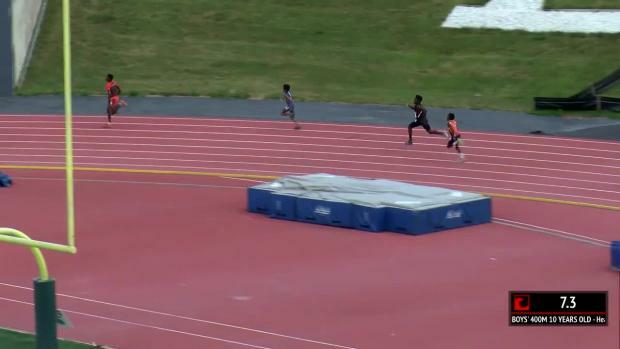 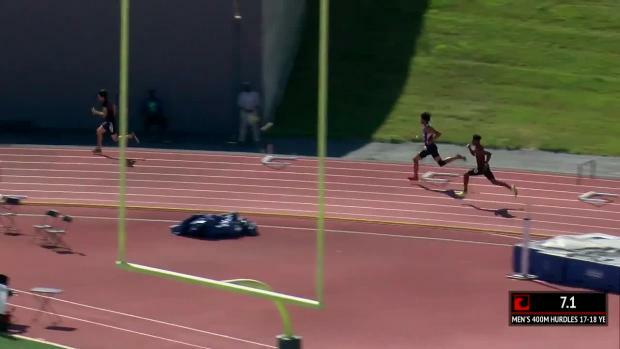 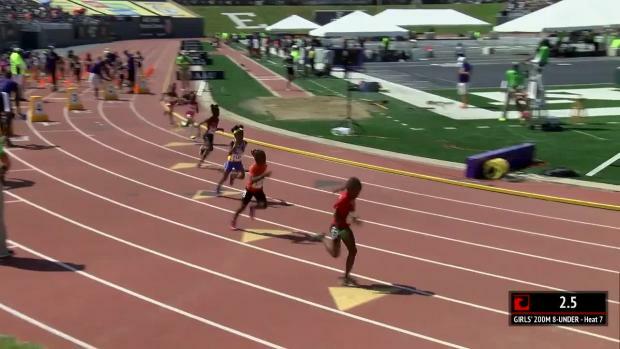 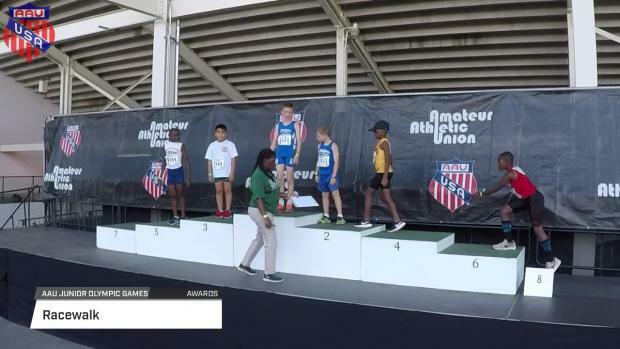 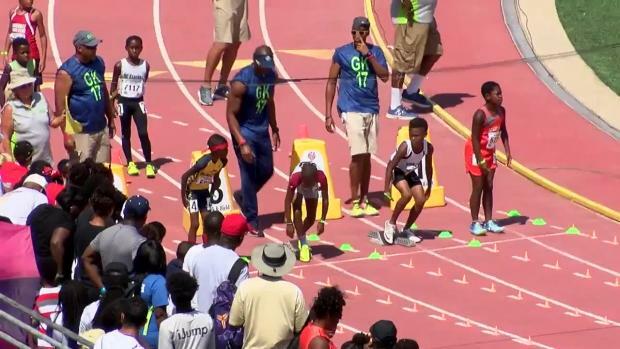 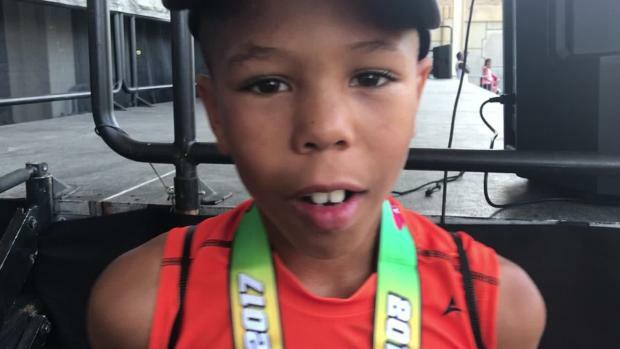 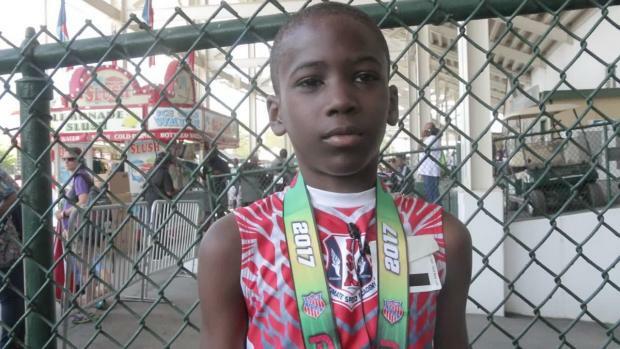 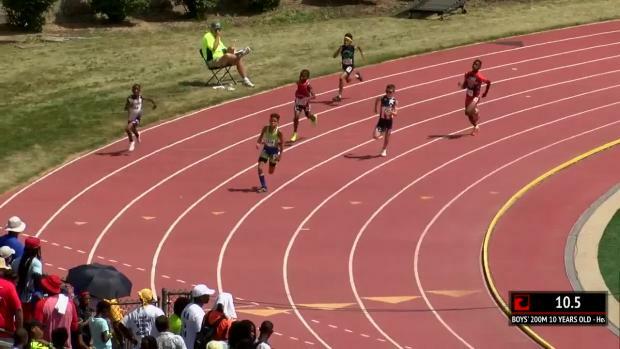 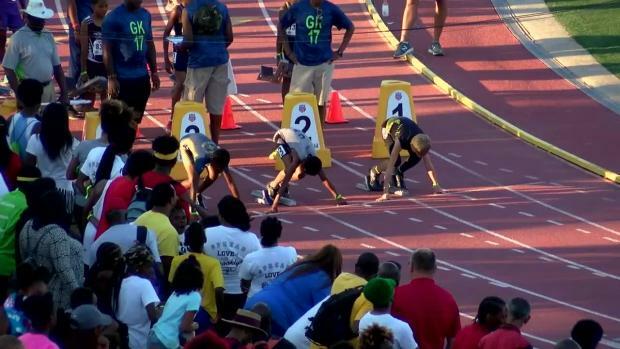 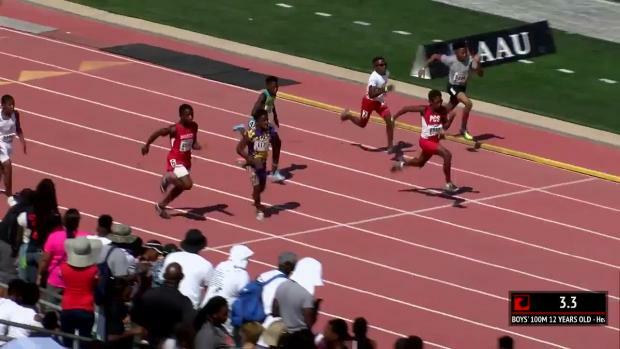 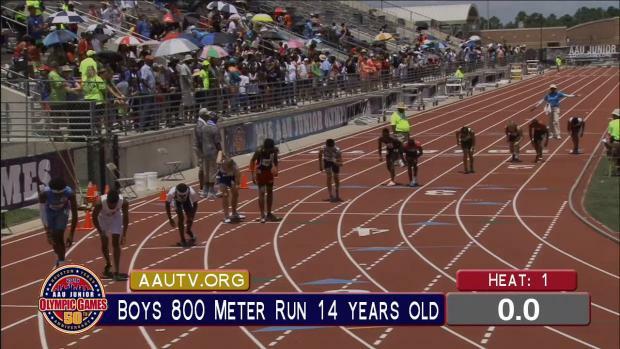 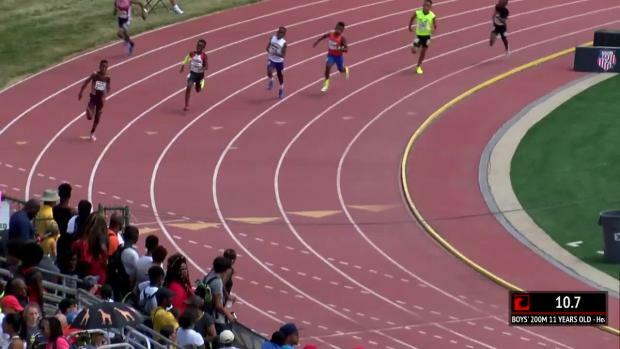 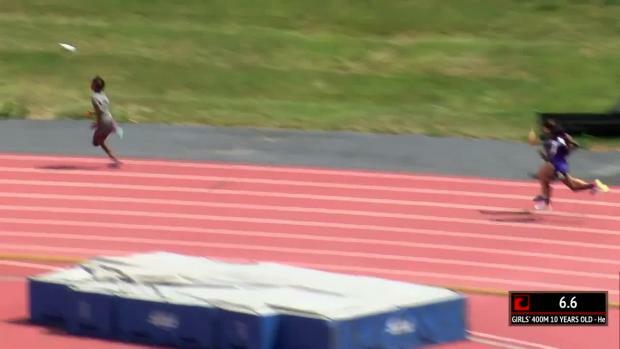 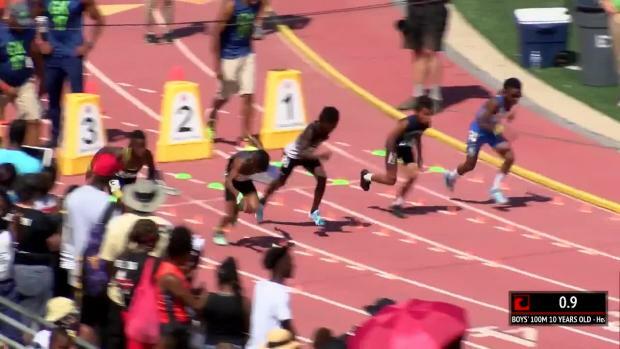 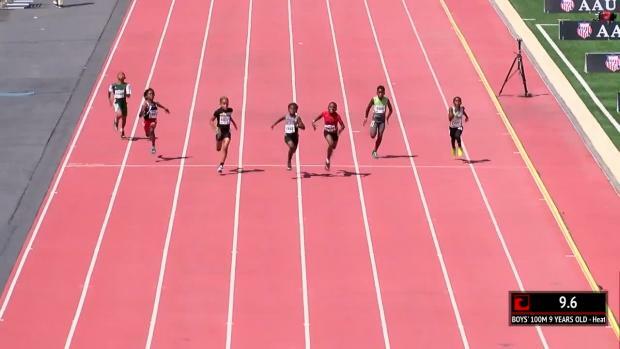 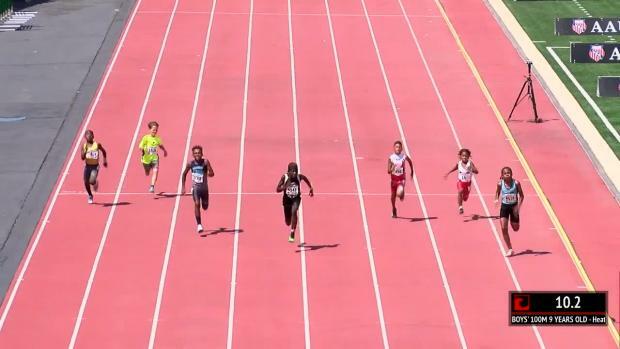 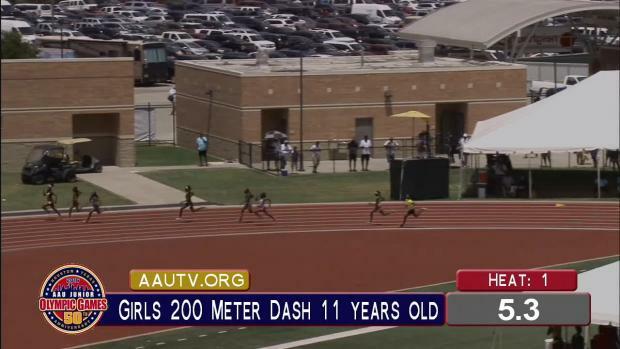 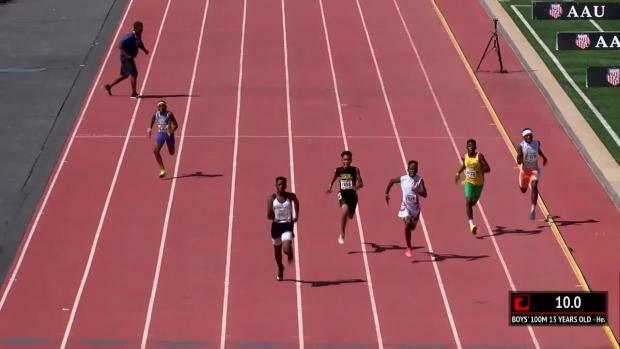 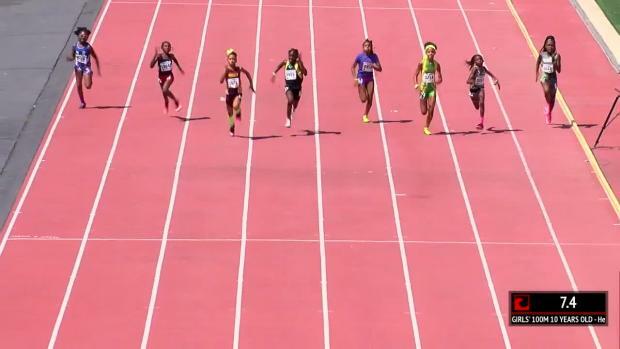 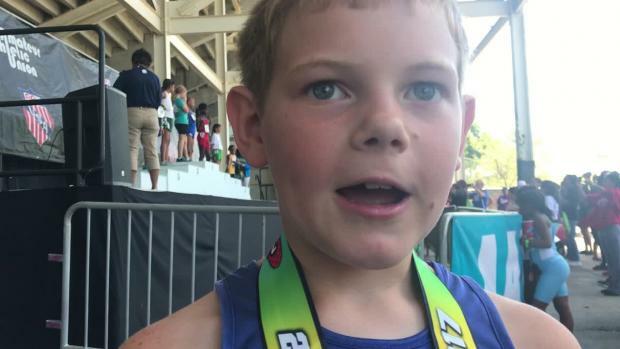 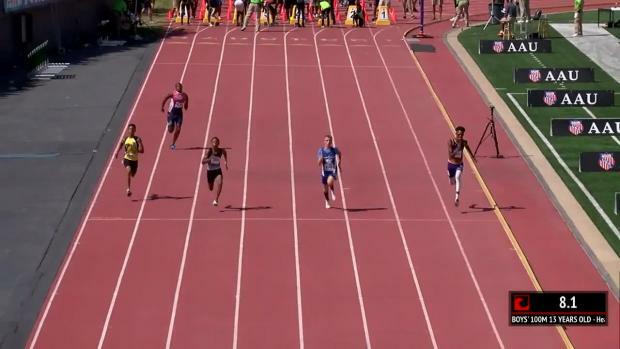 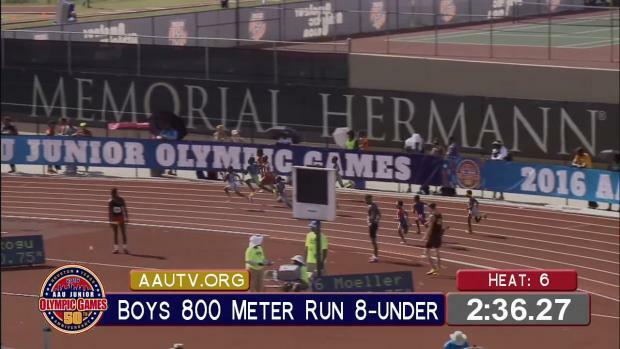 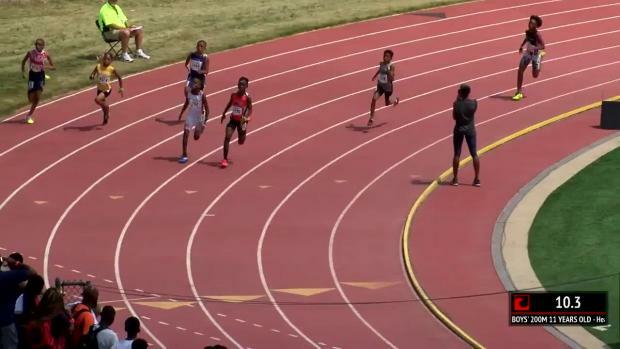 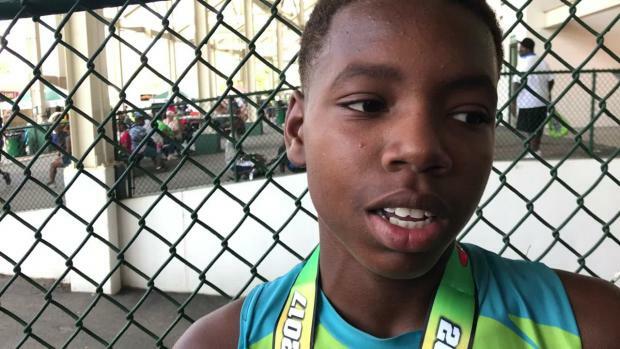 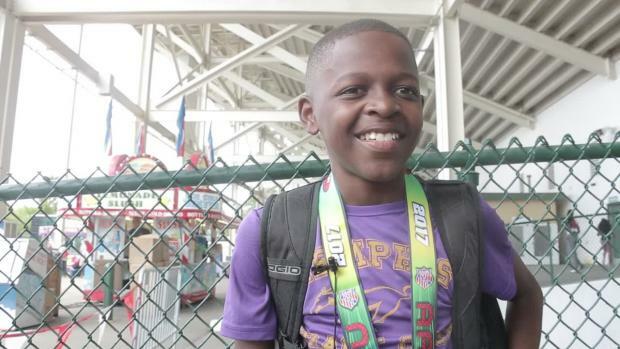 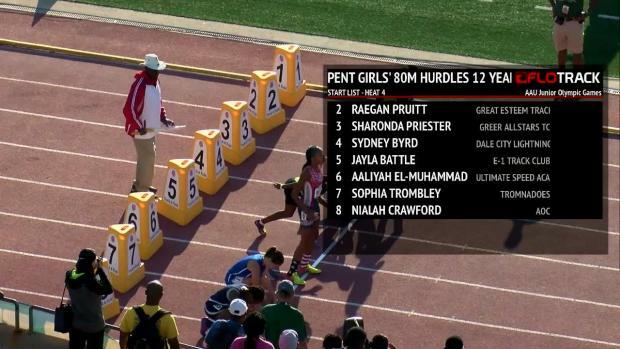 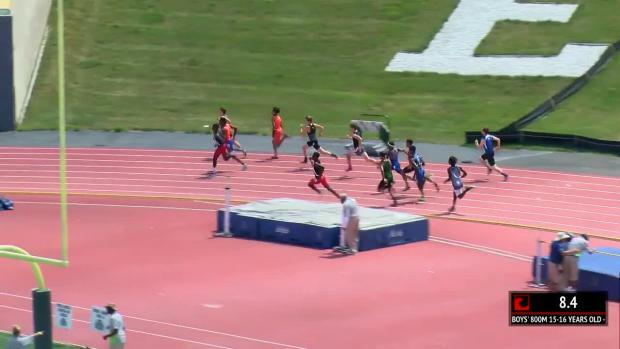 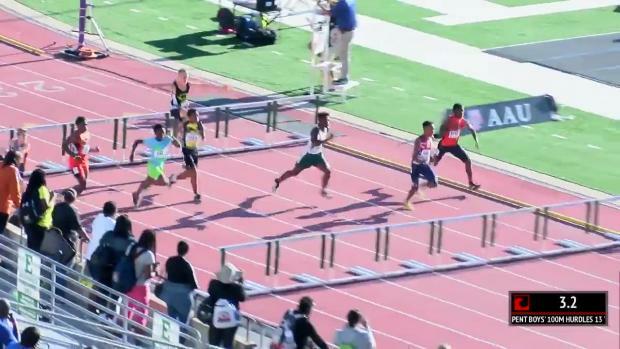 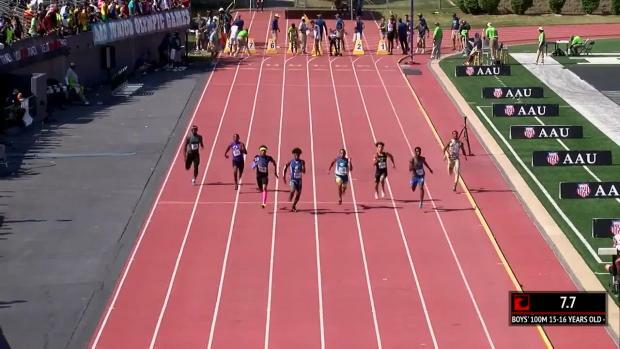 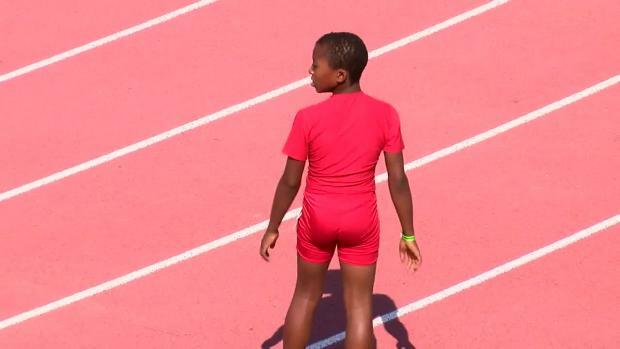 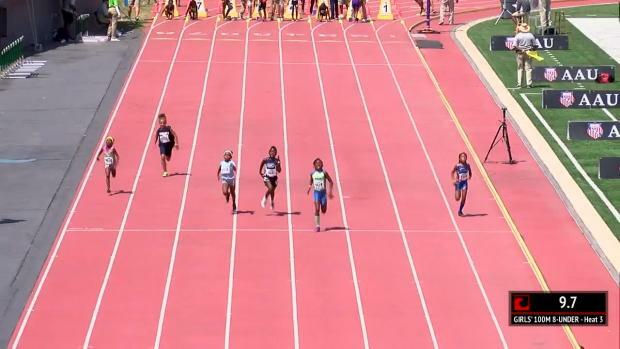 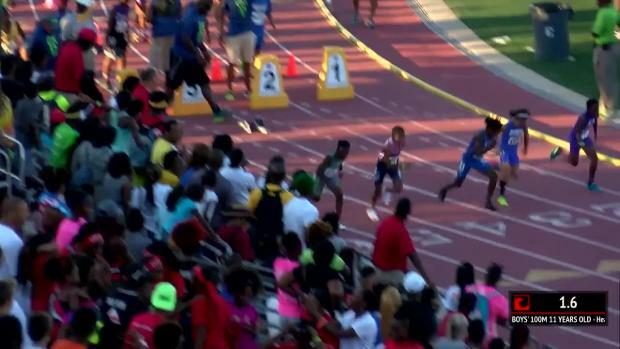 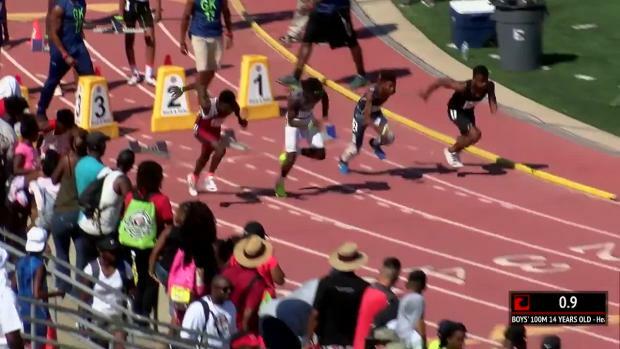 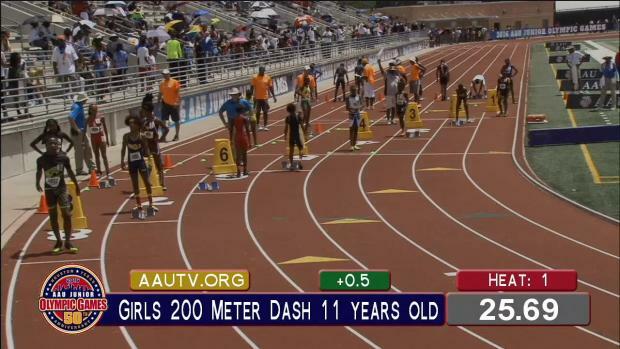 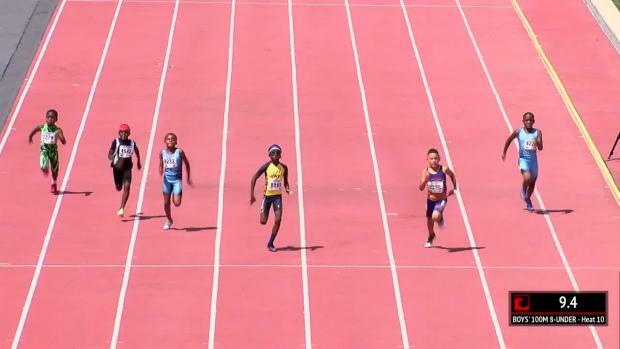 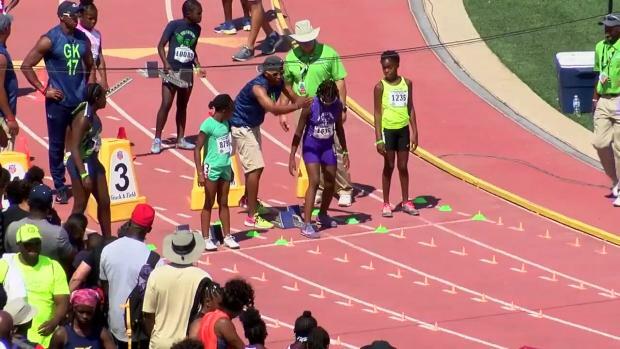 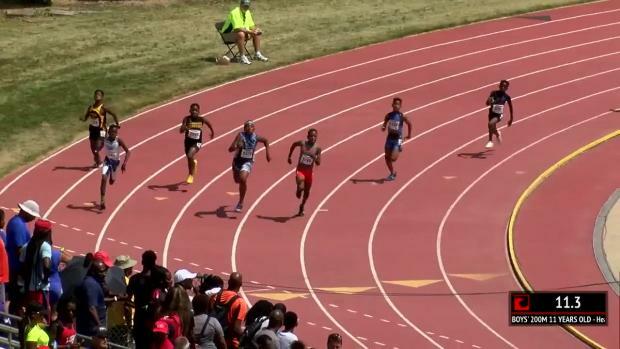 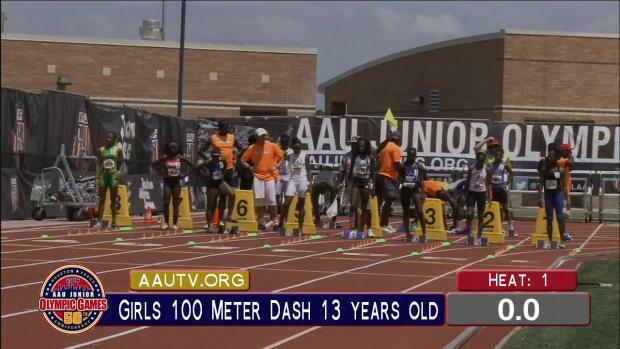 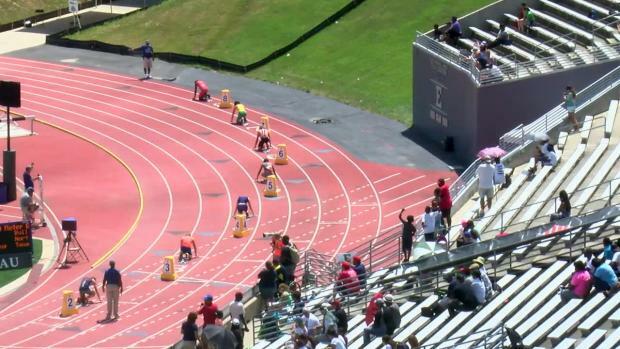 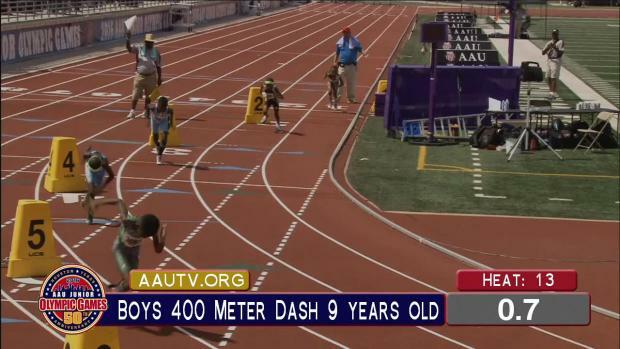 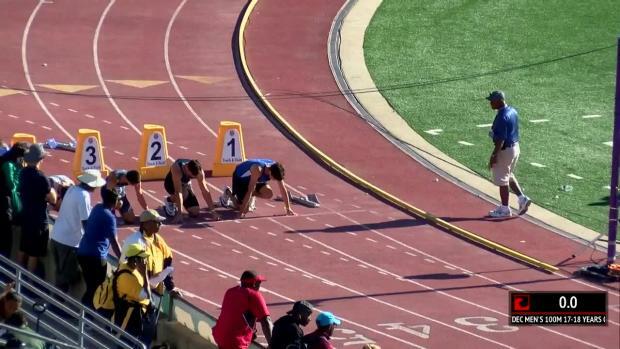 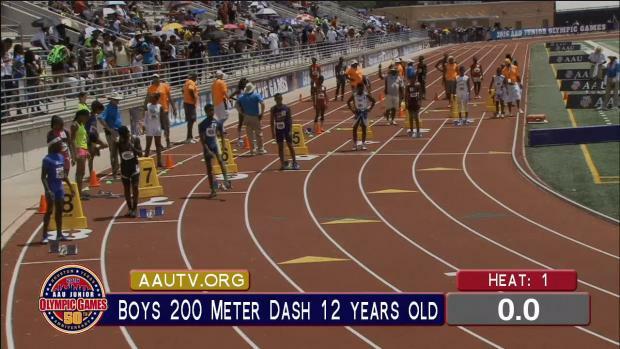 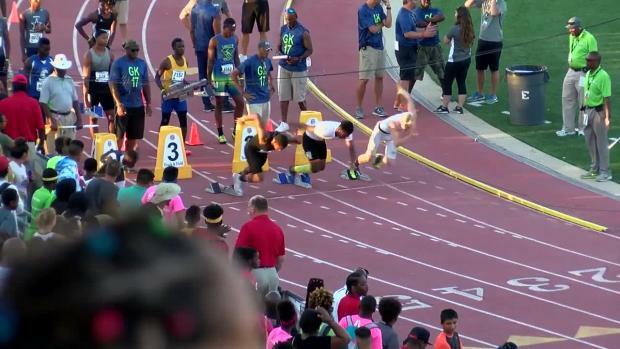 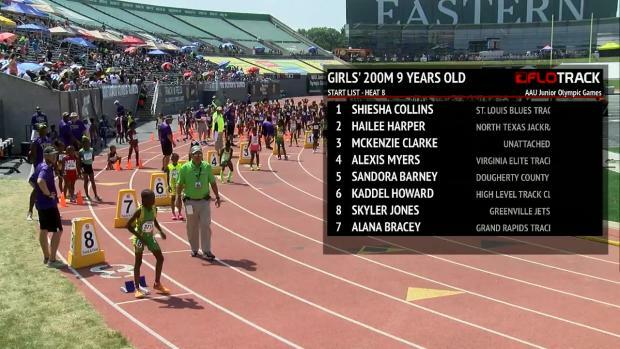 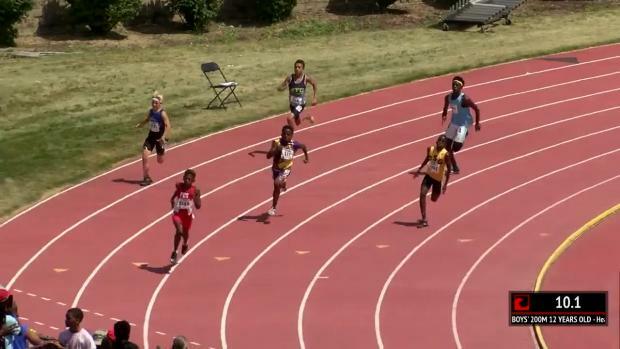 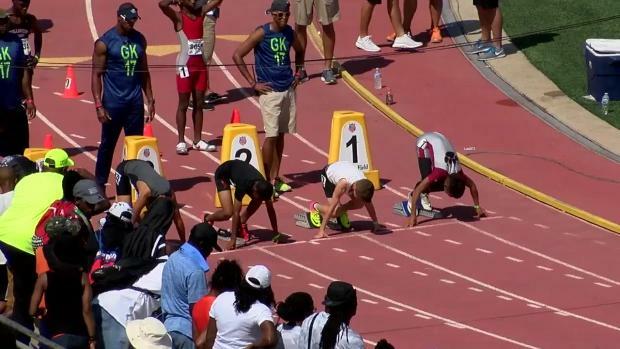 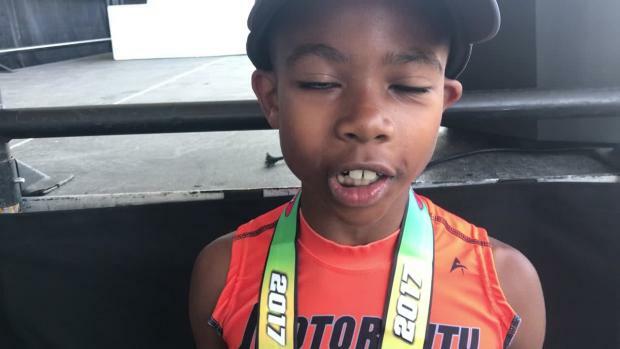 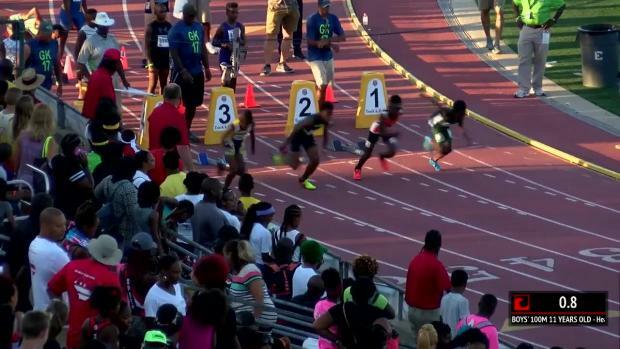 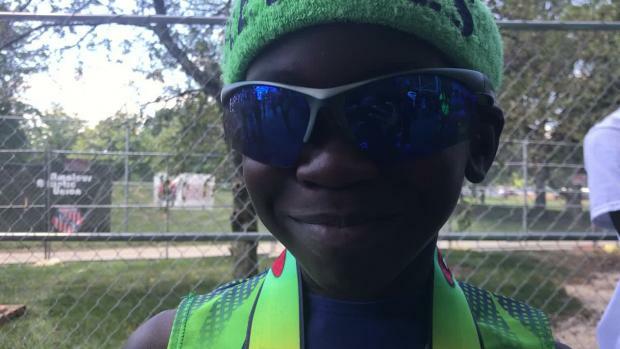 The Philadelphia 11-year-old broke the AAU Junior Olympic Games record. 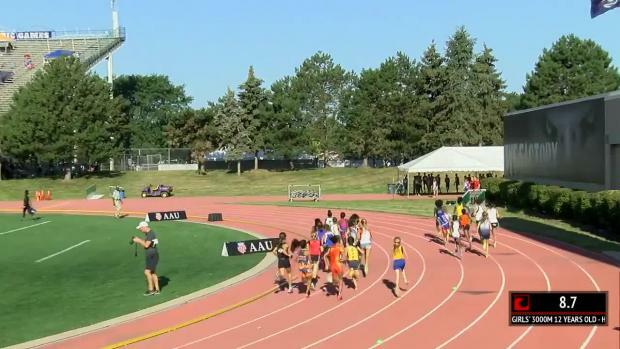 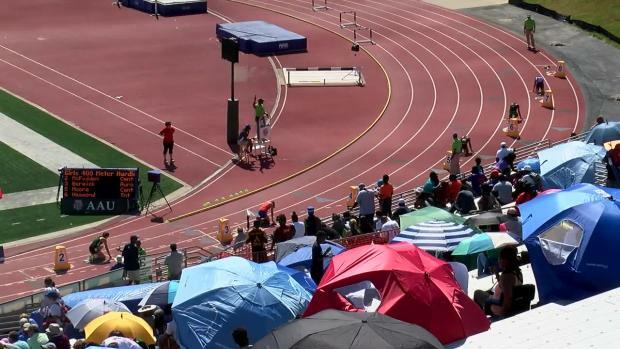 Check out the 3600+ pictures from the AAU Junior Olympic Games in Ypsilanti, Michigan.